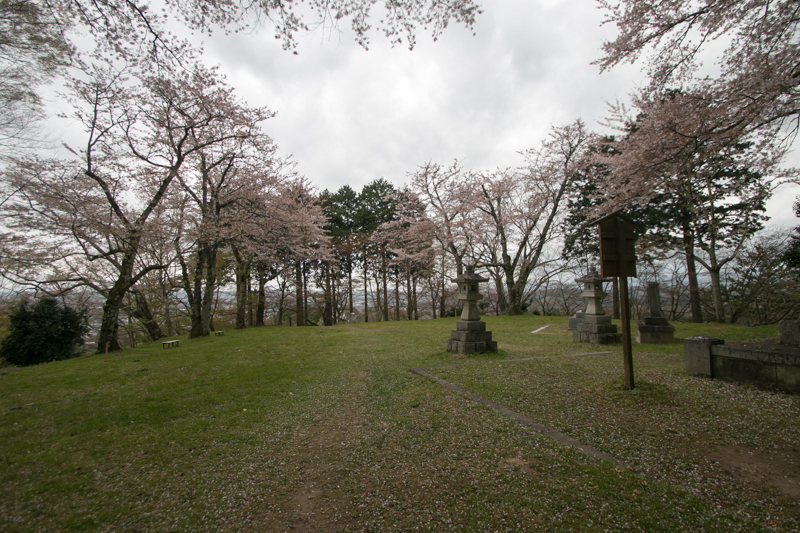 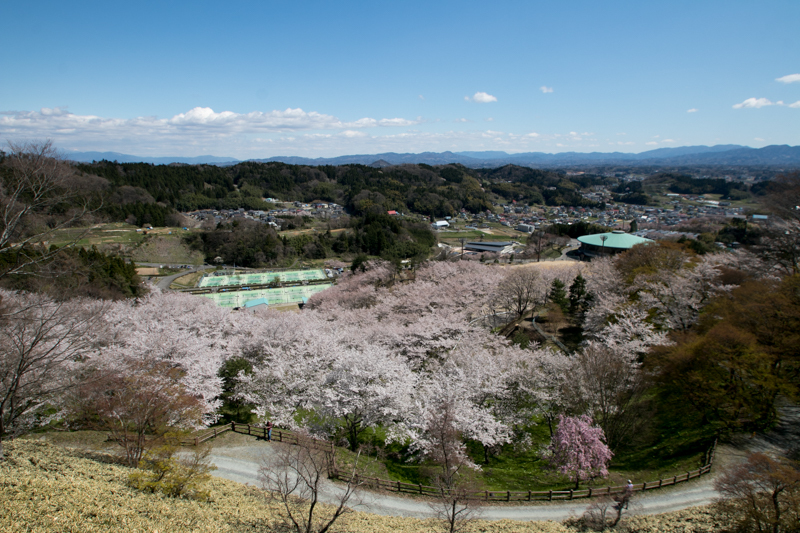 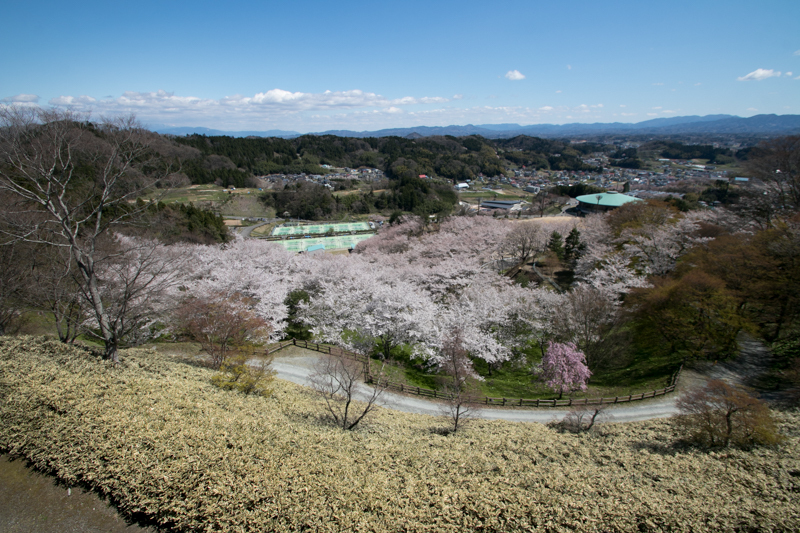 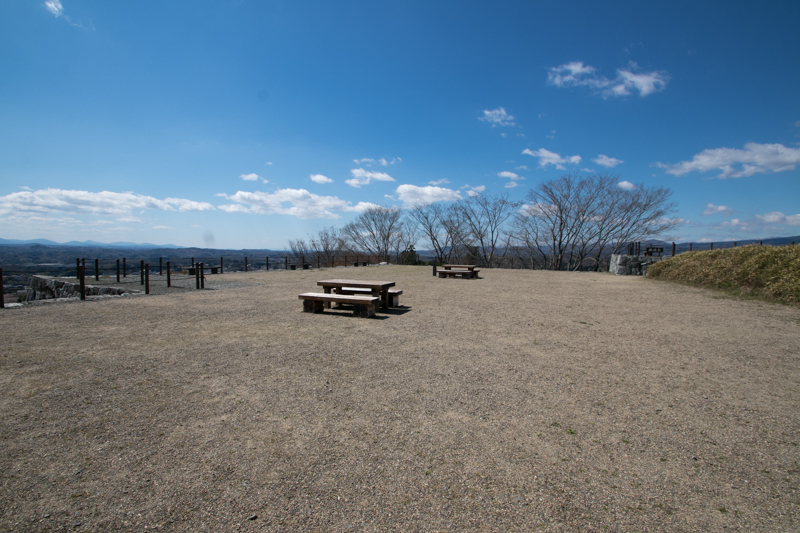 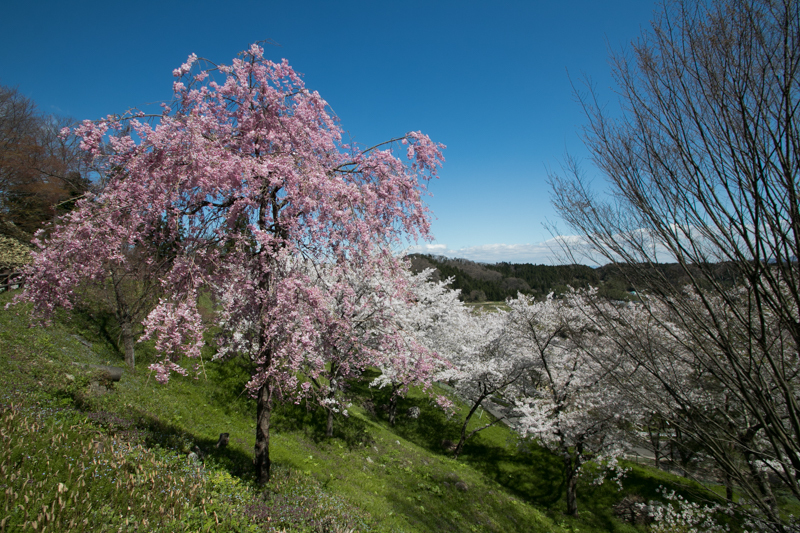 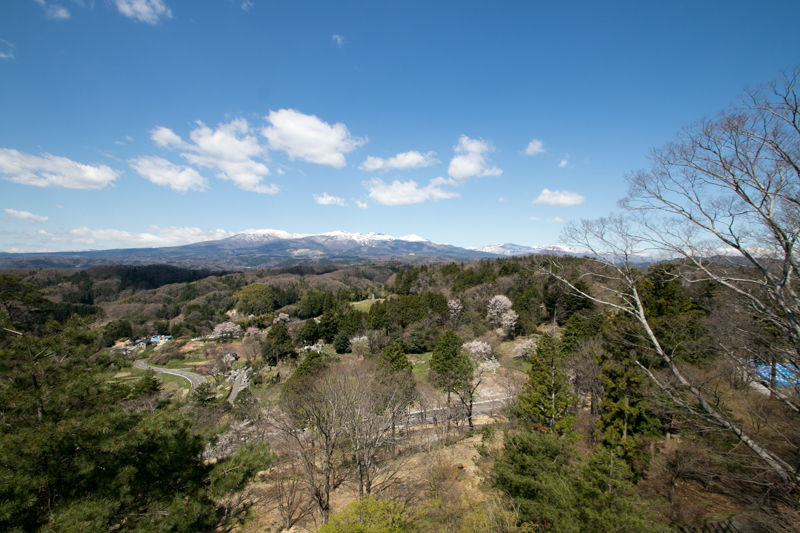 Nihonatsu castle (二本松城) is located on the edge of height continued from Adatarayama Mountain, a symbol of Fukushima prefecture. 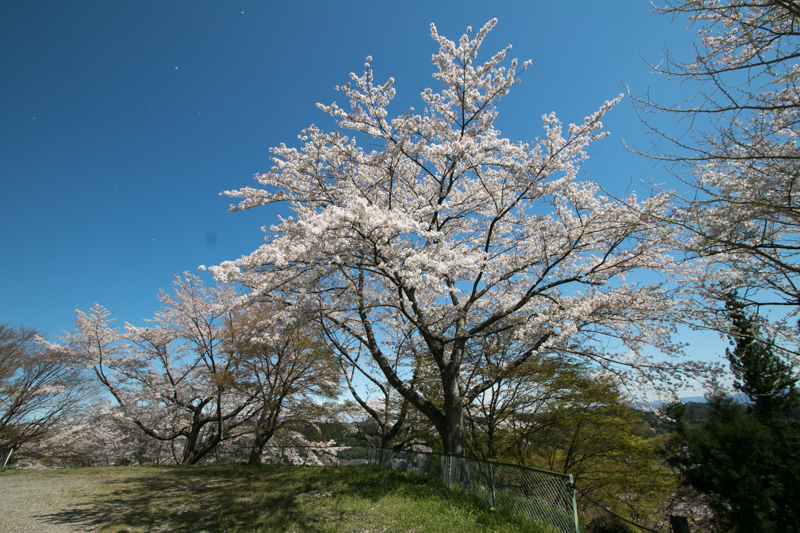 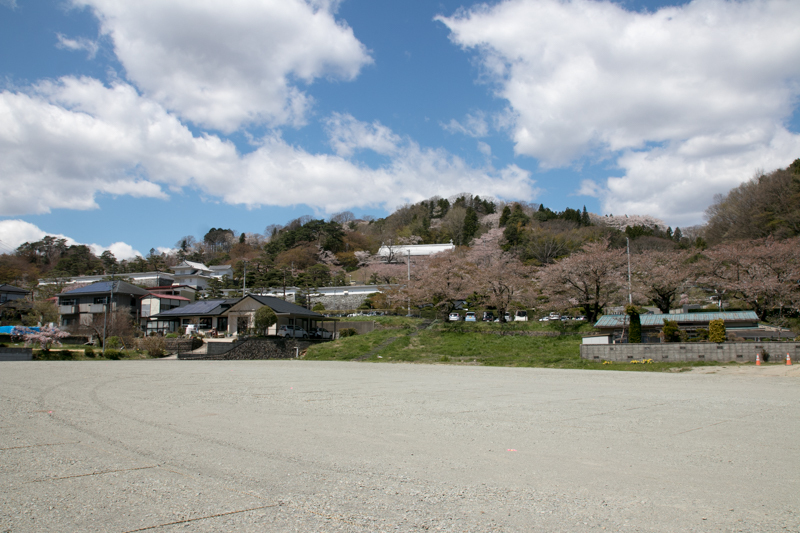 Nihonmatsu city locates at the middle of Koriyama city and Fukushima city, and Oshukaido way passes through this city along Abukuma river. 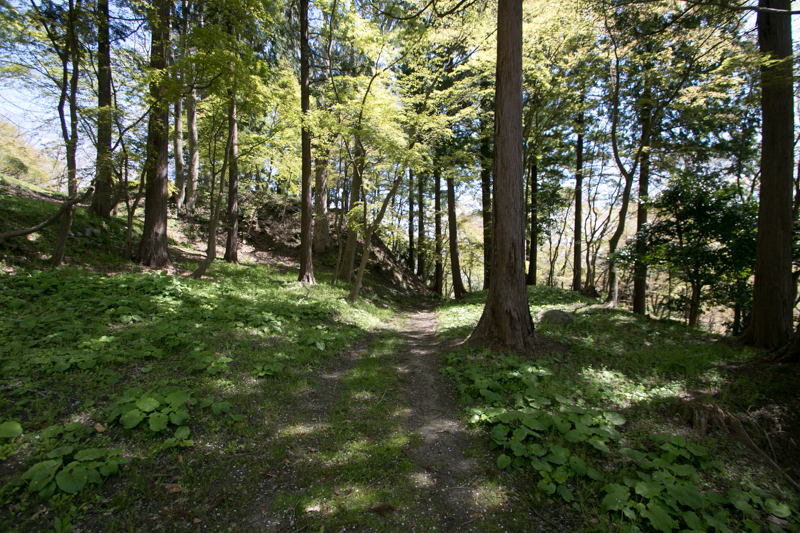 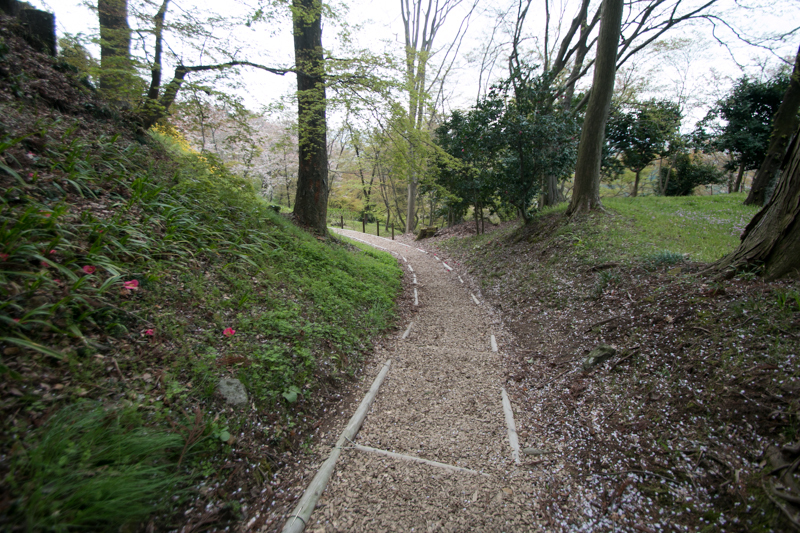 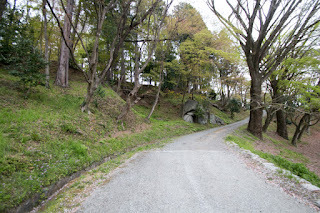 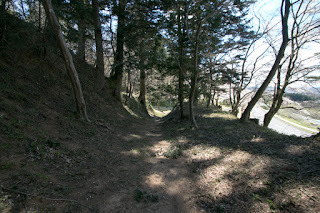 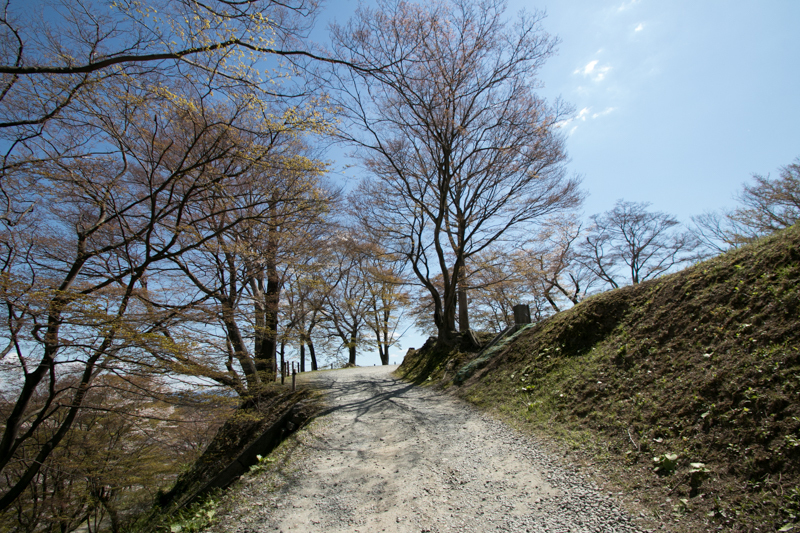 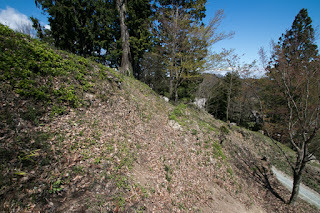 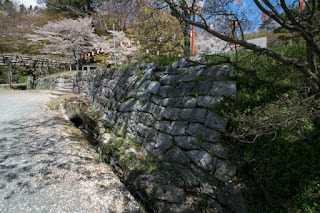 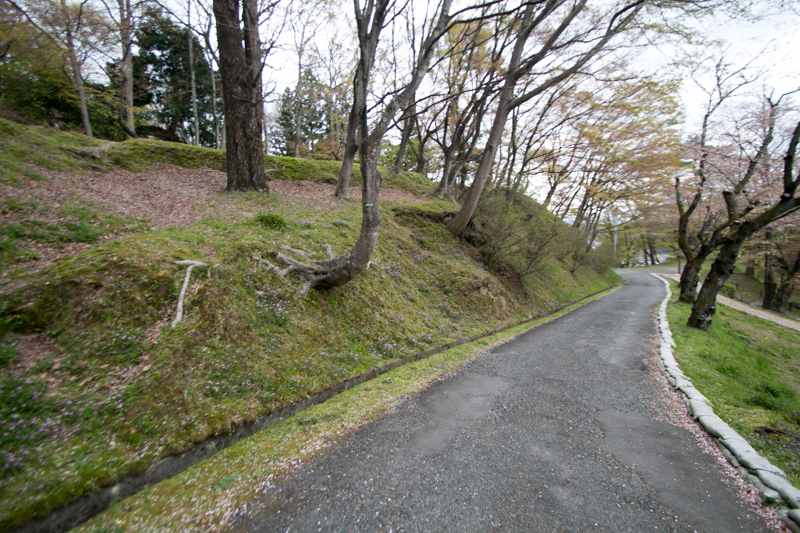 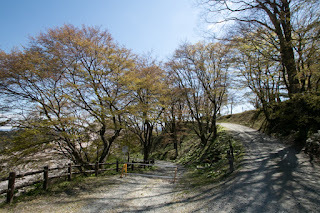 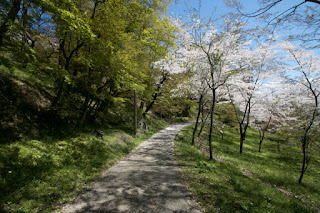 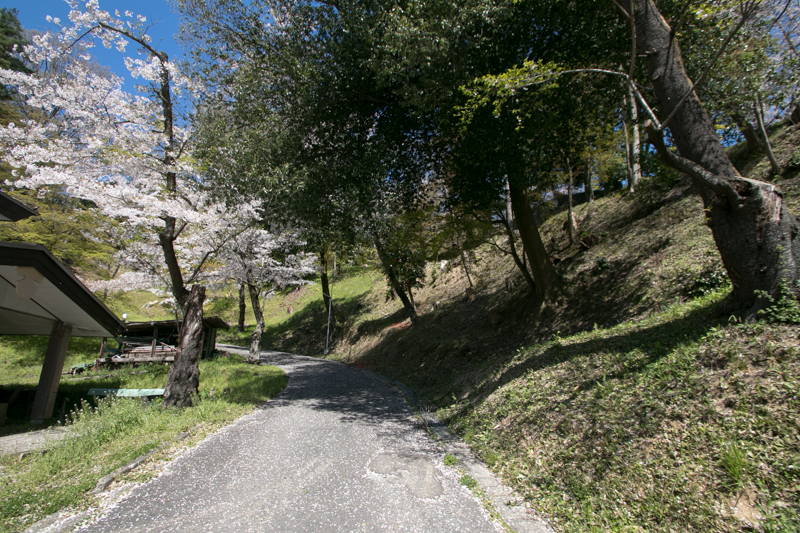 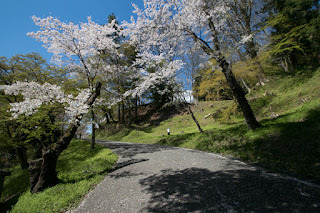 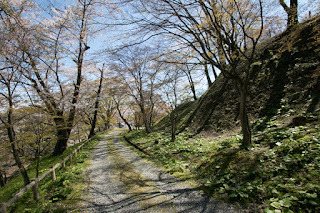 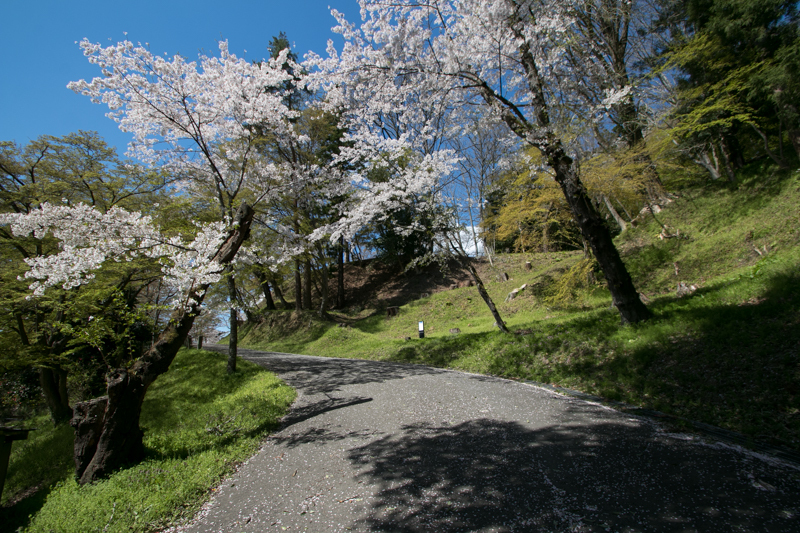 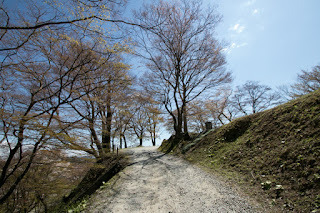 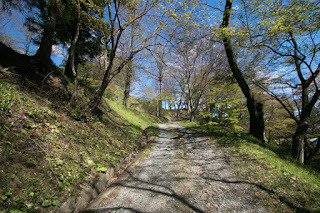 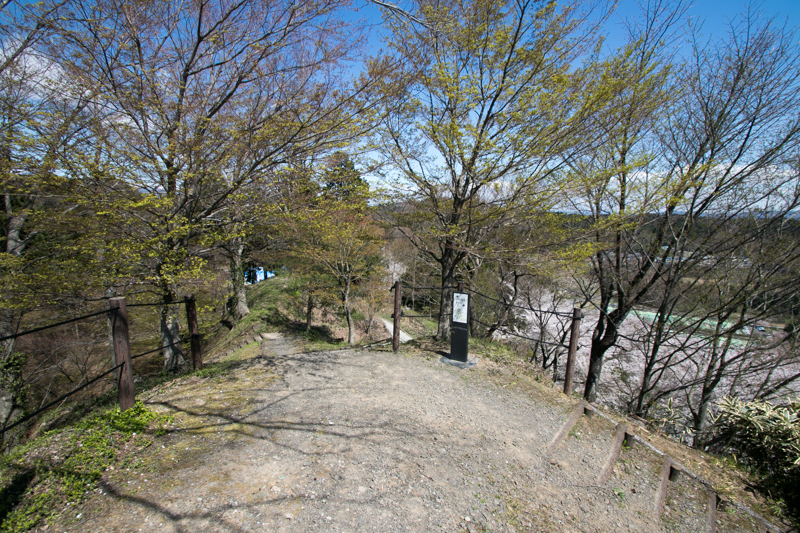 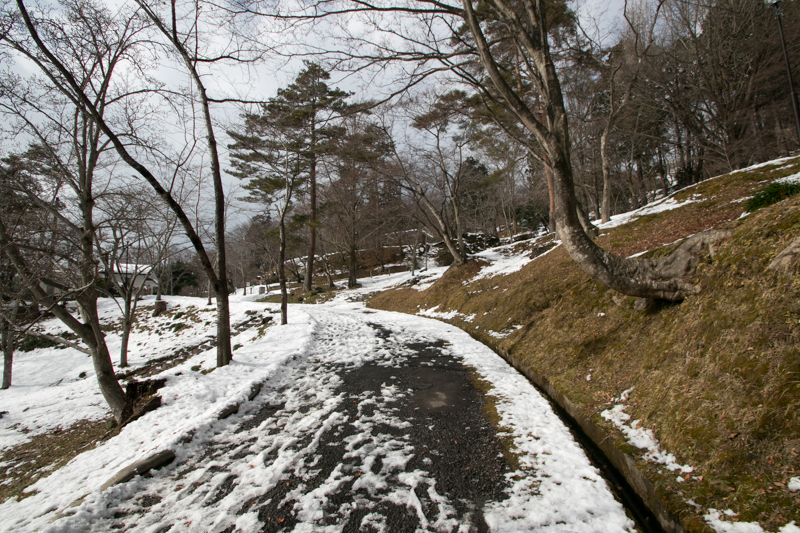 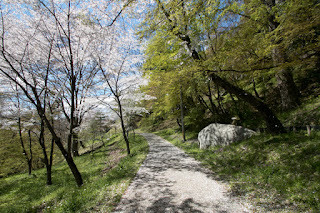 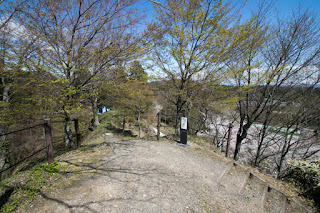 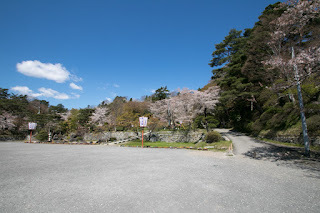 Because the road goes through narrow valley beside the river in front of the castle, it is an important area to control the communication. 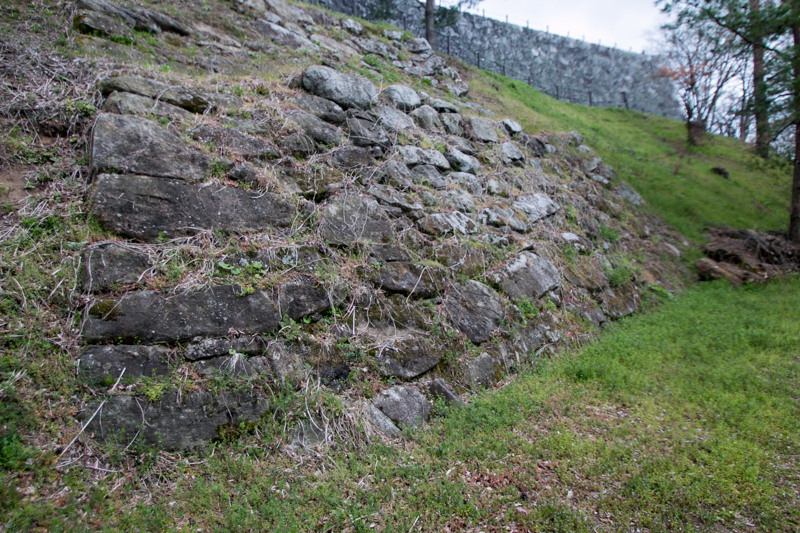 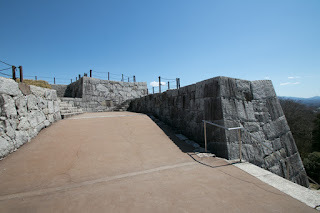 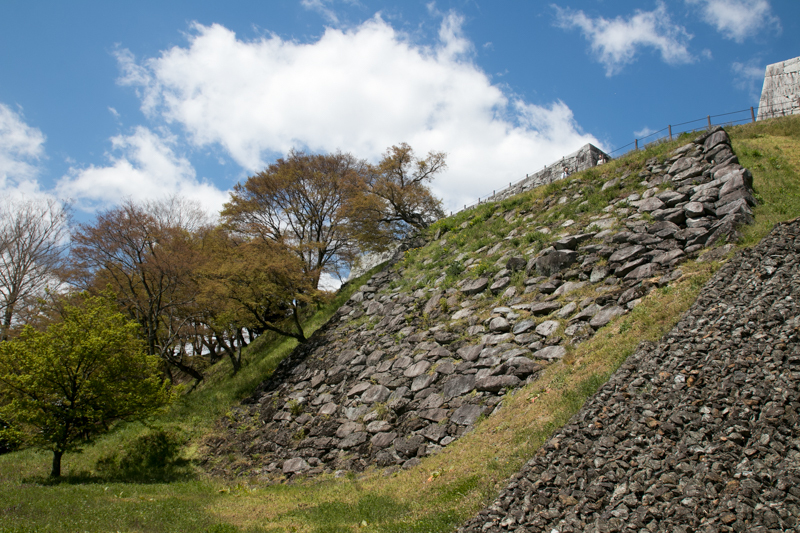 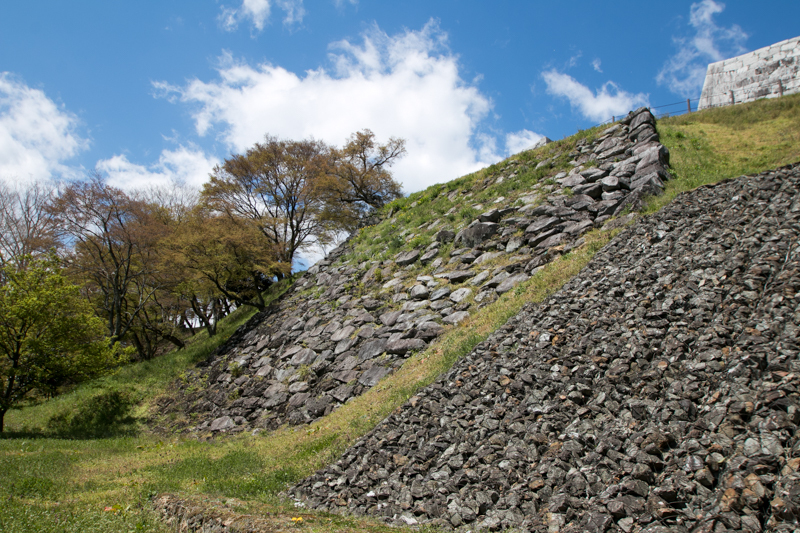 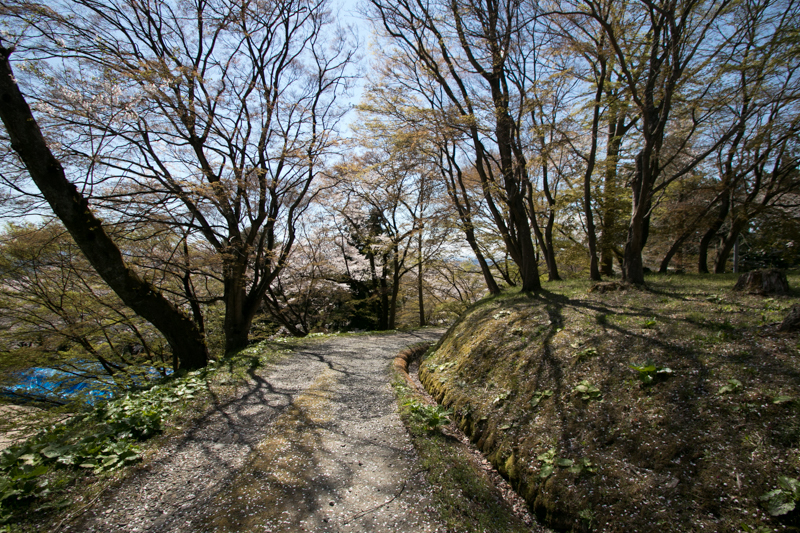 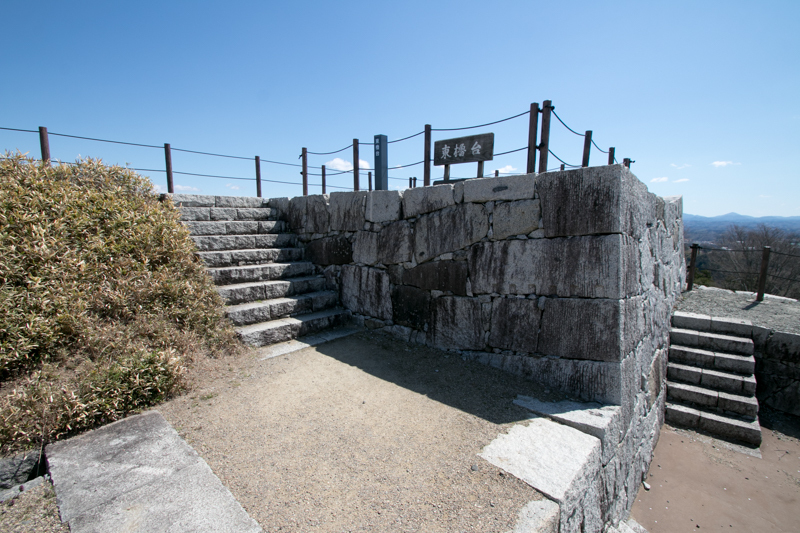 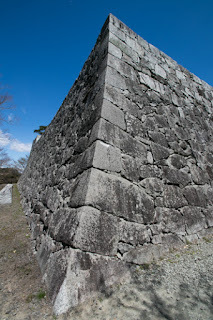 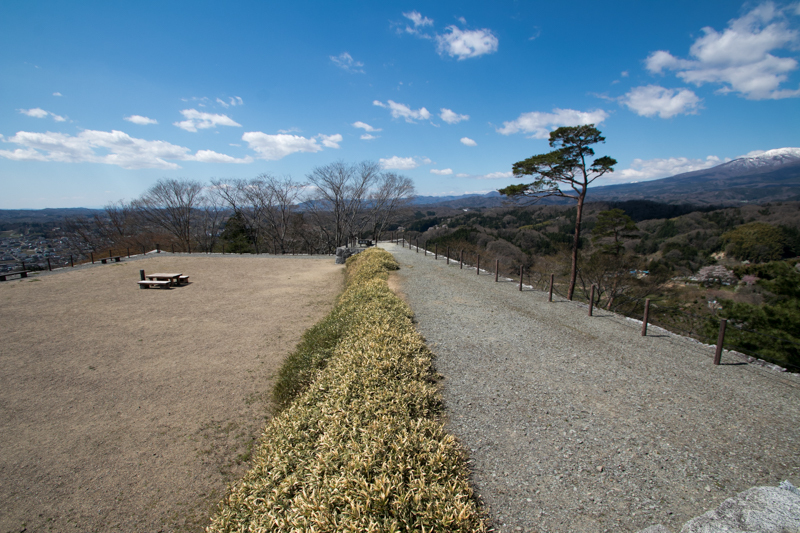 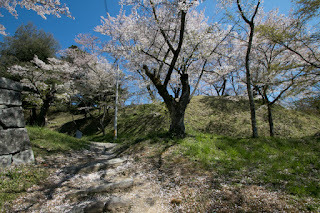 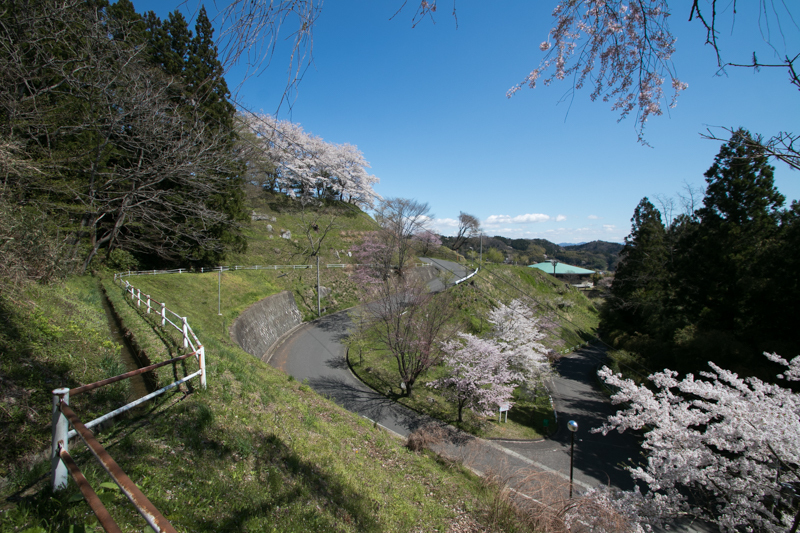 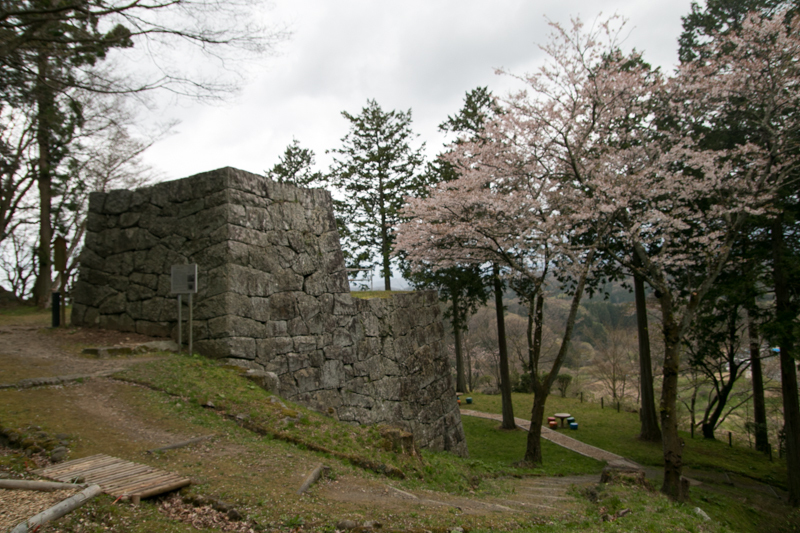 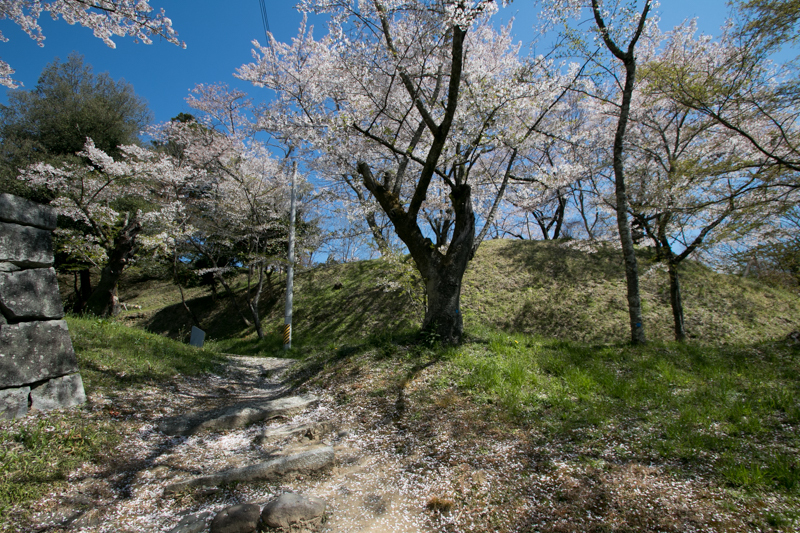 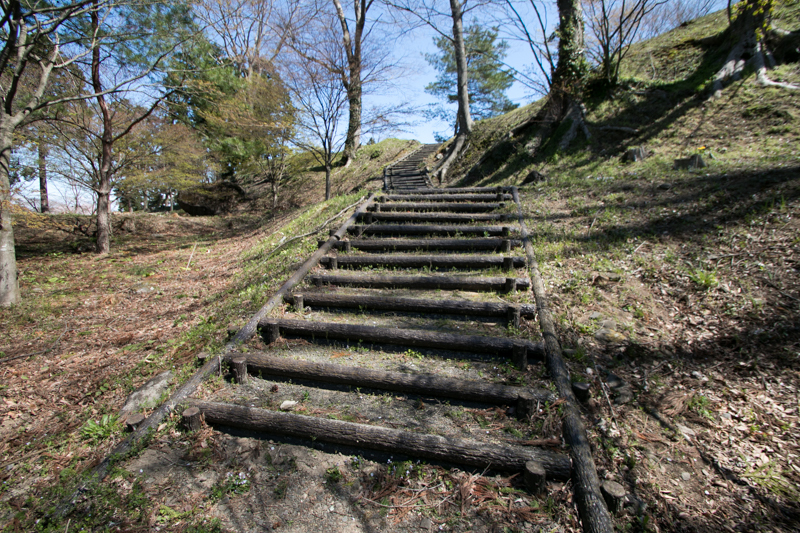 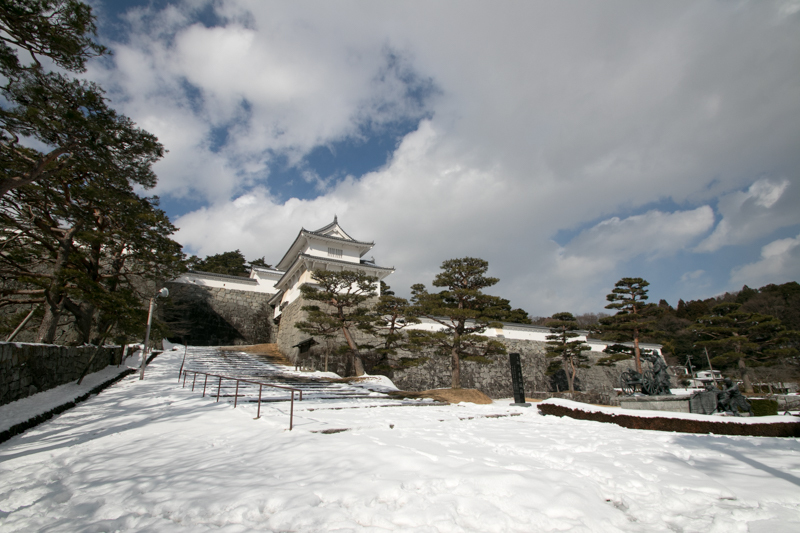 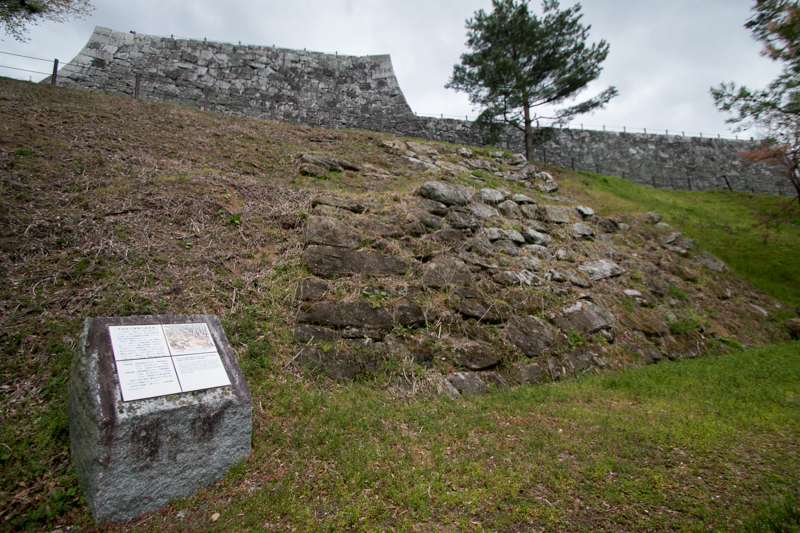 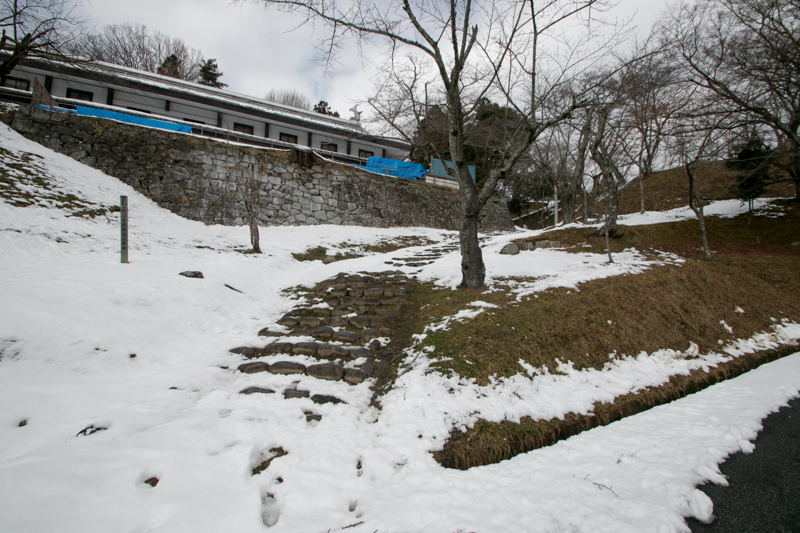 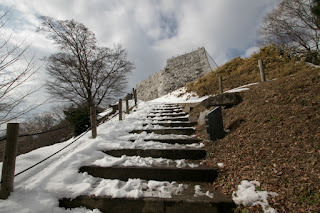 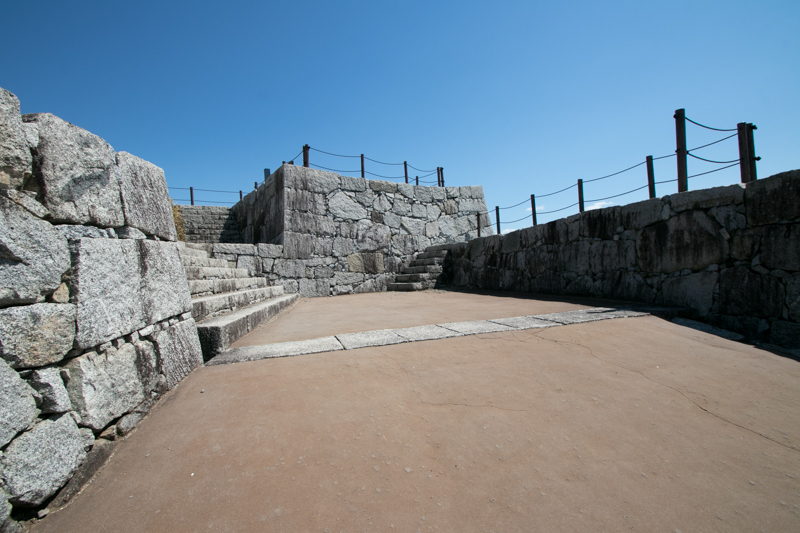 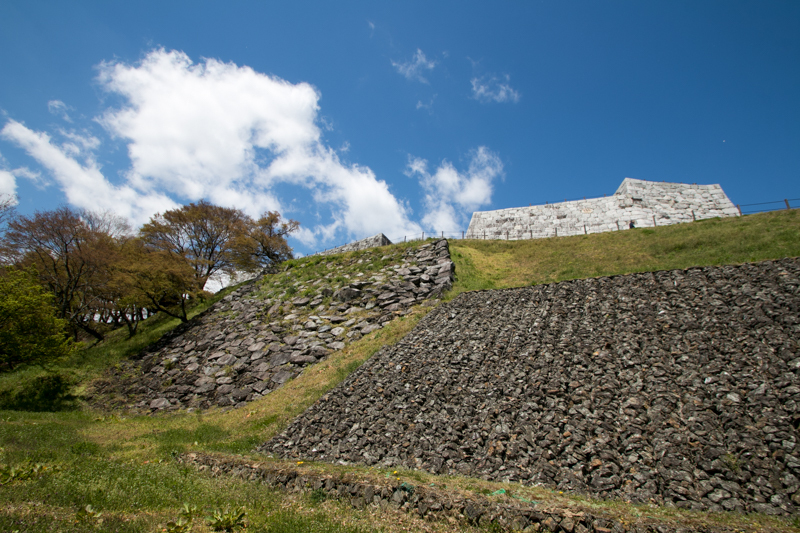 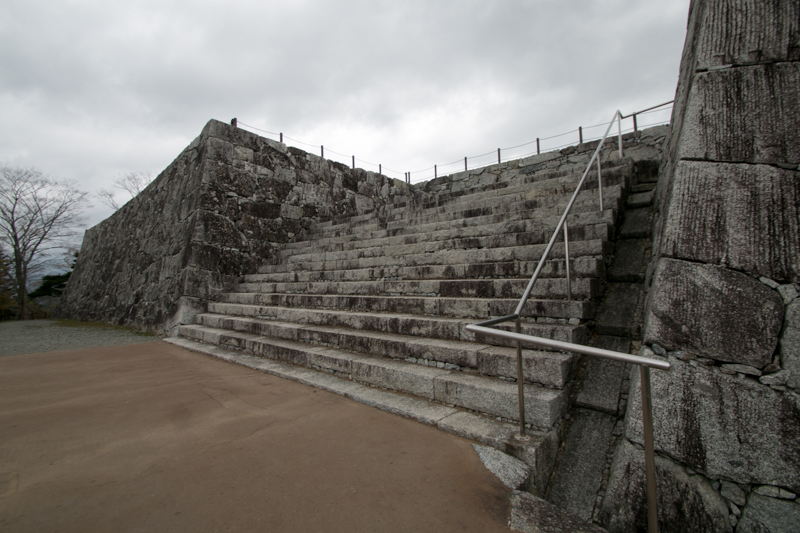 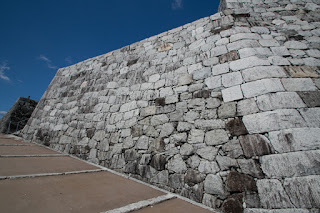 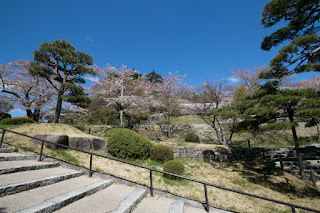 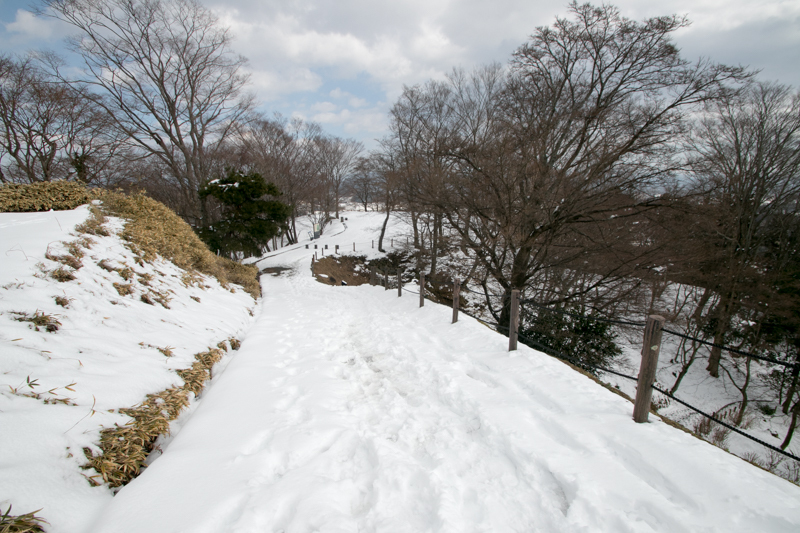 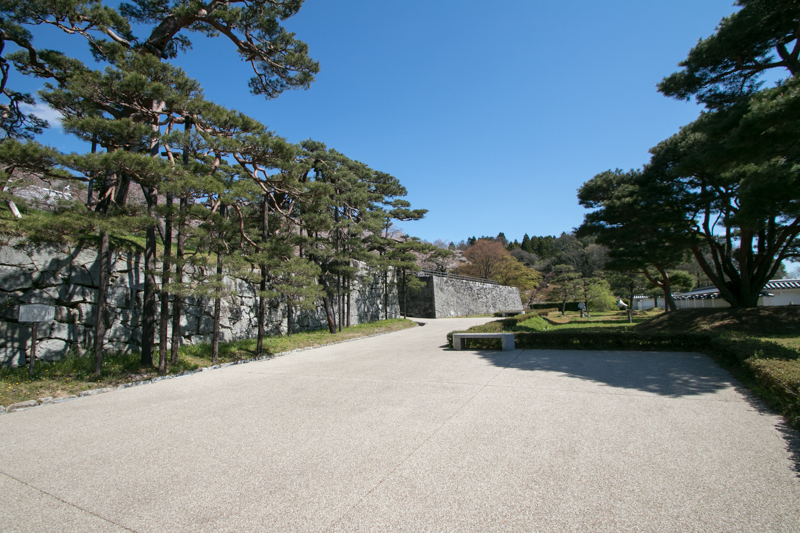 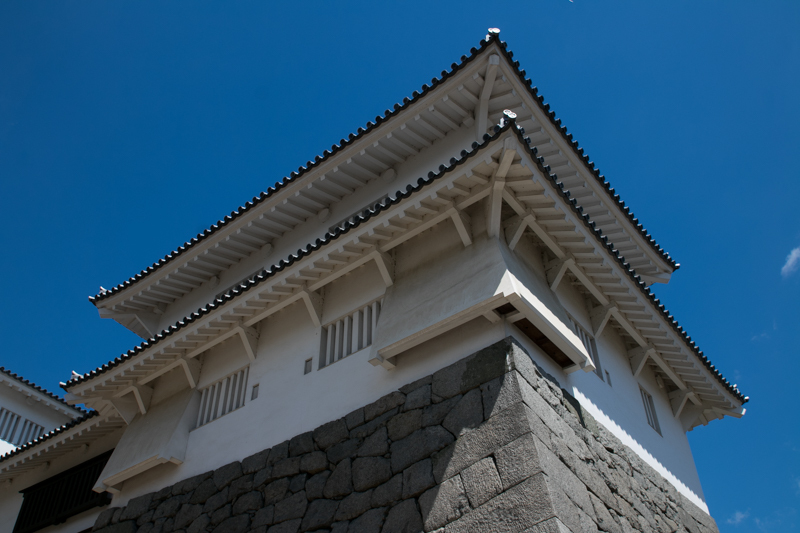 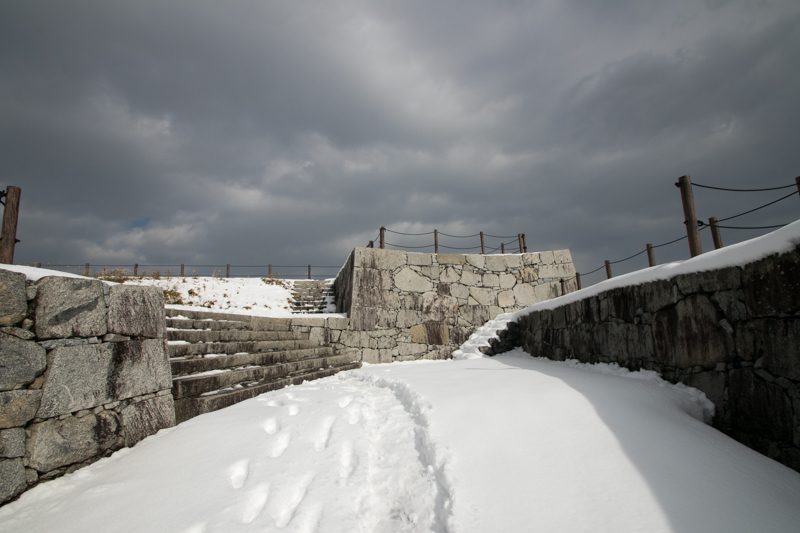 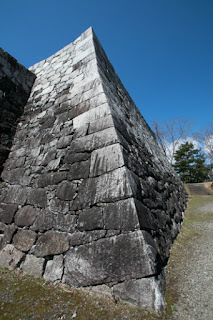 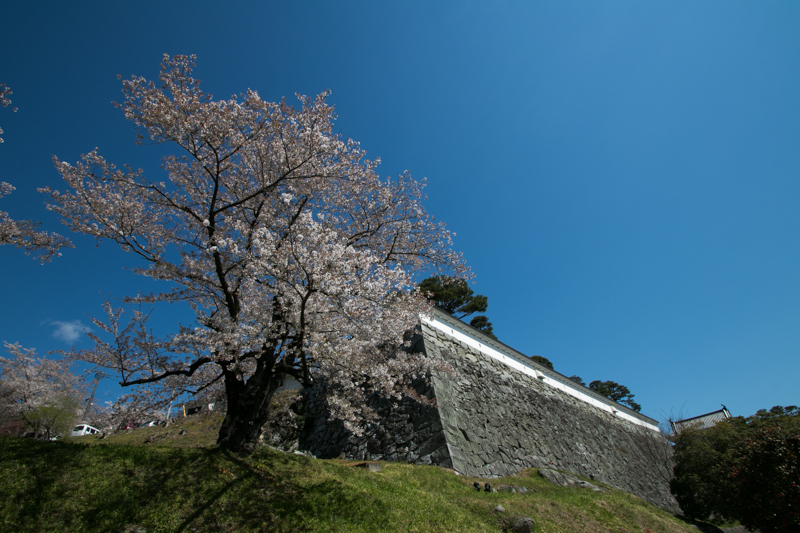 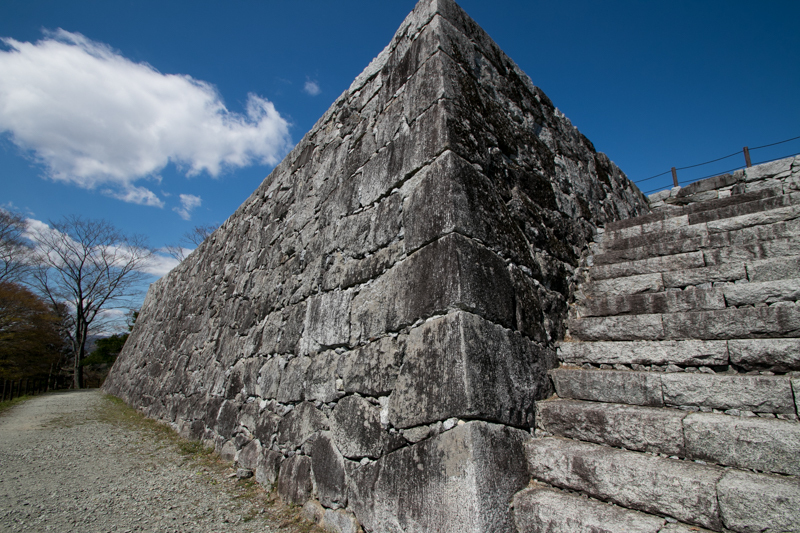 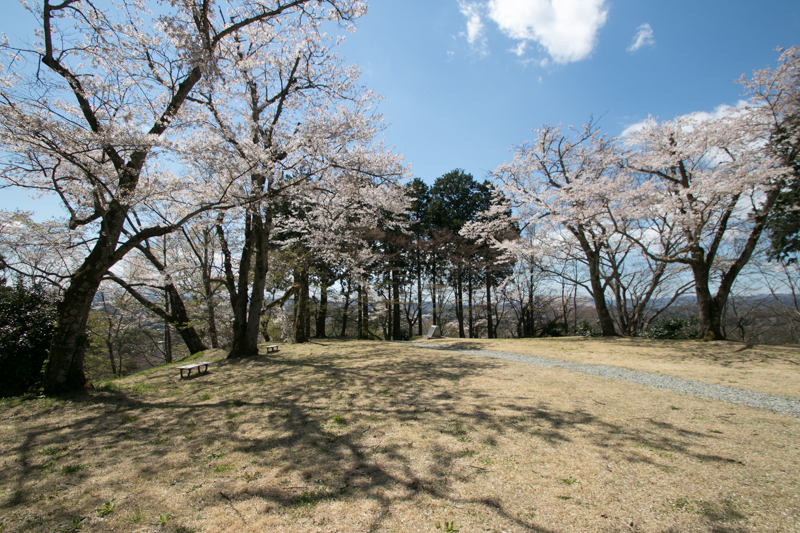 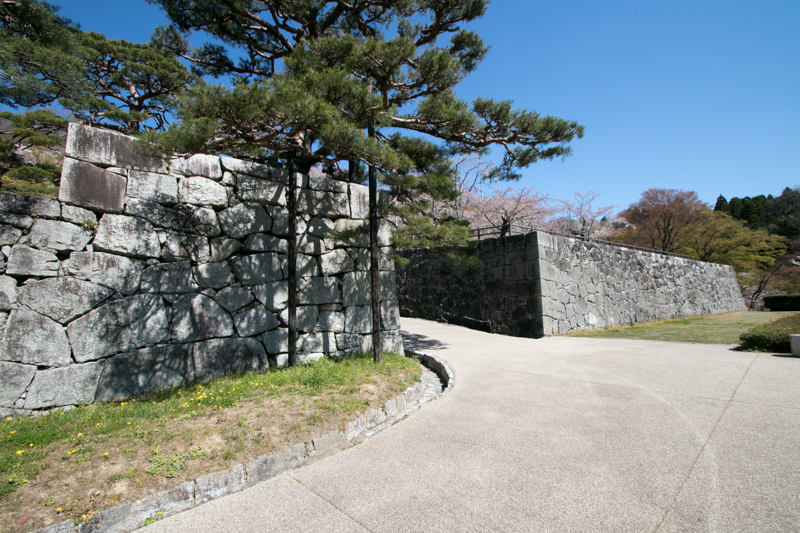 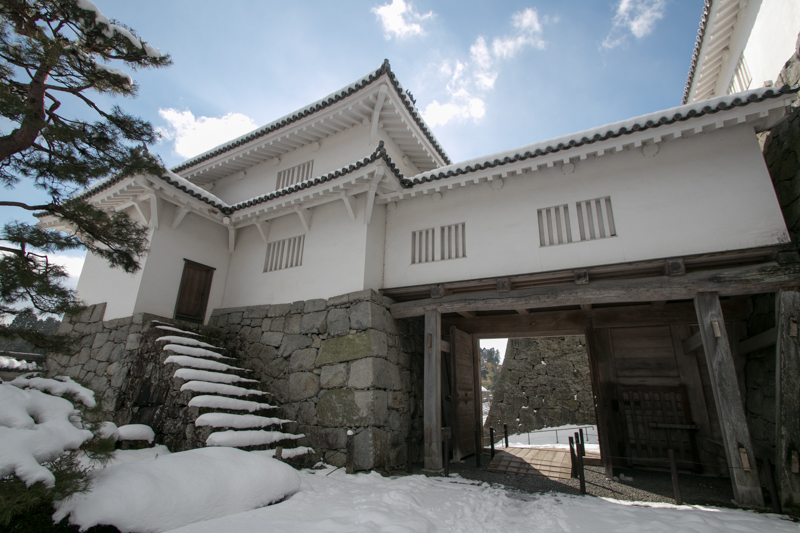 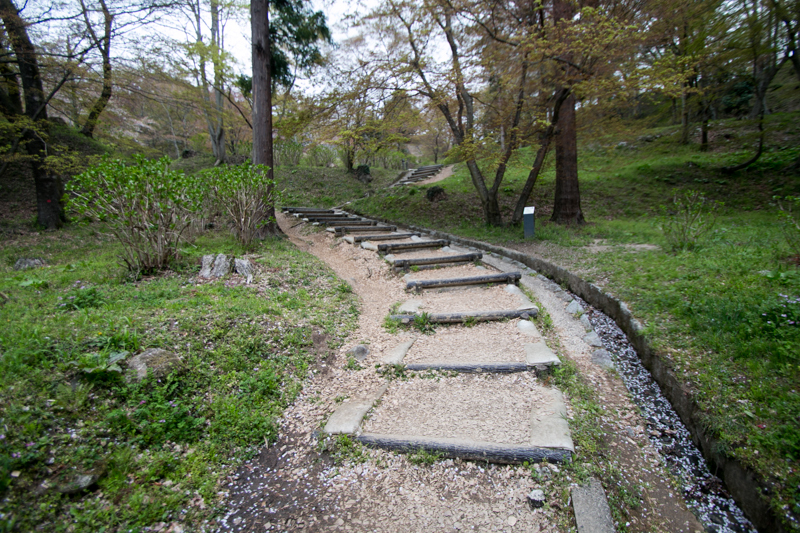 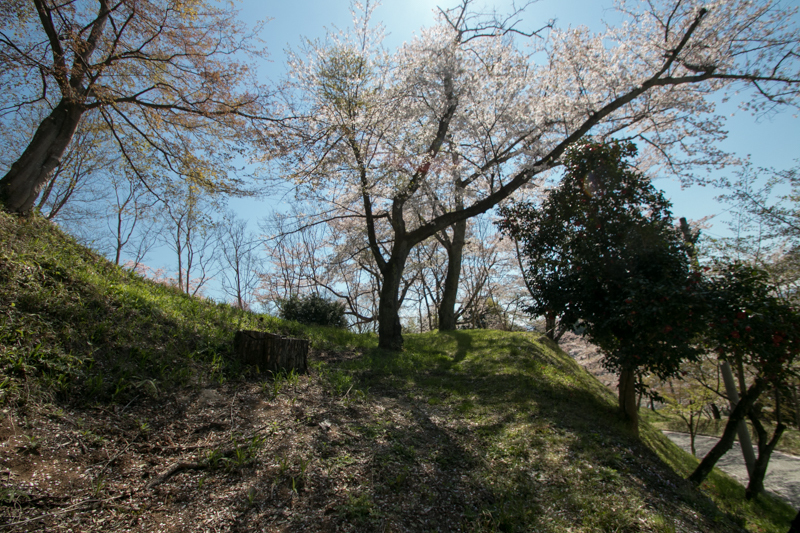 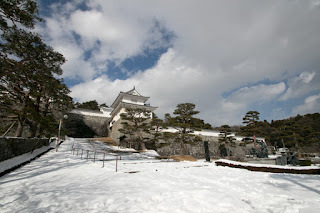 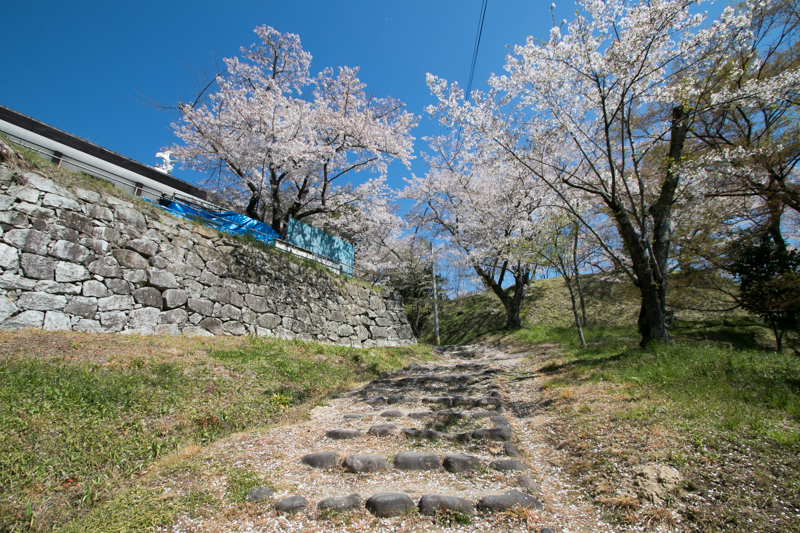 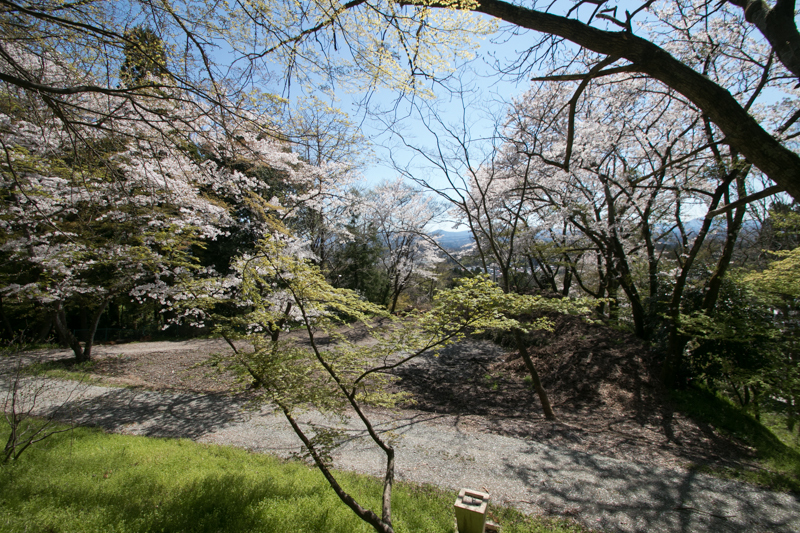 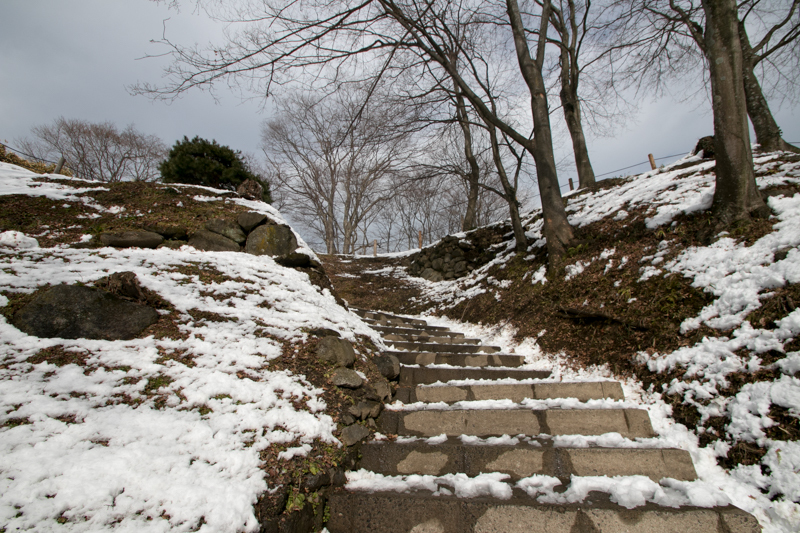 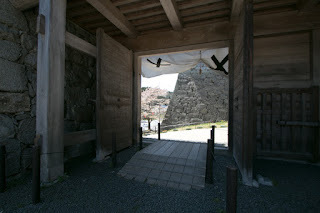 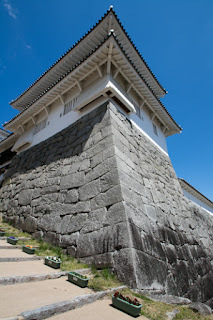 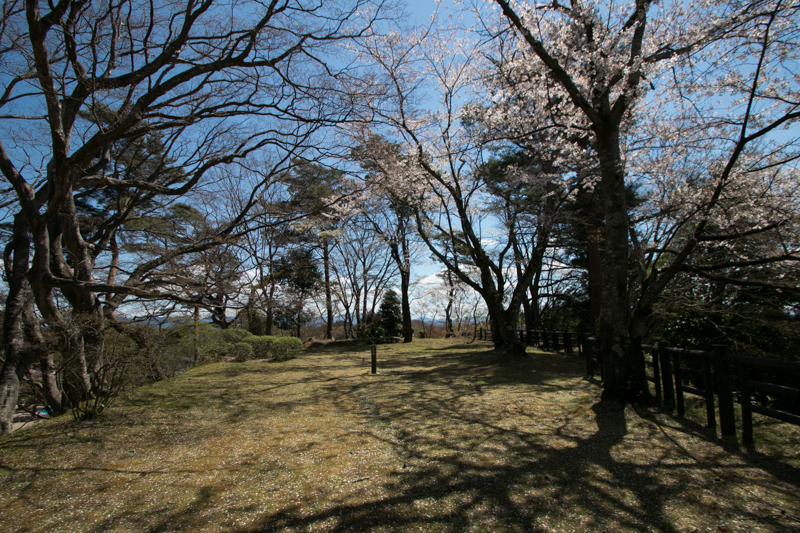 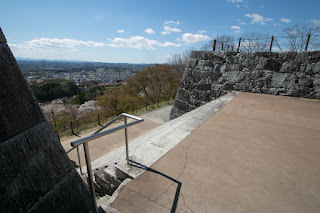 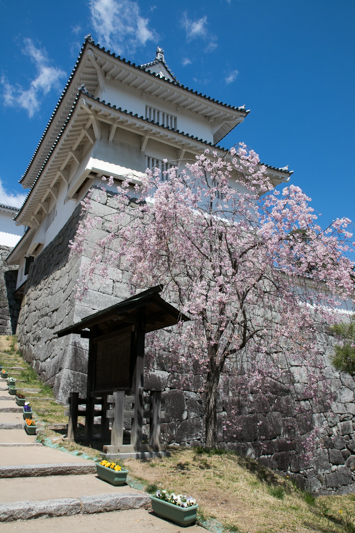 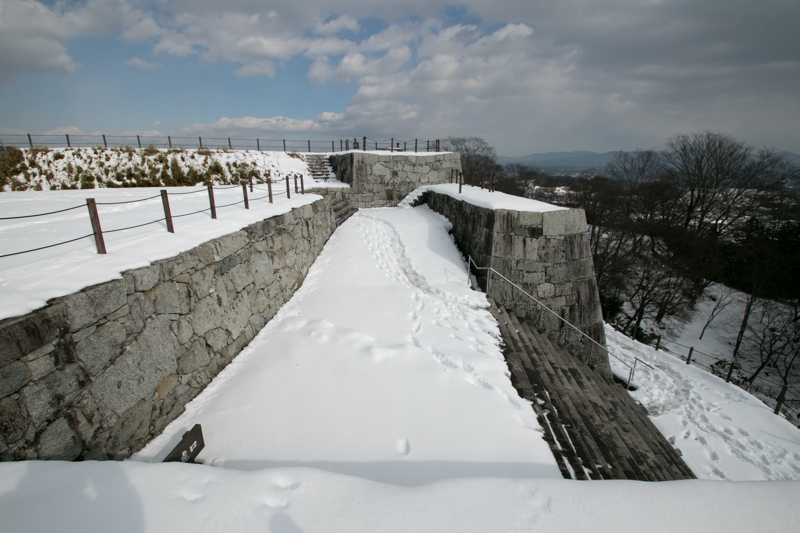 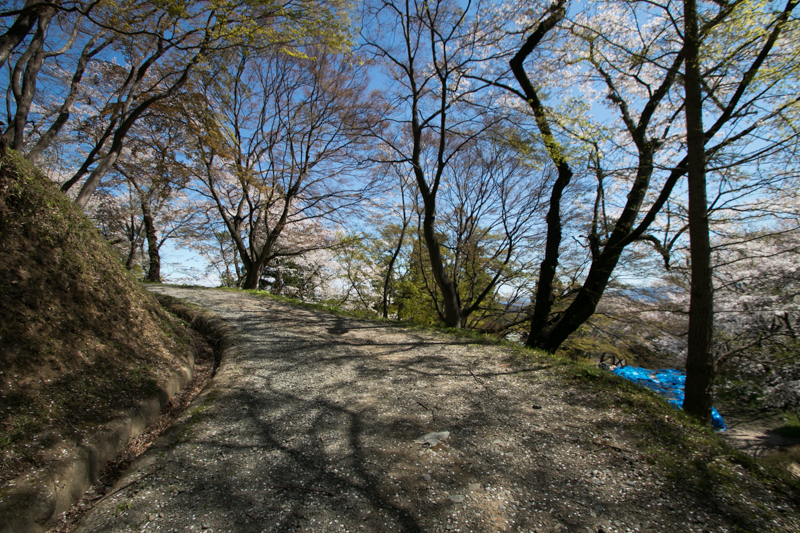 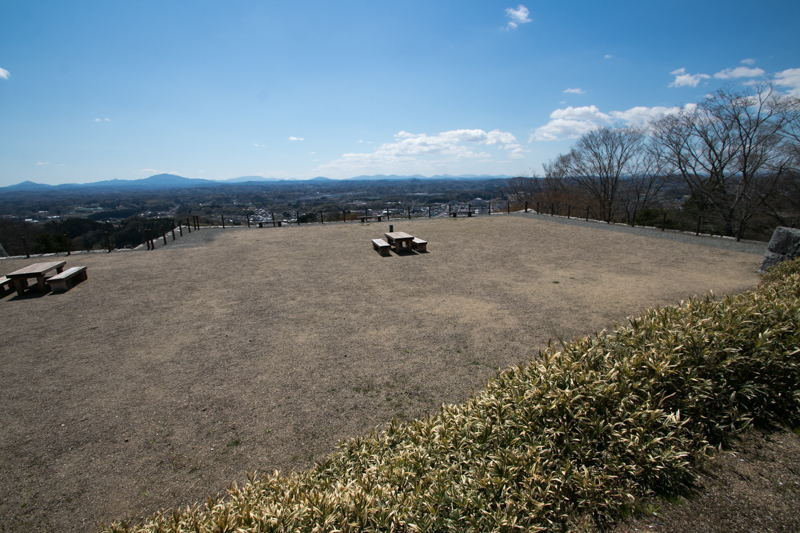 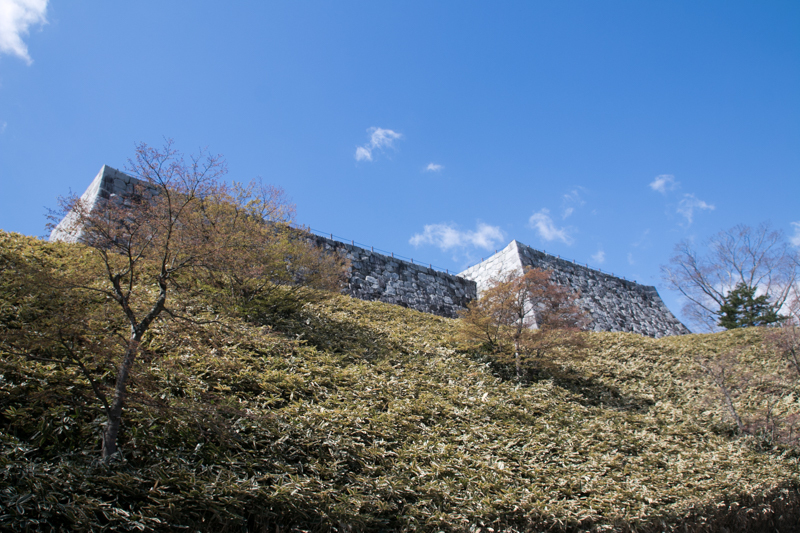 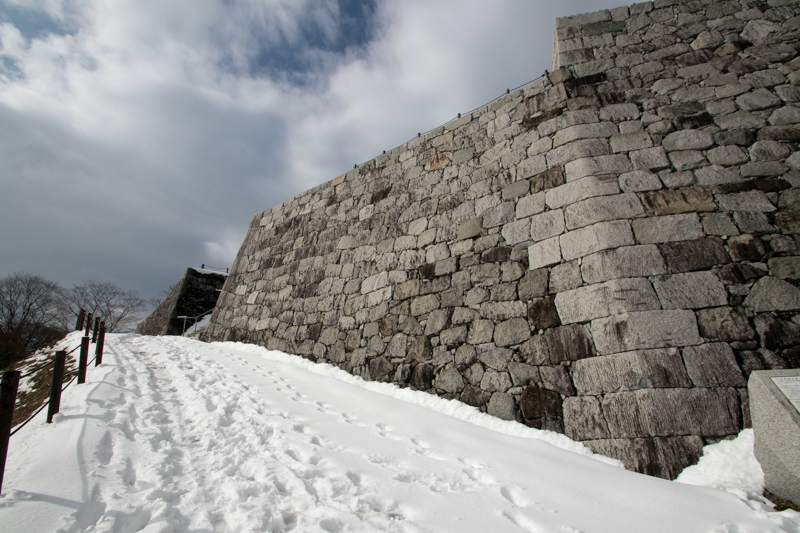 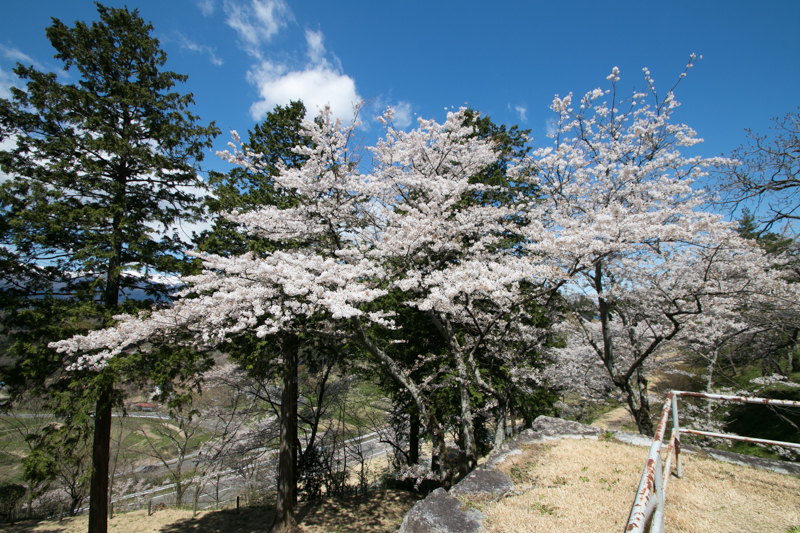 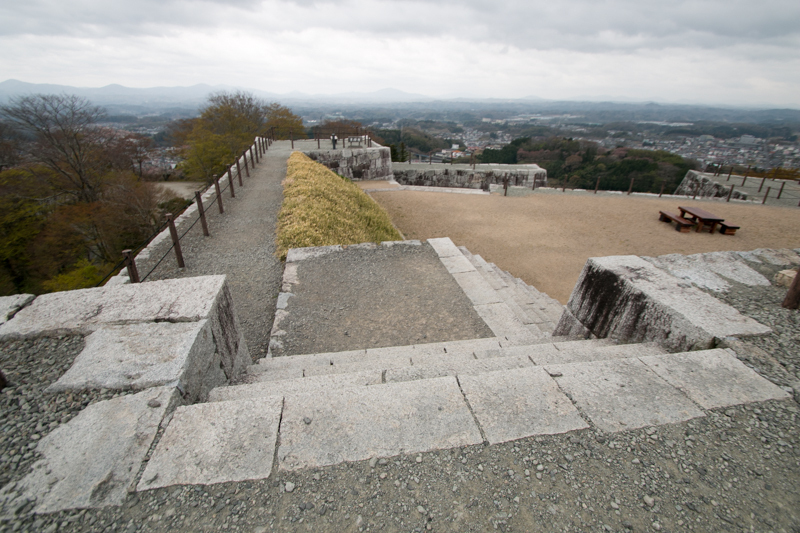 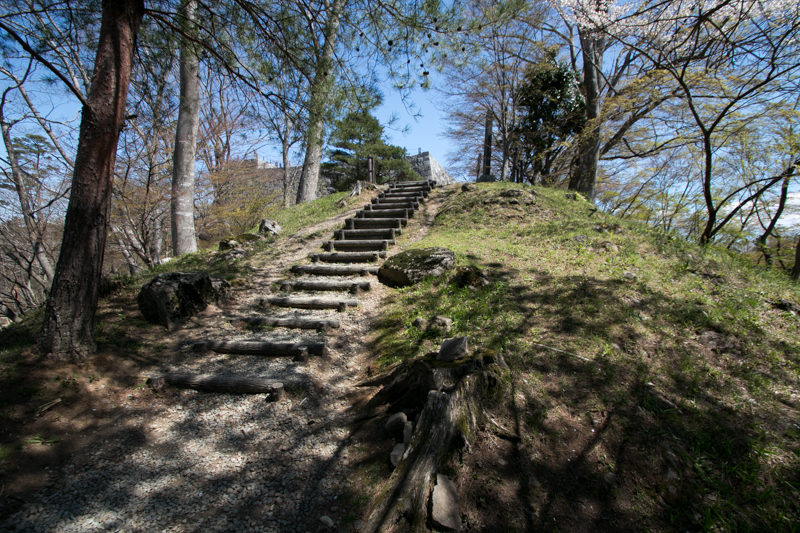 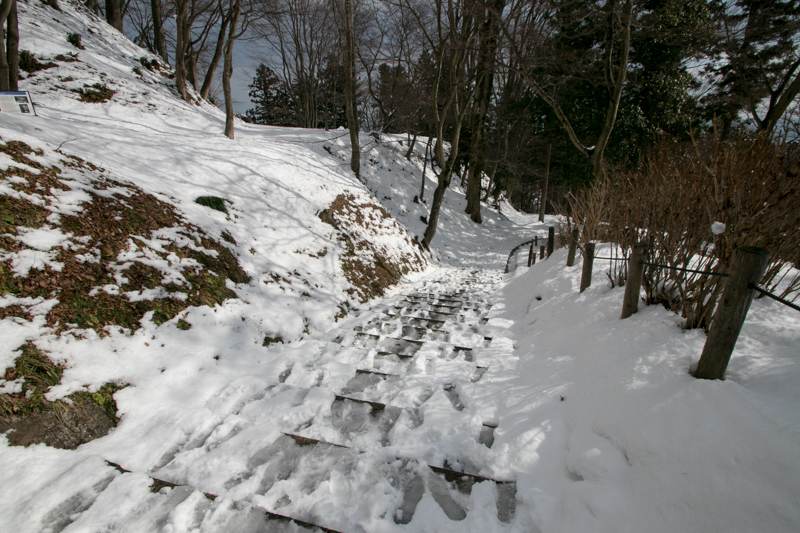 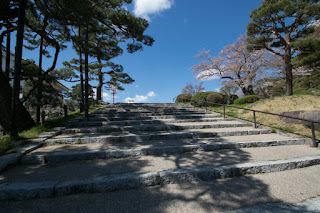 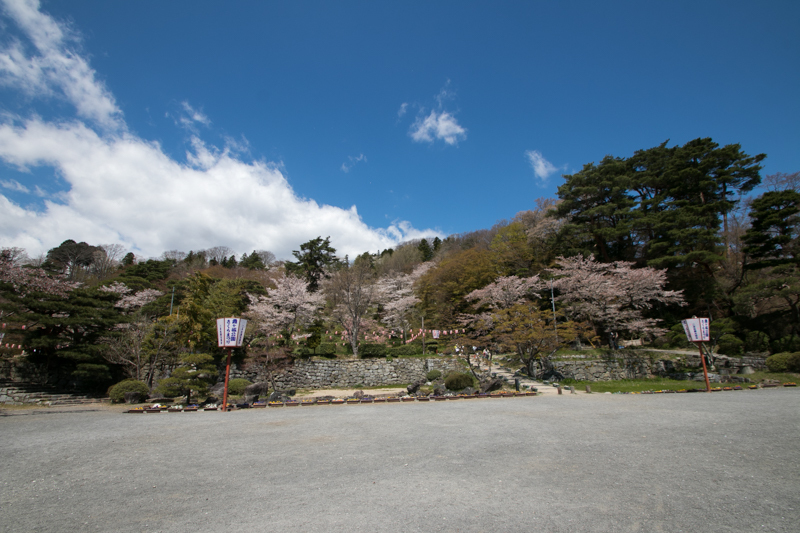 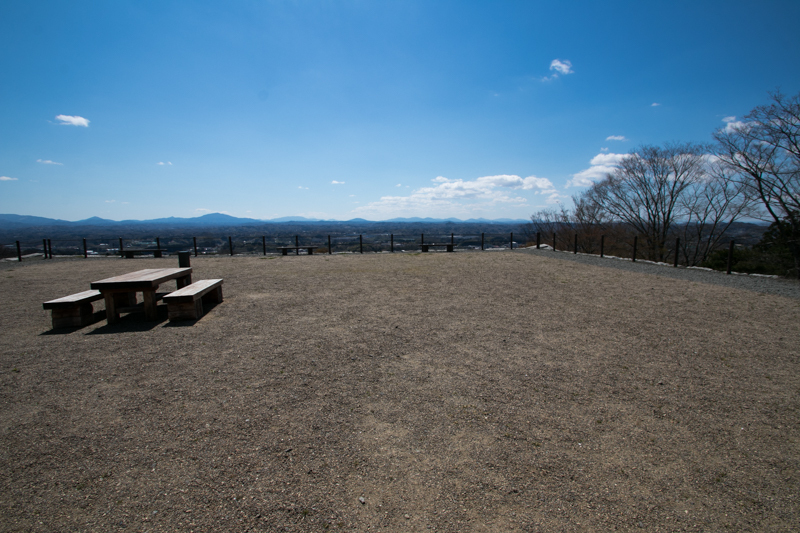 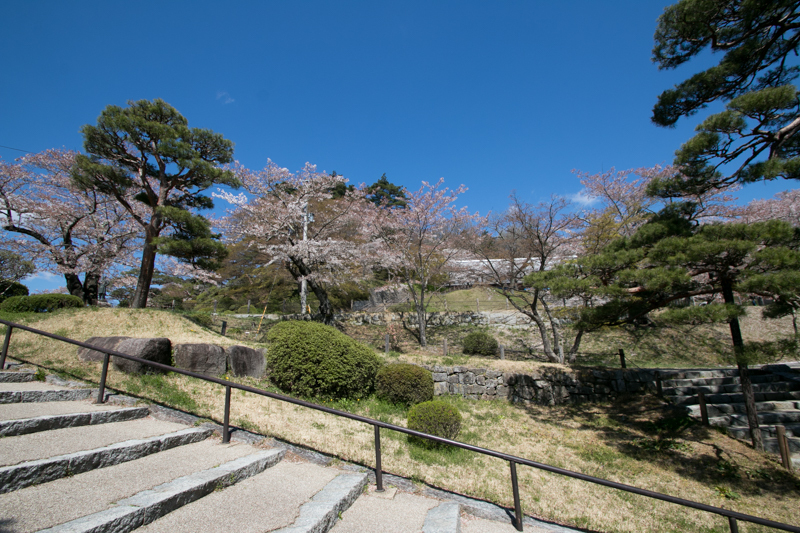 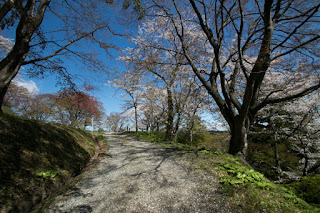 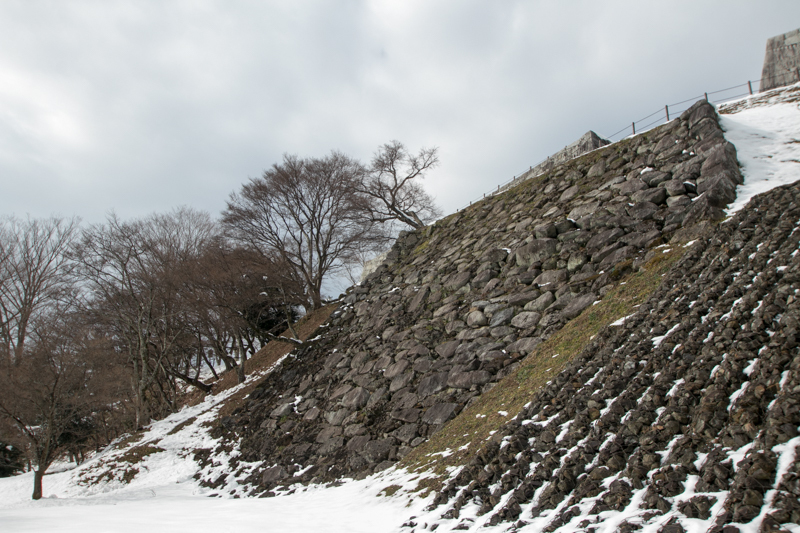 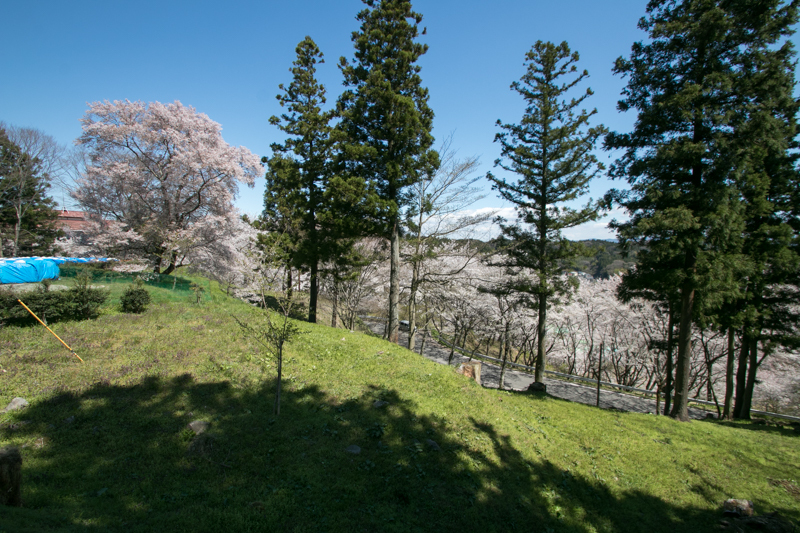 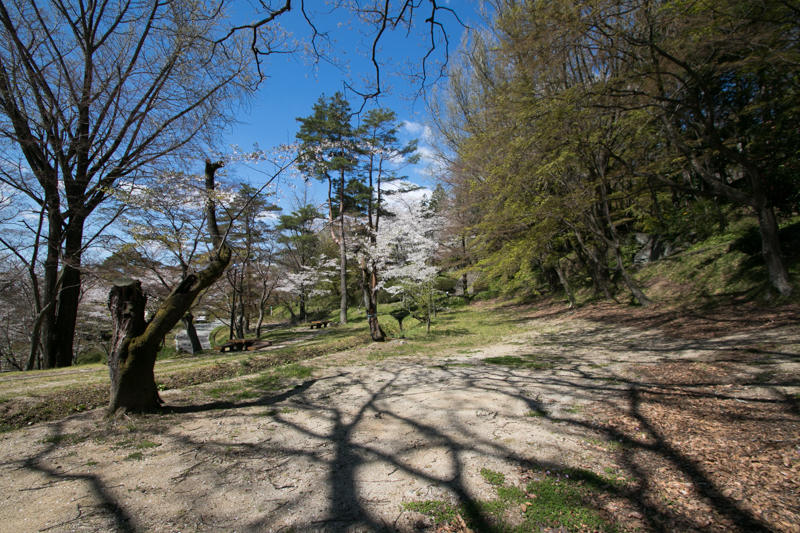 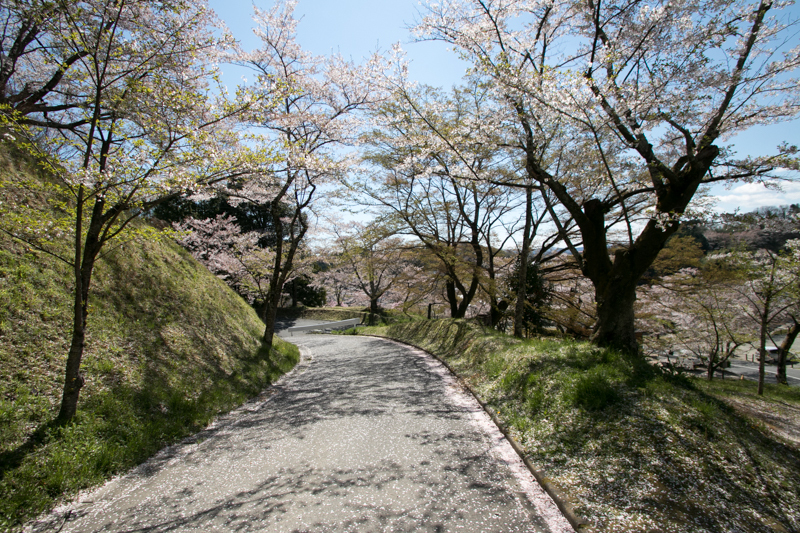 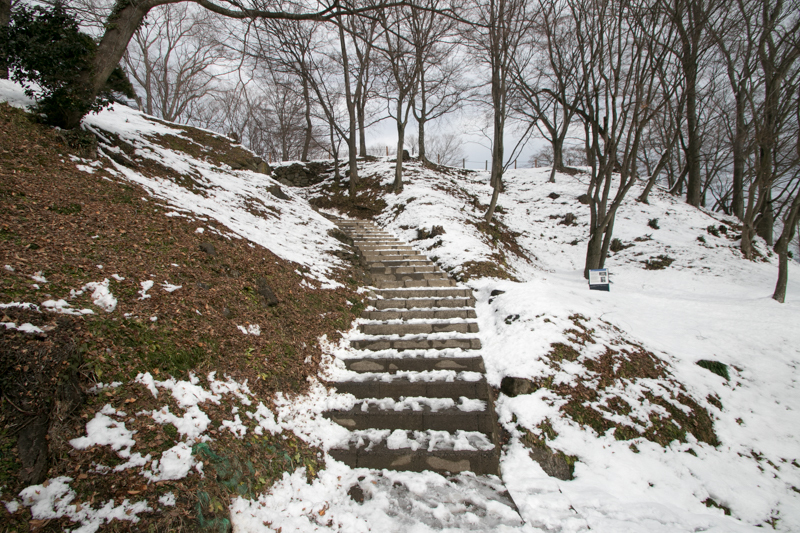 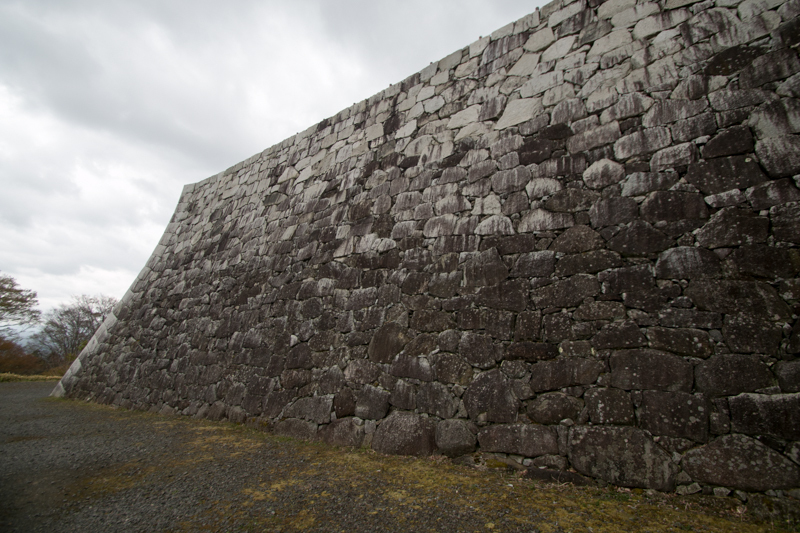 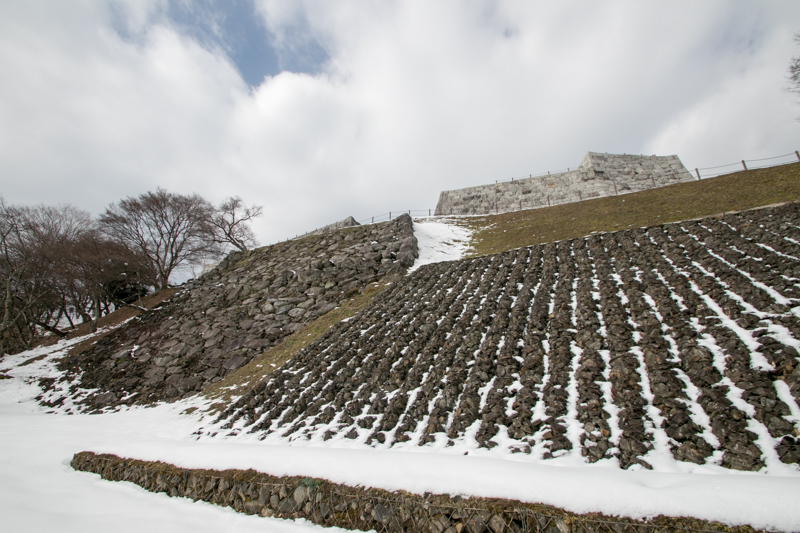 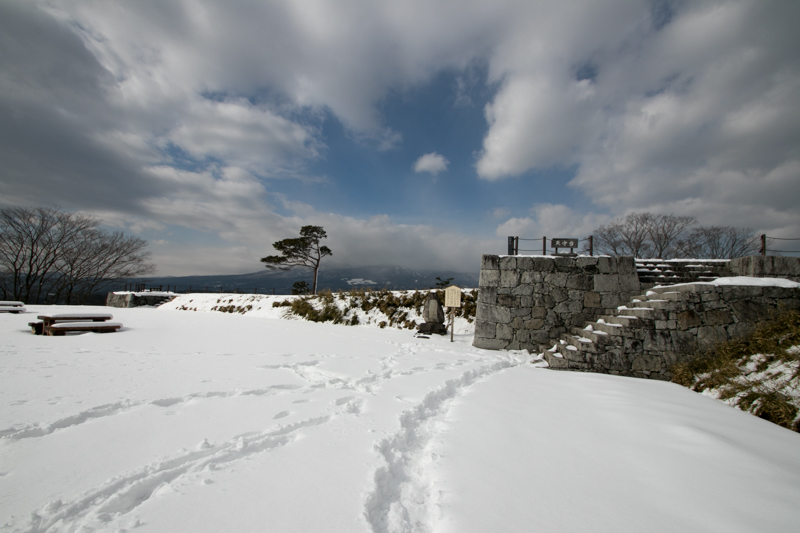 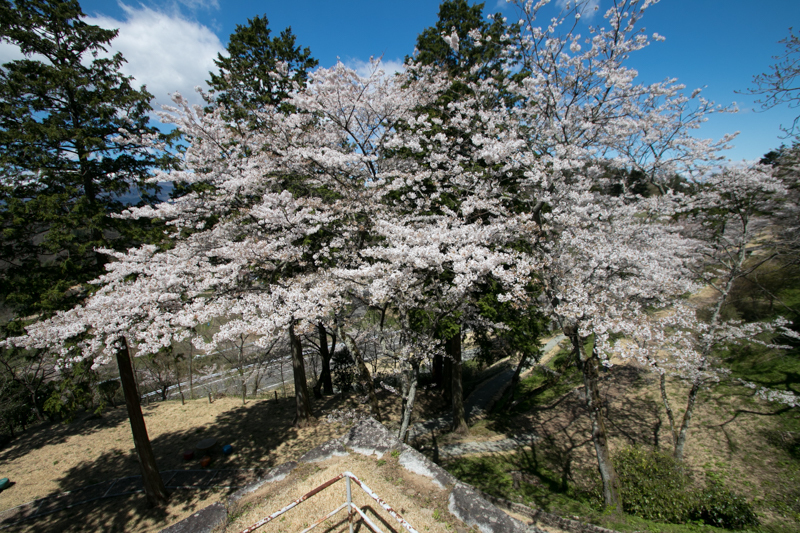 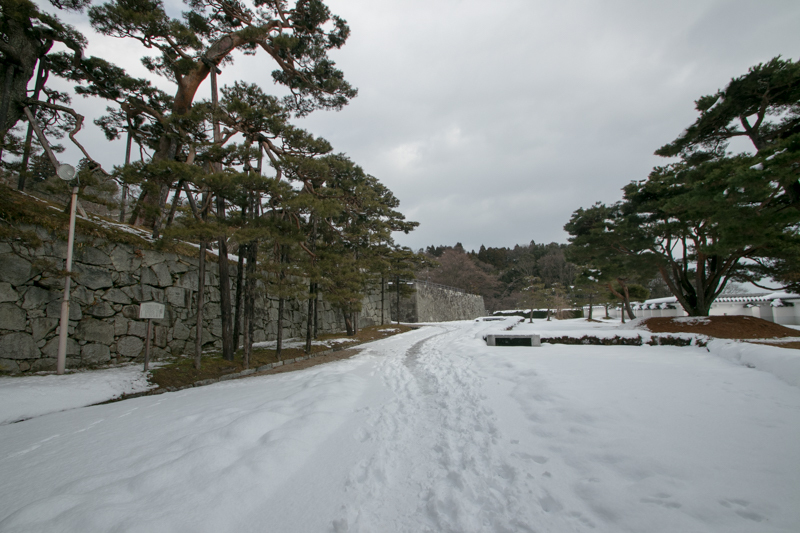 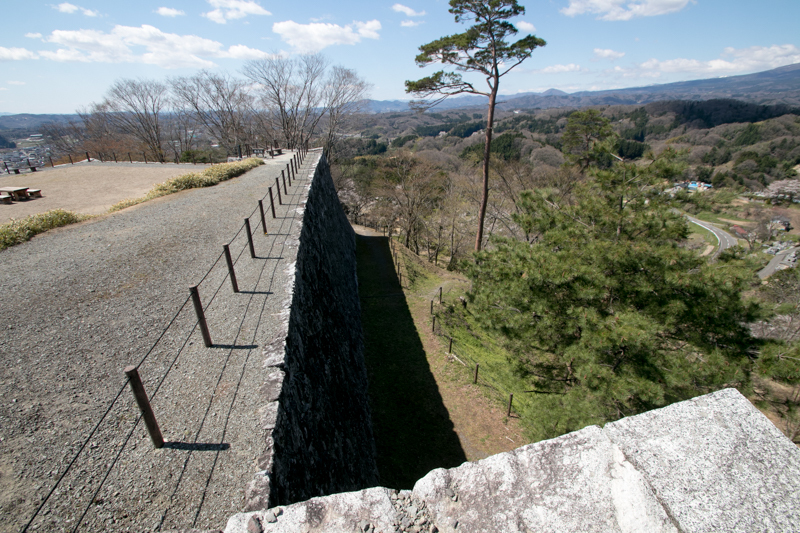 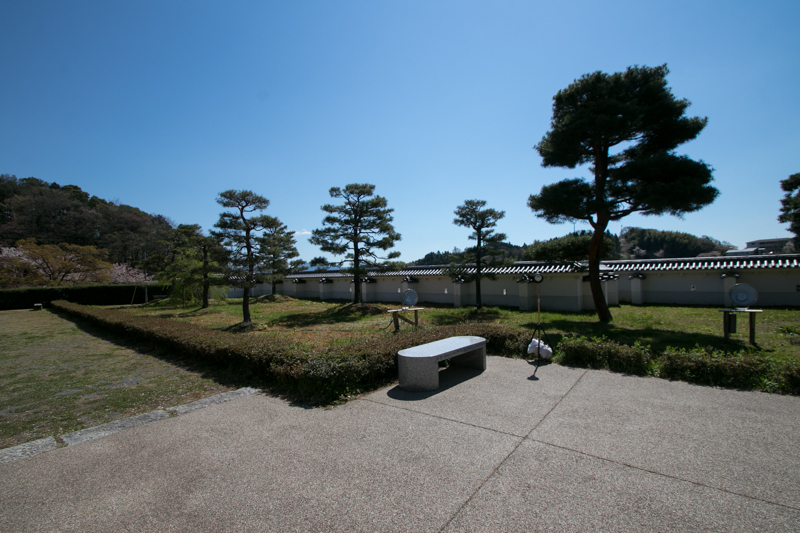 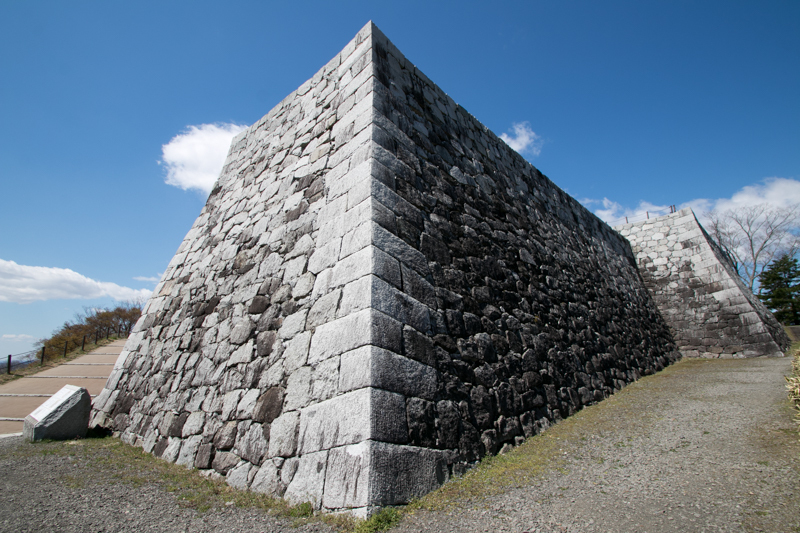 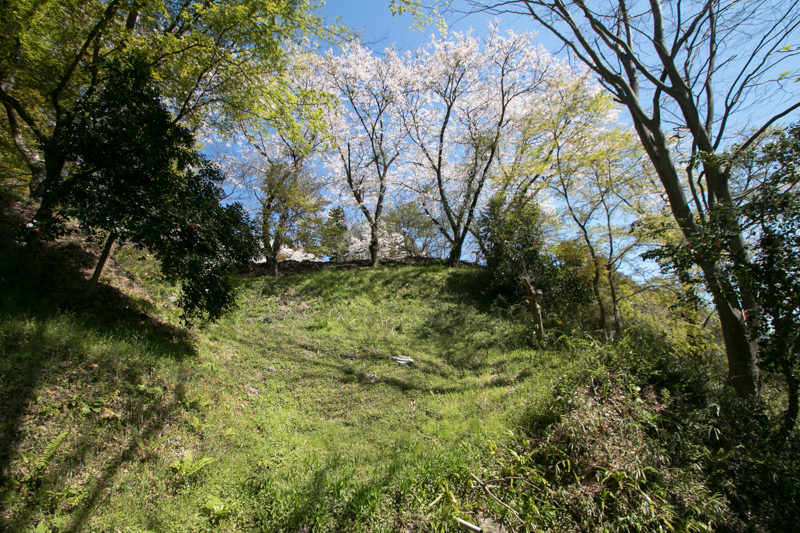 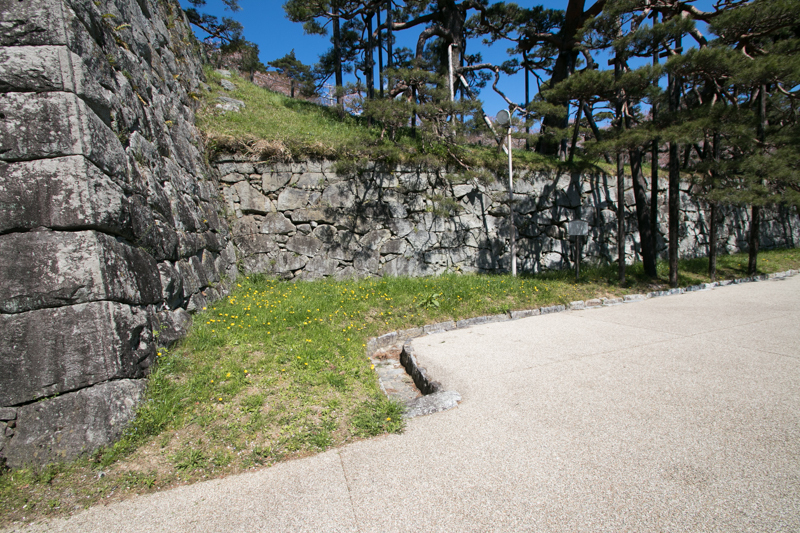 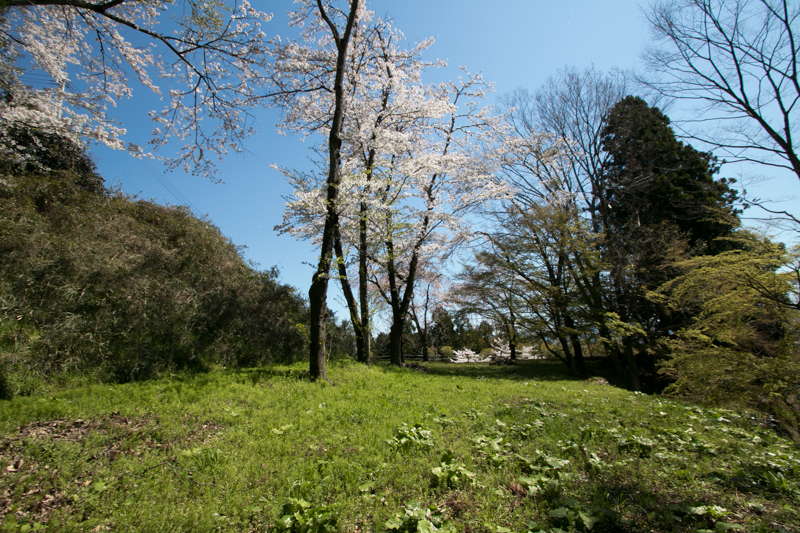 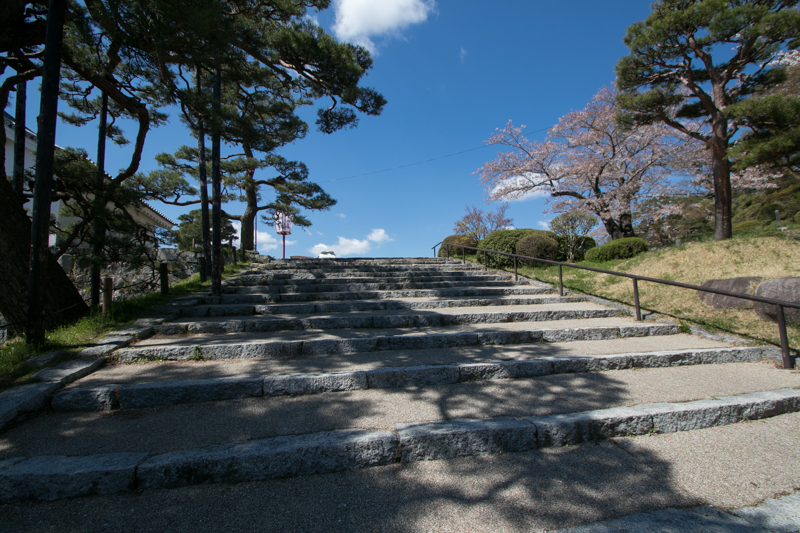 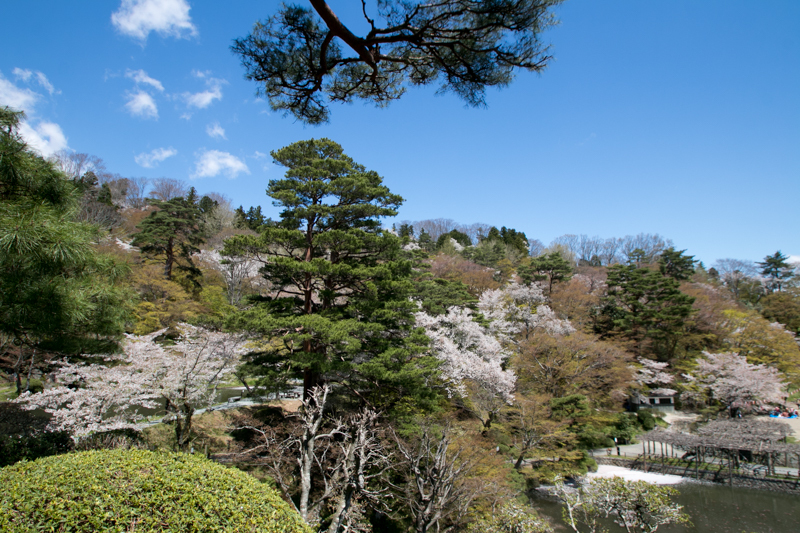 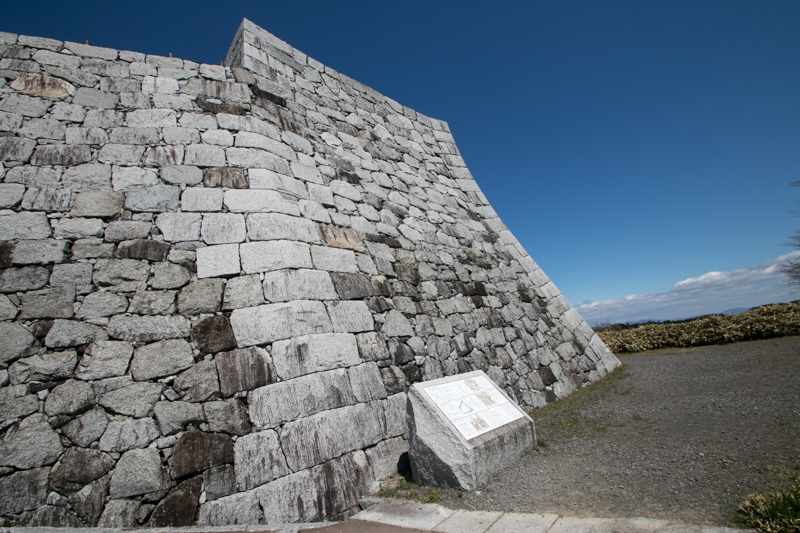 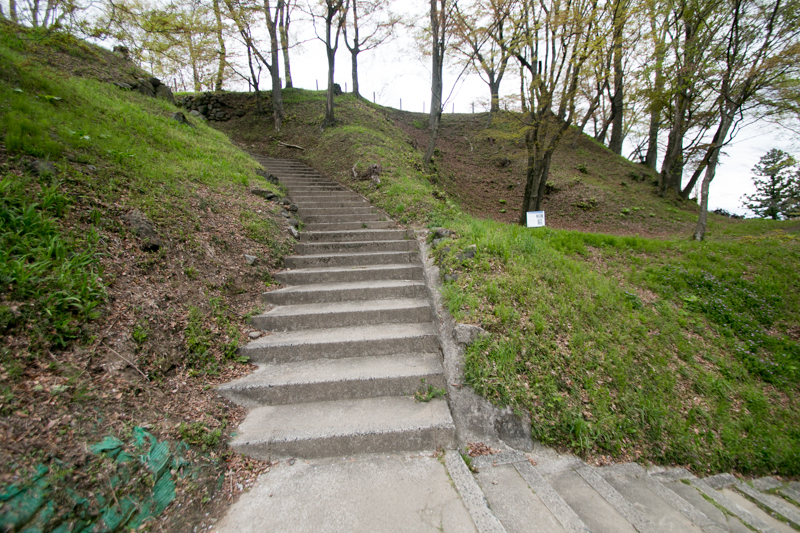 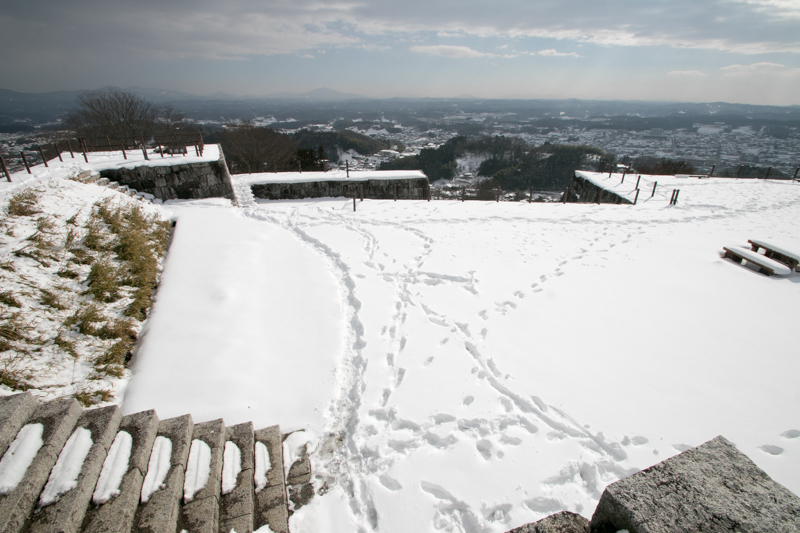 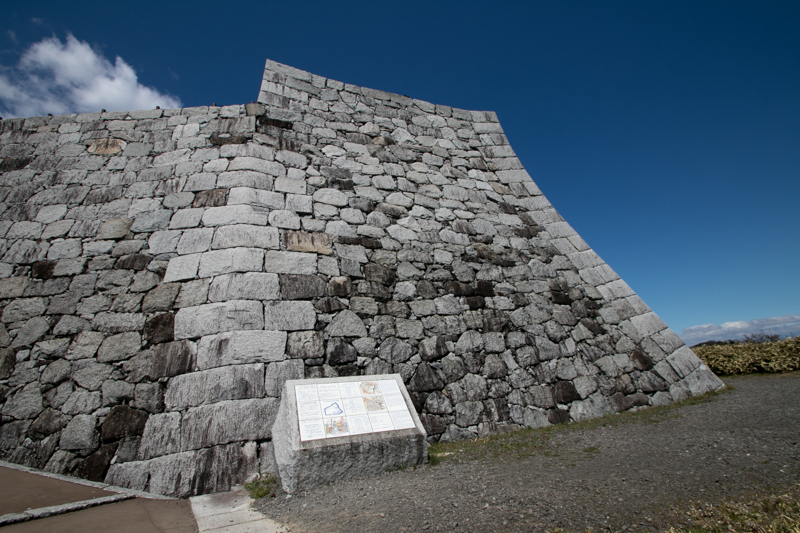 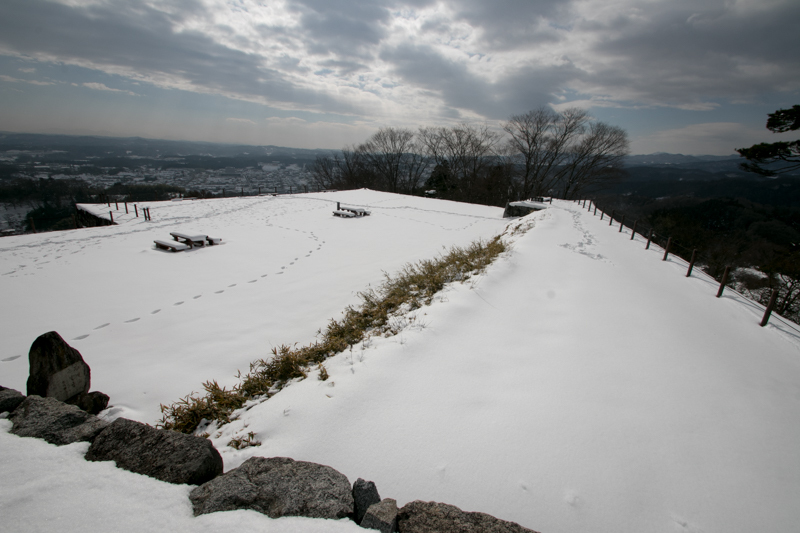 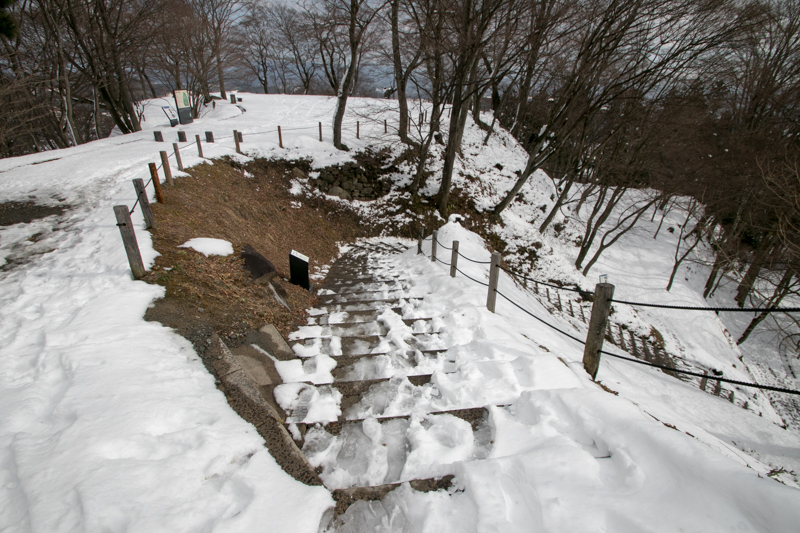 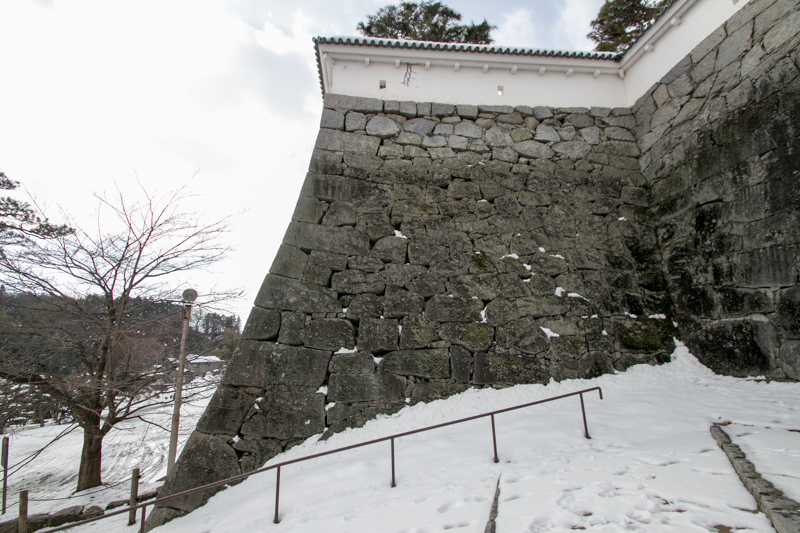 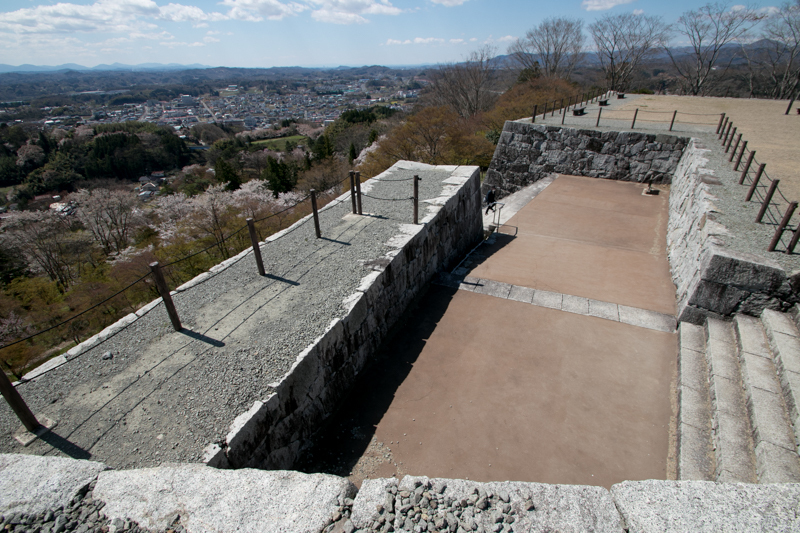 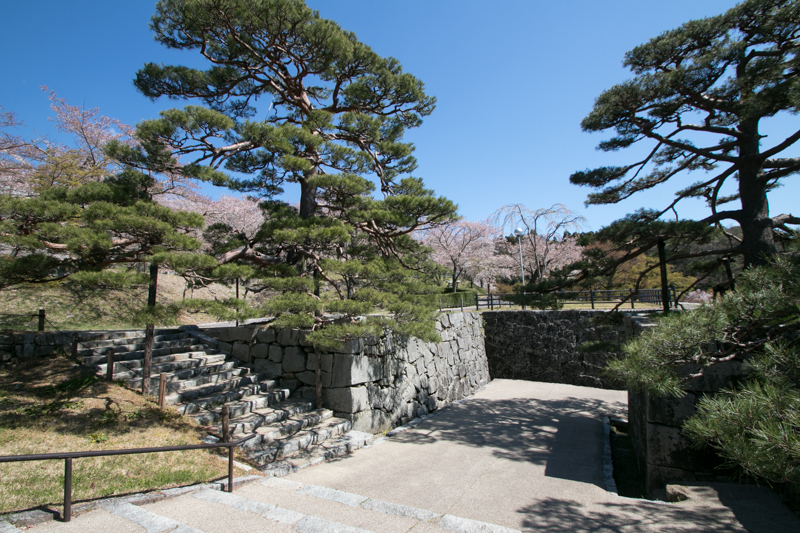 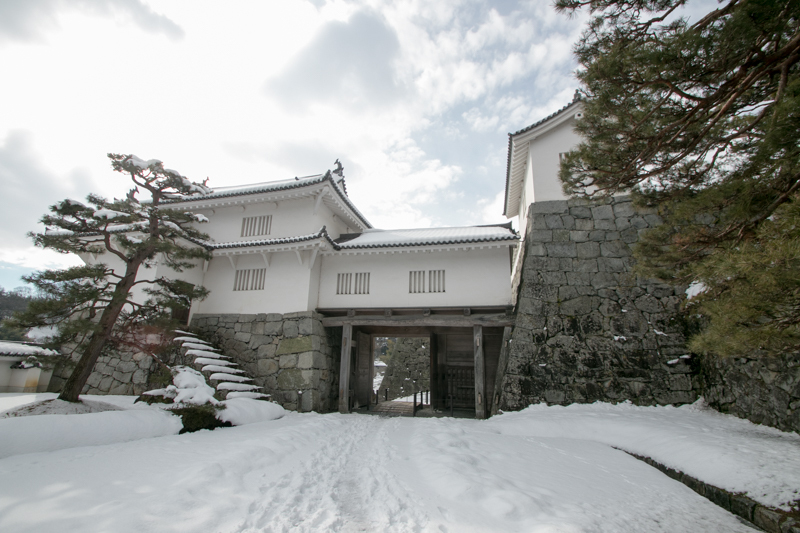 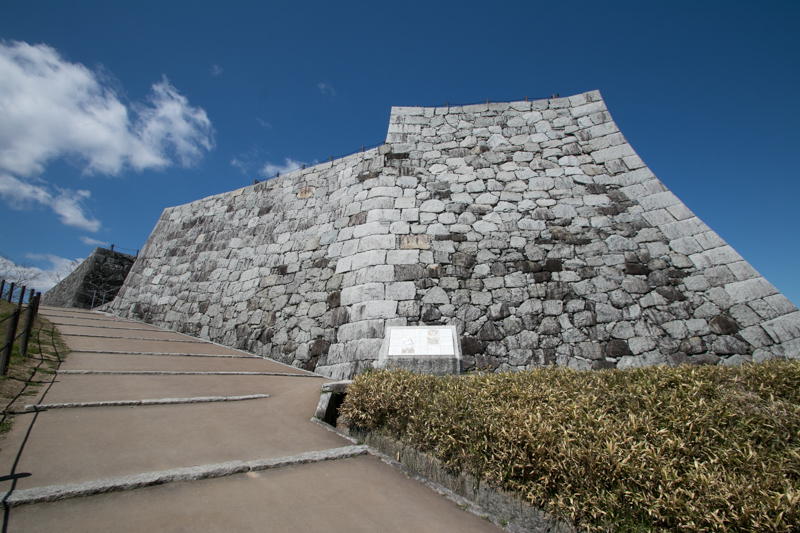 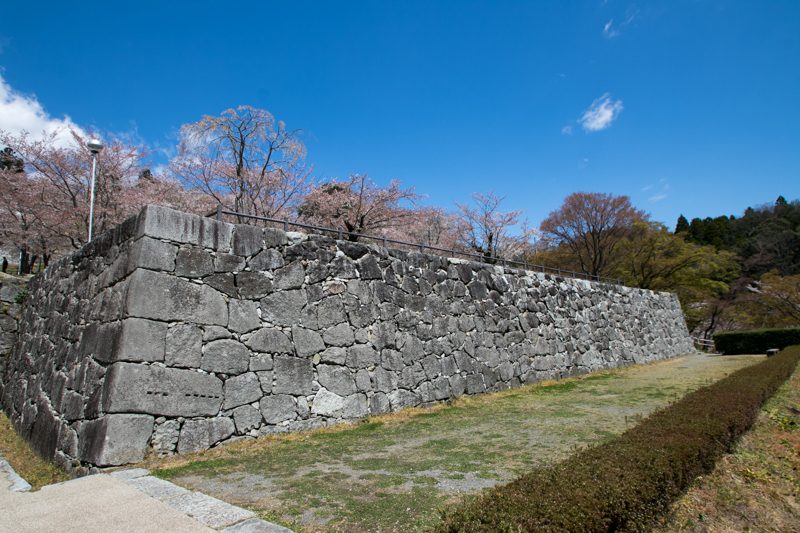 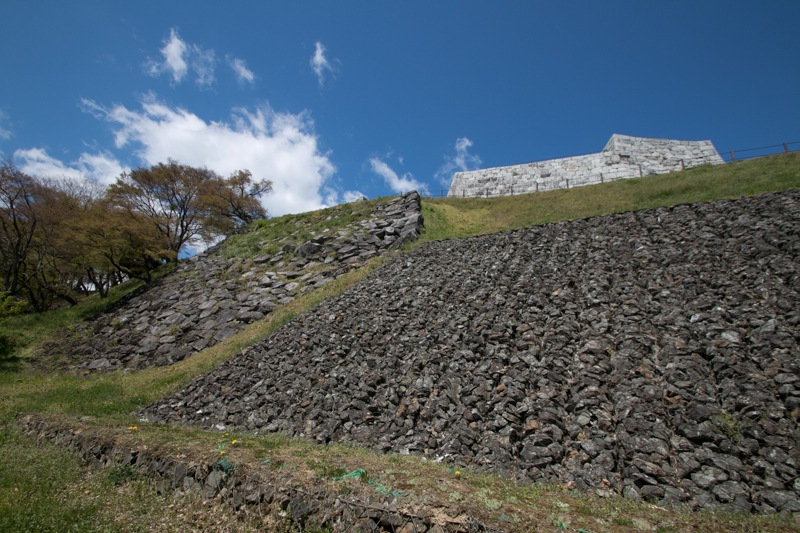 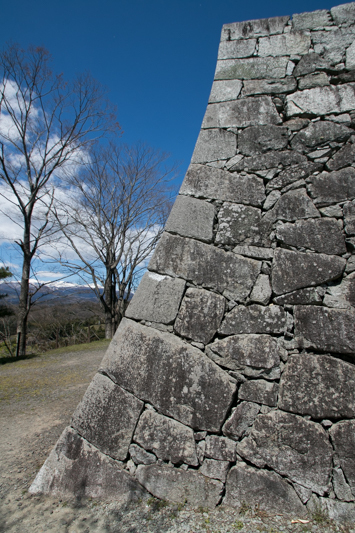 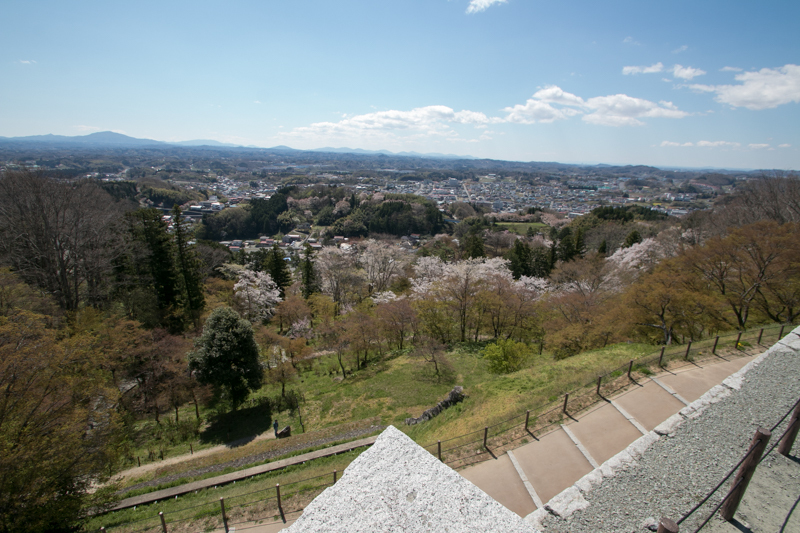 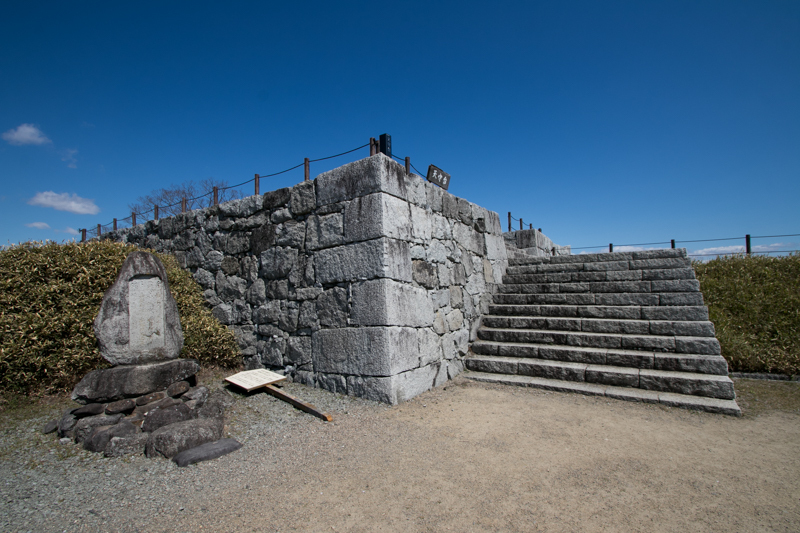 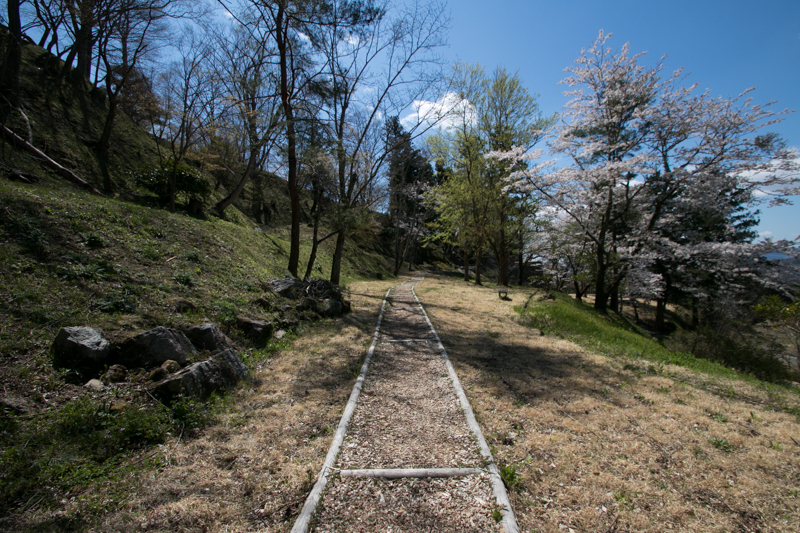 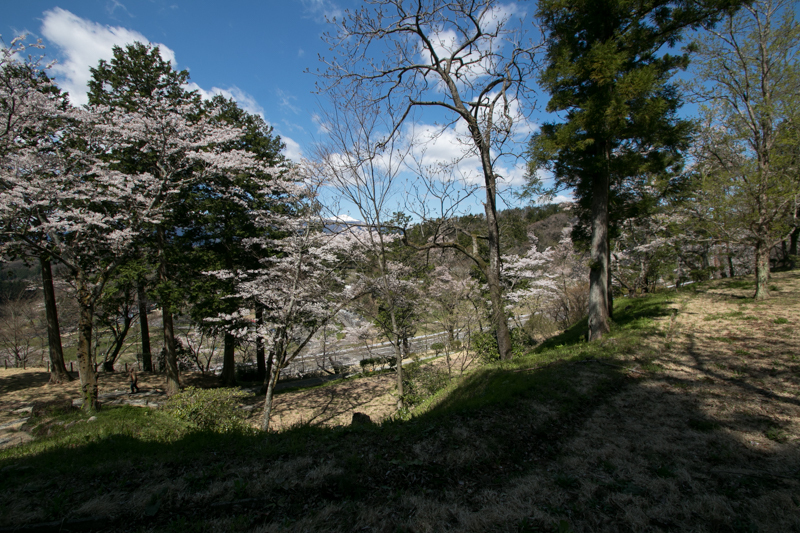 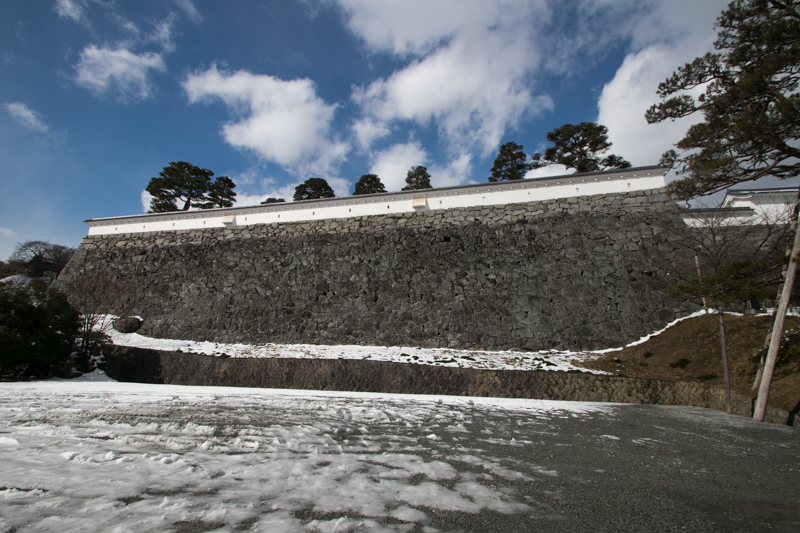 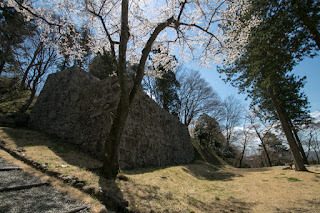 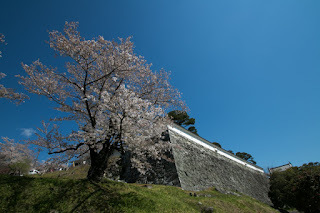 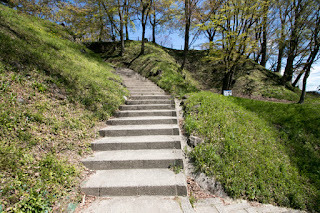 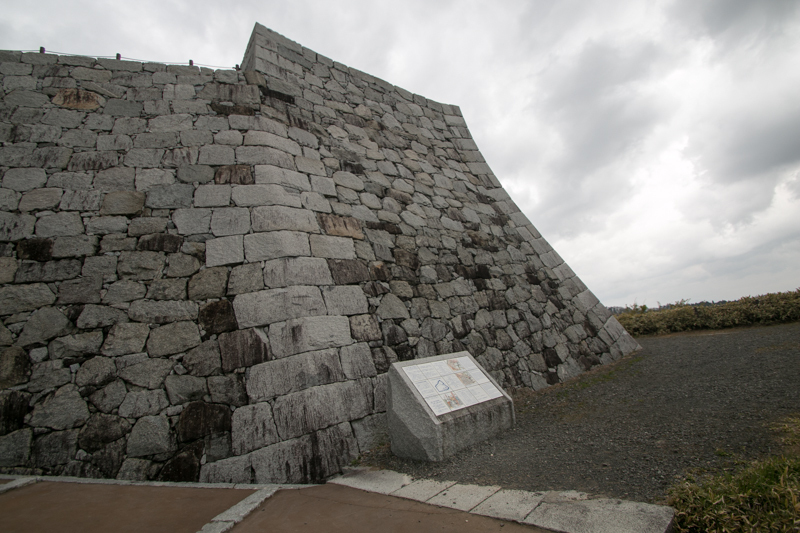 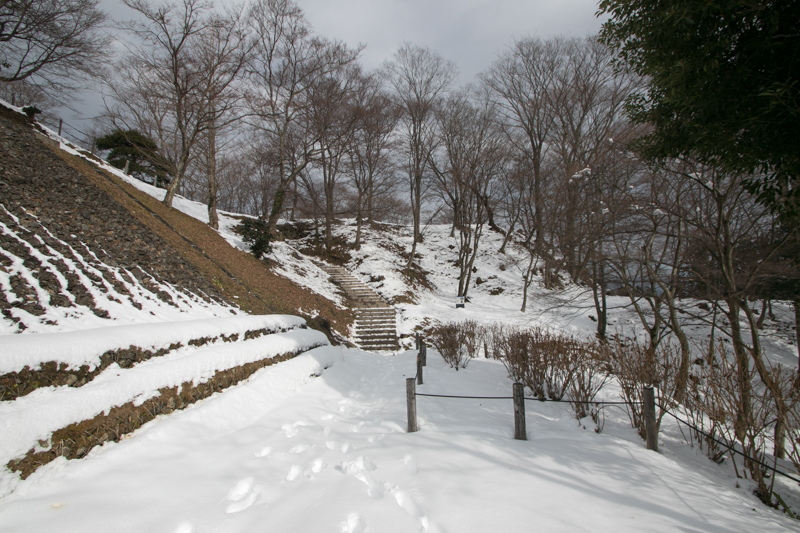 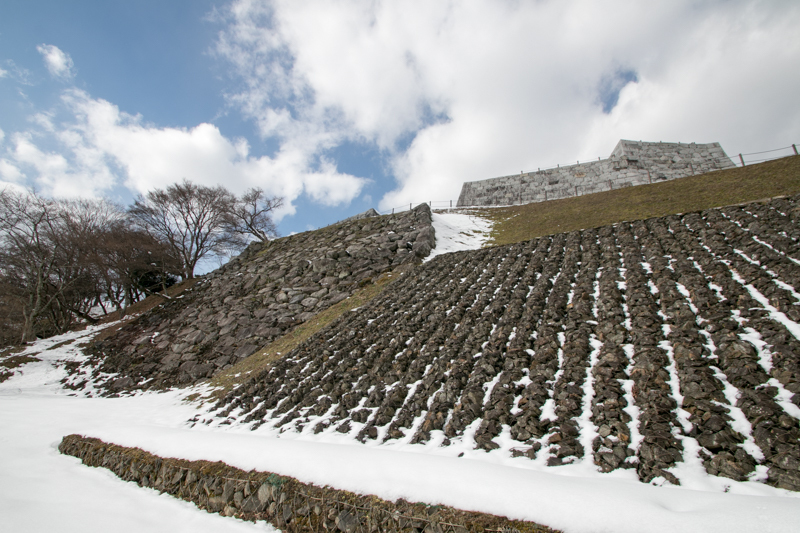 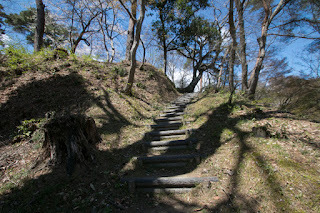 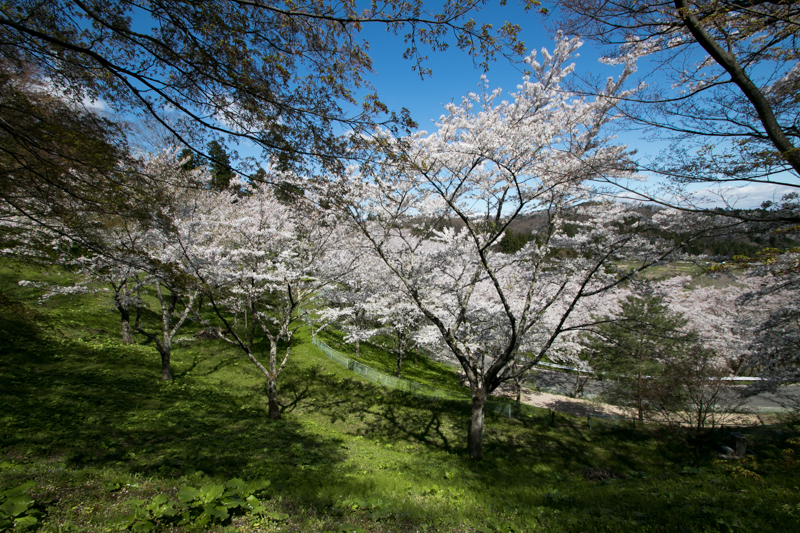 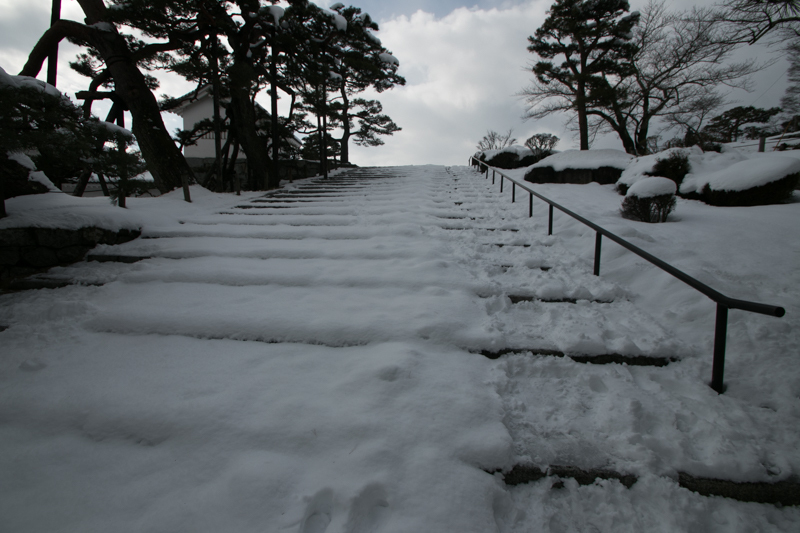 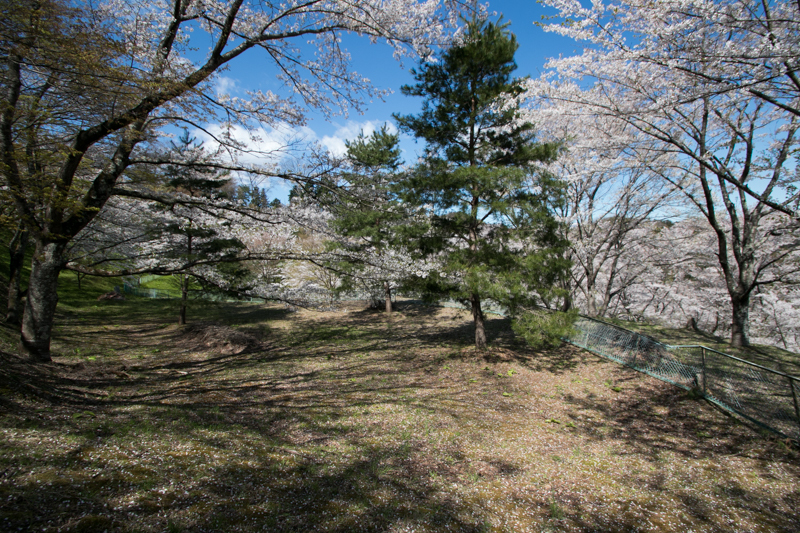 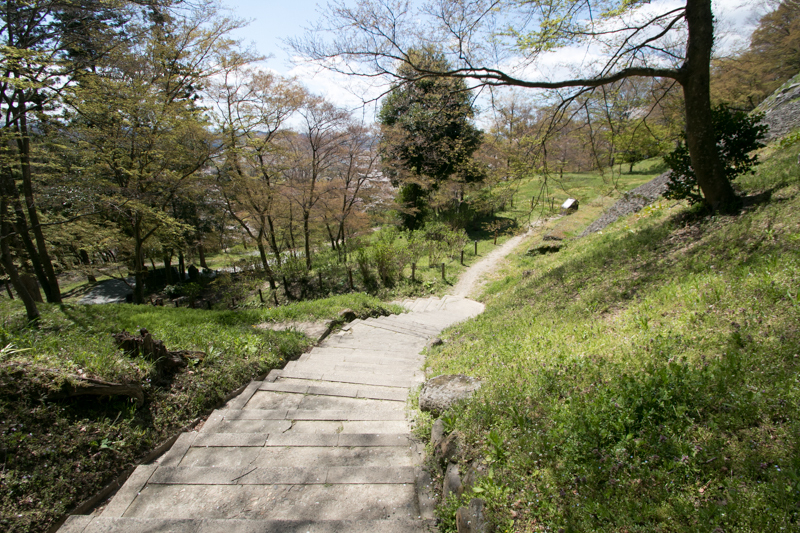 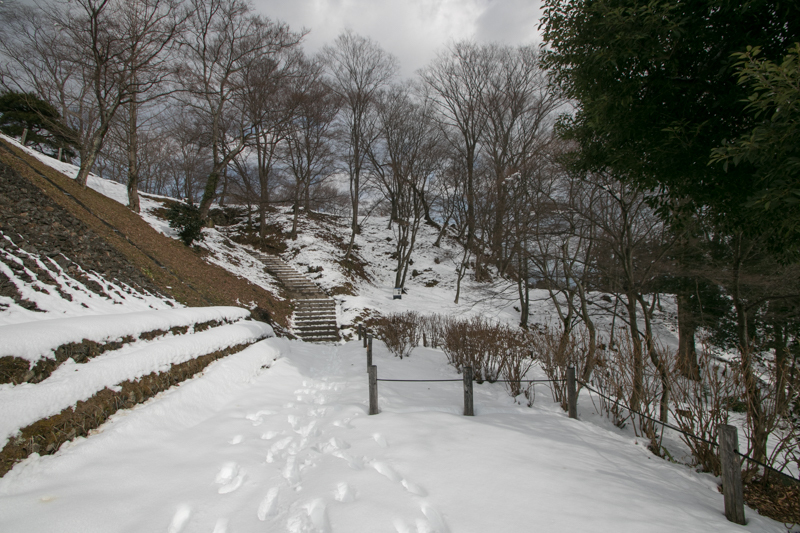 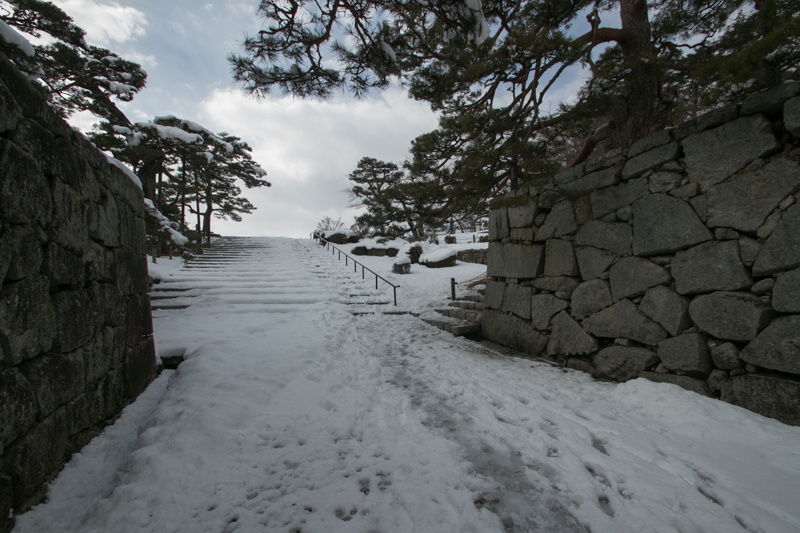 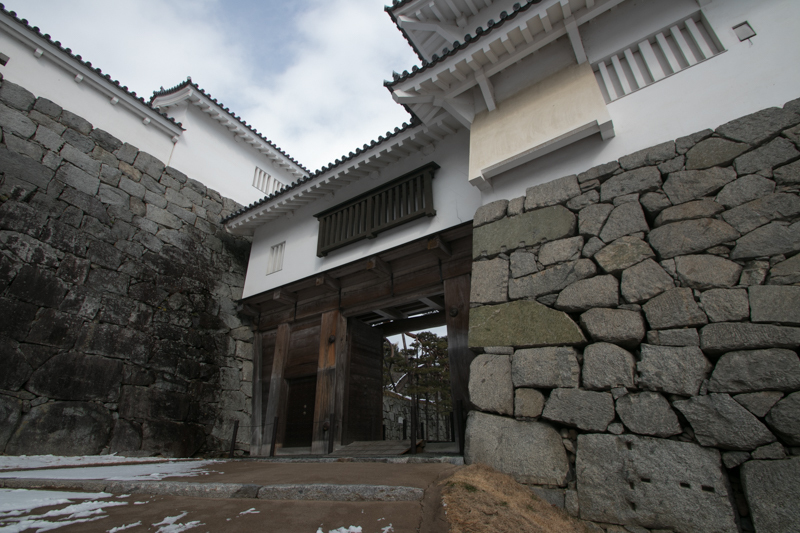 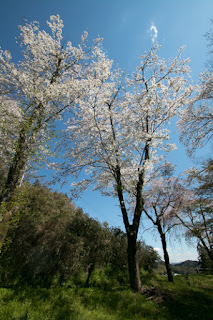 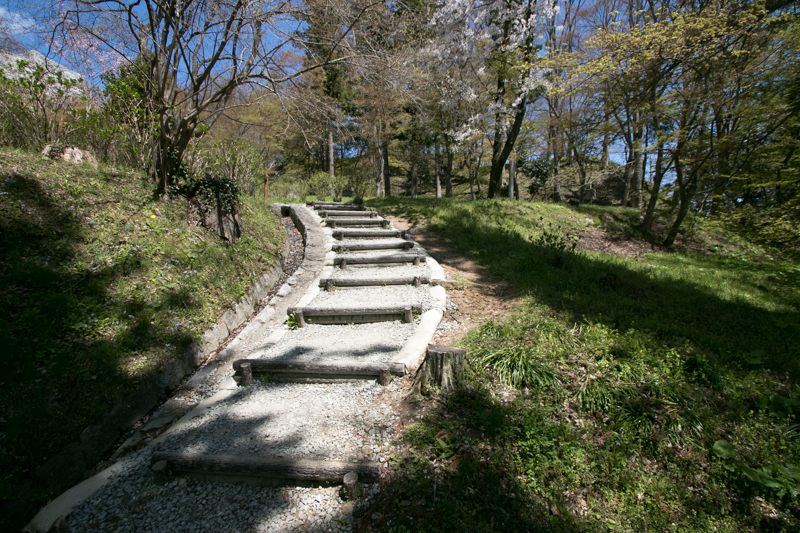 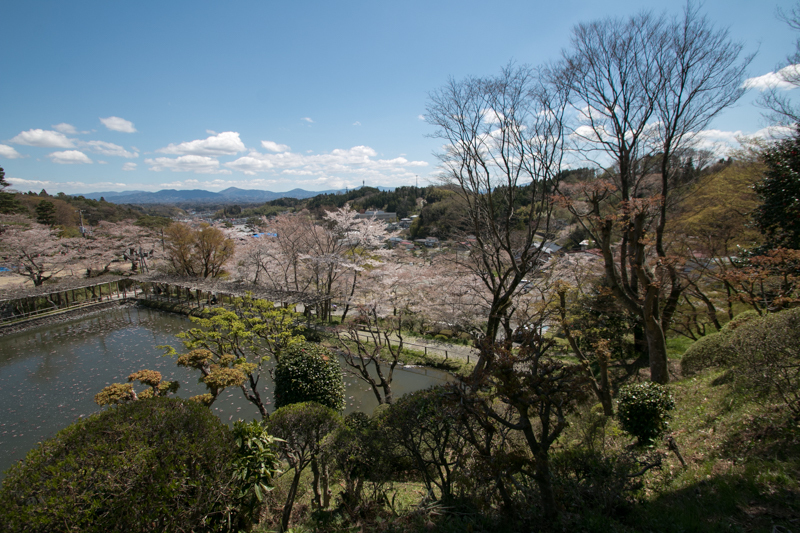 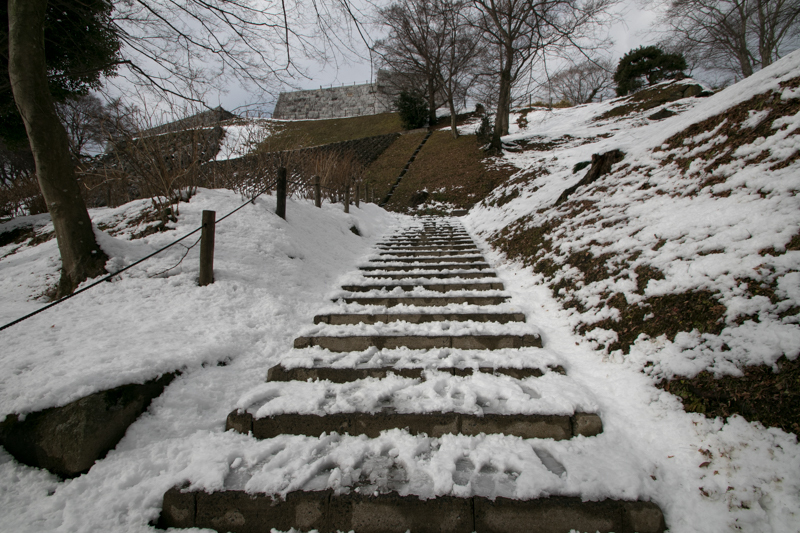 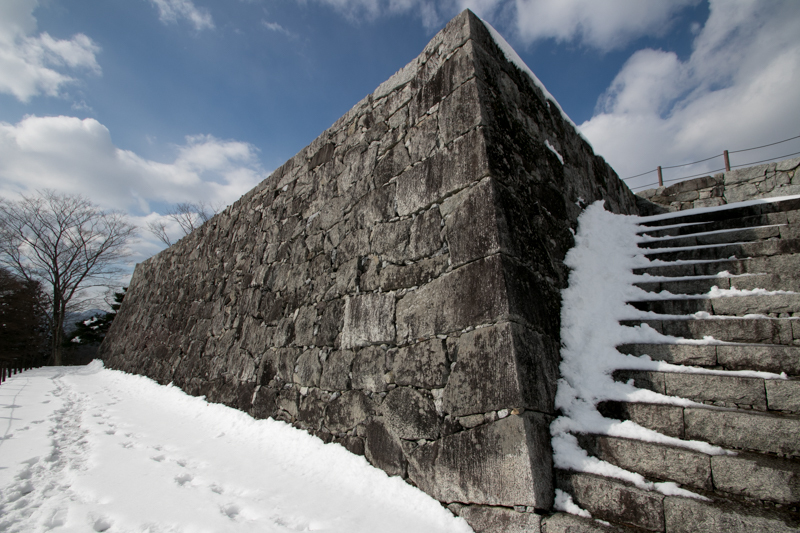 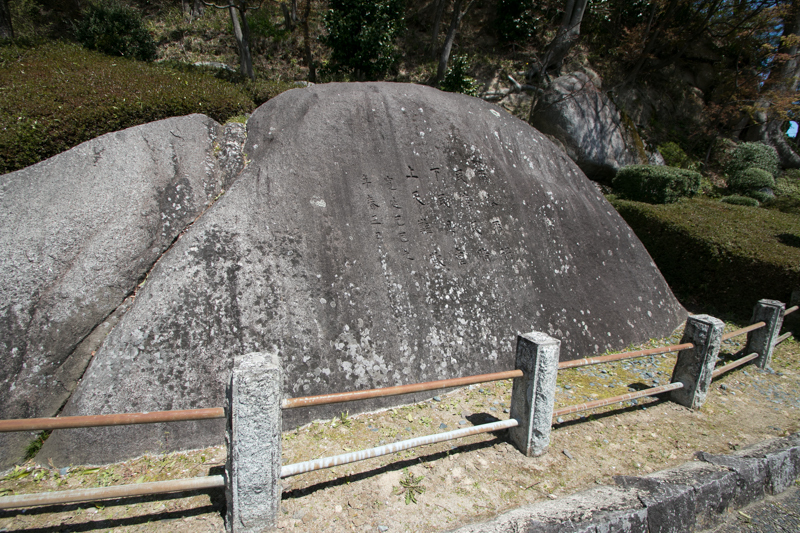 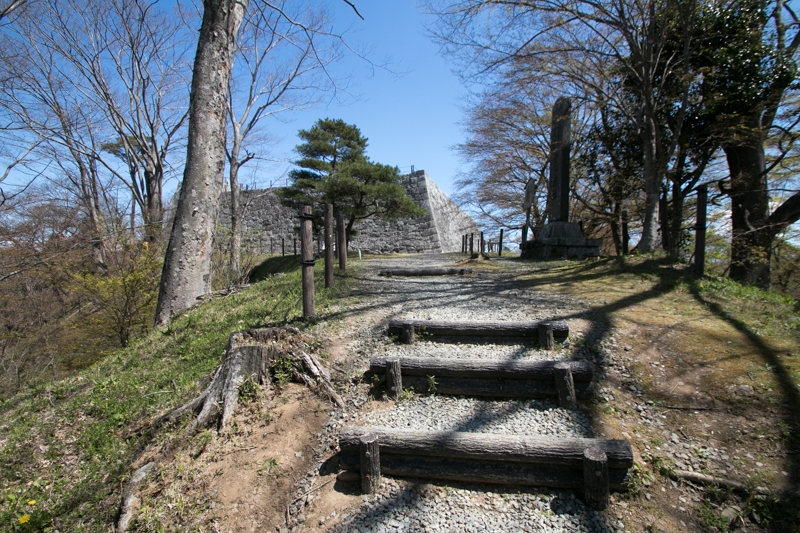 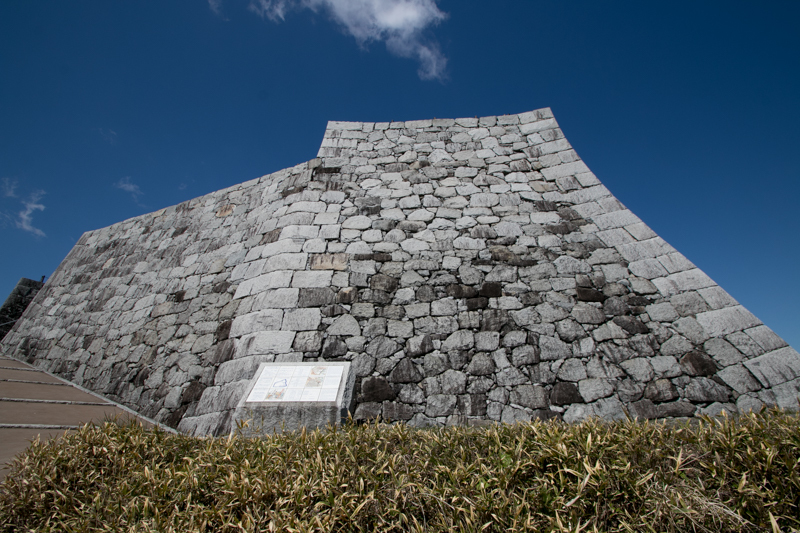 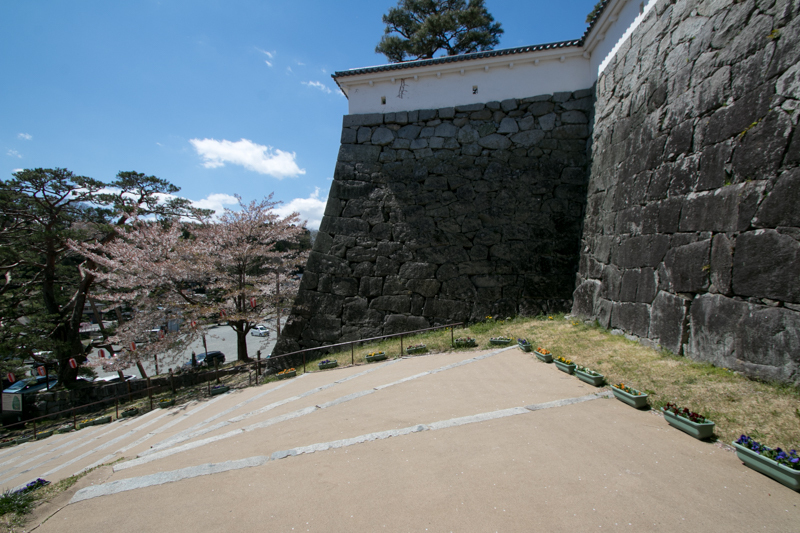 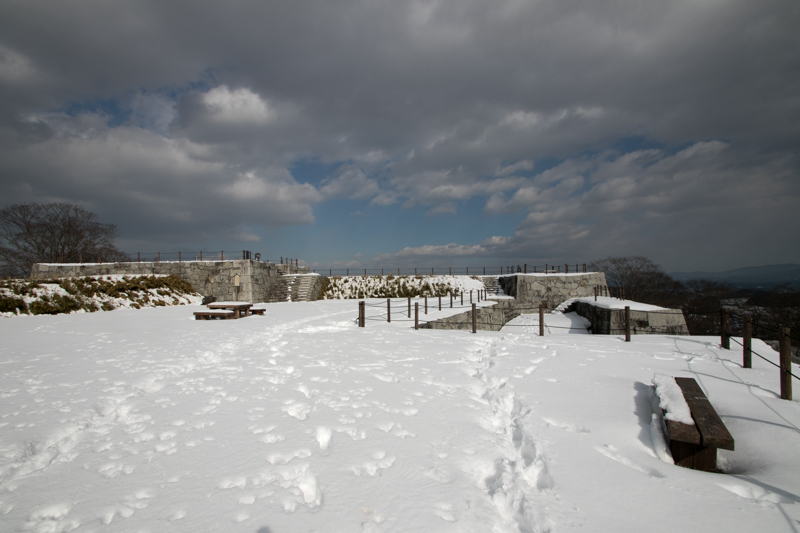 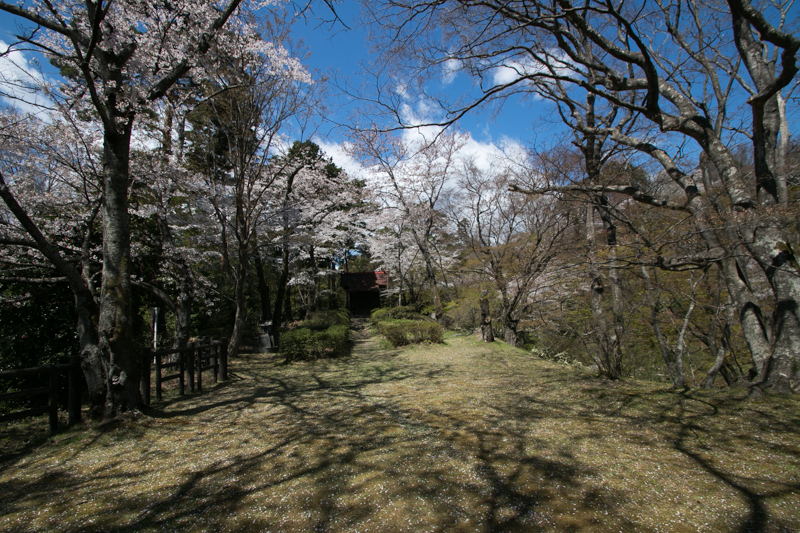 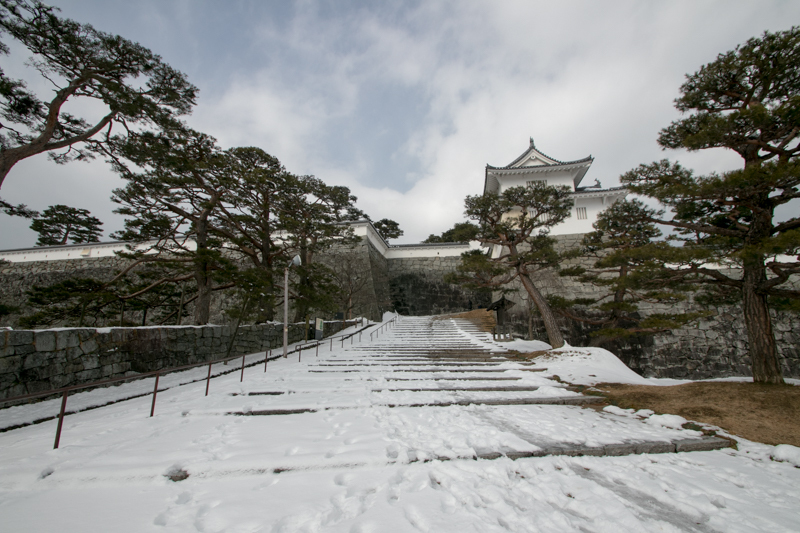 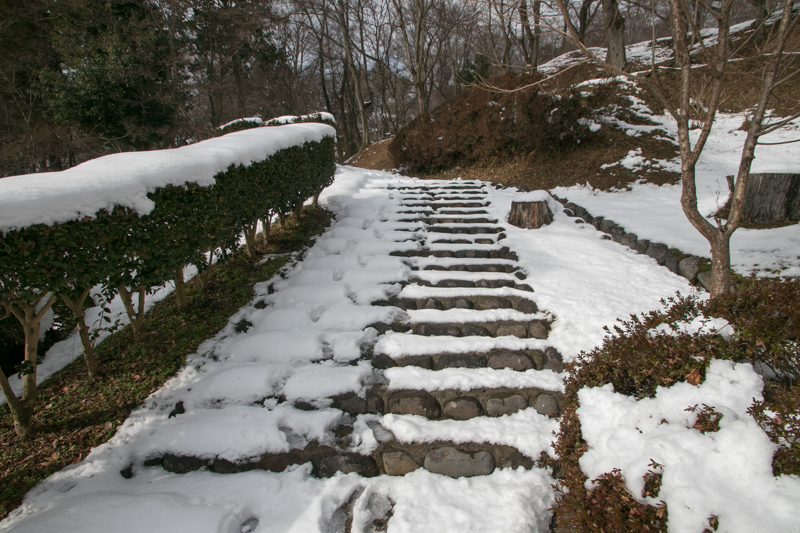 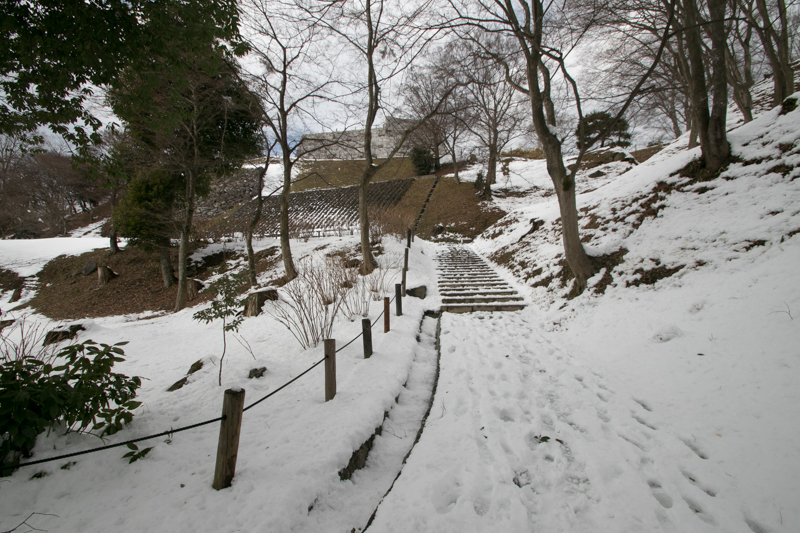 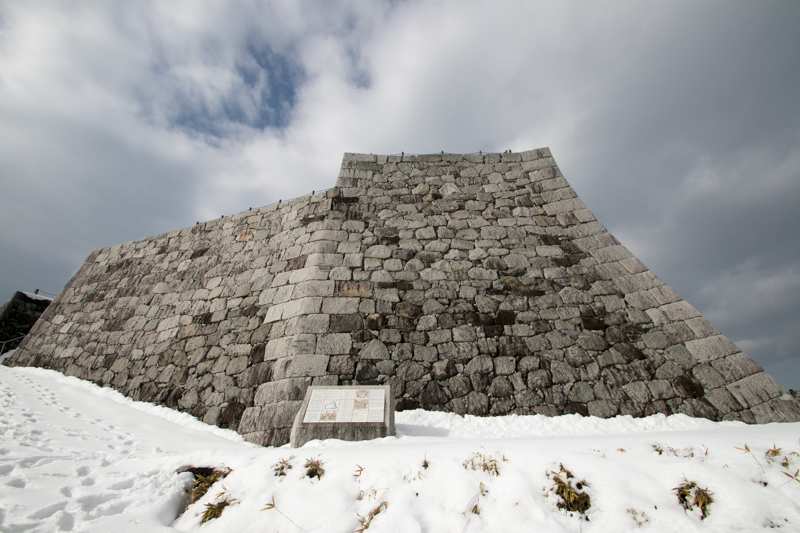 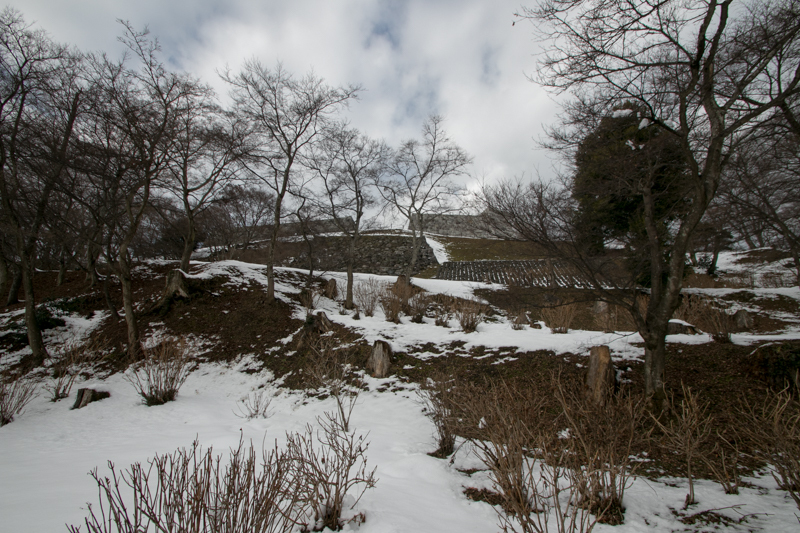 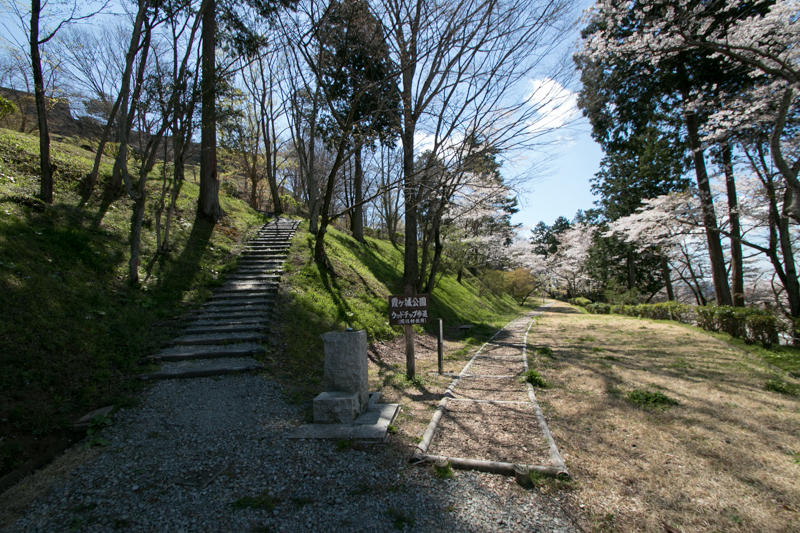 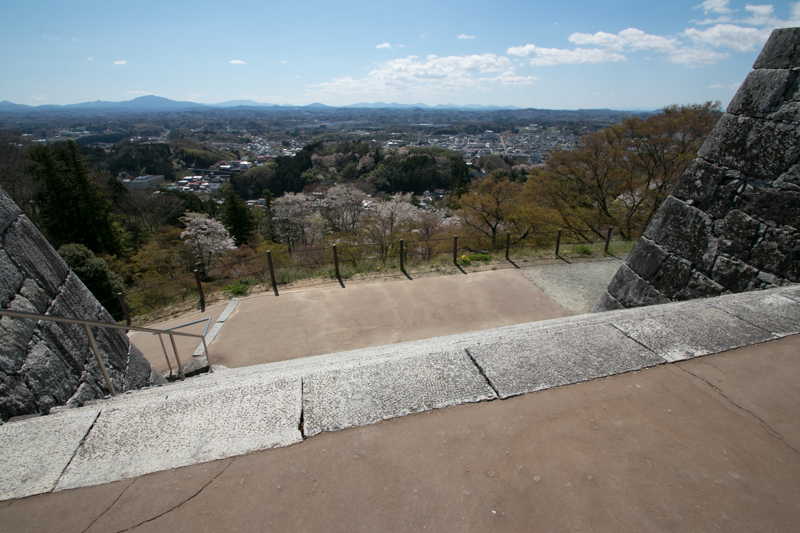 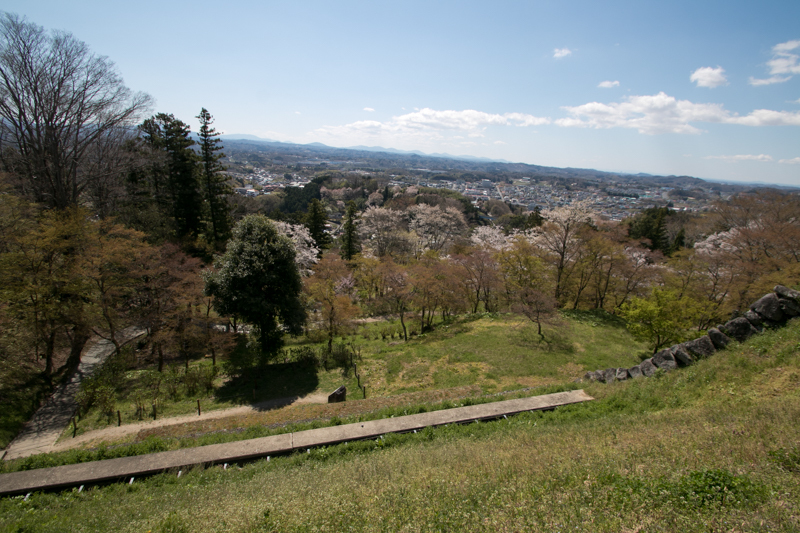 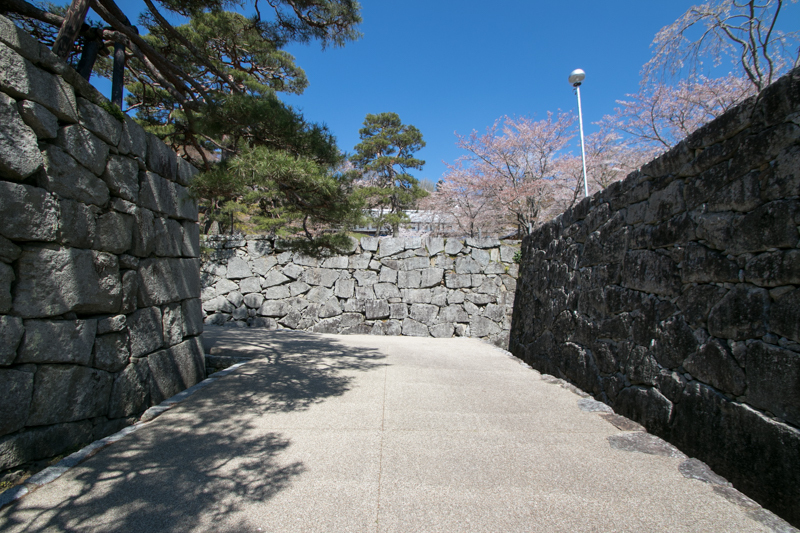 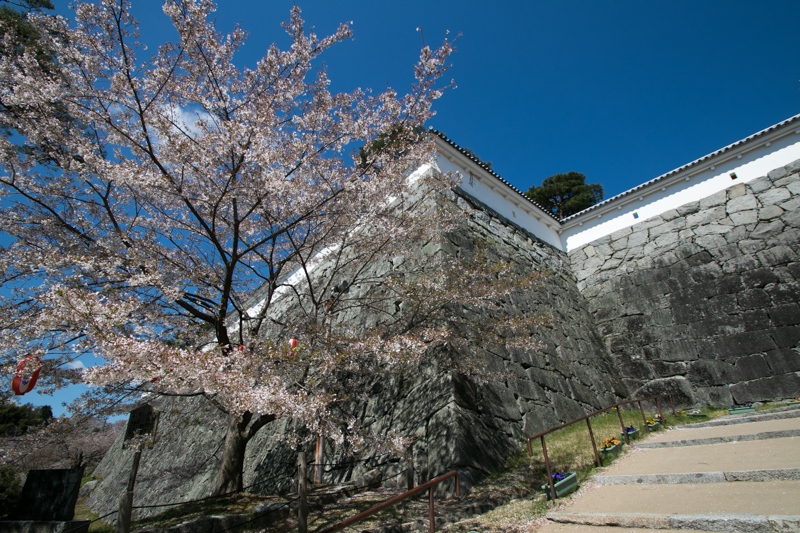 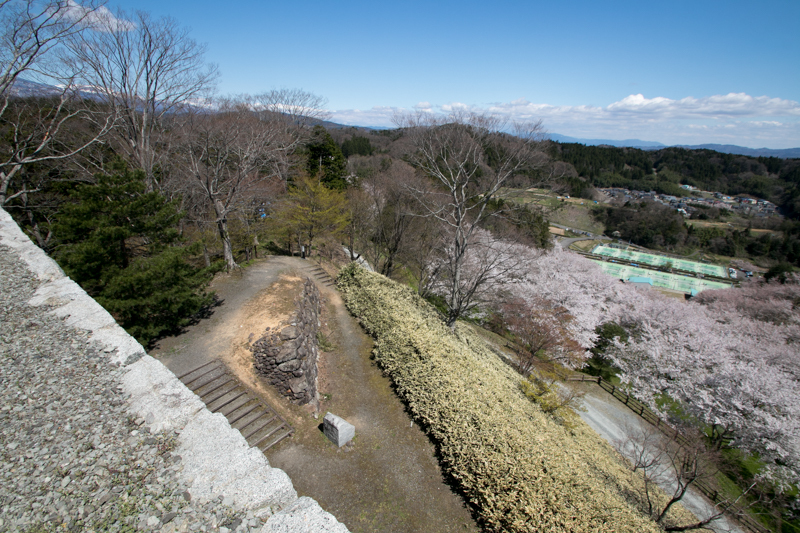 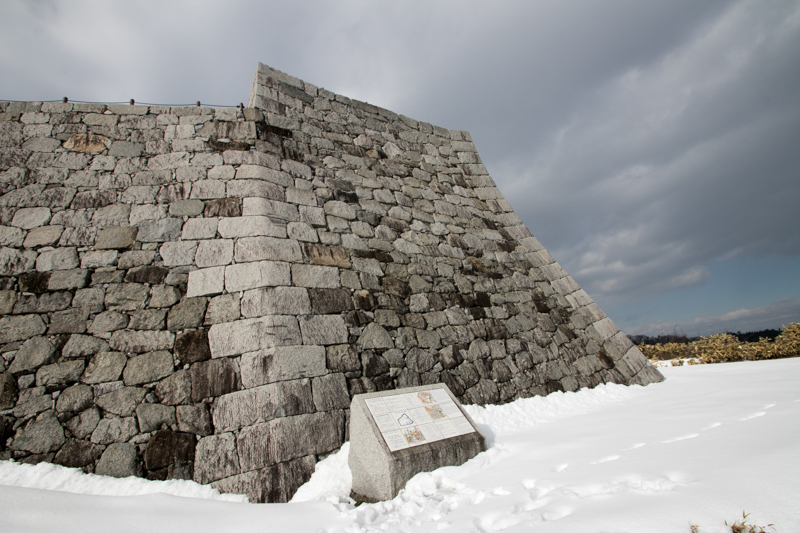 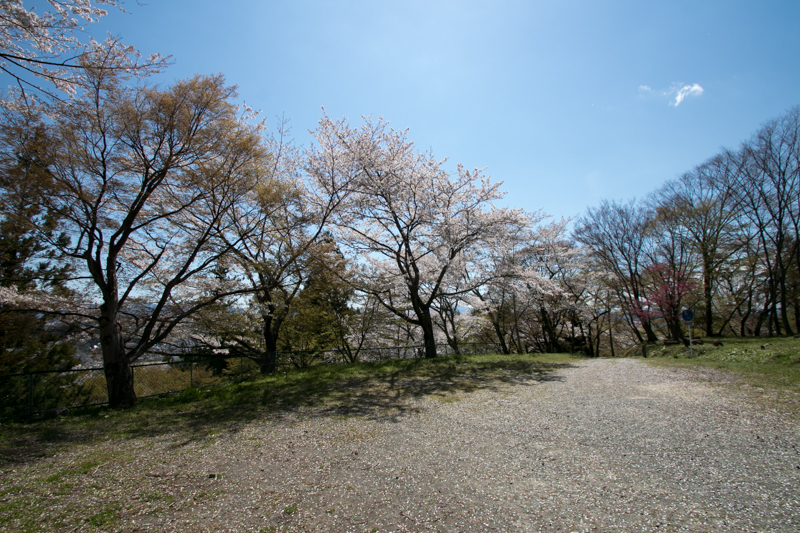 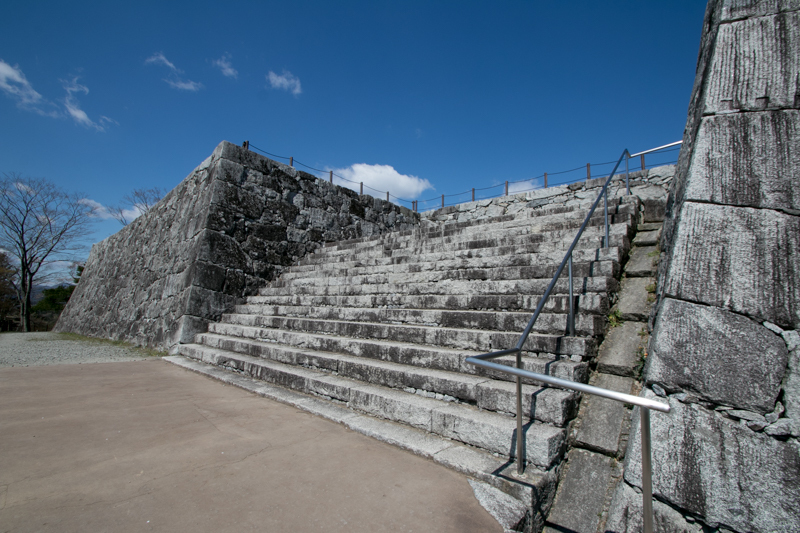 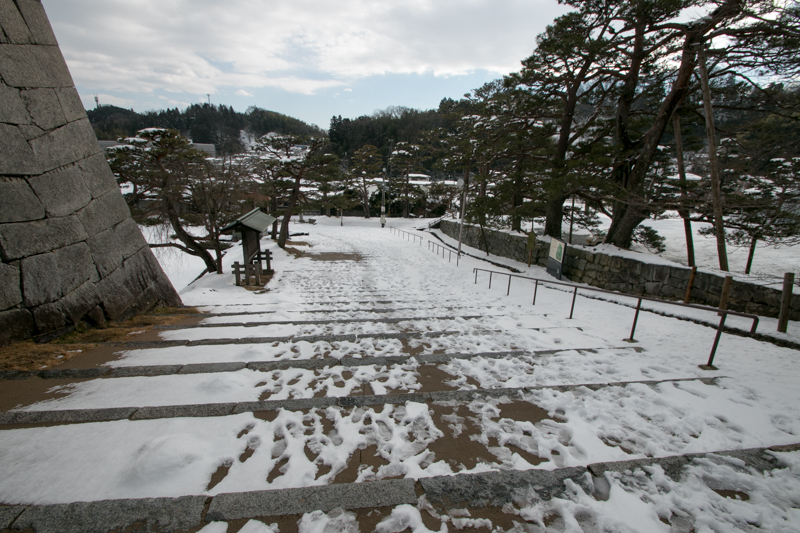 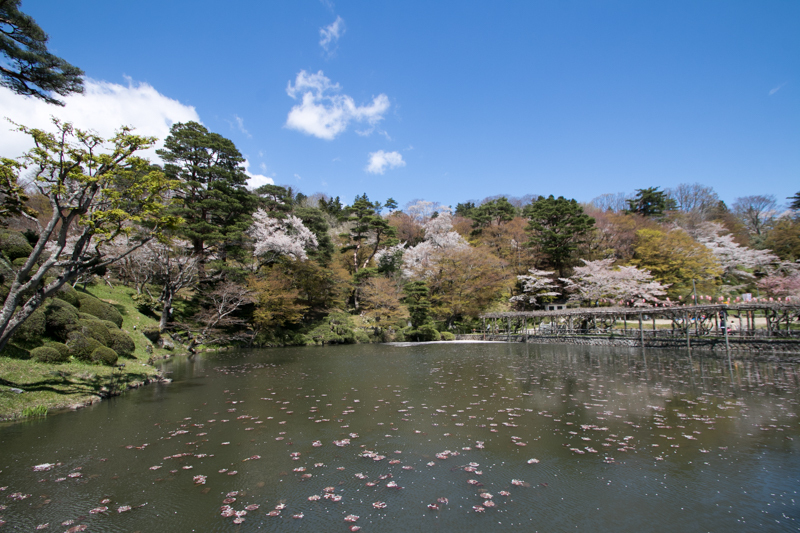 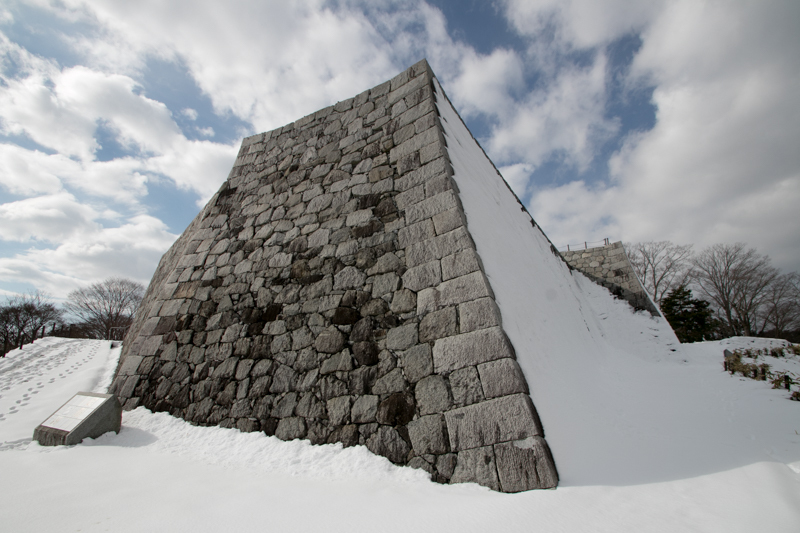 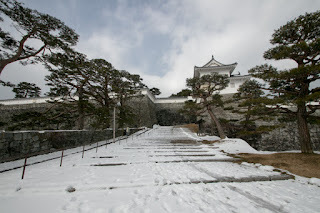 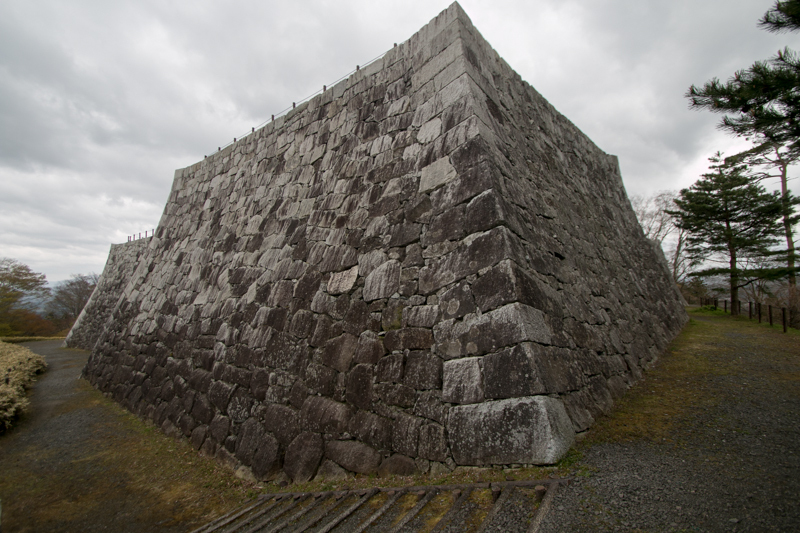 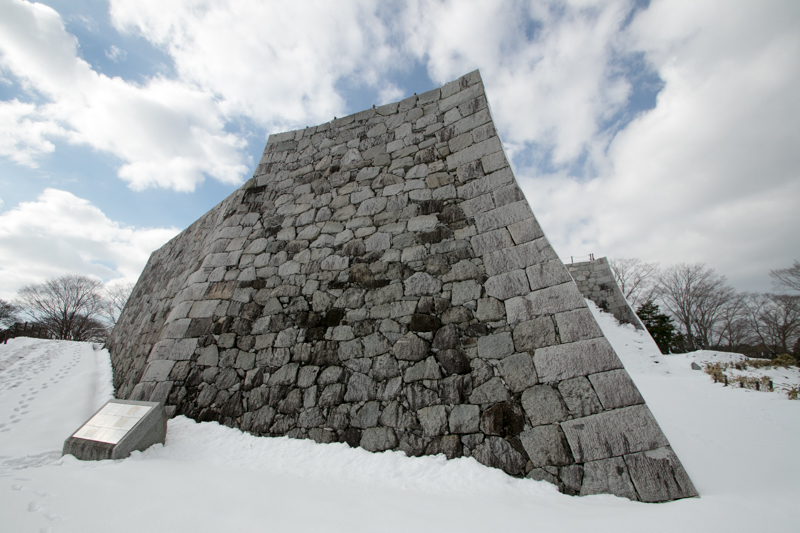 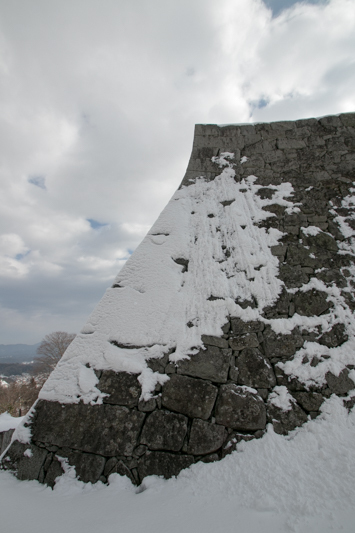 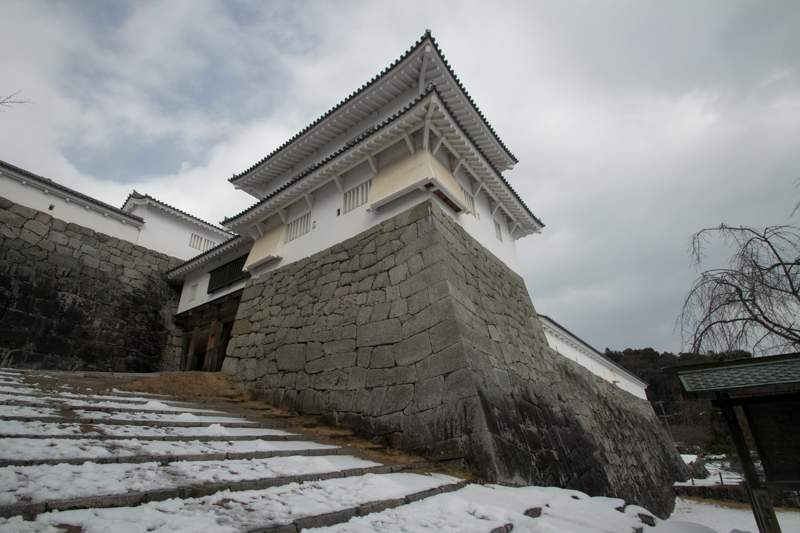 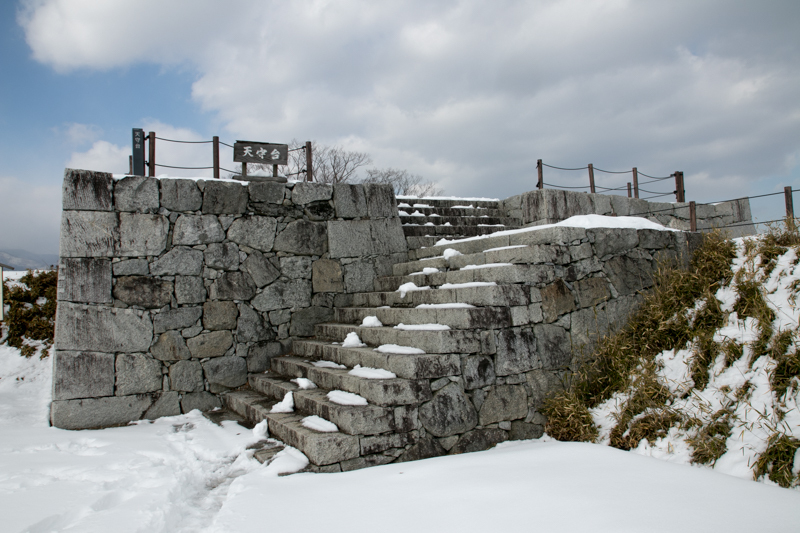 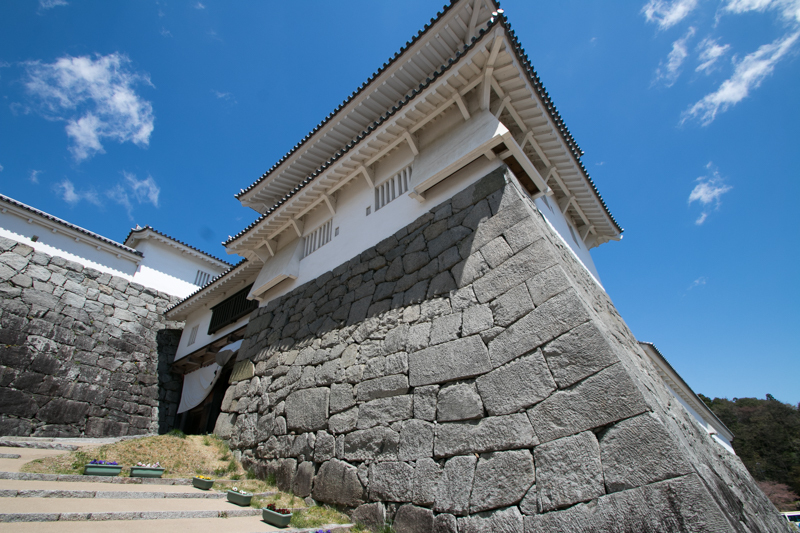 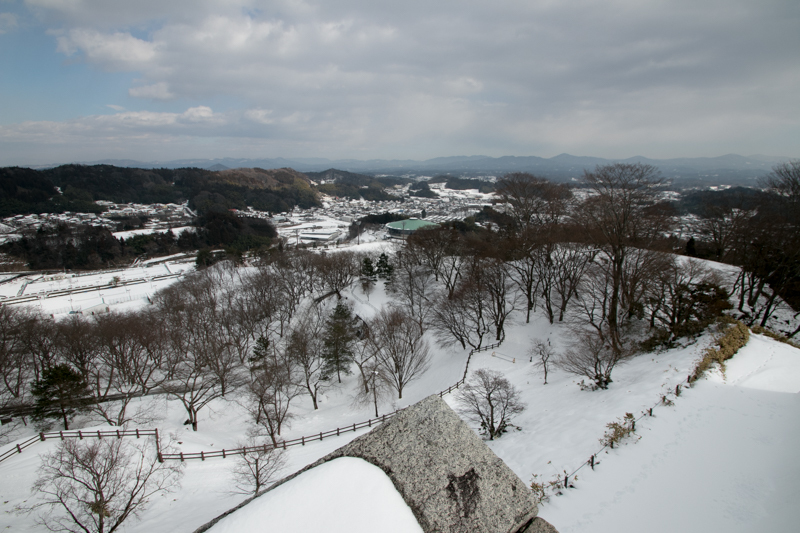 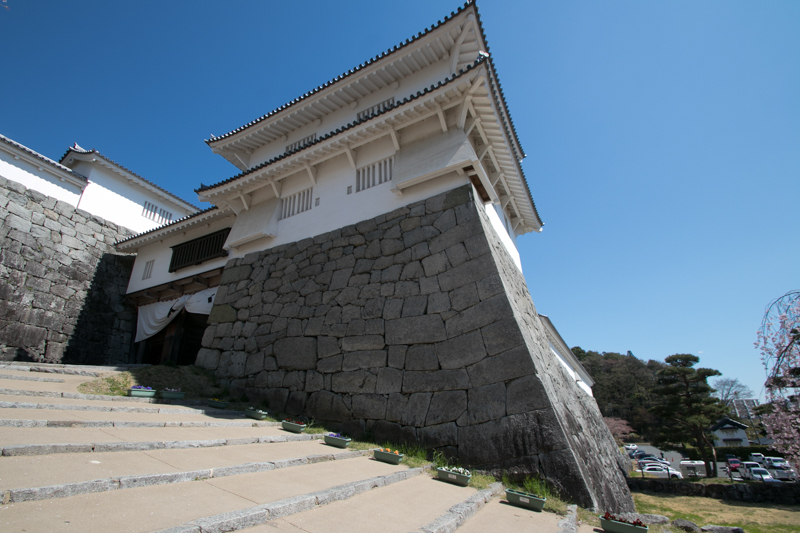 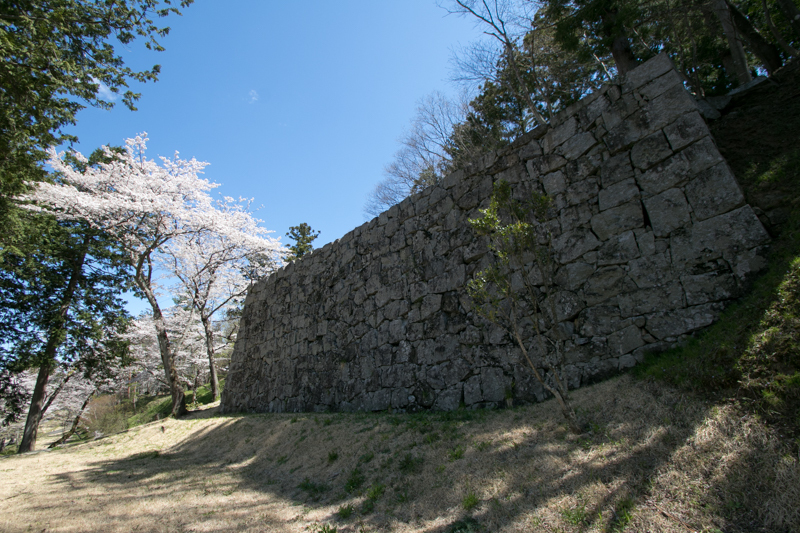 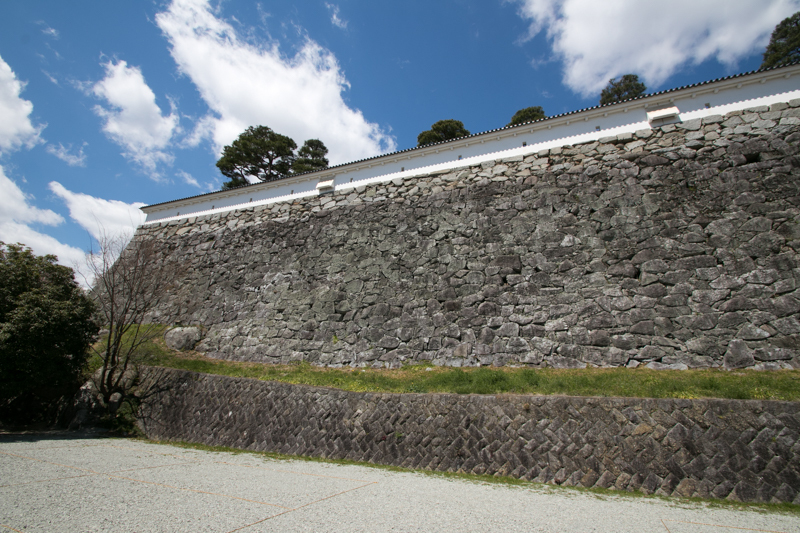 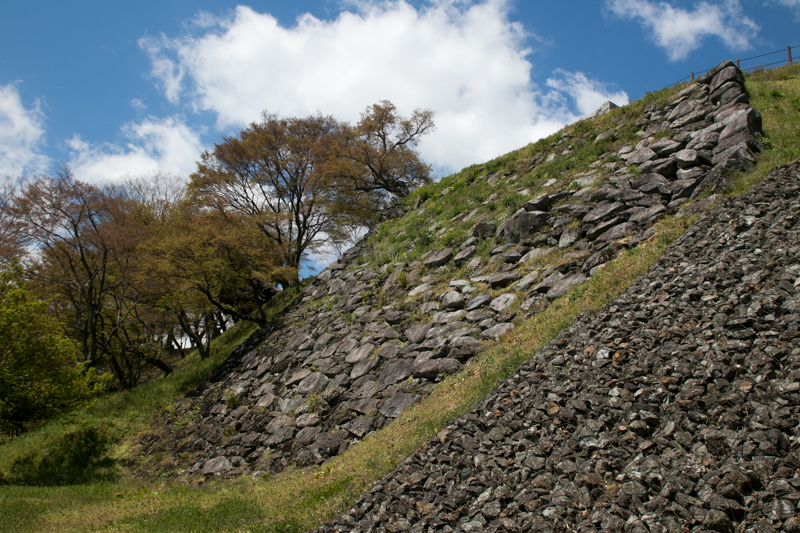 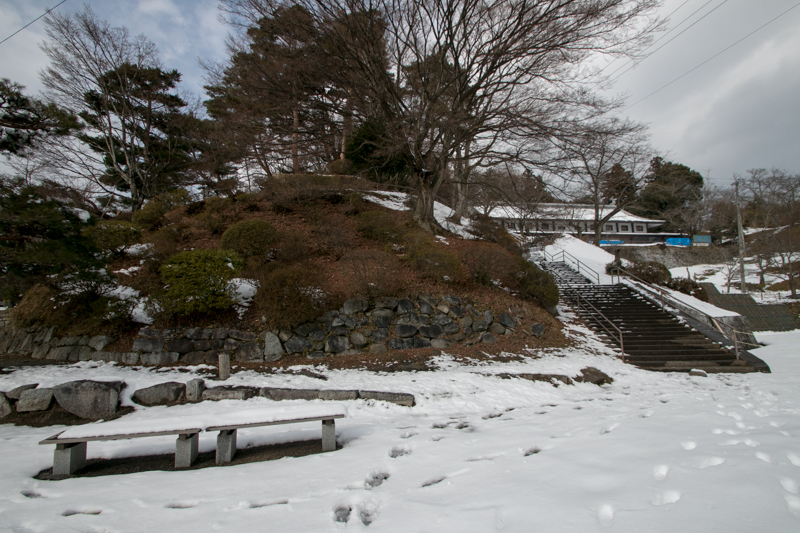 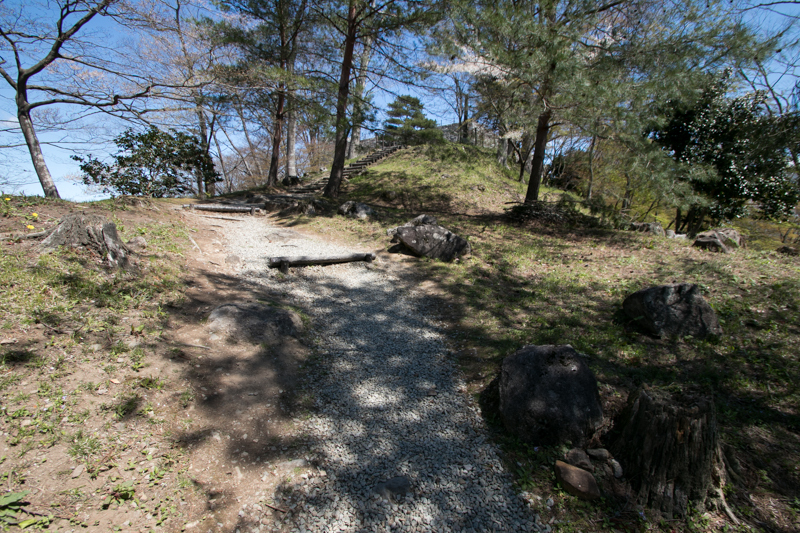 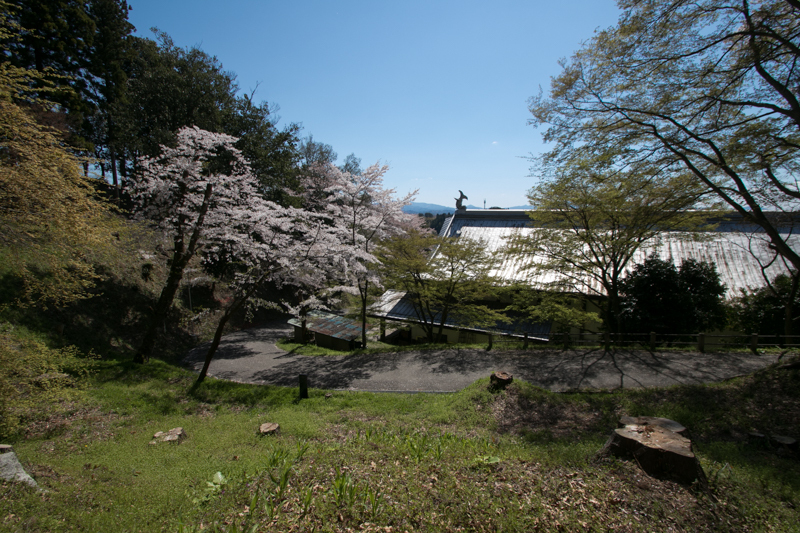 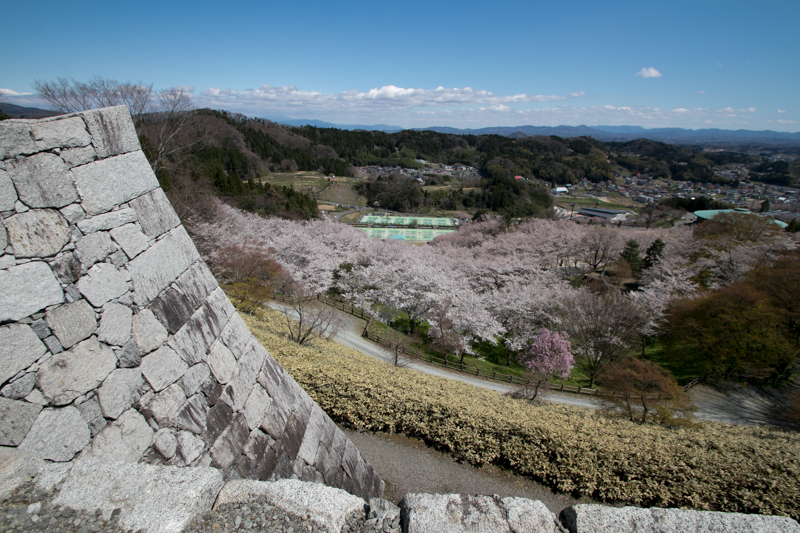 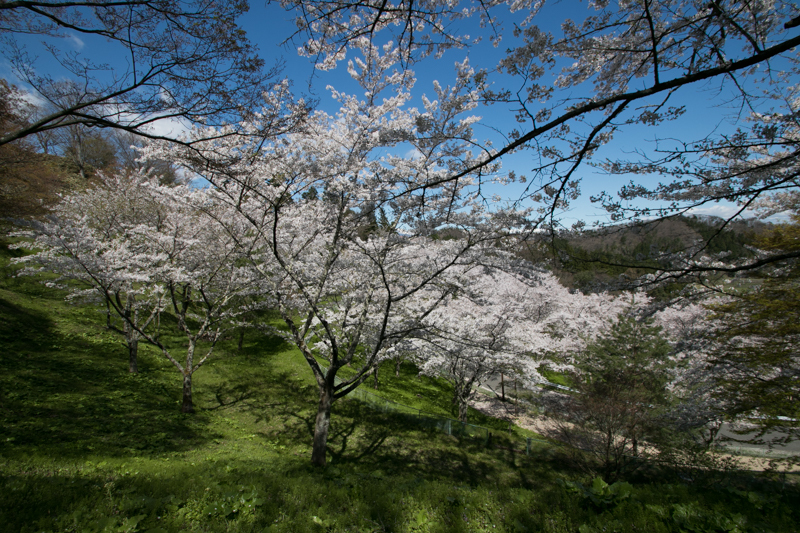 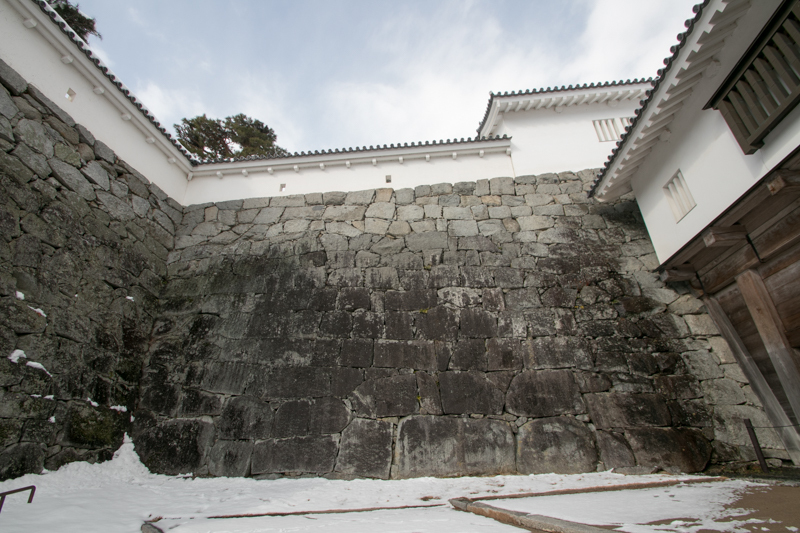 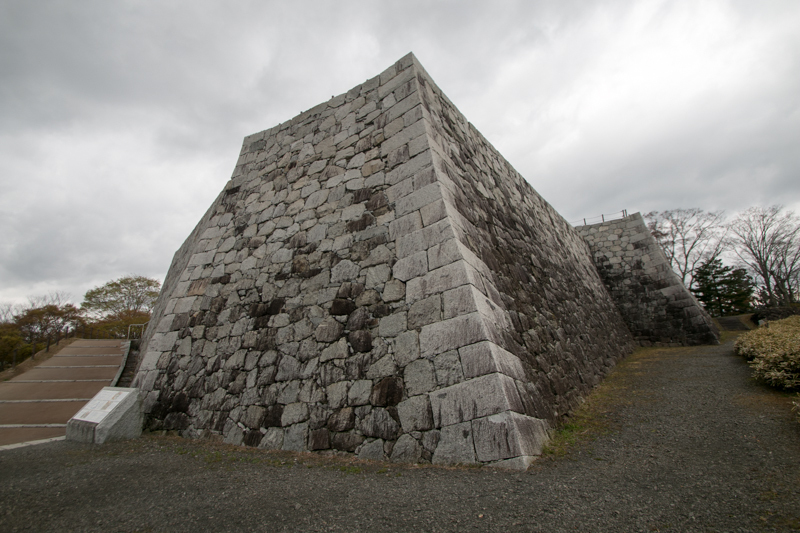 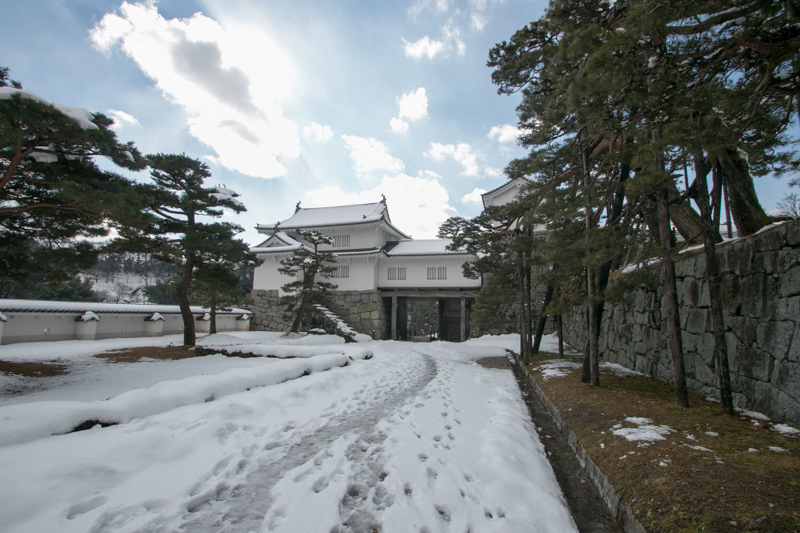 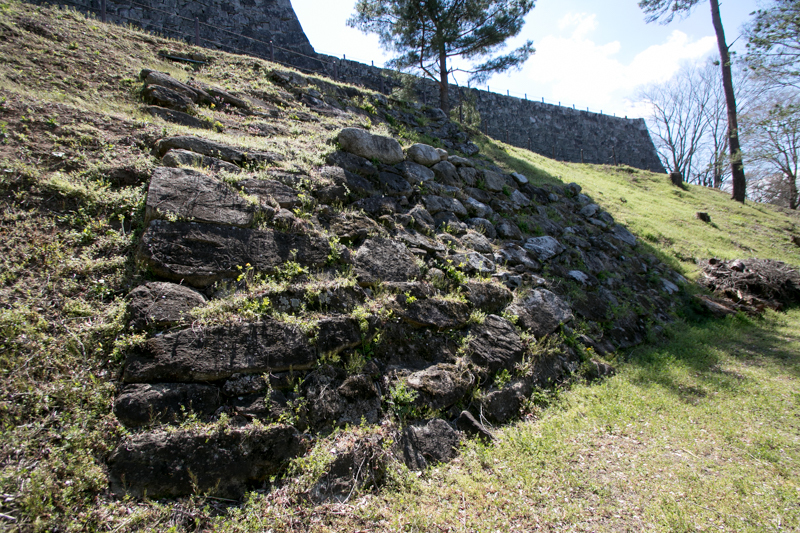 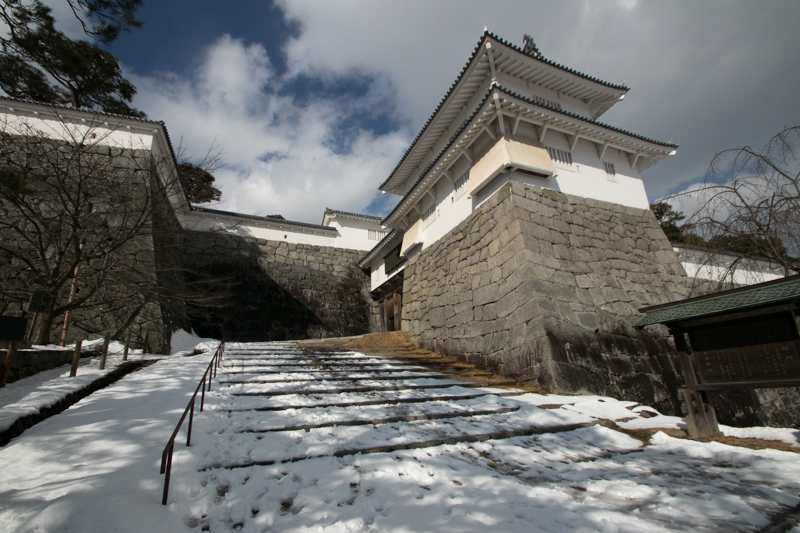 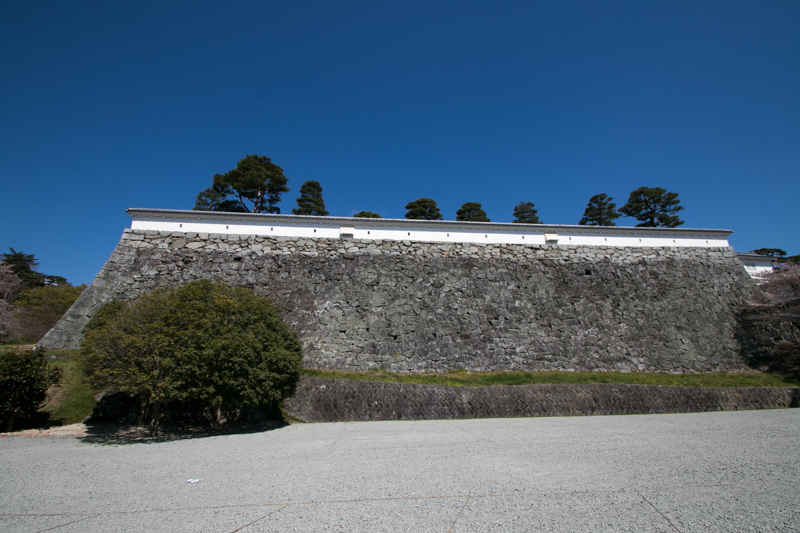 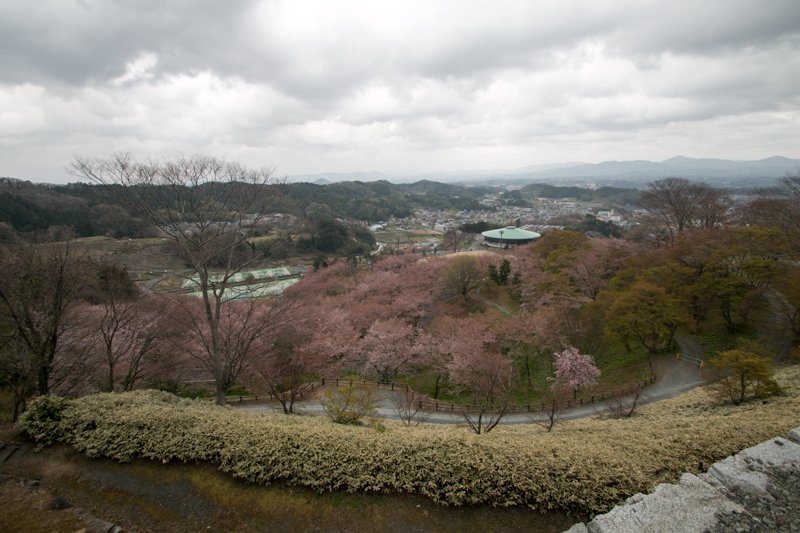 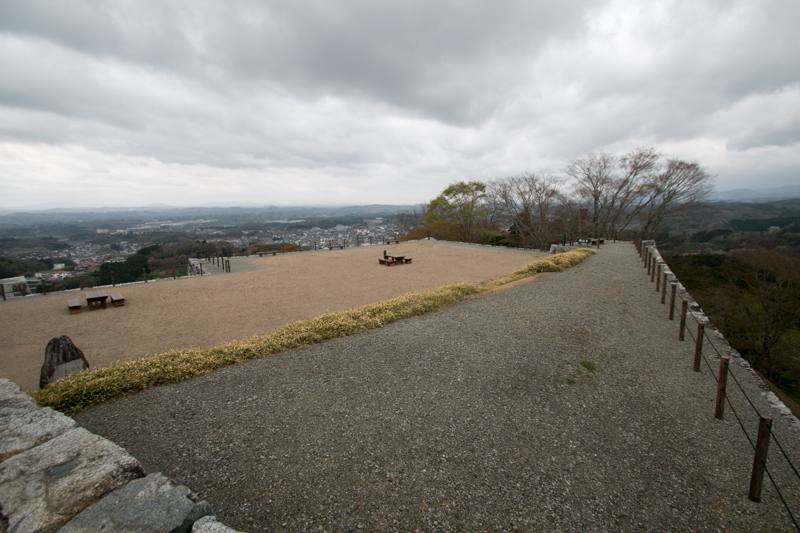 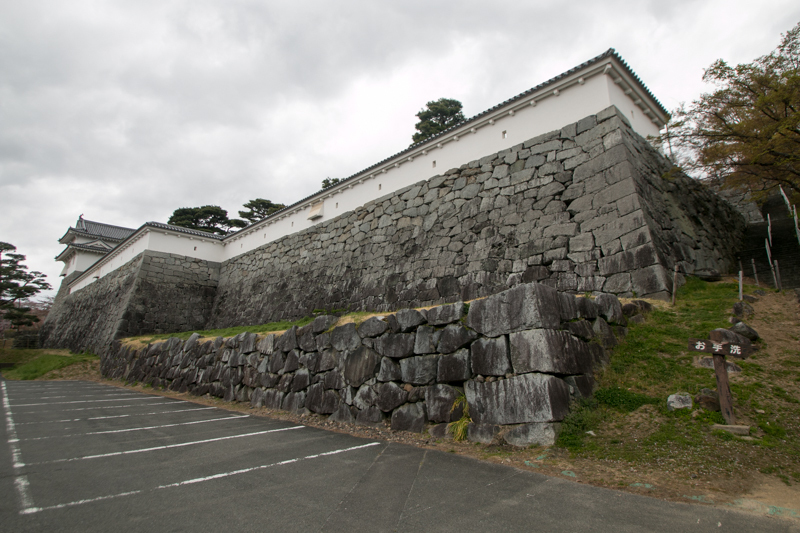 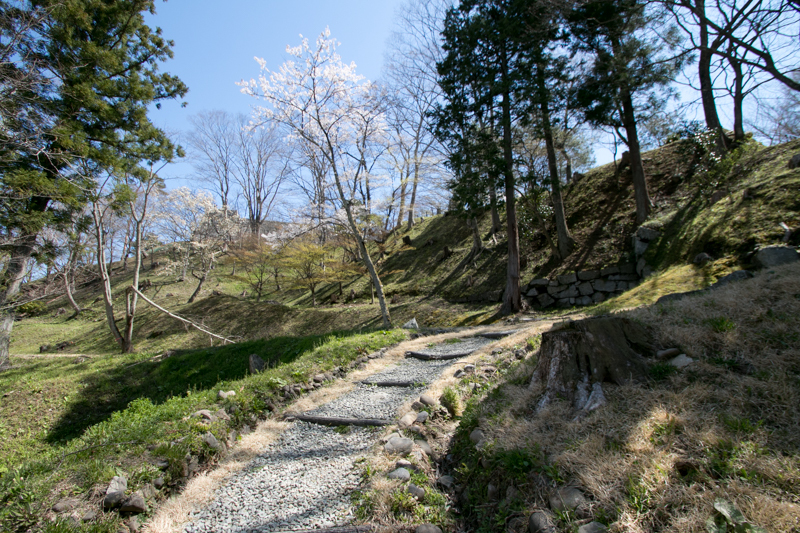 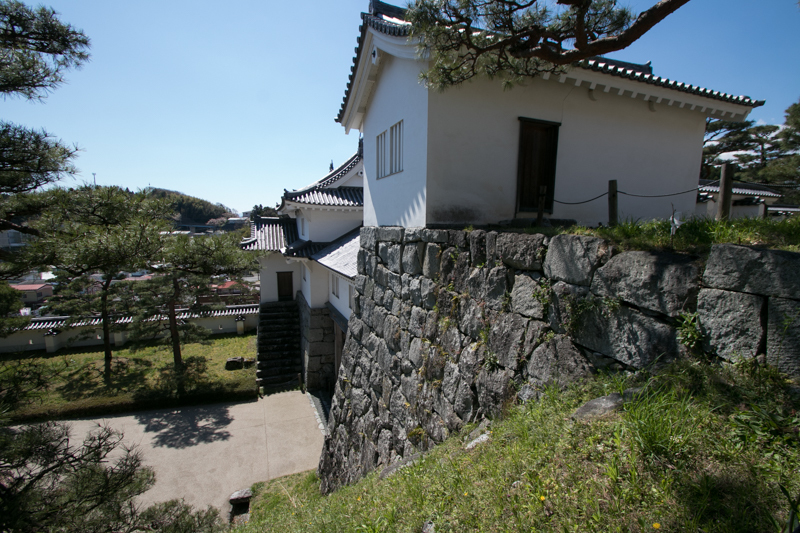 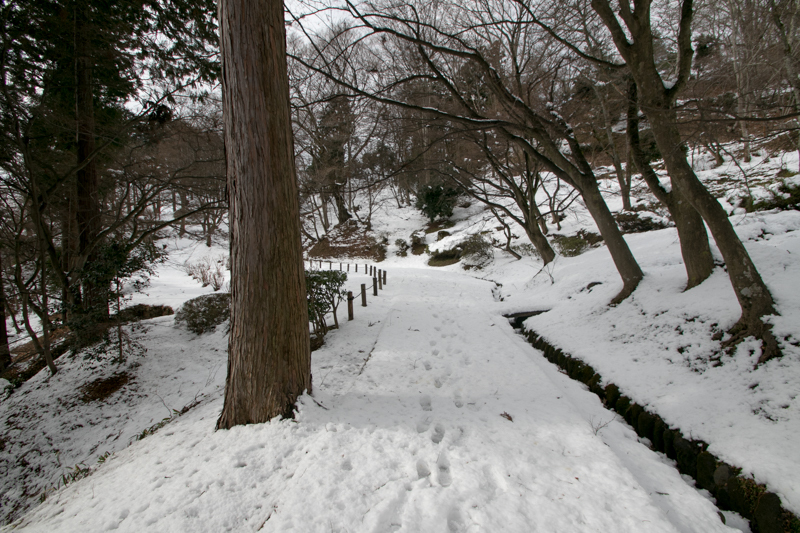 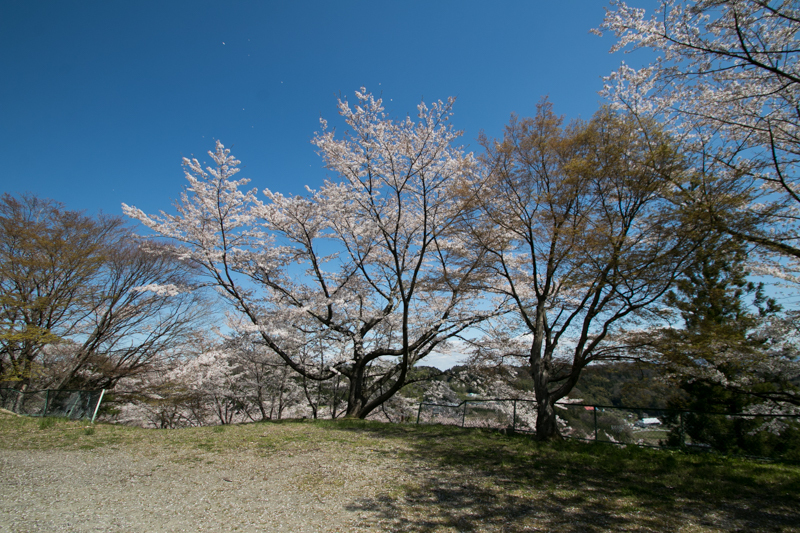 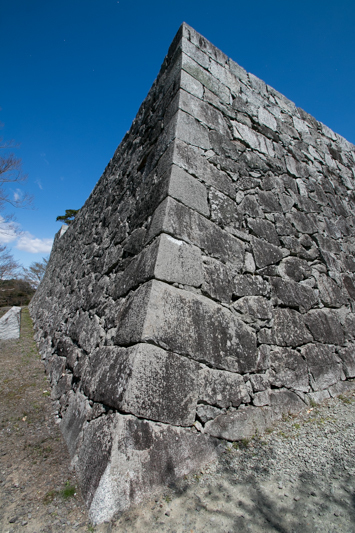 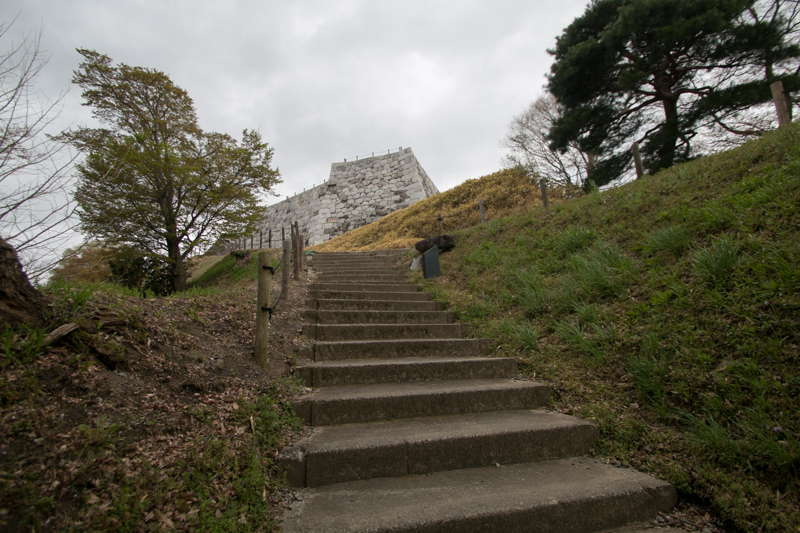 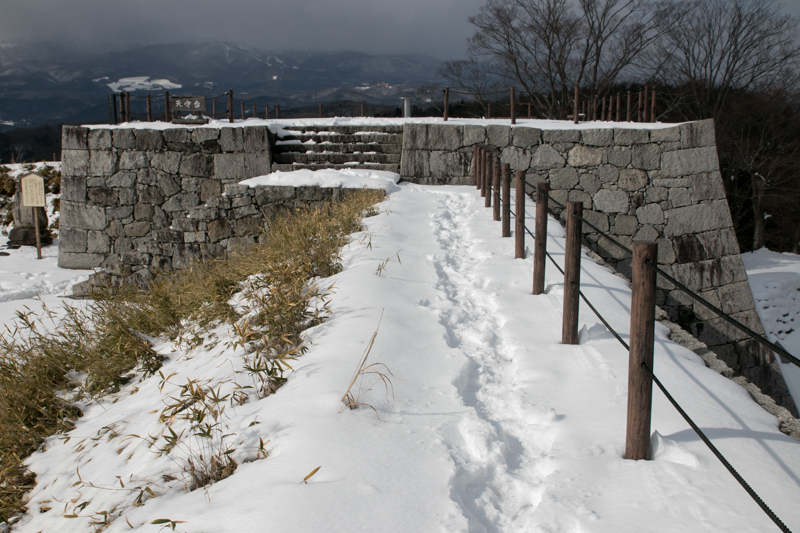 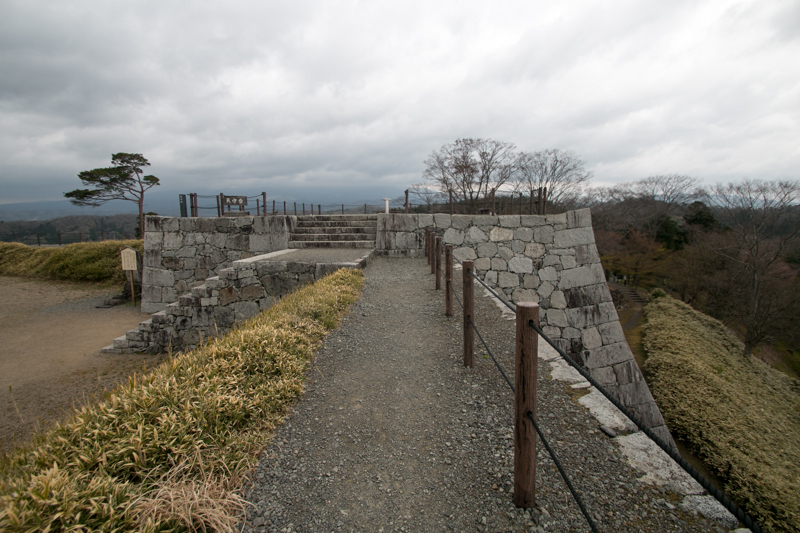 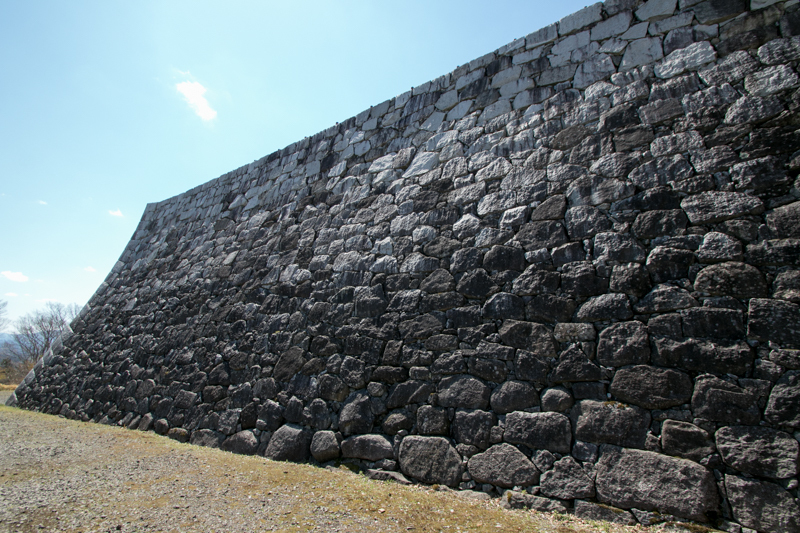 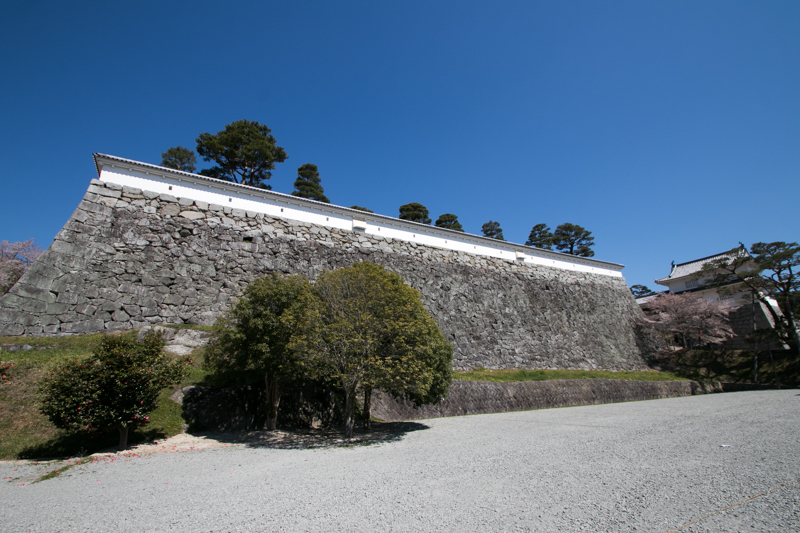 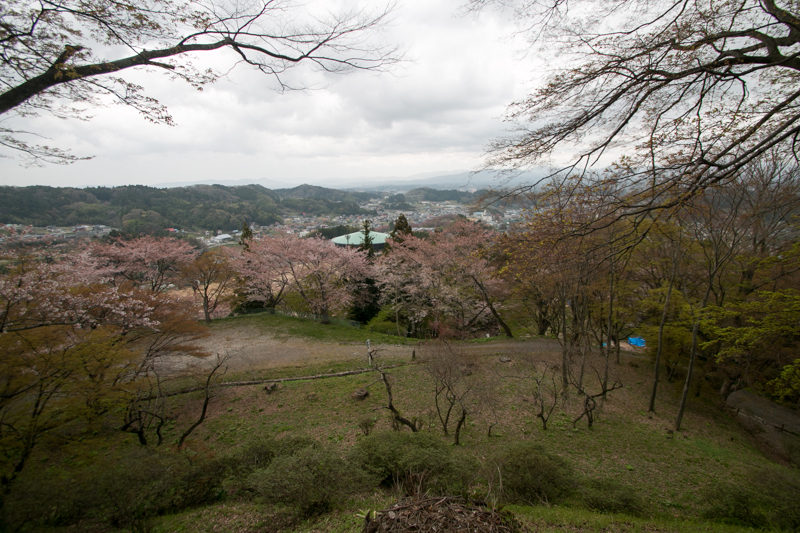 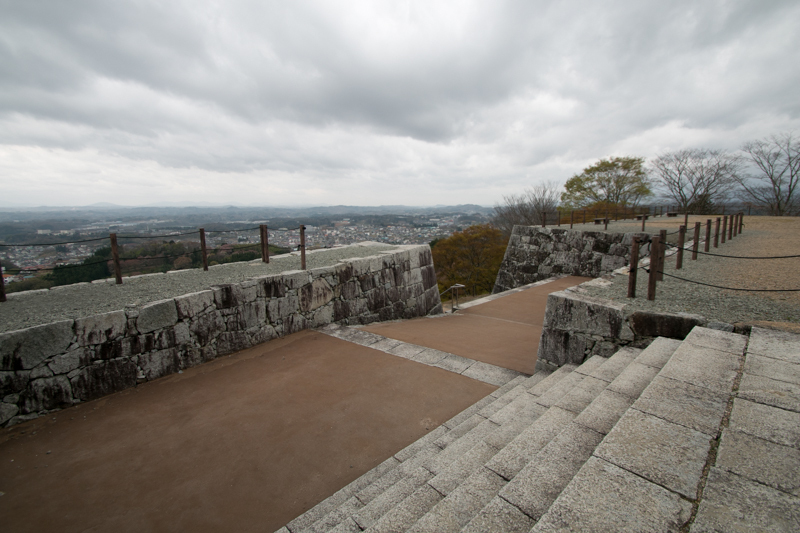 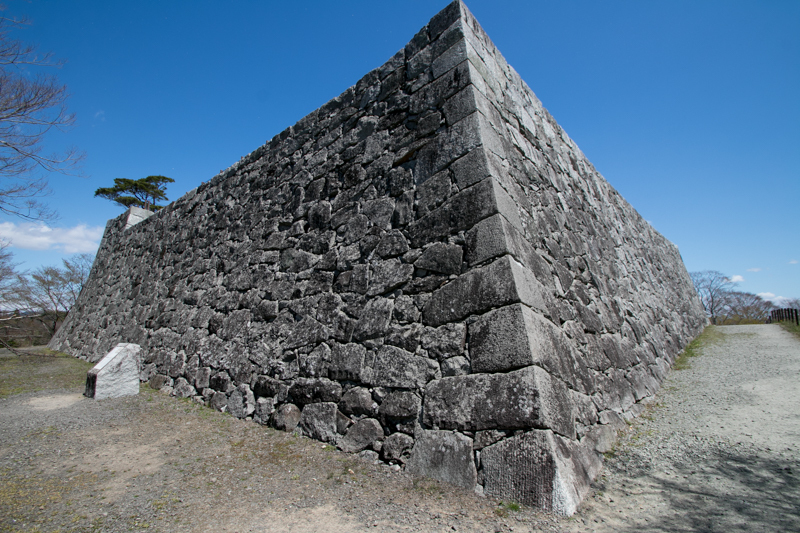 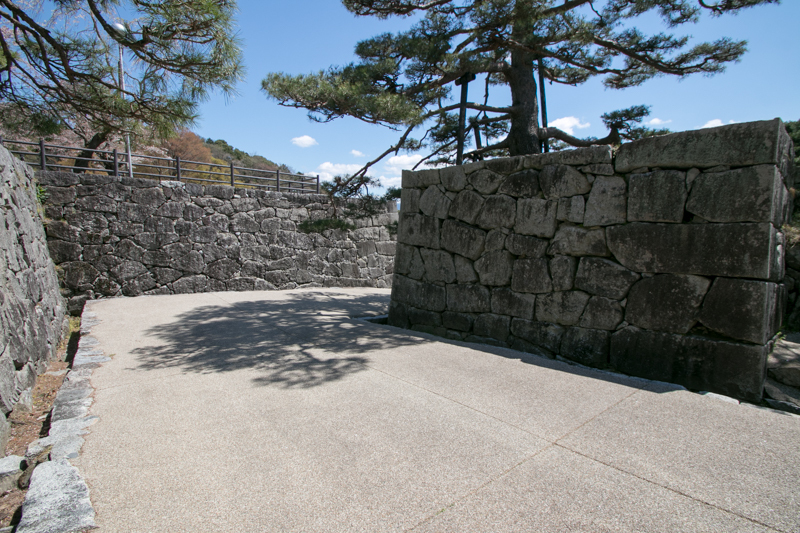 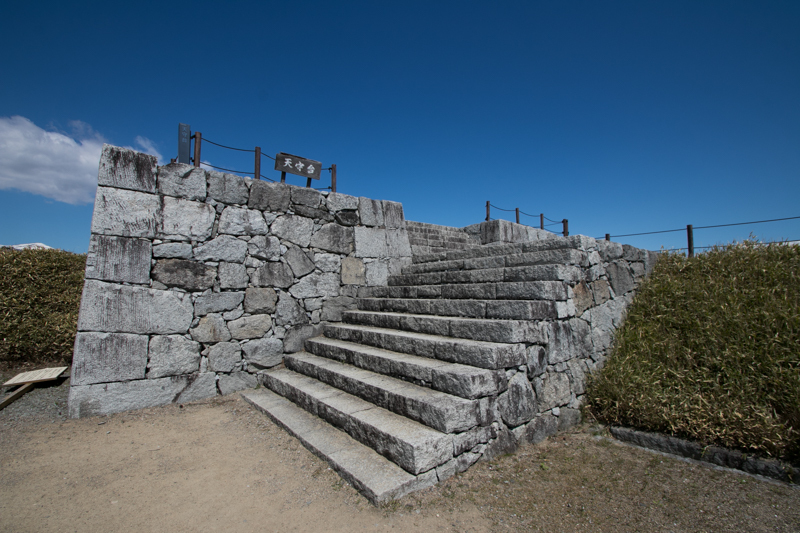 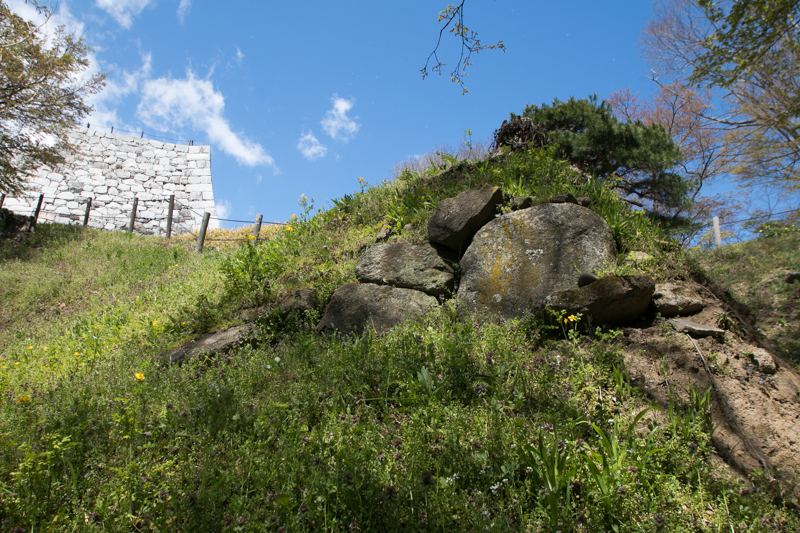 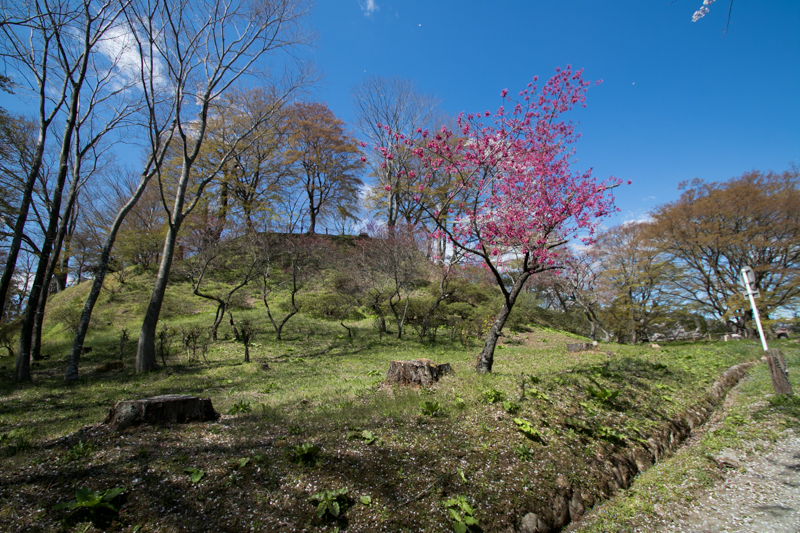 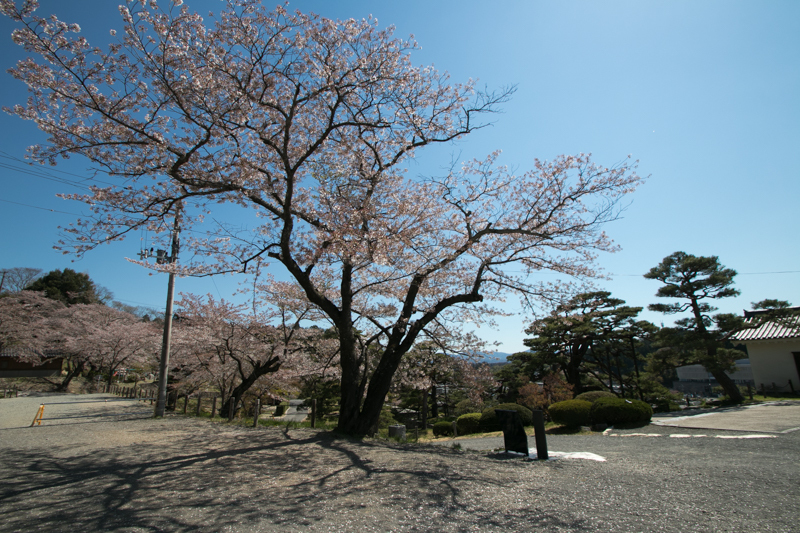 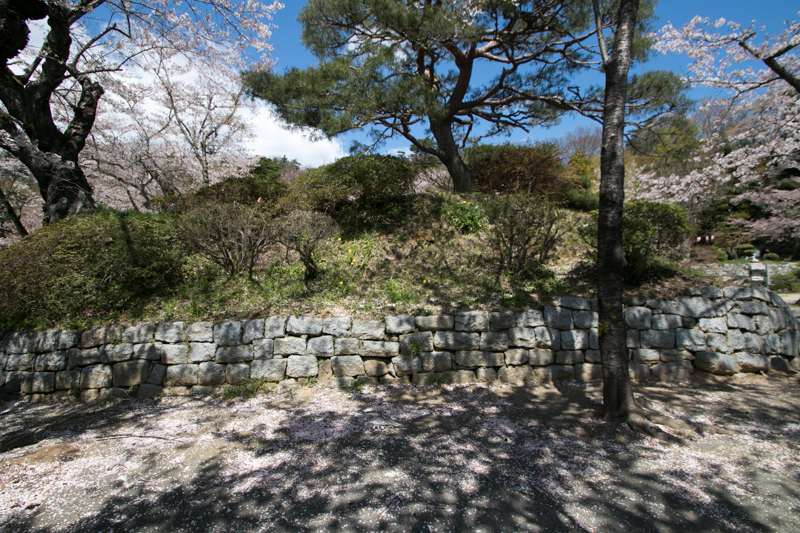 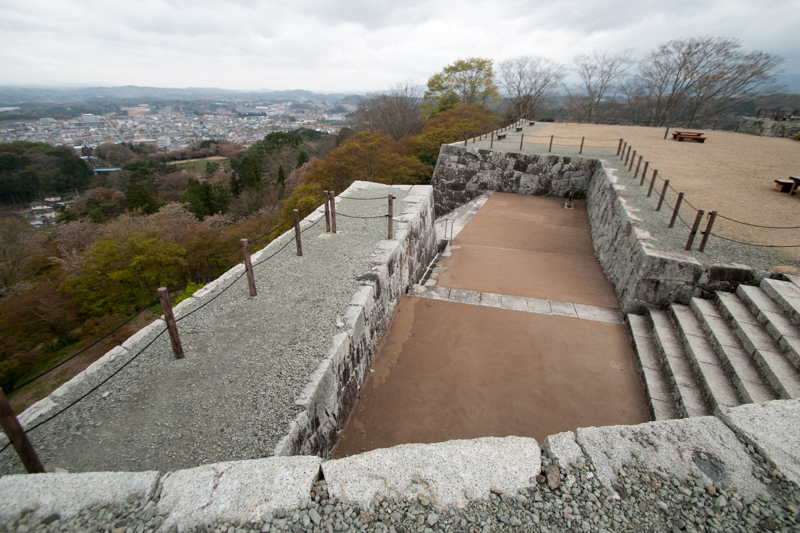 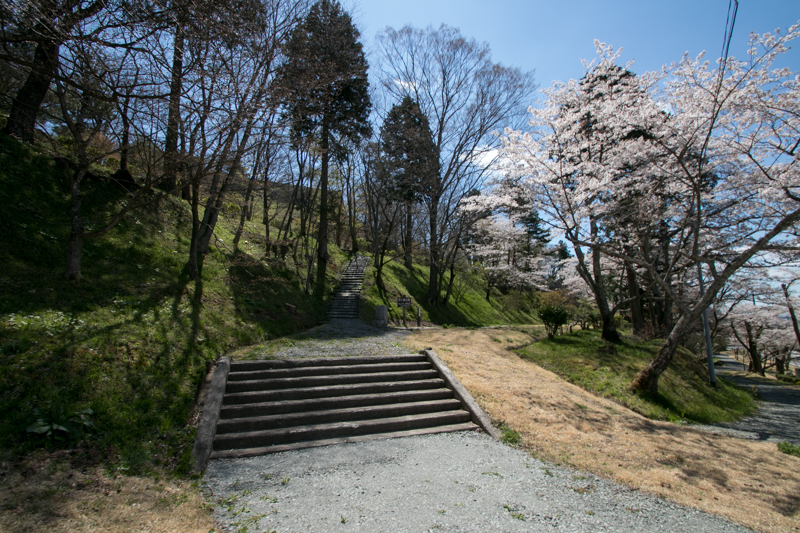 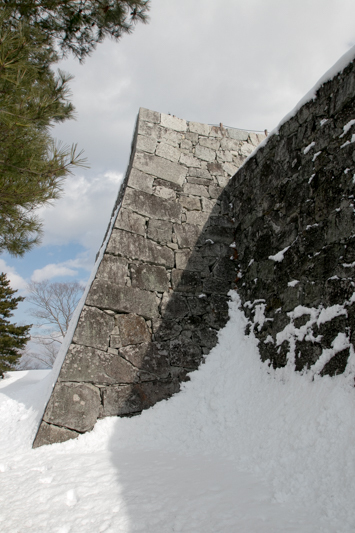 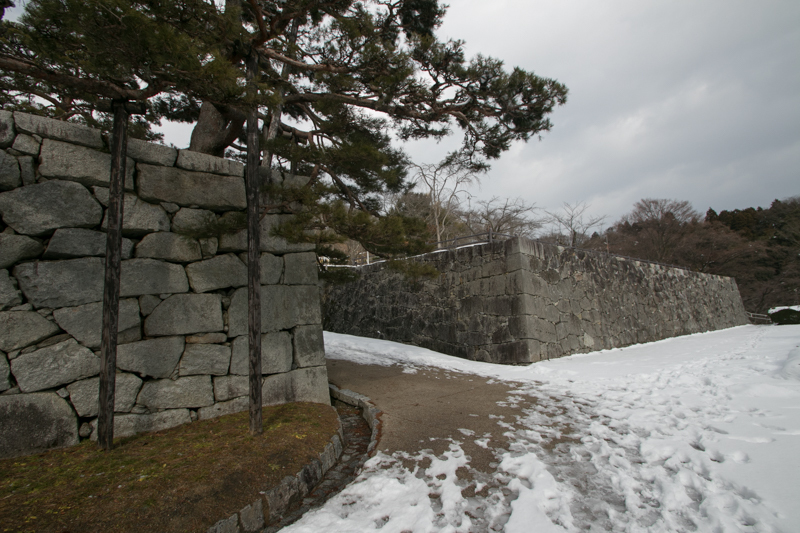 Due to its importance, Nihonmatsu castle had been held by important generals of large powers throughout its history. 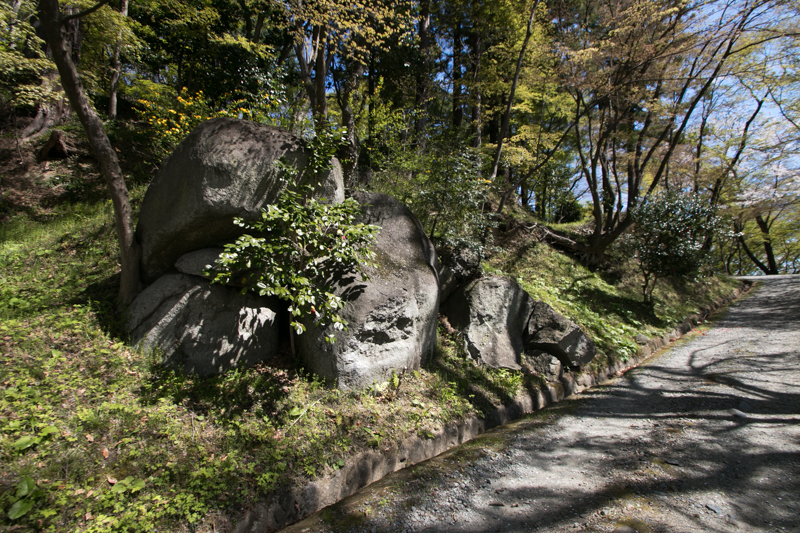 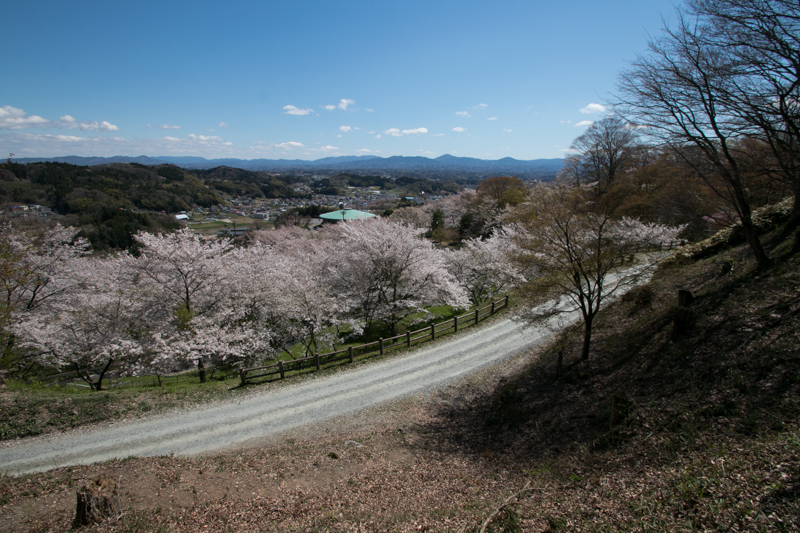 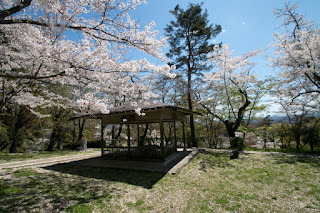 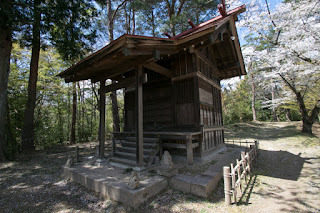 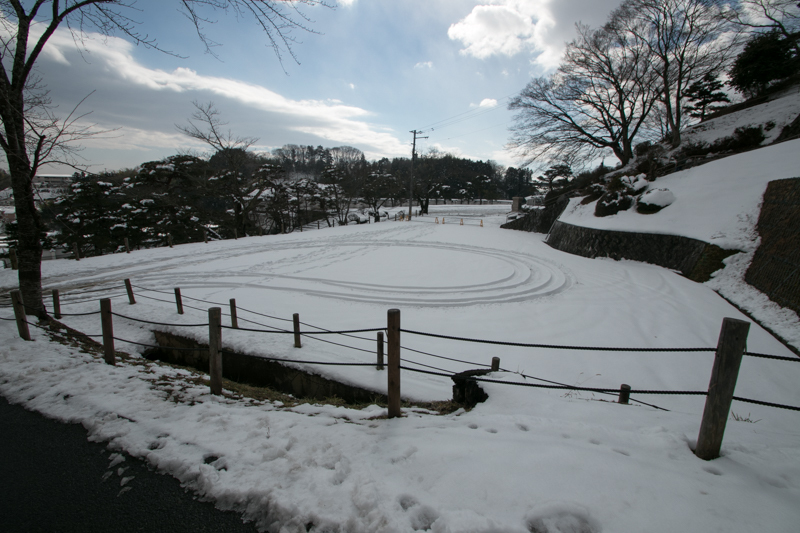 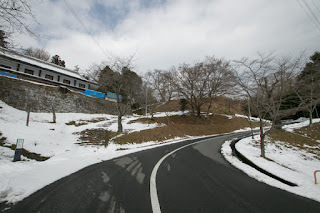 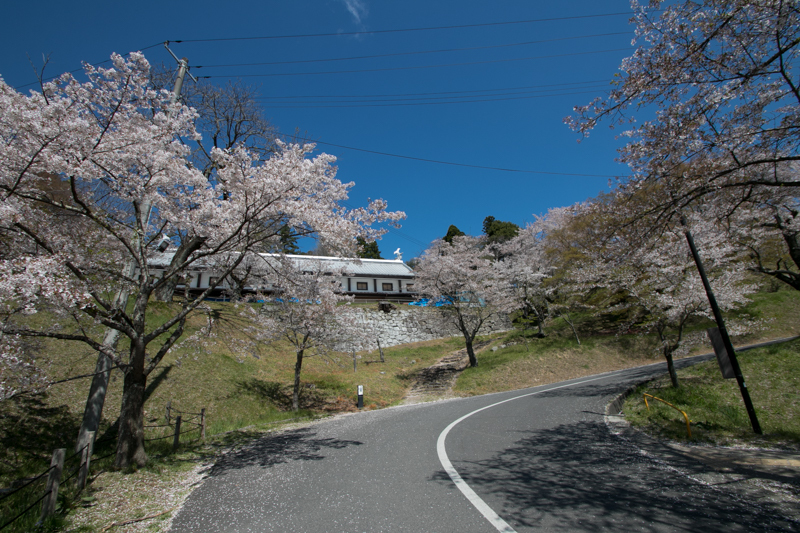 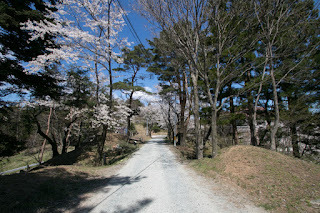 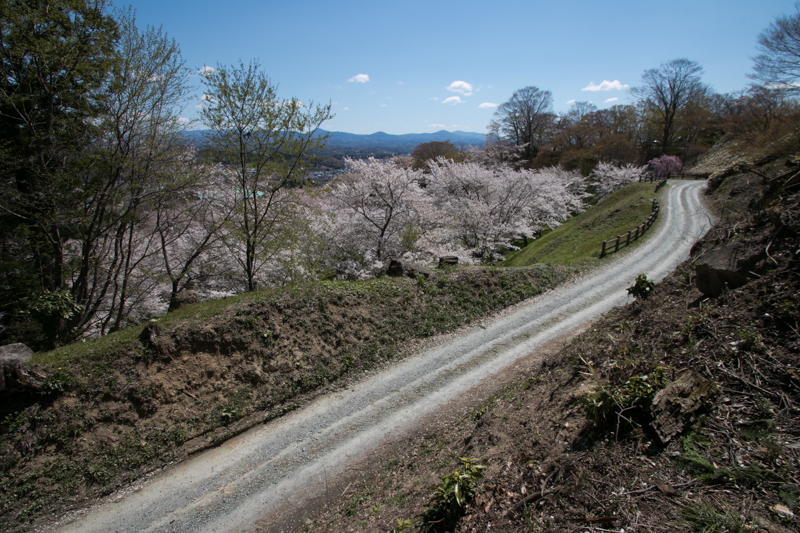 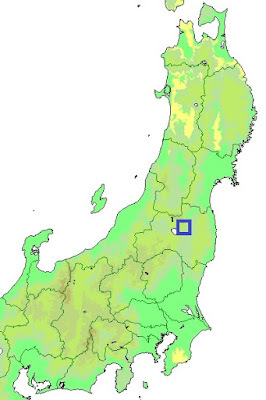 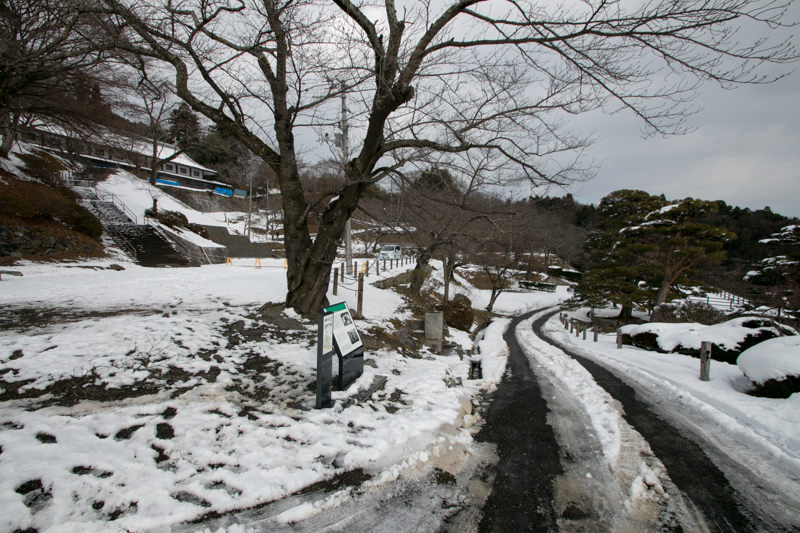 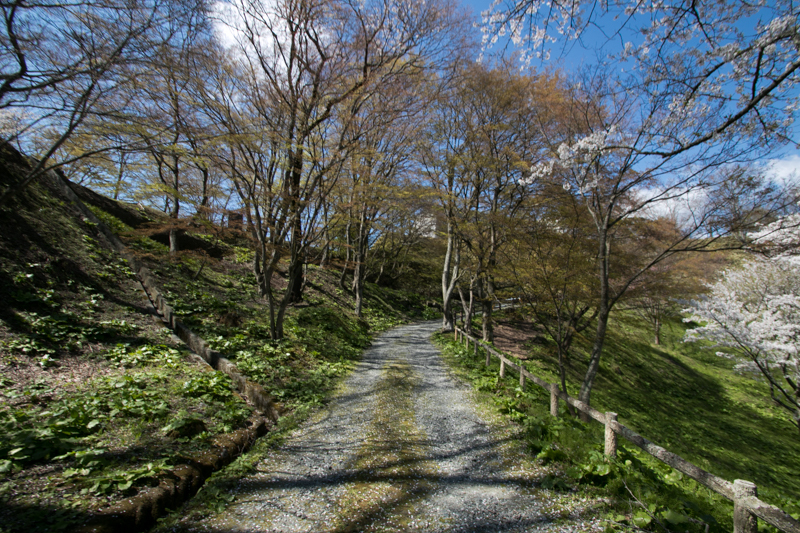 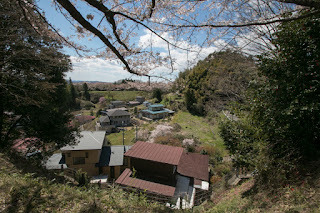 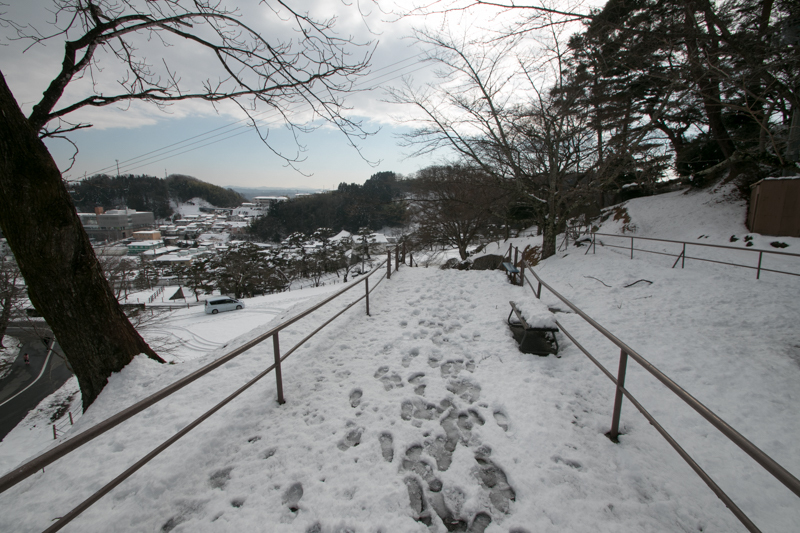 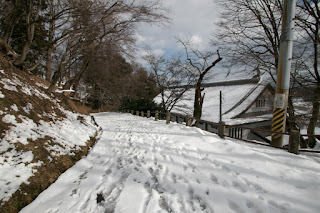 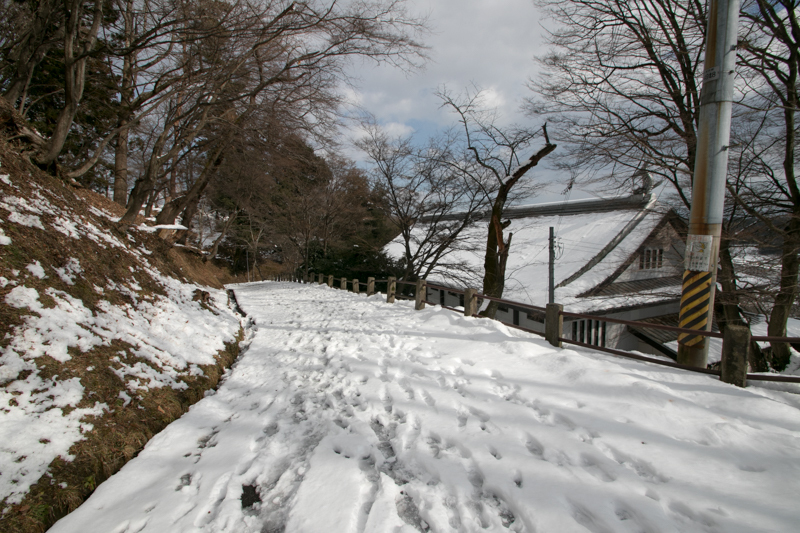 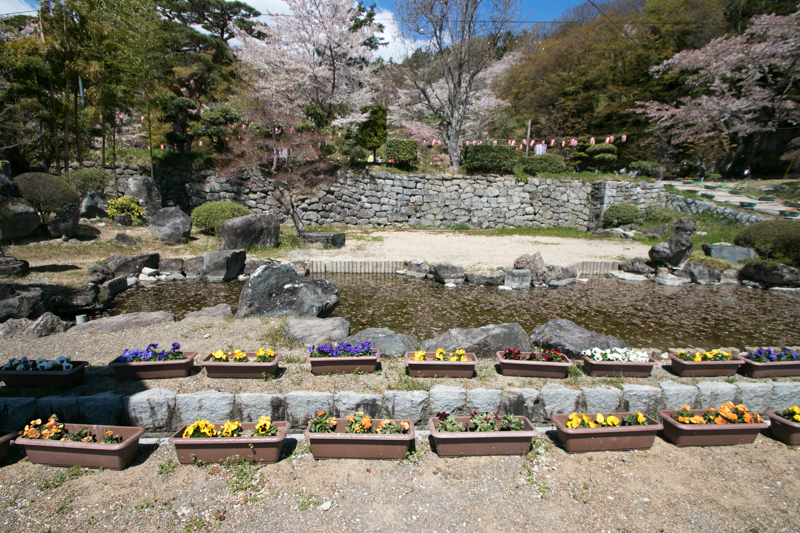 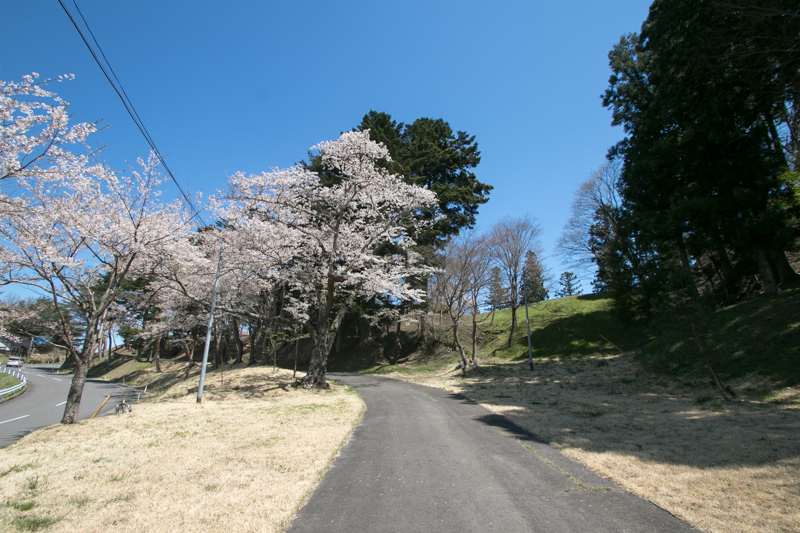 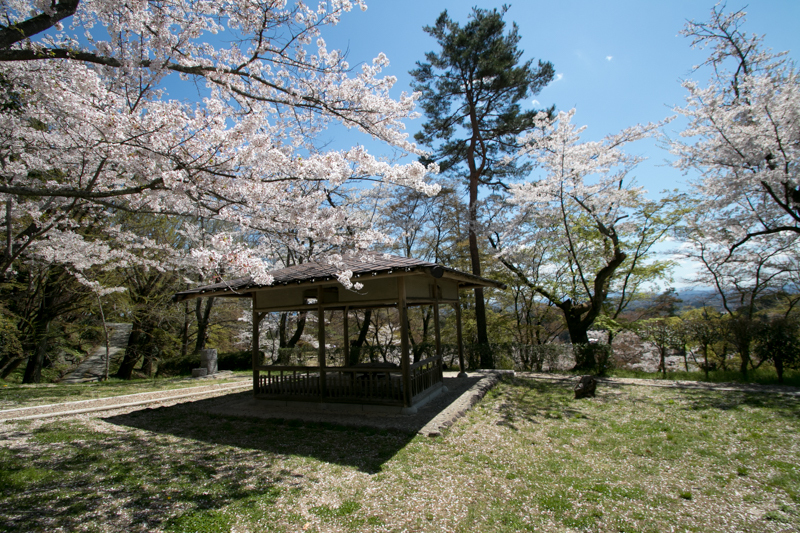 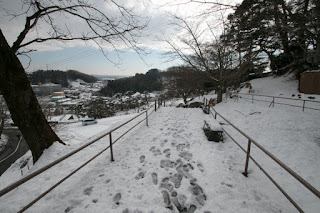 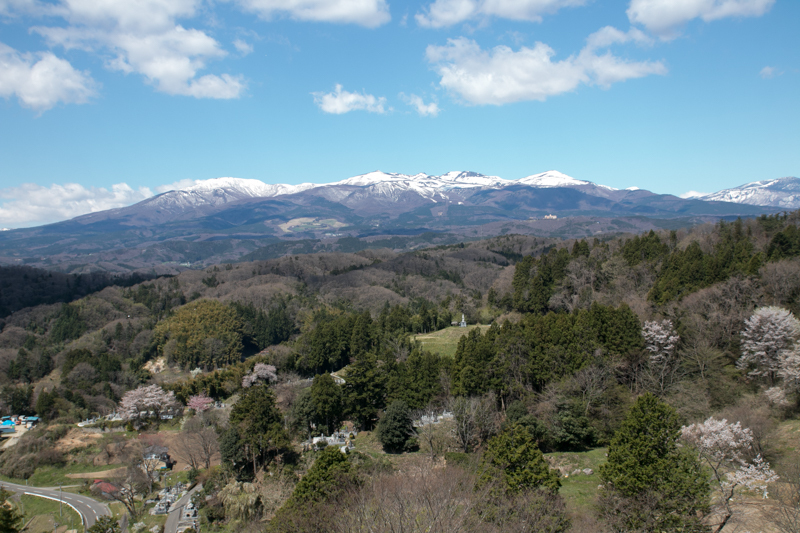 Nihonmatsu area was originally governed by Nihonmatsu (Hatakeyama) clan. 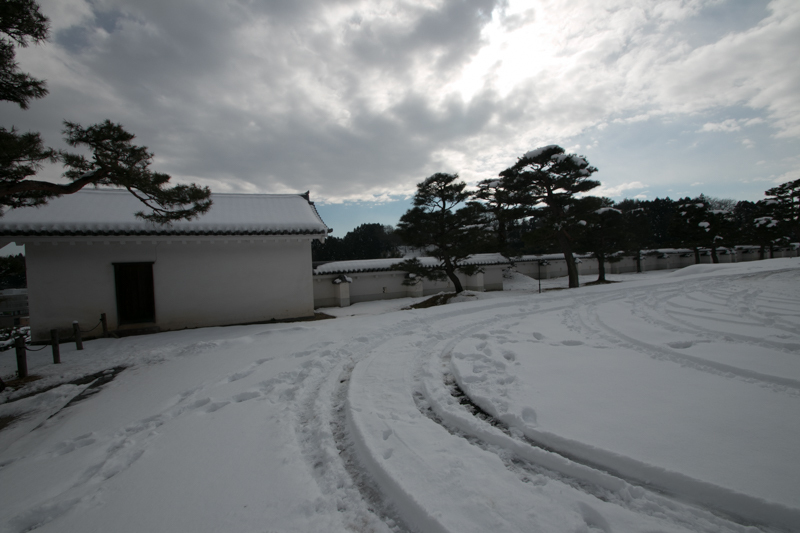 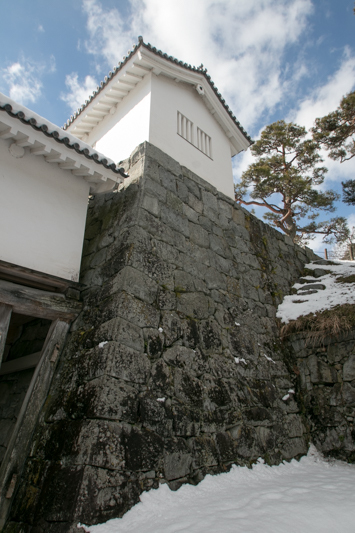 Nihonmatsu clan was a traditional house stem from Hatakeyama clan, one of three ministers of Muromashi Shogunate. 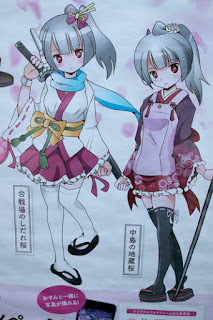 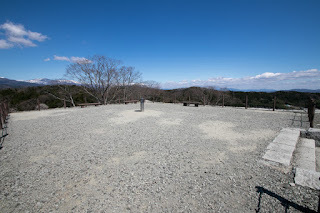 Nihonmatsu clan was appointed as a governor of Tohoku region in 14th century and built Nihonmatsu castle, but suppressed by surrounding large lords such as Date clan or Ashina clan, they could continue as only small local clan. In 1585, Yoshitugu Nihonmatsu (1552-1582), current leader of Nihonmatsu clan was attacked by Masamune Date (1567-1636), current leader of Date clan, and was forced to be on the verge of extinction. Under the mediation of Terumune Date (1544-1585), father of Masamune, Nihonmatsu clan was once approved to continue, but having resentment against Date clan, Yoshitsugu attempted to kidnap Terumune to his castle when he visited Terumune to express gratitude for coordination. Masamune chased them in hurry and caught at the border, but as Yoshitsugu did not release Terumune, Masamune had to kill his father along with Yoshitugu. 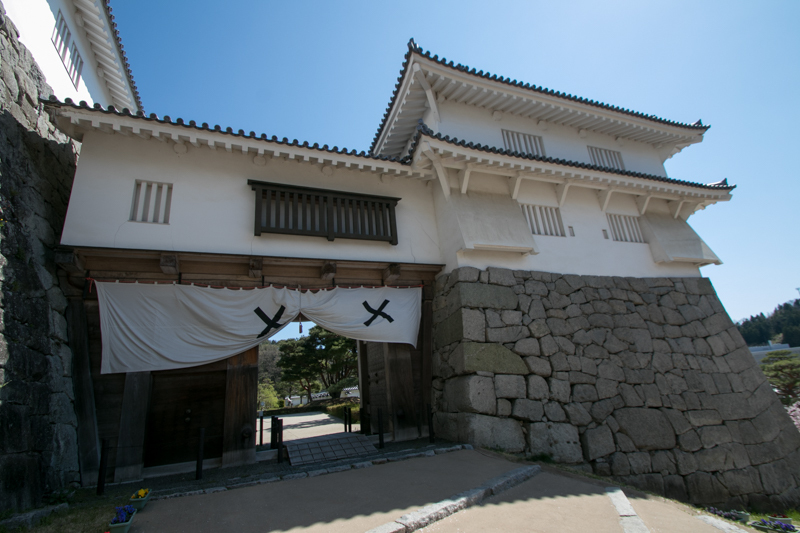 Furious Masamune siege Nihonmatsu castle and the castle stand half year, but finally opened the castle. Nihonmatsu clan was virtually extinguished at this time. 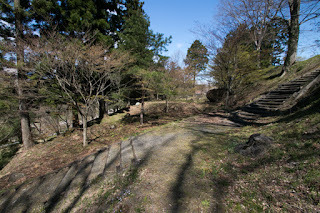 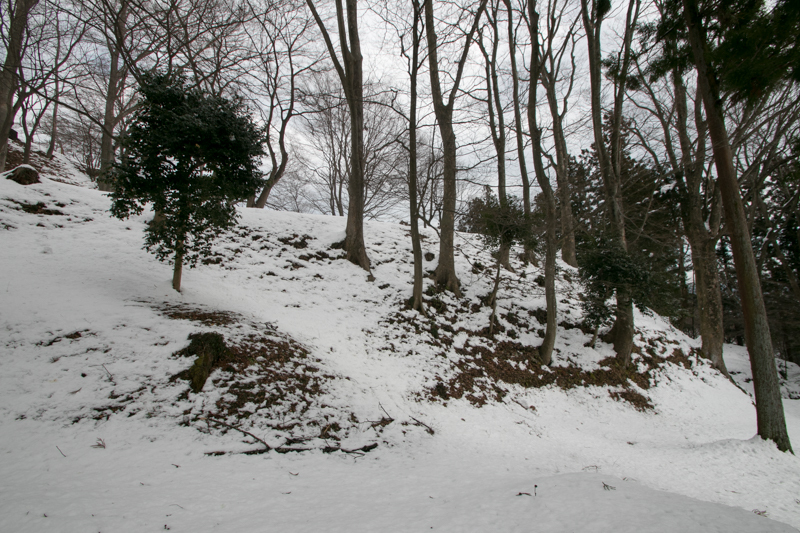 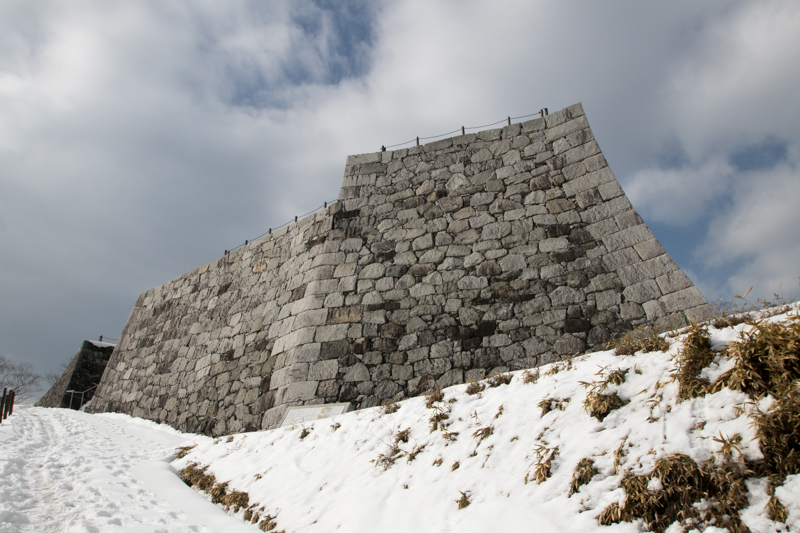 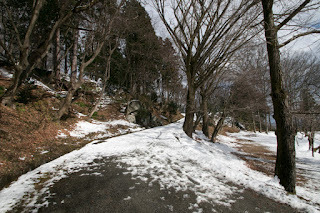 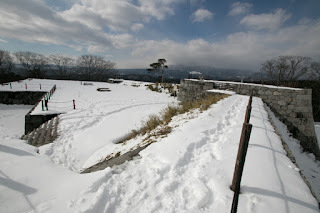 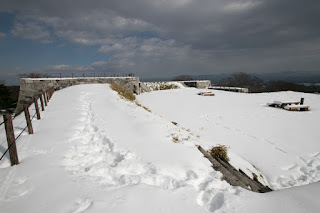 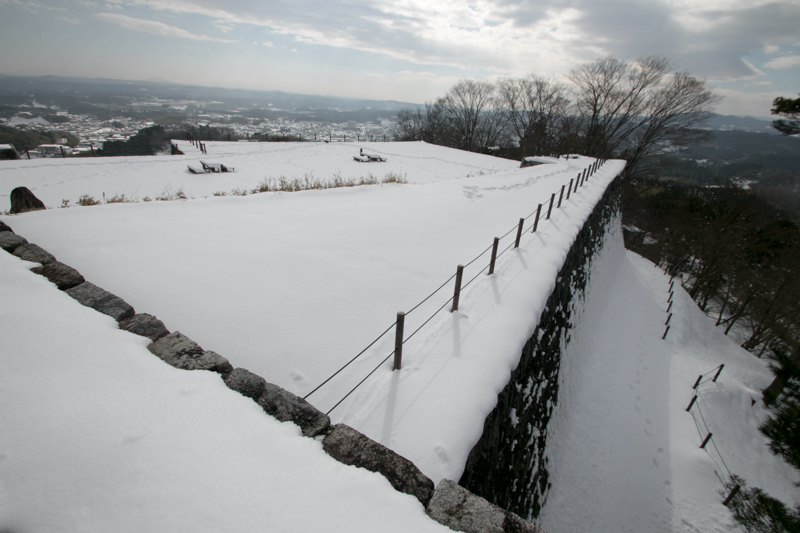 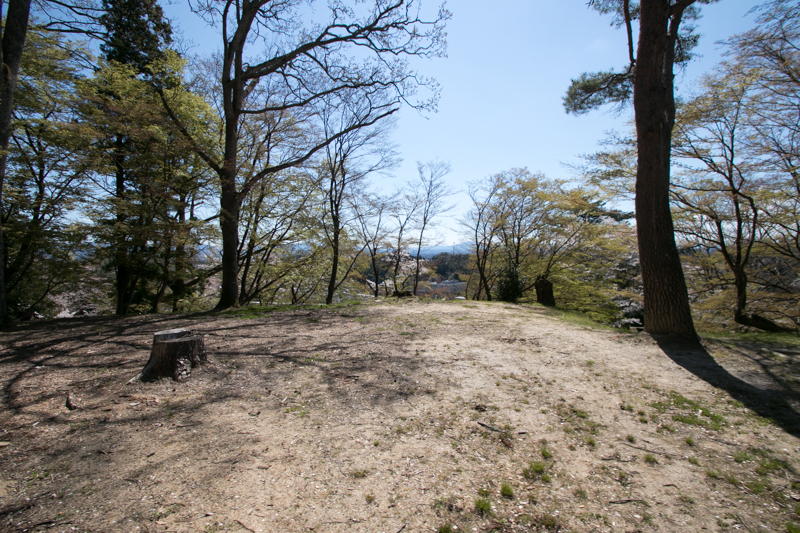 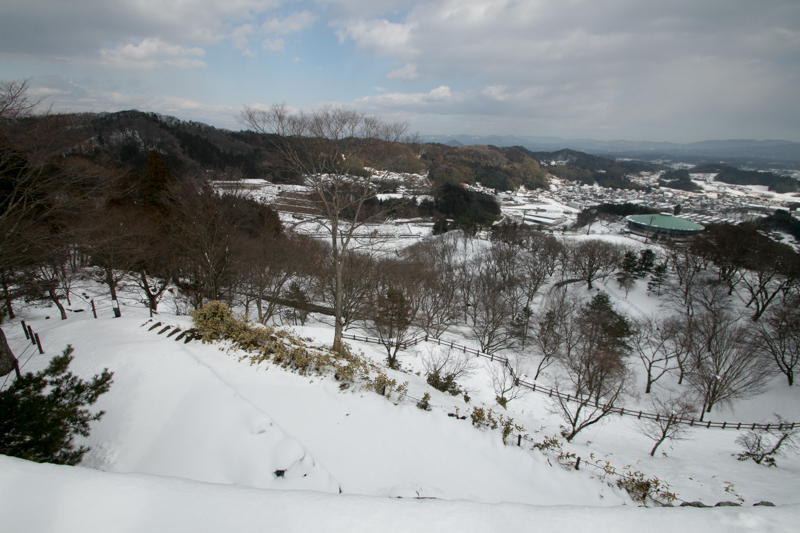 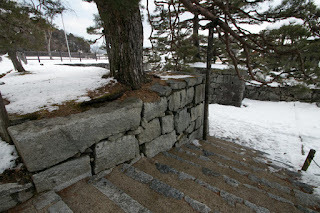 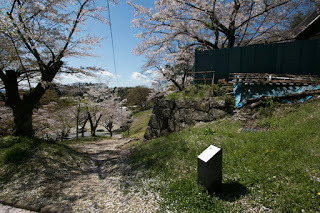 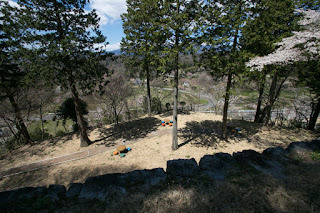 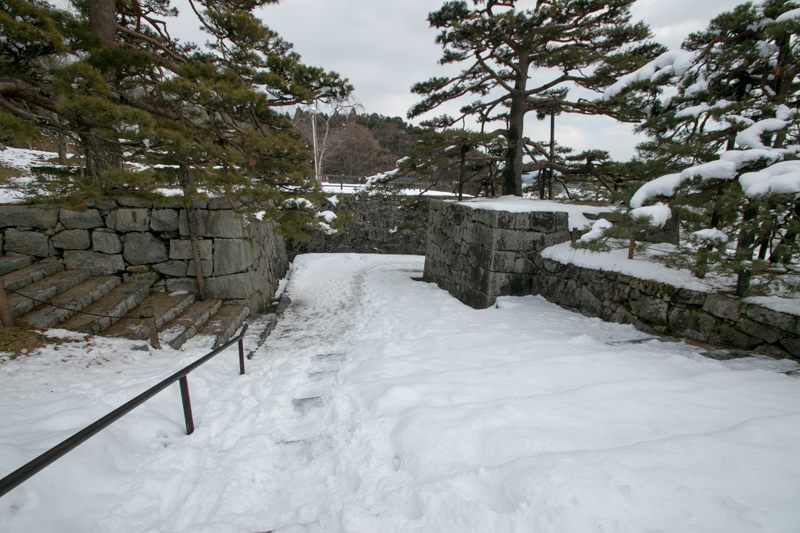 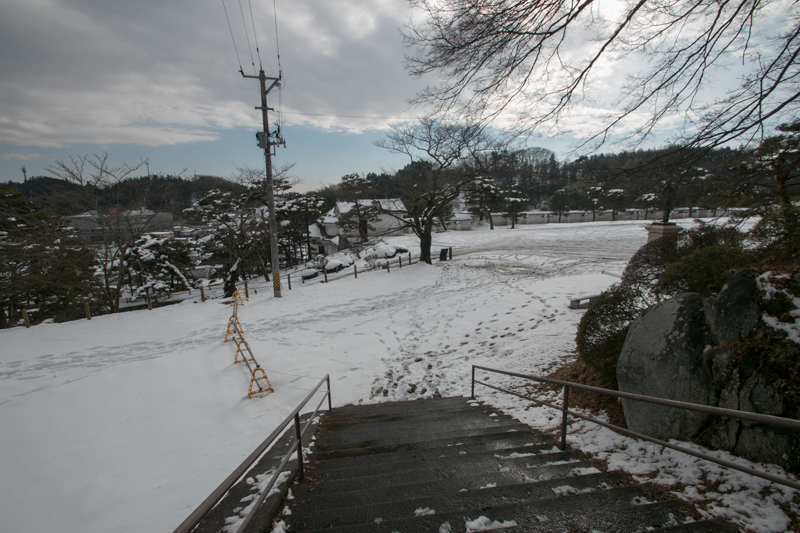 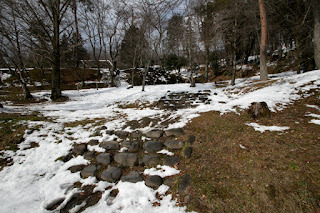 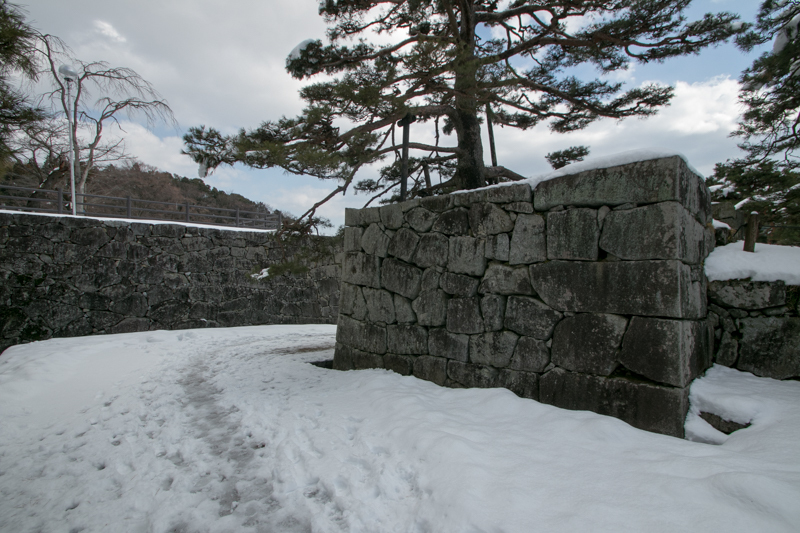 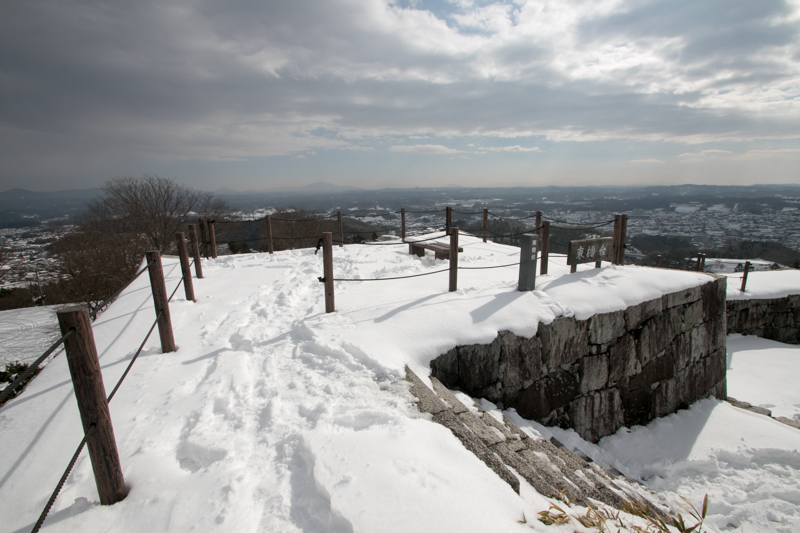 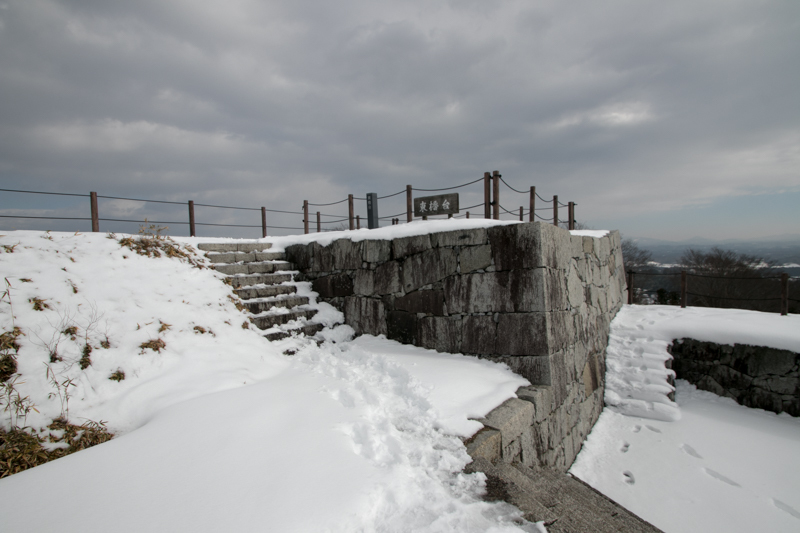 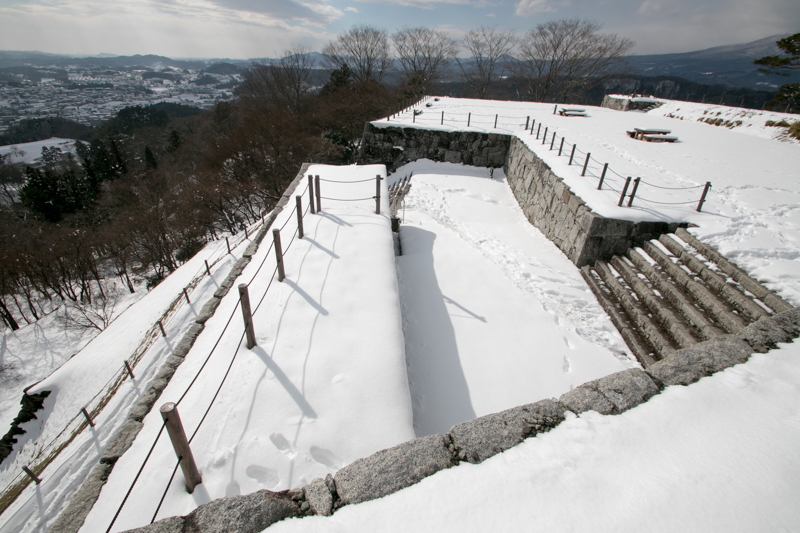 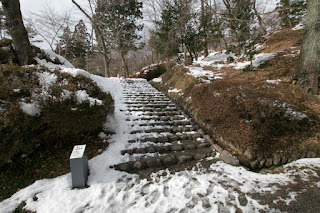 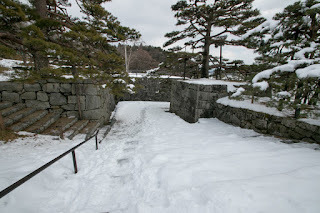 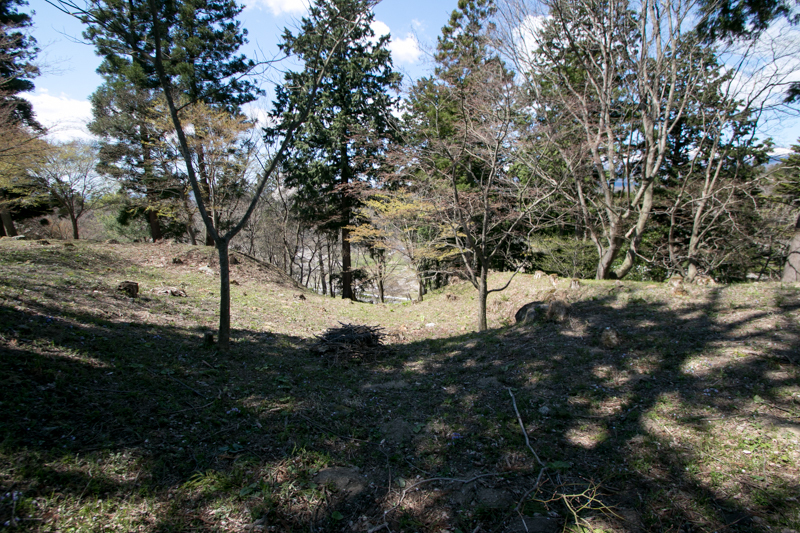 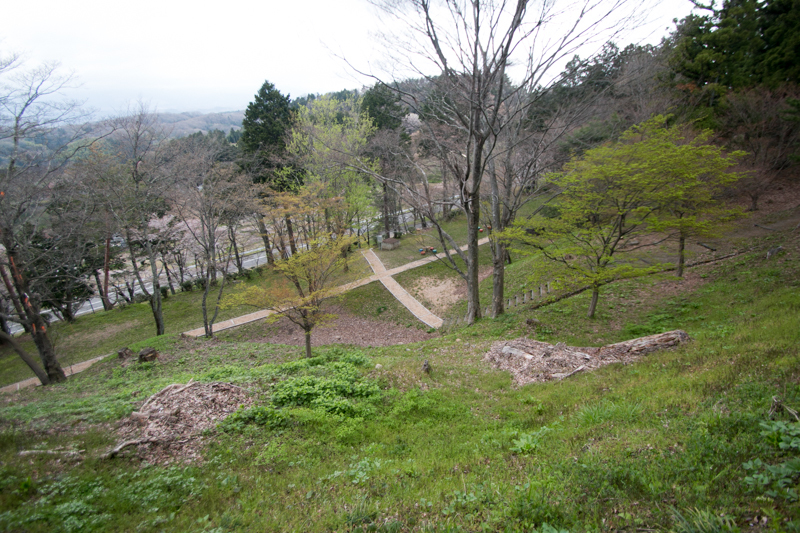 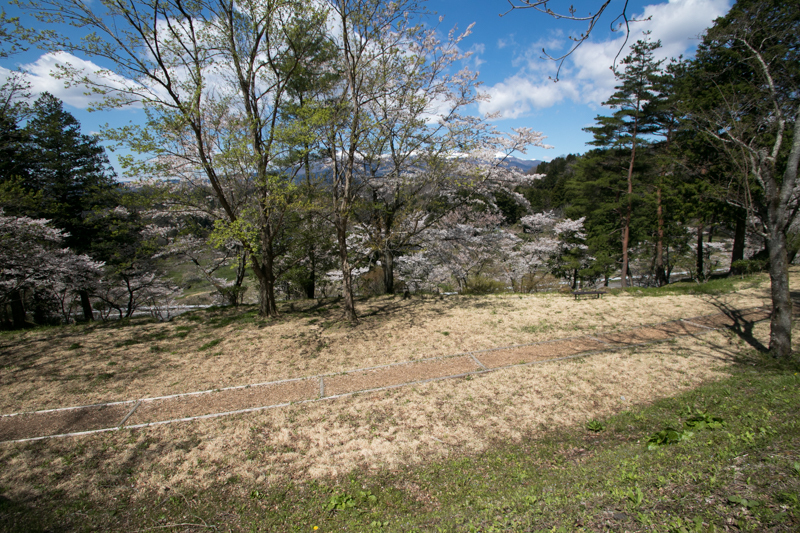 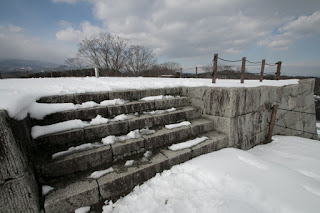 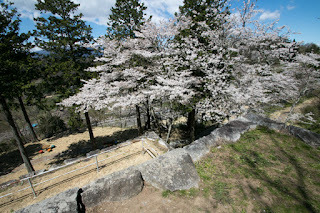 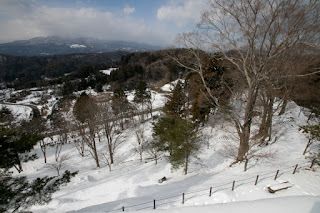 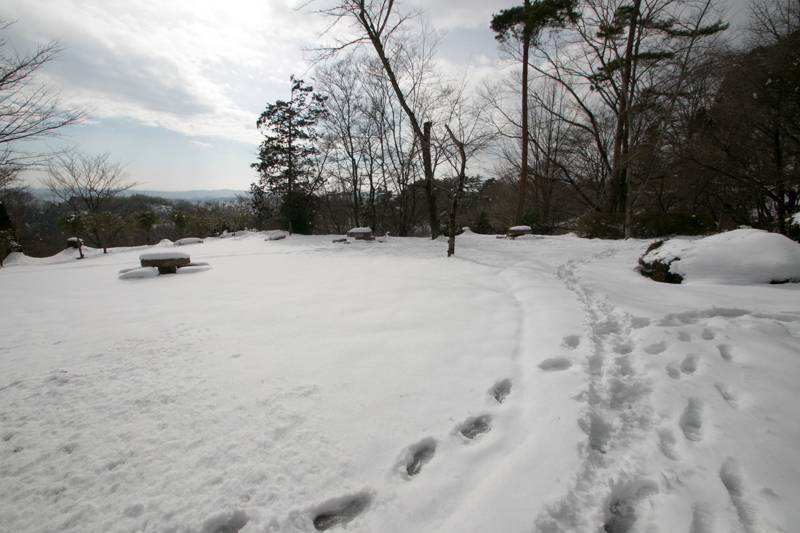 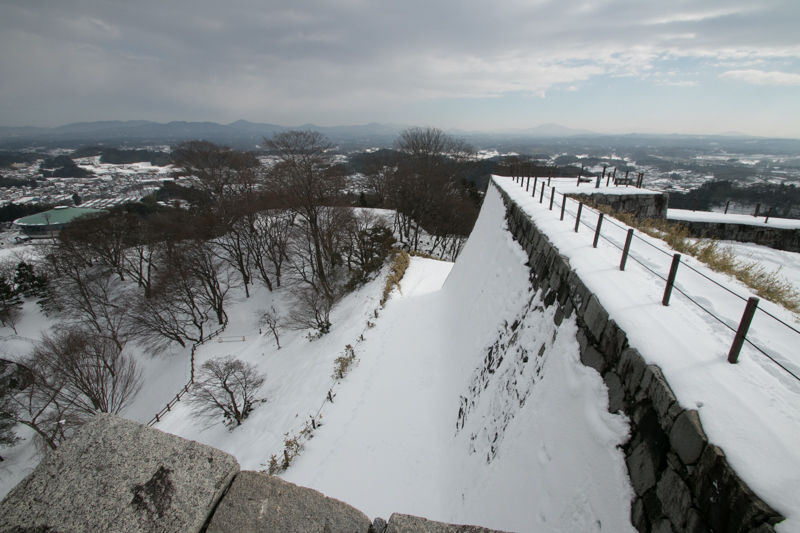 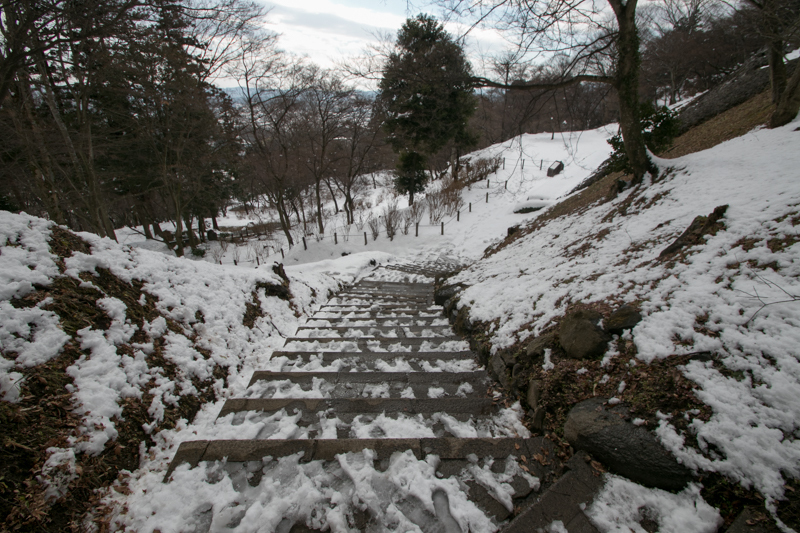 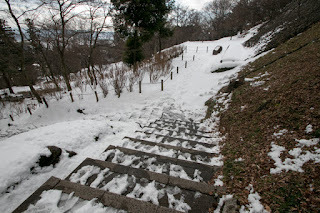 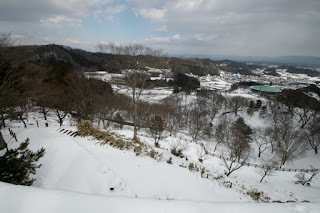 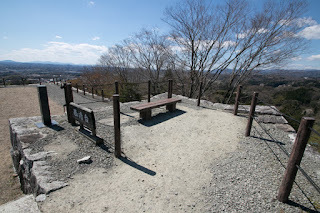 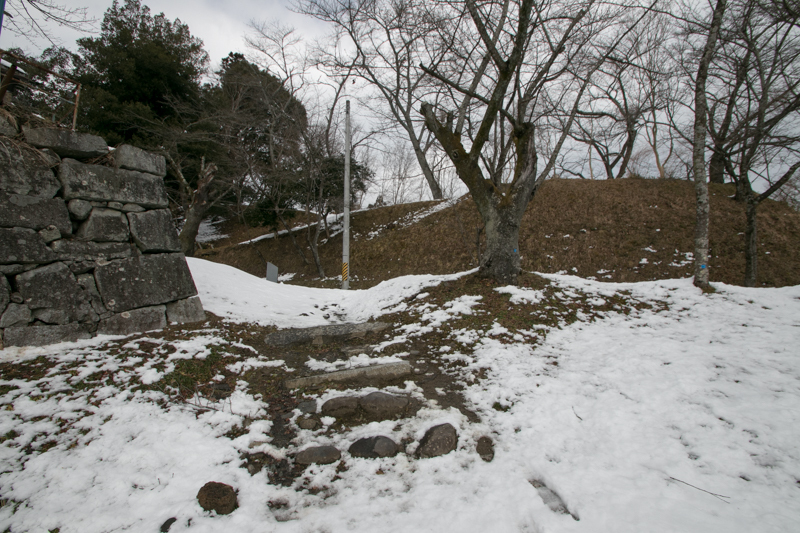 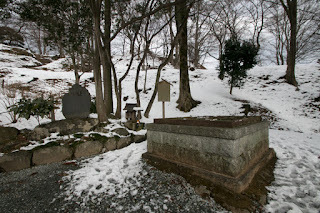 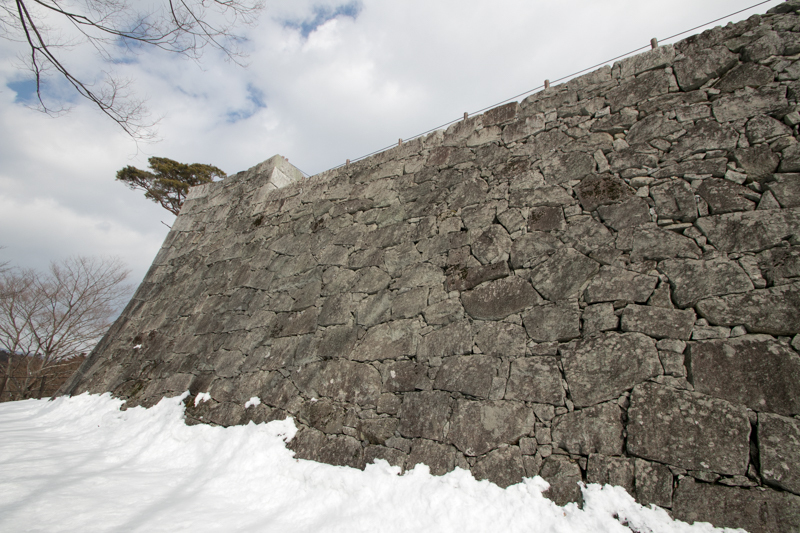 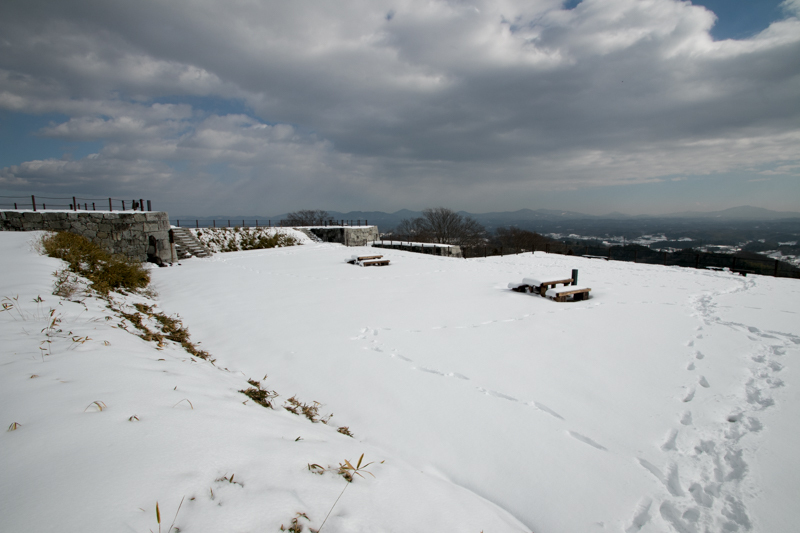 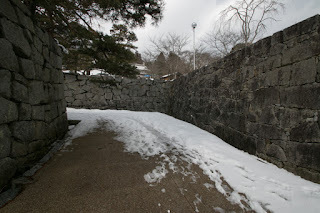 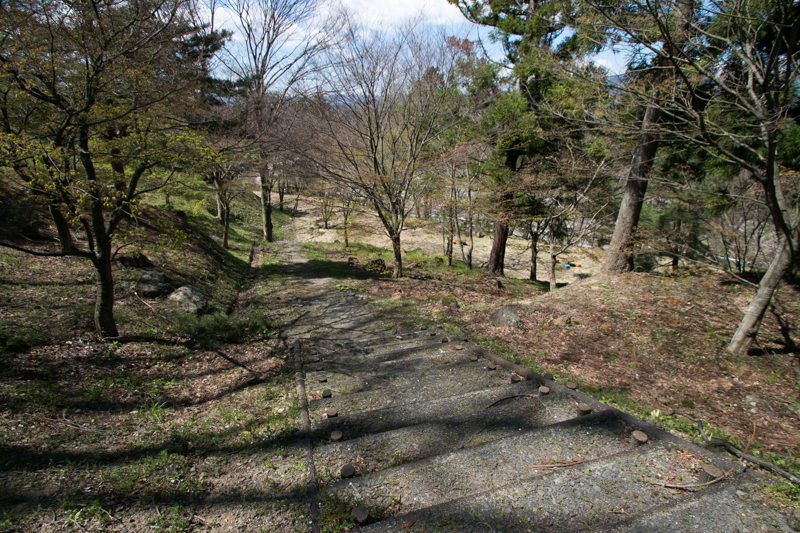 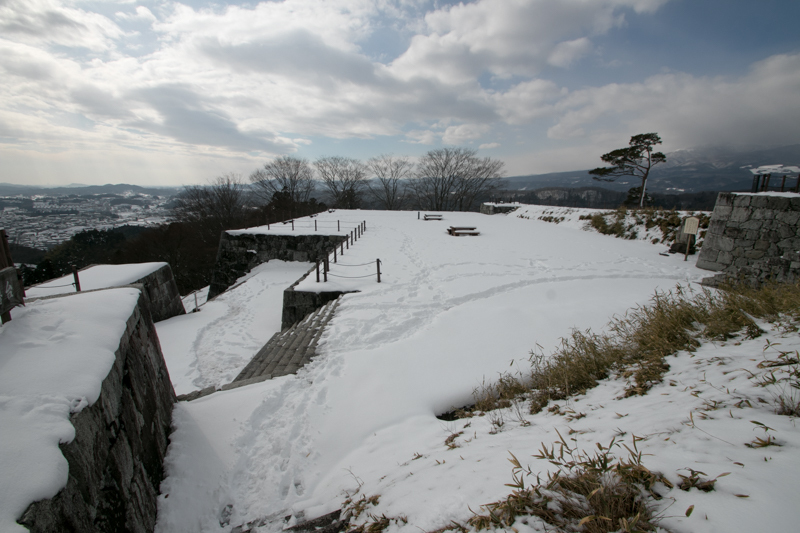 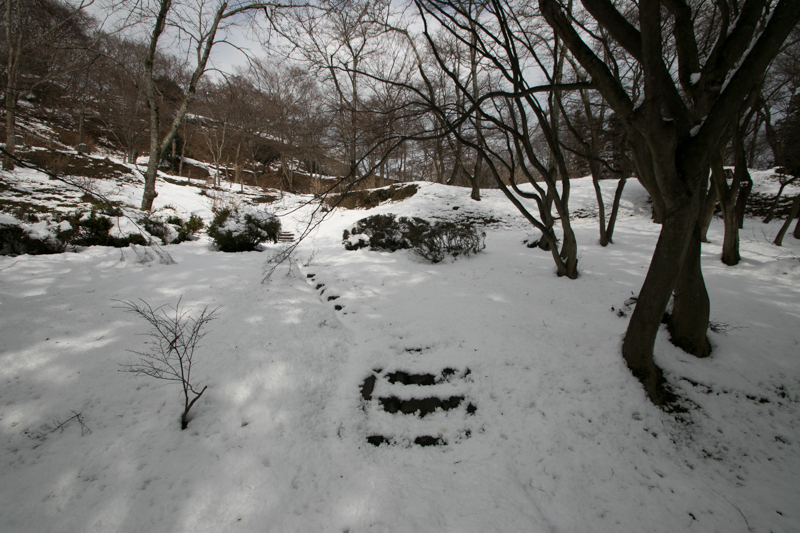 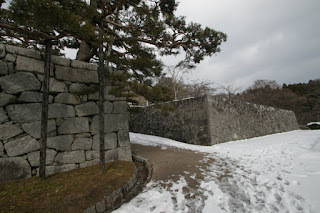 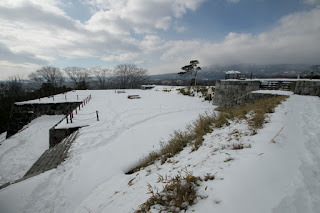 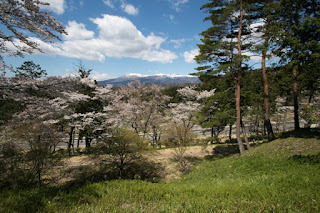 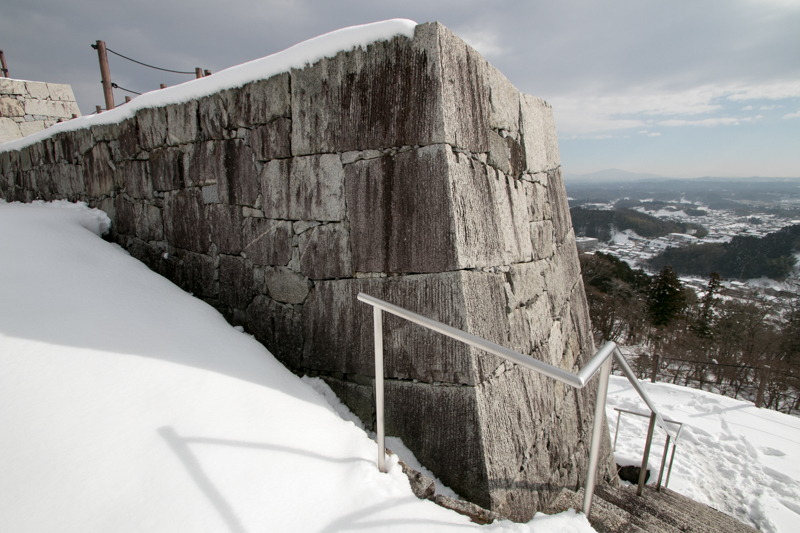 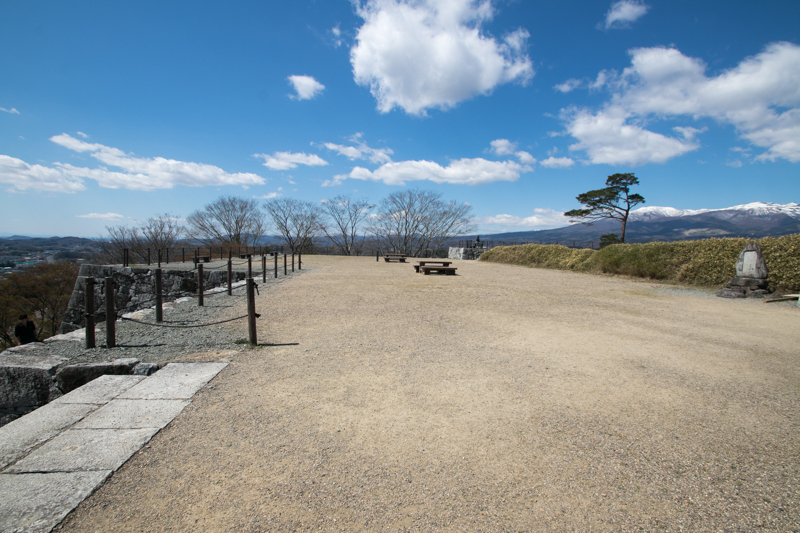 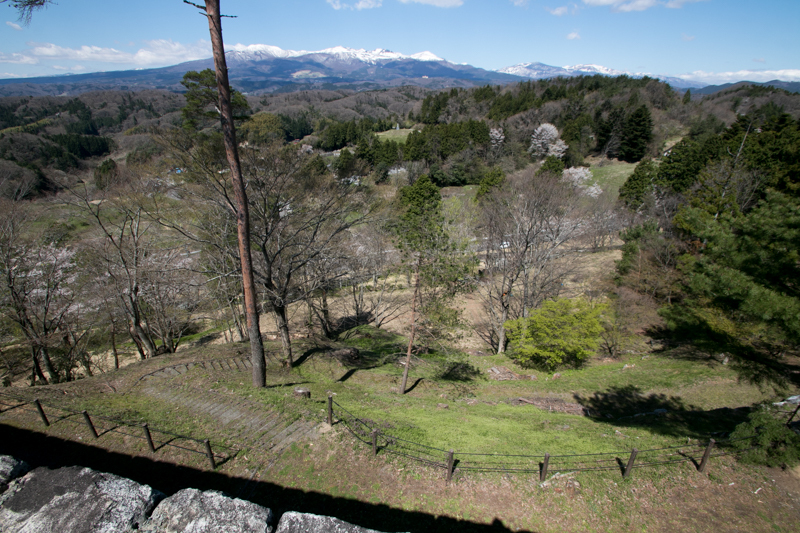 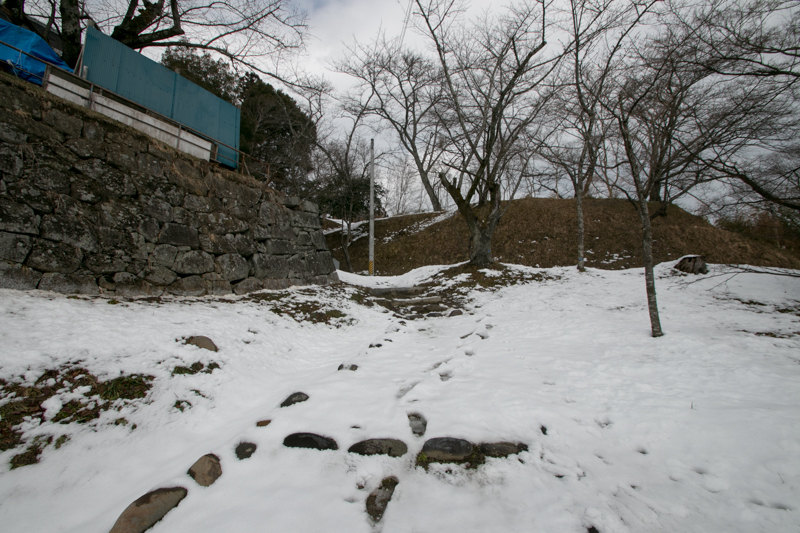 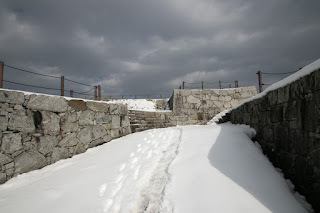 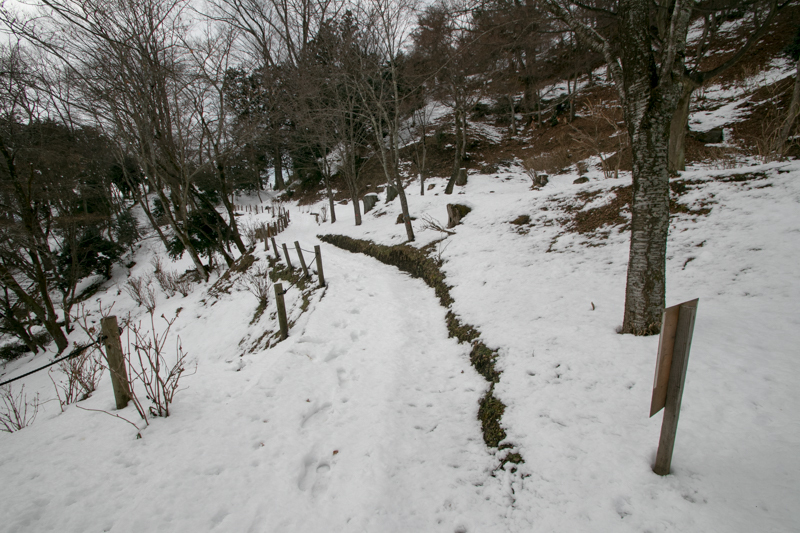 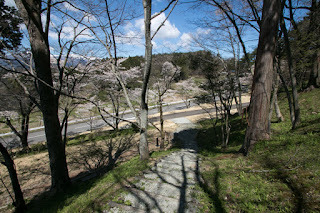 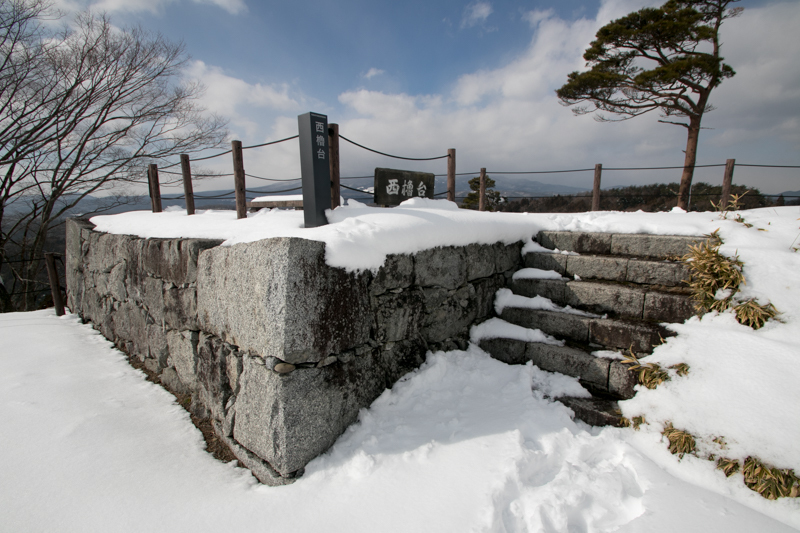 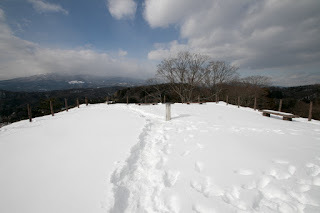 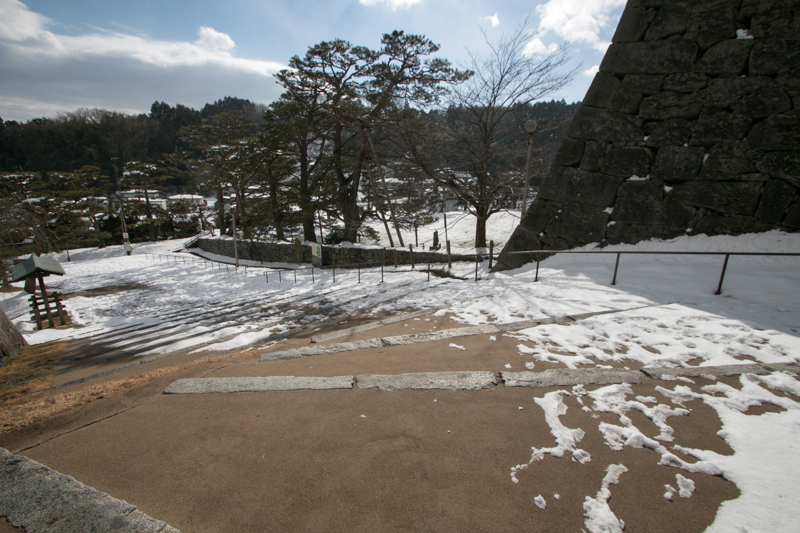 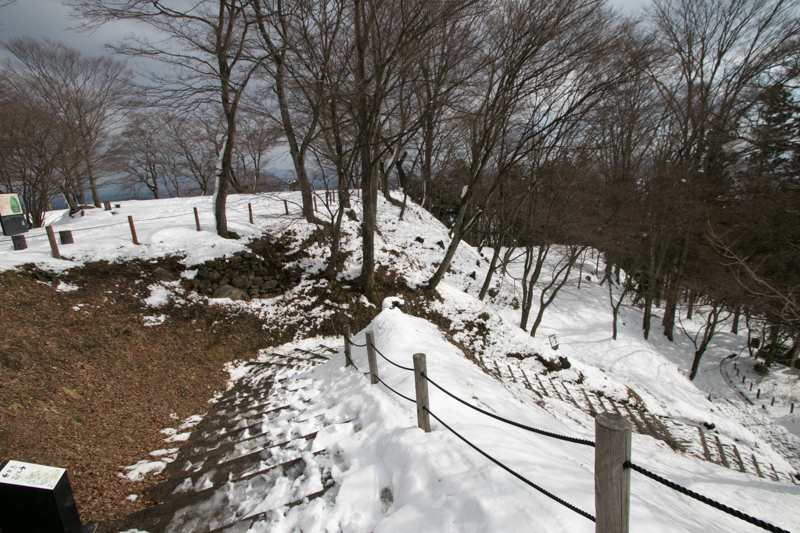 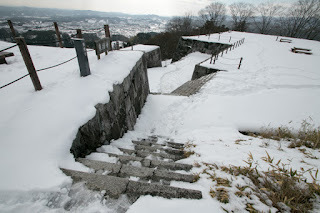 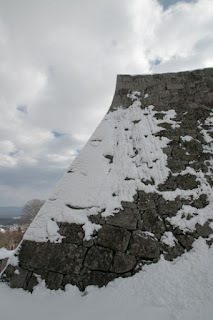 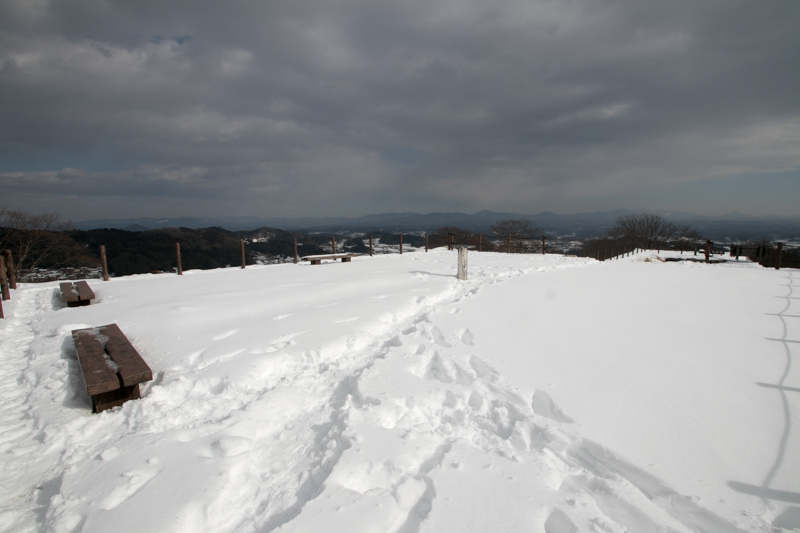 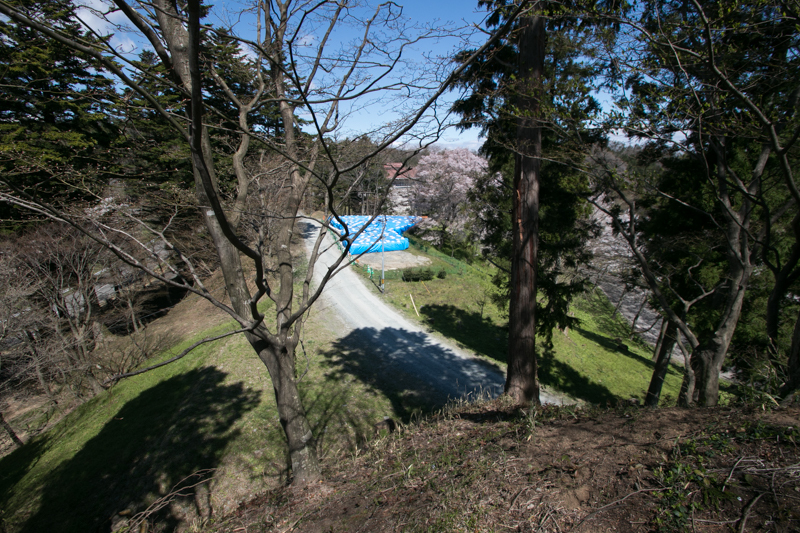 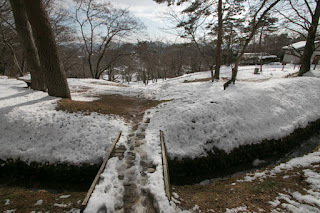 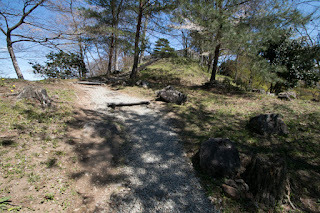 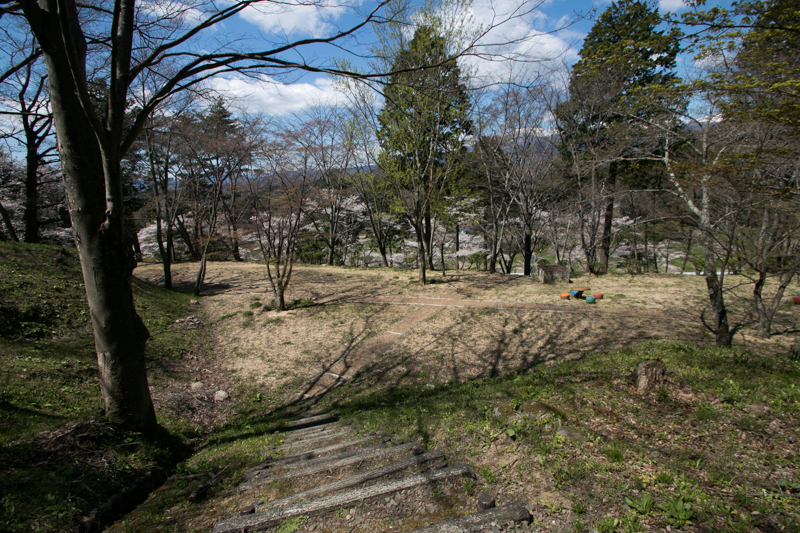 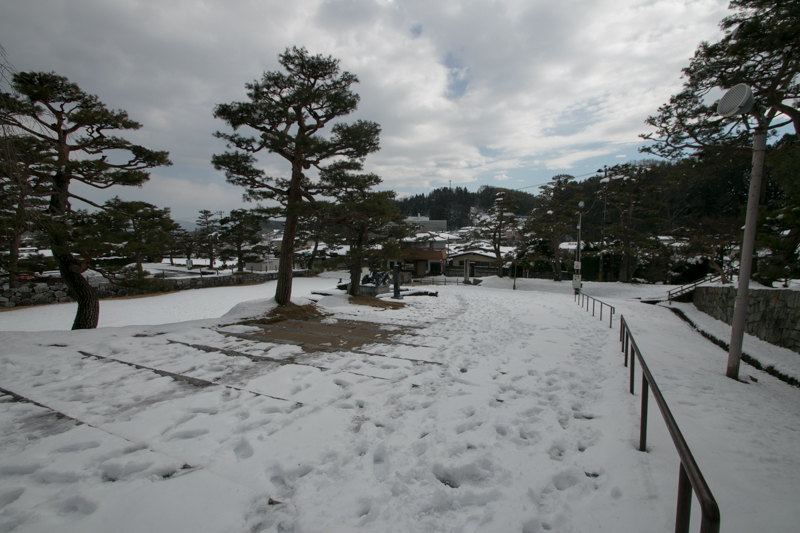 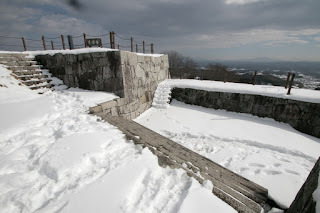 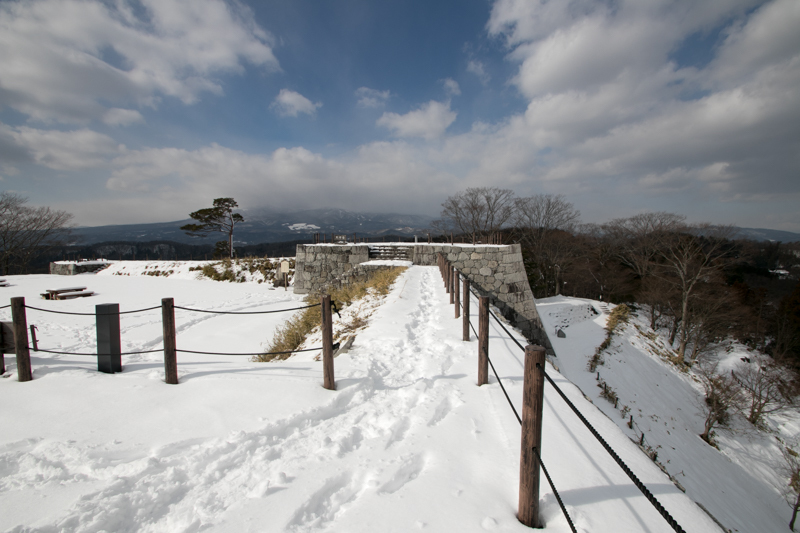 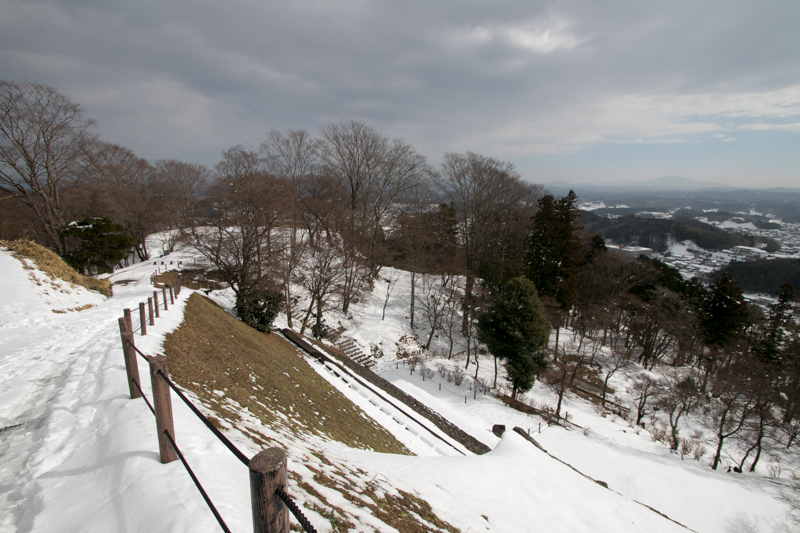 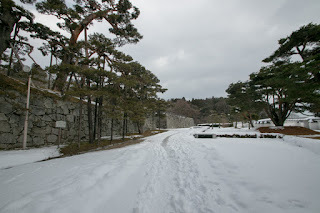 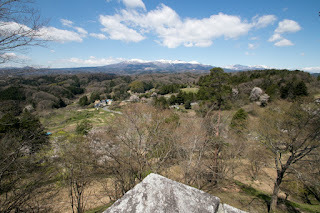 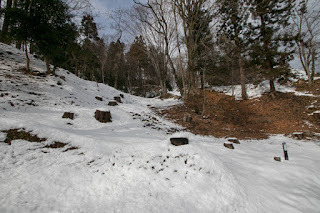 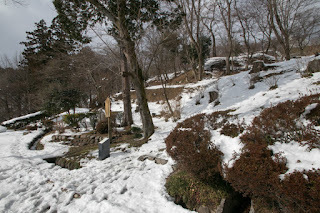 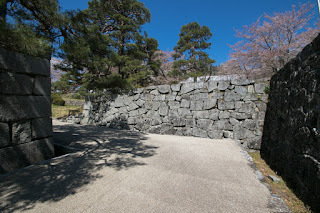 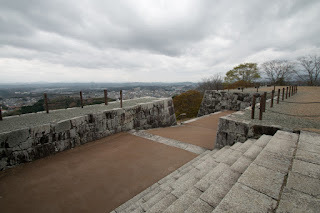 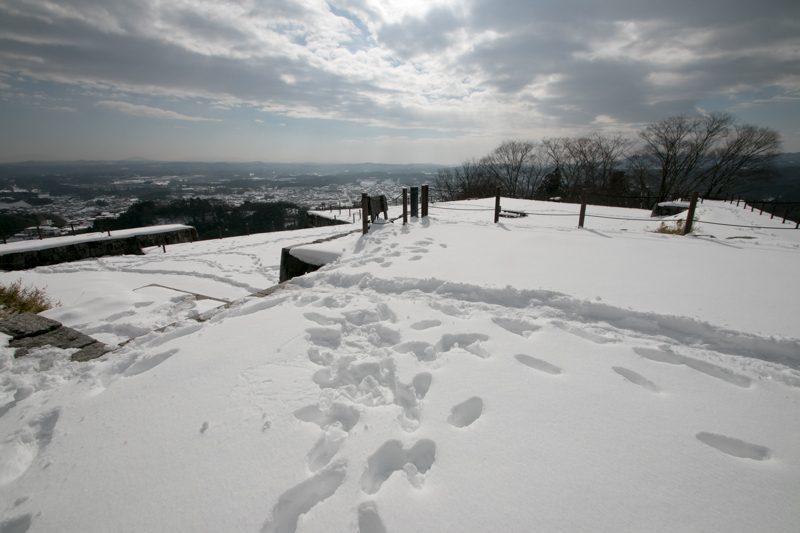 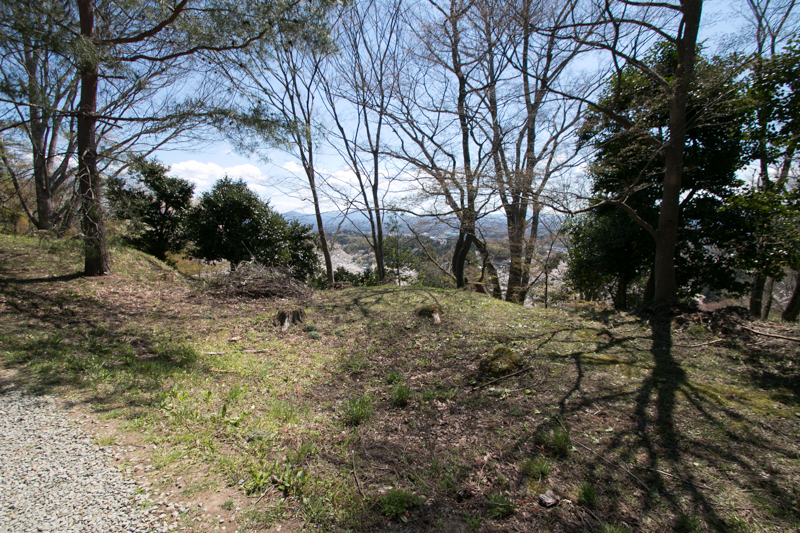 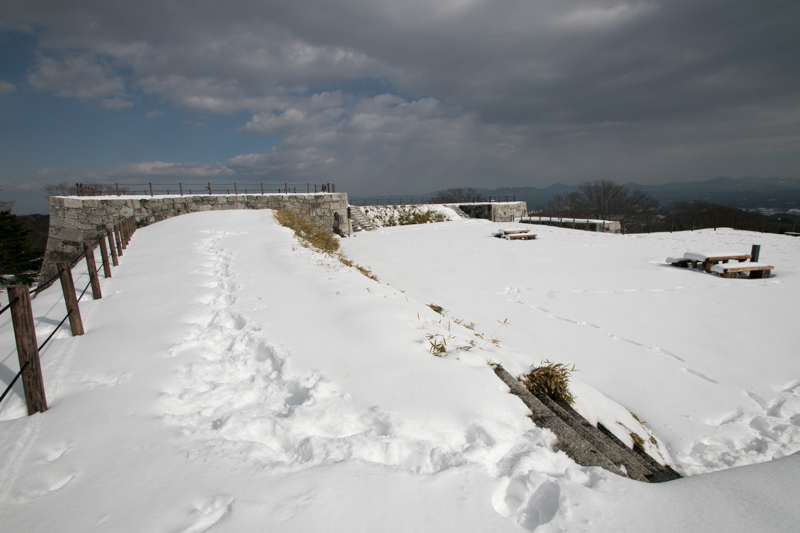 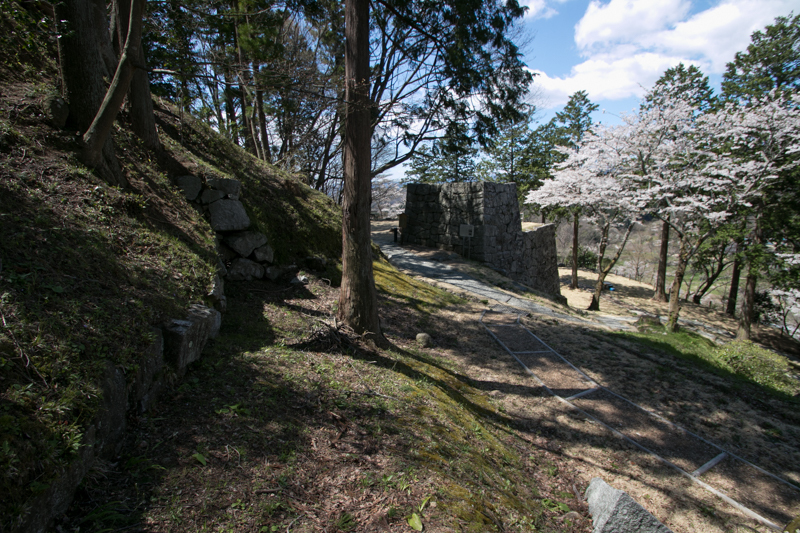 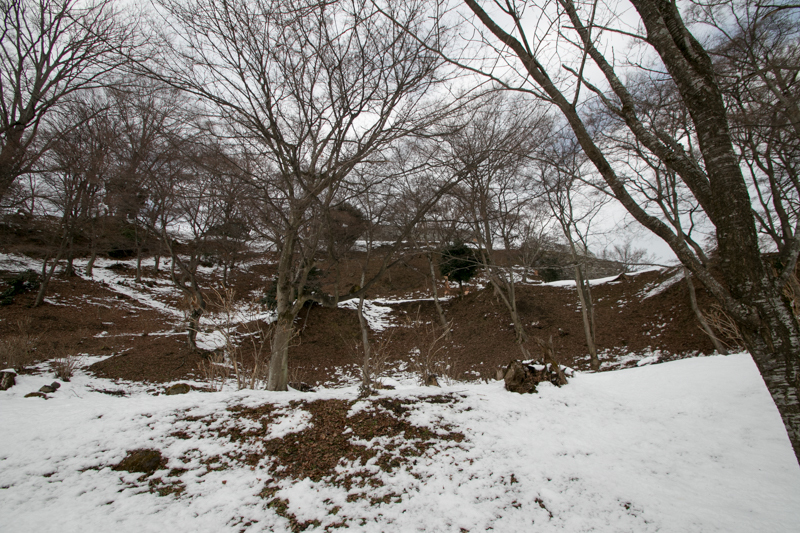 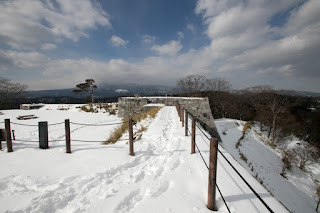 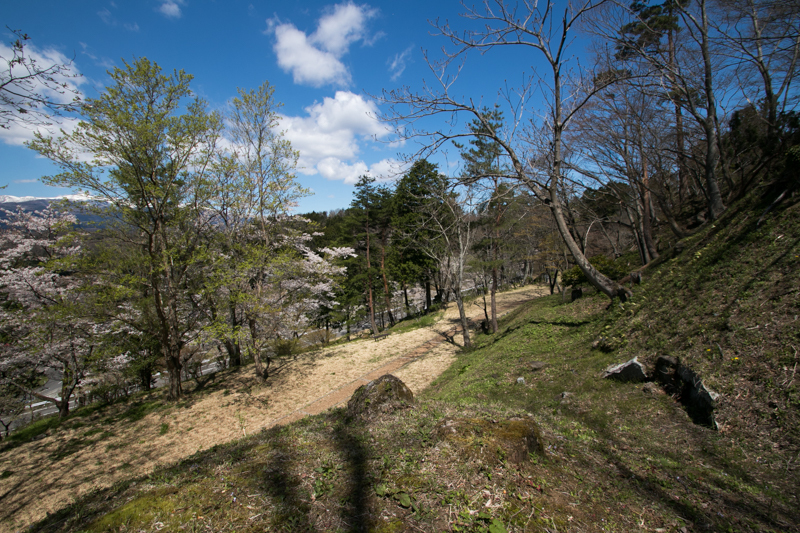 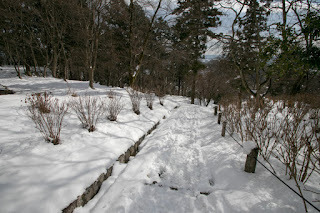 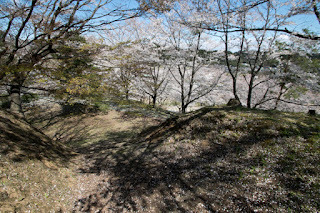 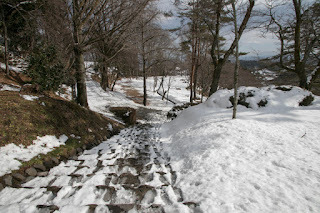 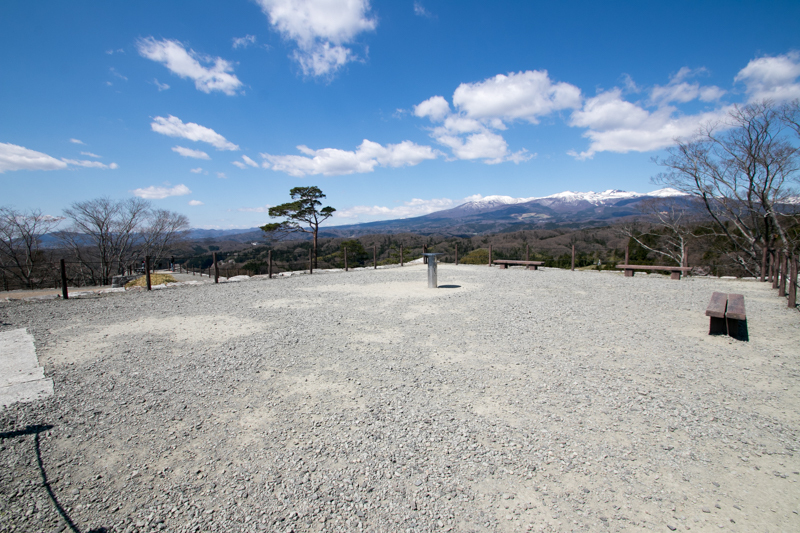 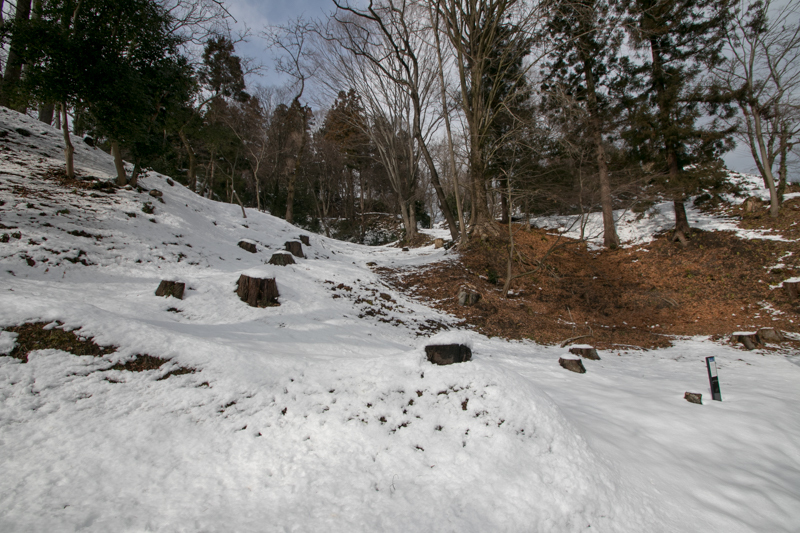 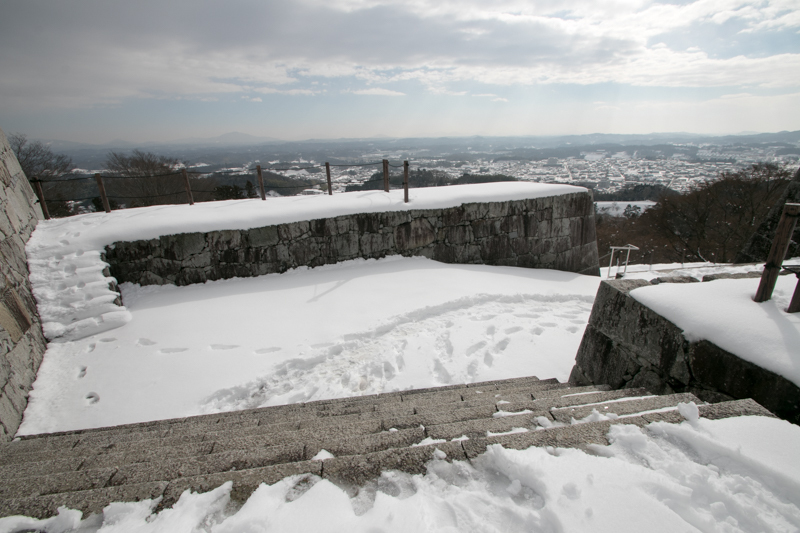 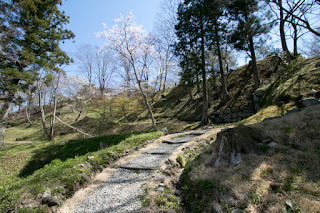 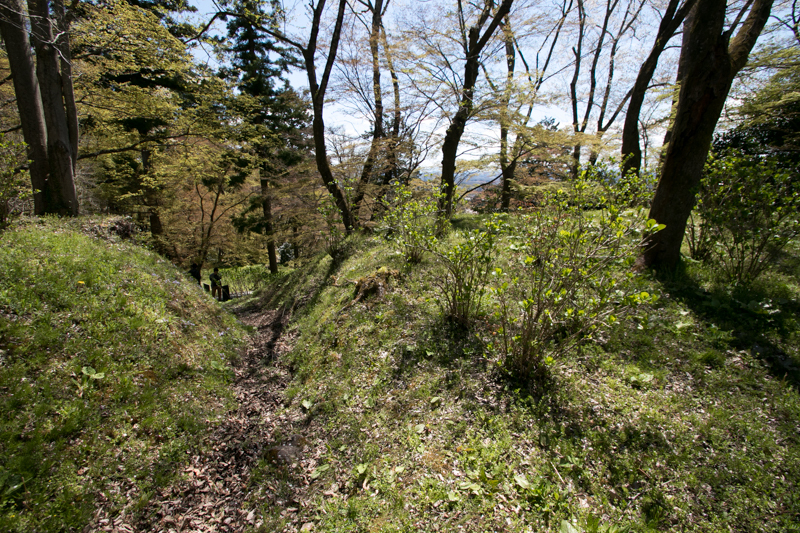 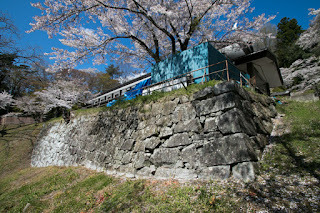 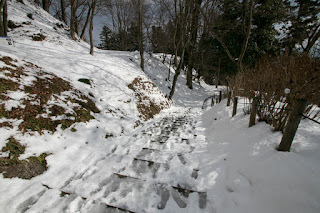 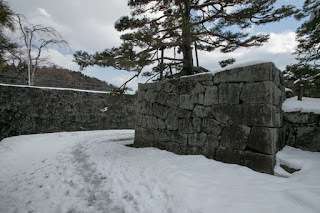 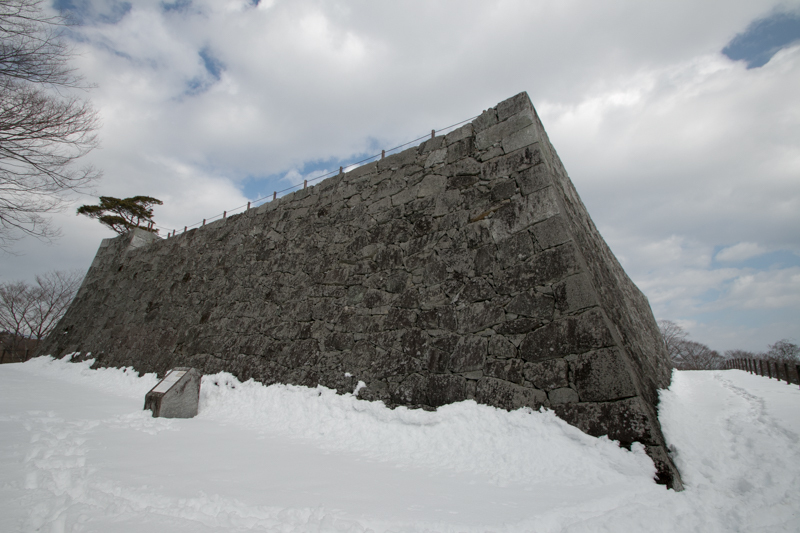 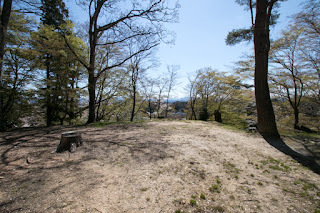 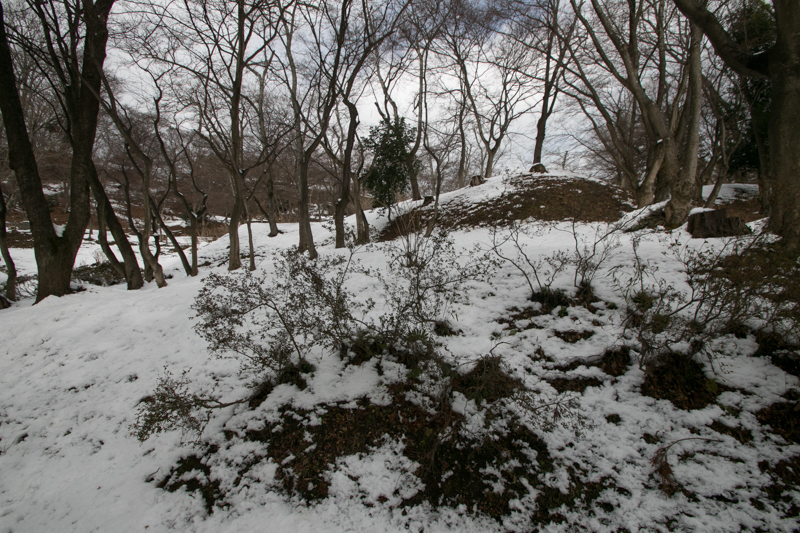 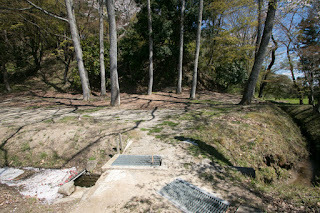 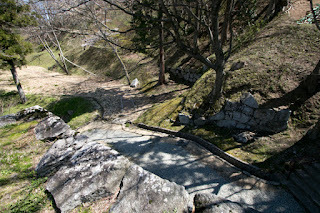 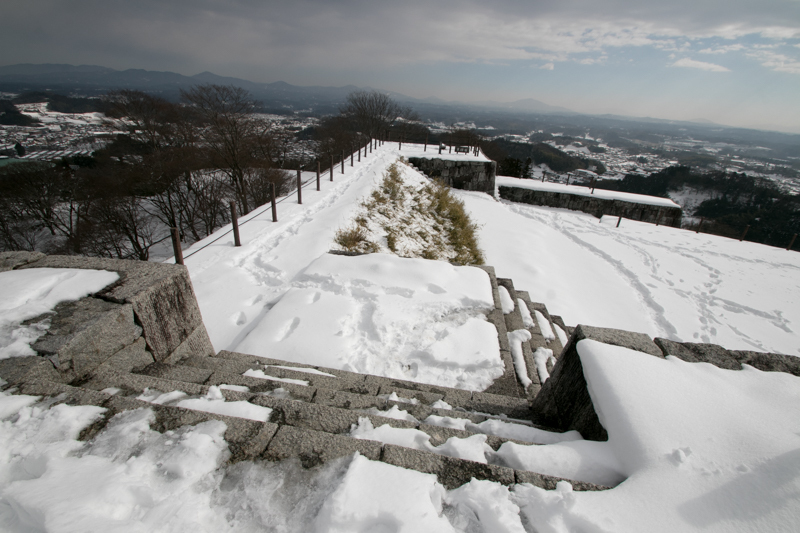 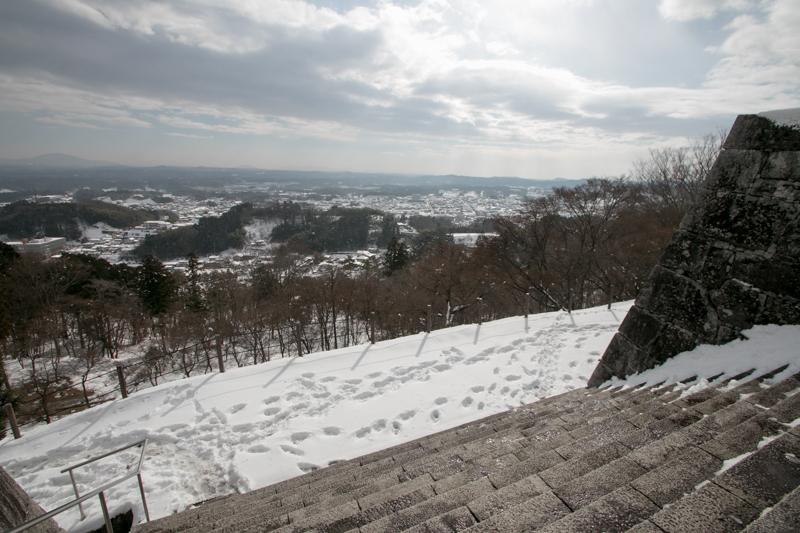 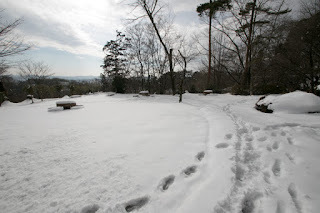 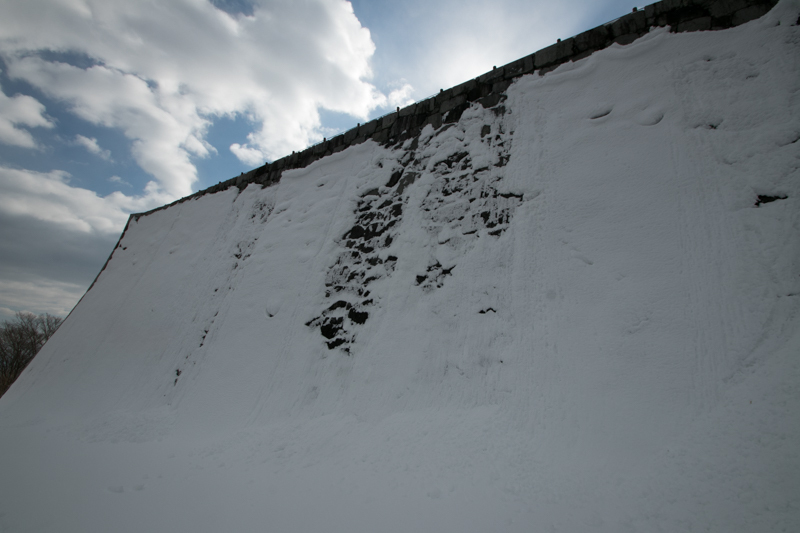 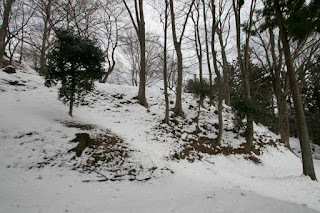 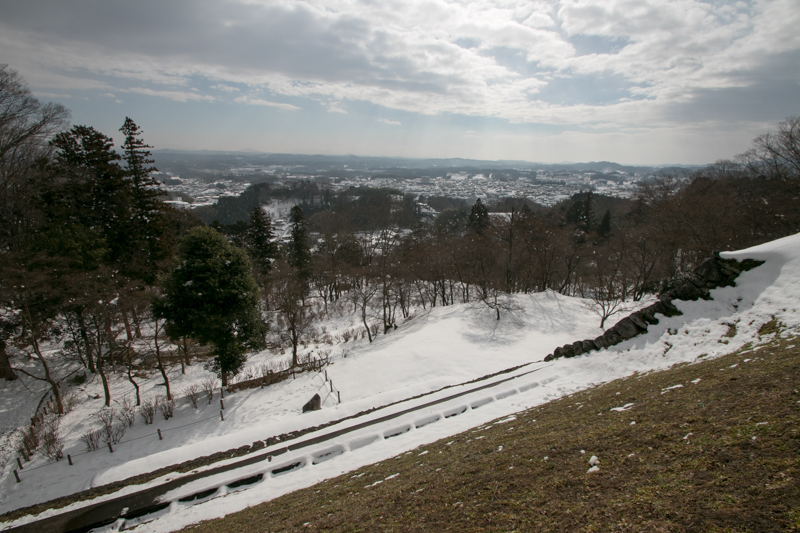 After the occupation, as Nihonmatsu castle became the front against Ashina clan. 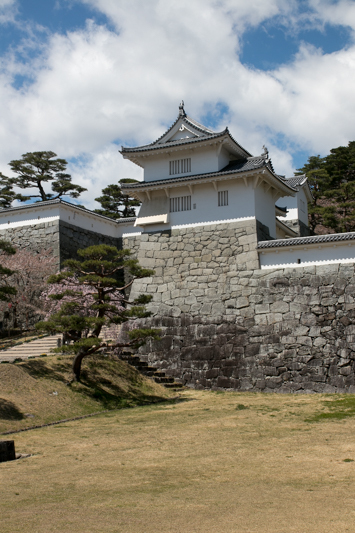 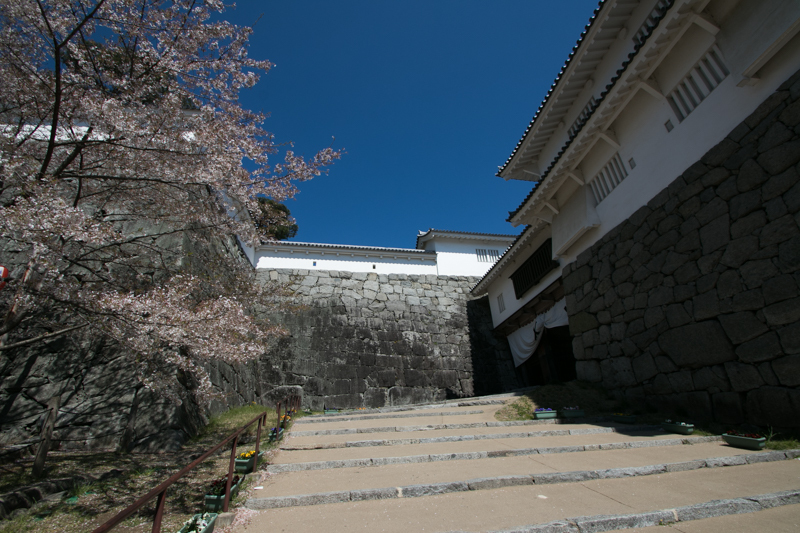 Masamune placed his important retainers on this castle. 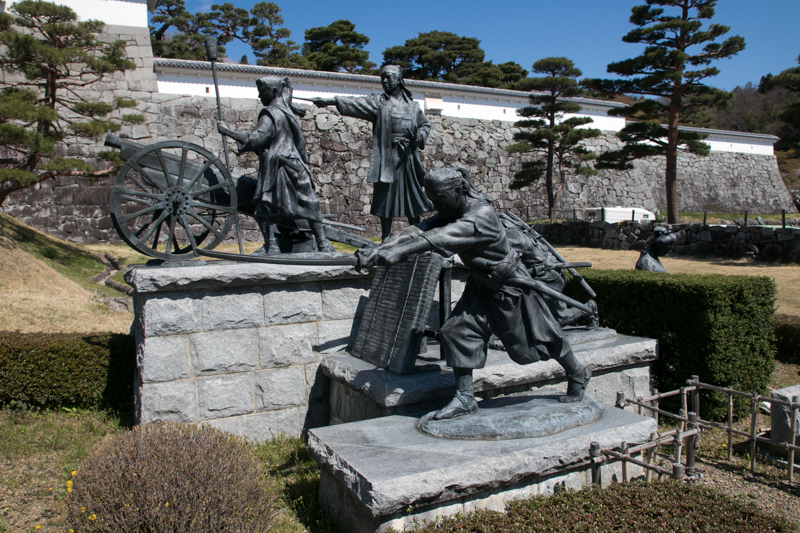 At first Kagetsuna Katakura (1557-1615), a general both had both braveness and intelligence grown up with Masamune, was appointed as a commander. 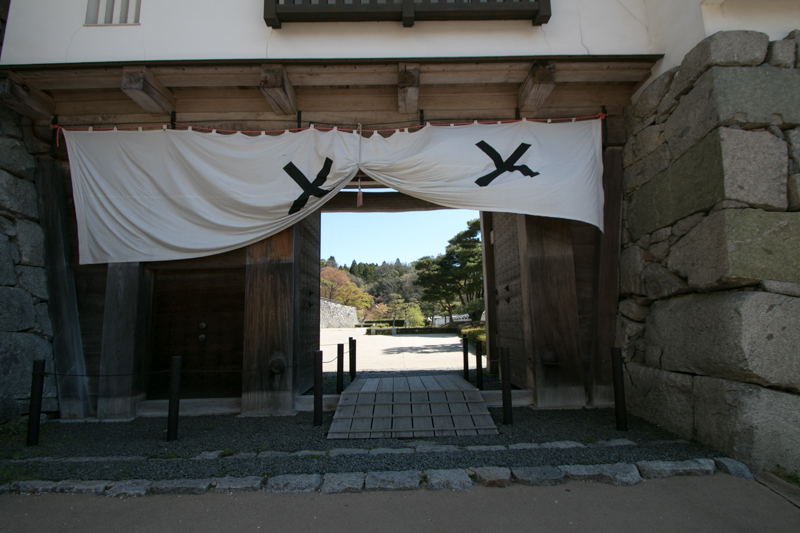 Next, Shigezane Date (1568-1646), a granduncle of Masamune, became the governor. 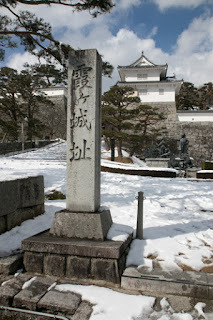 Equipping helmet with the mark of a hairly caterpillar because it means no retreat, Shigezane fought bravely and got many achievement among the battle with Ashina clan. Under the support of these generals Masamune defeat Ashina clan and became the largest power of Tohoku region in 1589, but finally had to subordinate to Hideyoshi Toyotomi (1537-1598), the ruler of central area and Nihonmatsu area was confiscated. 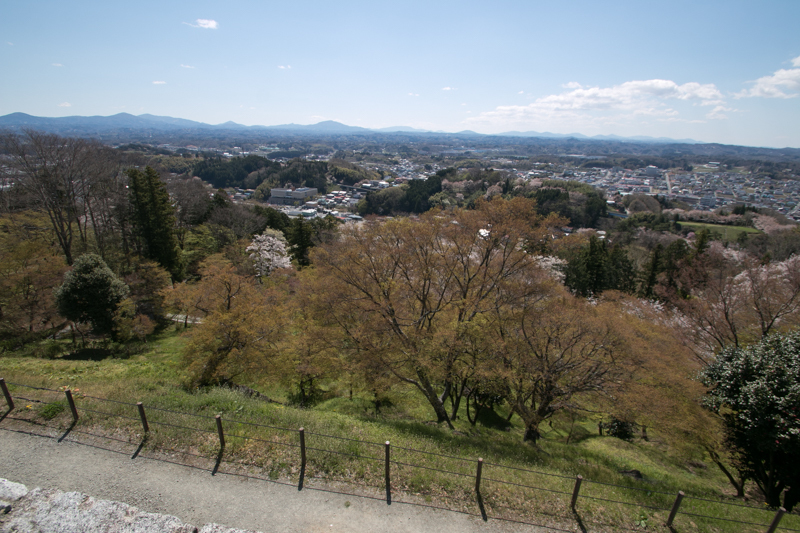 Under Toyotomi government, Nihonmatsu area was governed by Ujisato Gamo (1556-1595), a large lord of 900,000 Koku (unit of rice crop) placed at Aizu Wakamatsu castle. 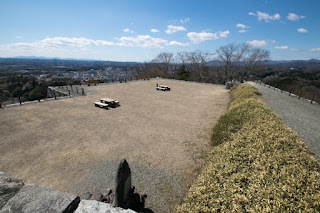 Ujisato was a multi talent lord equipped with intelligence, tactics and culture, and expected to restrain Date clan at Sendai castle and Ieyasu Tokugawa (1543-1616), the largest lord at Edo castle. 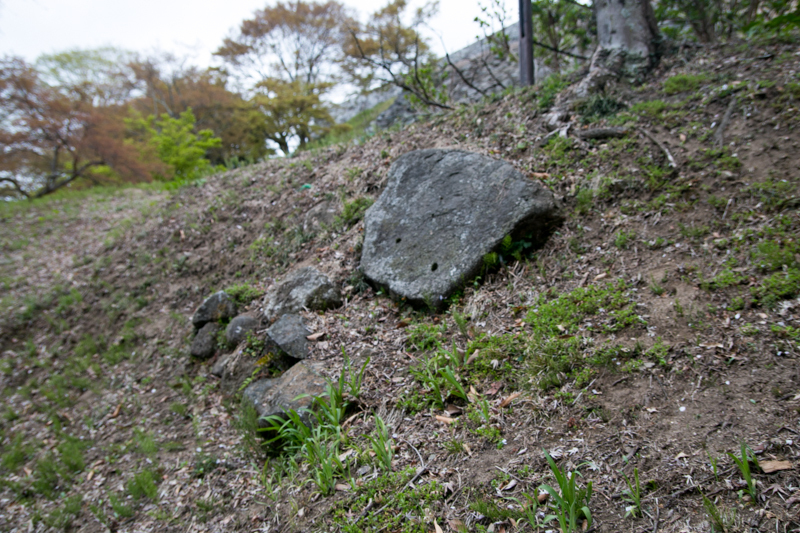 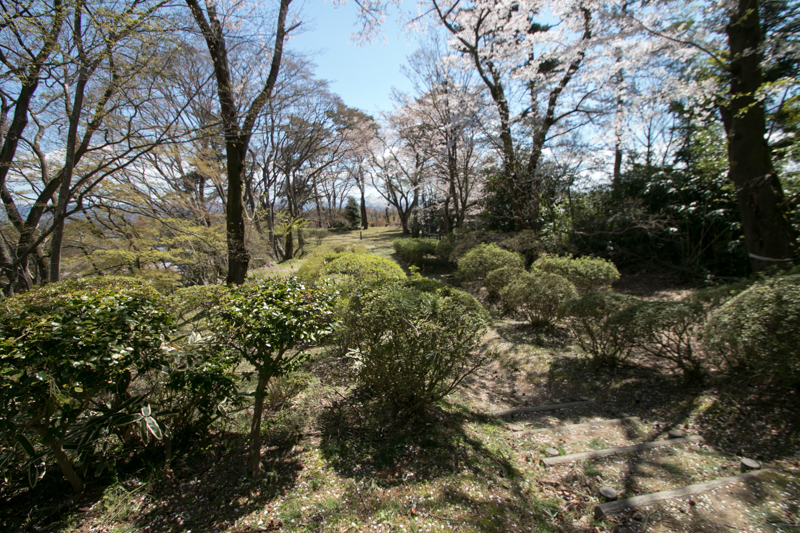 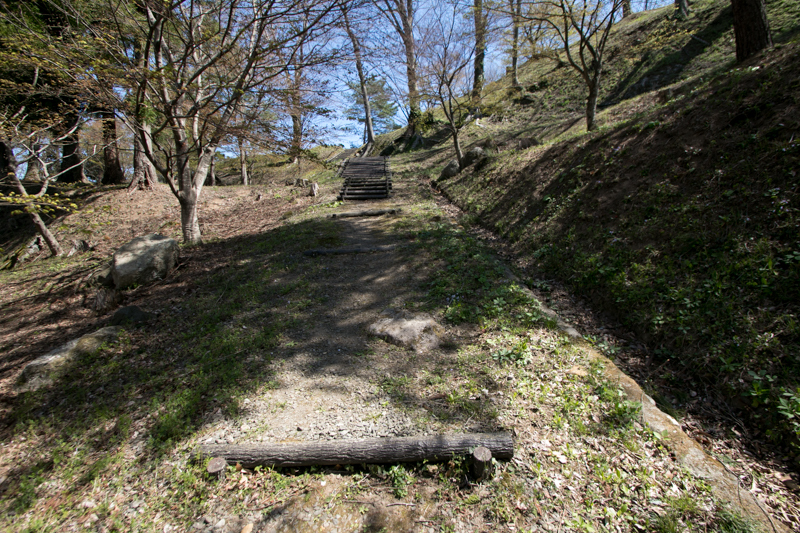 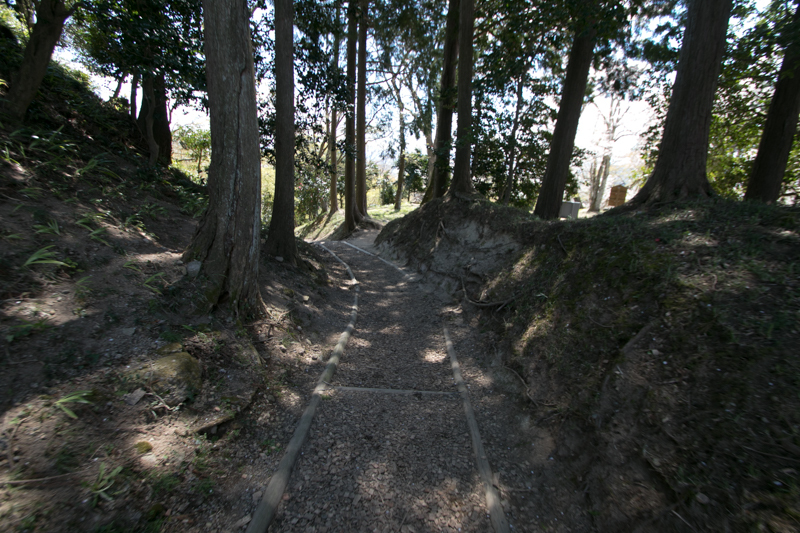 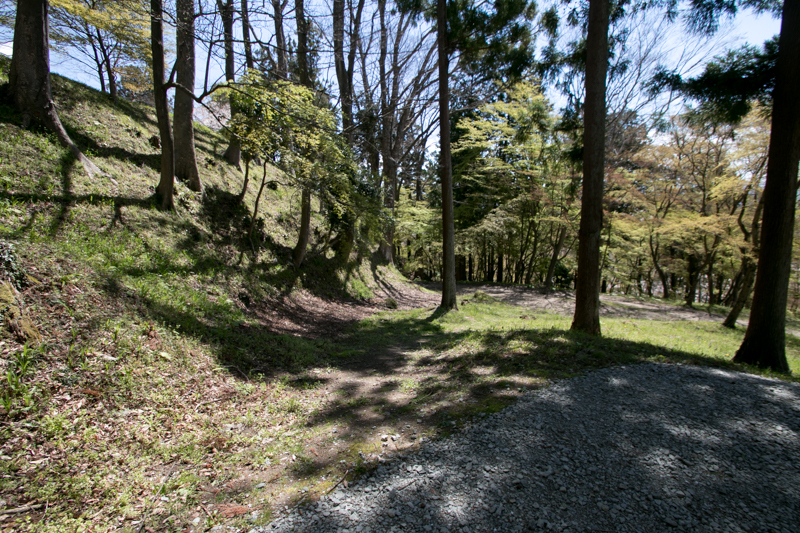 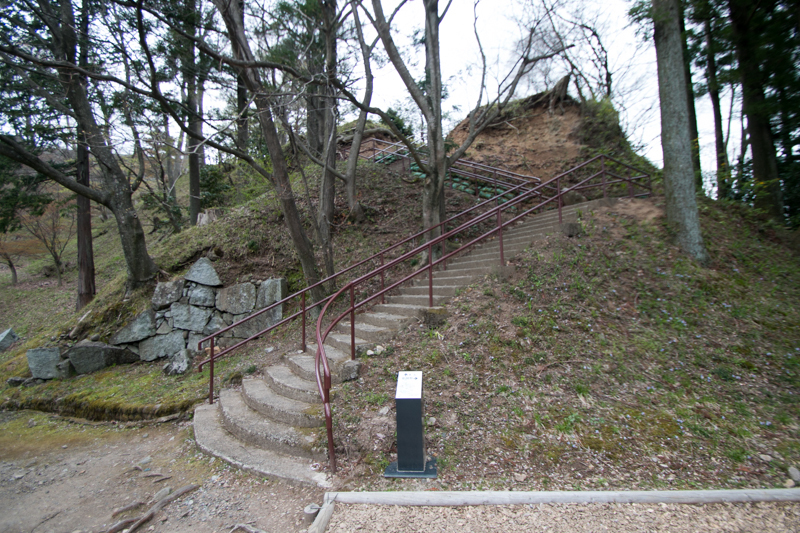 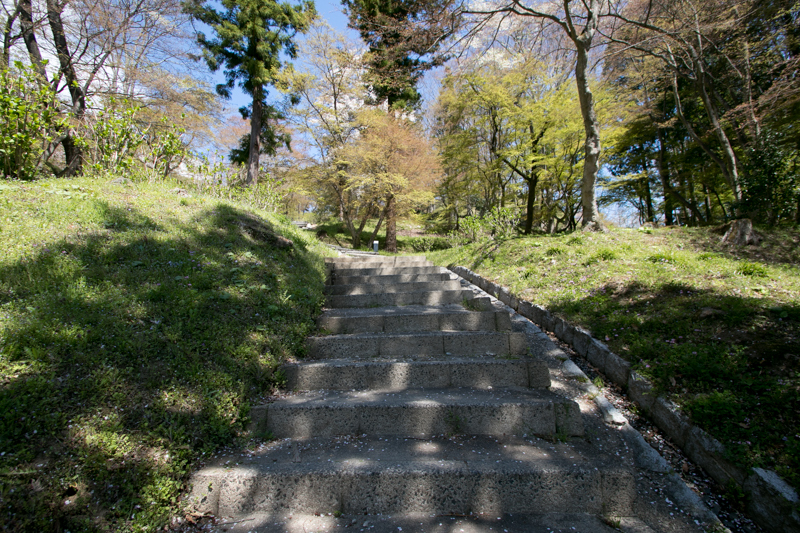 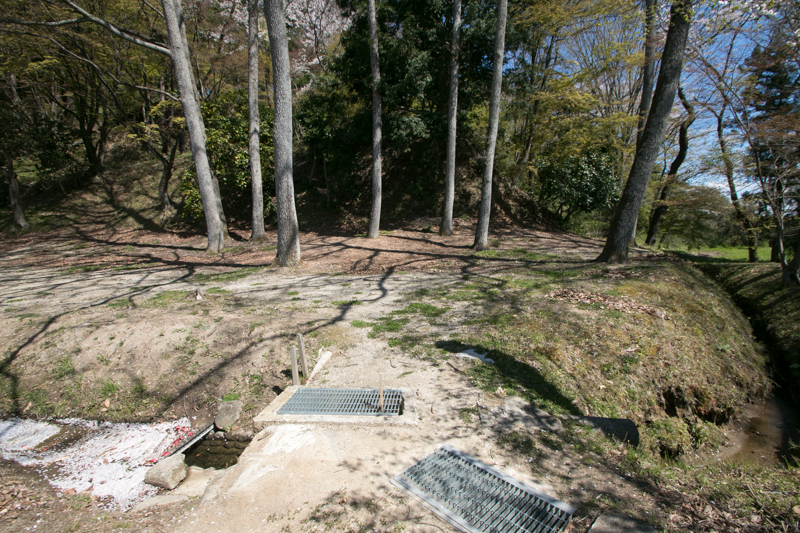 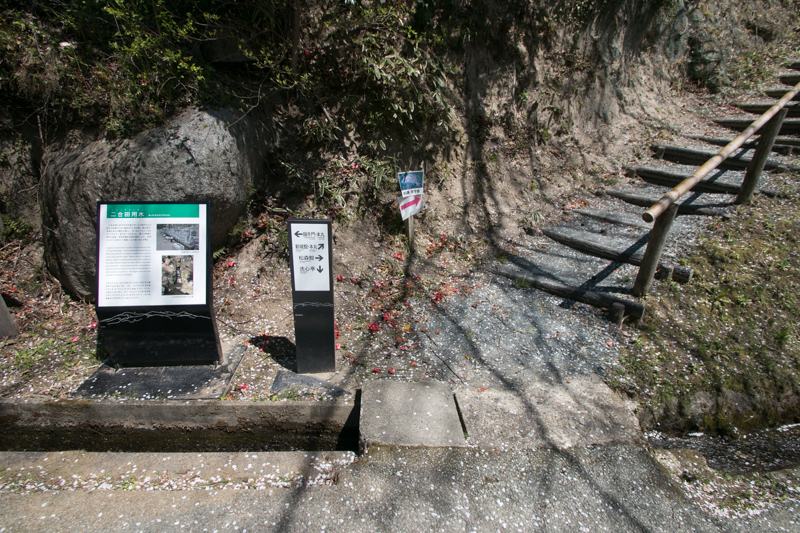 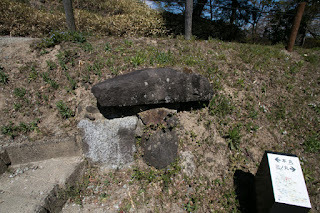 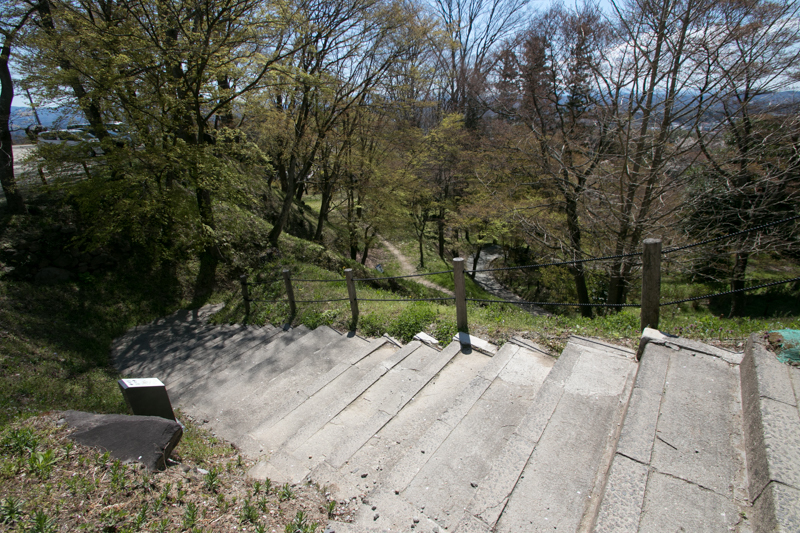 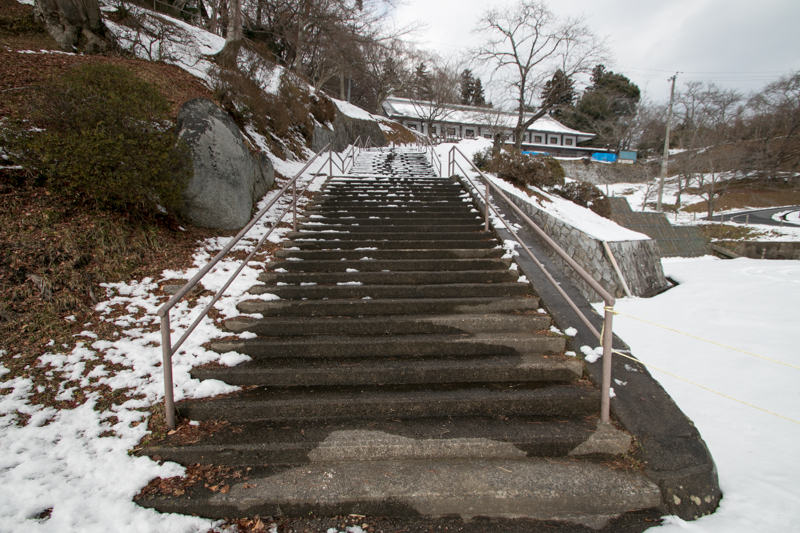 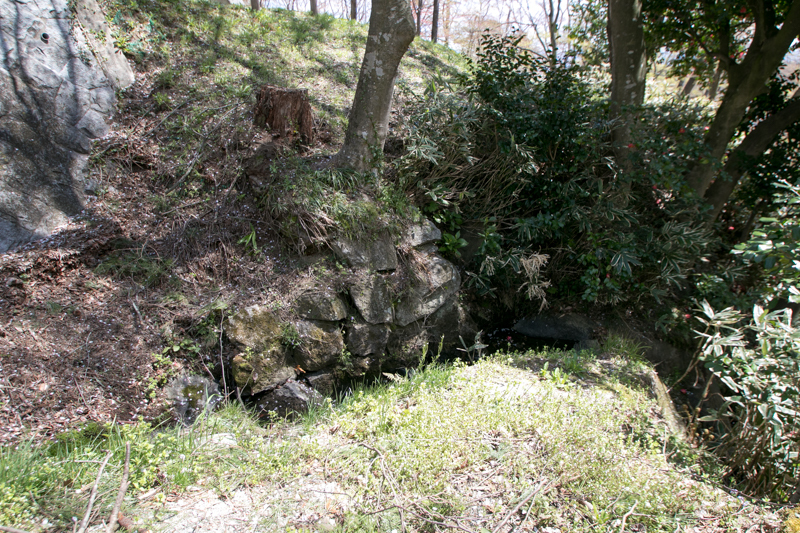 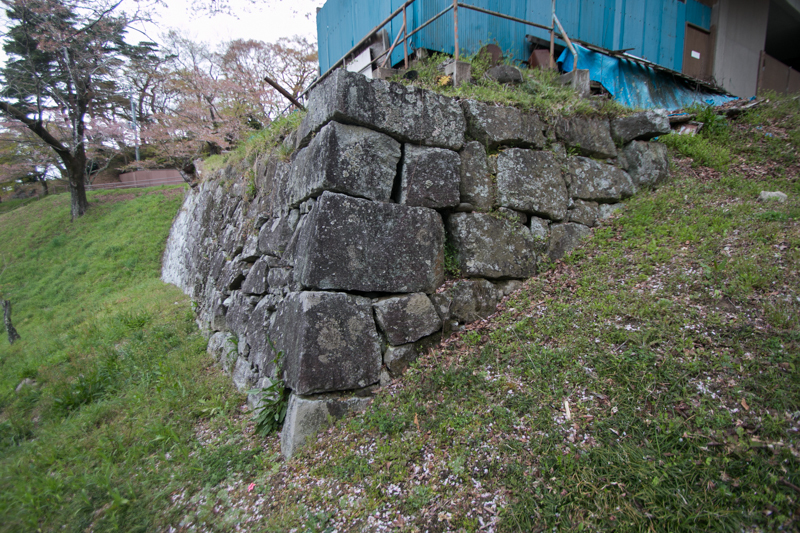 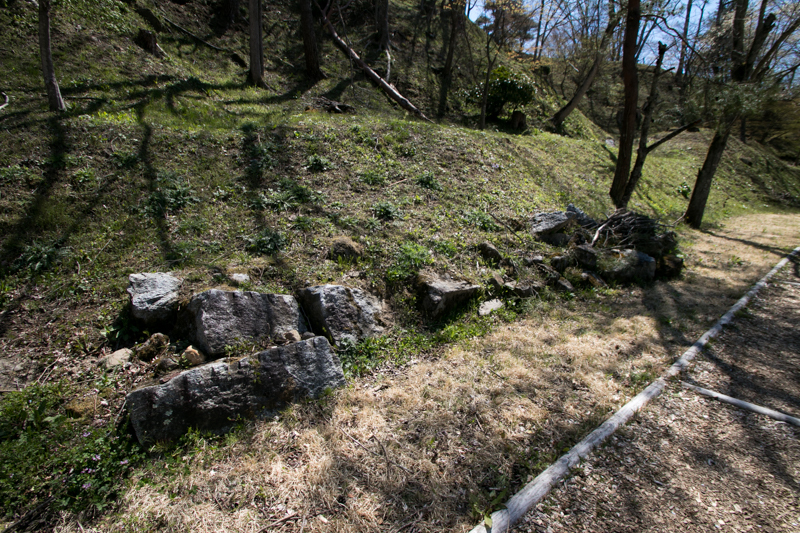 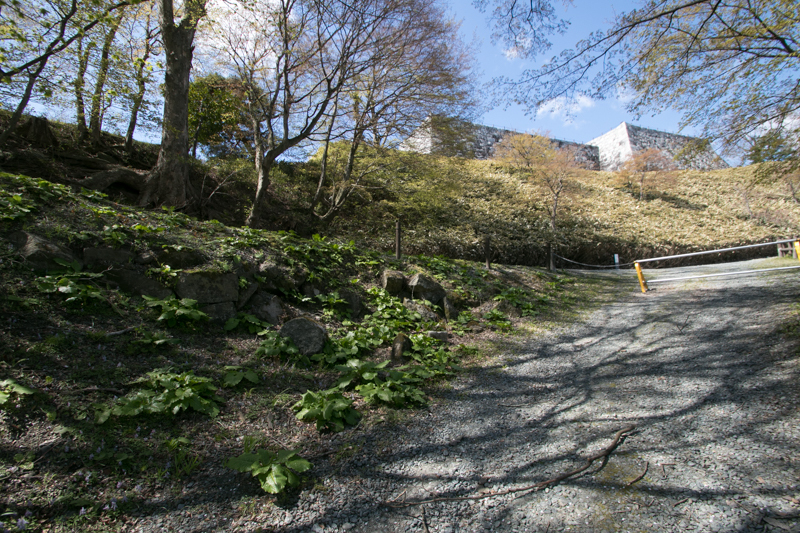 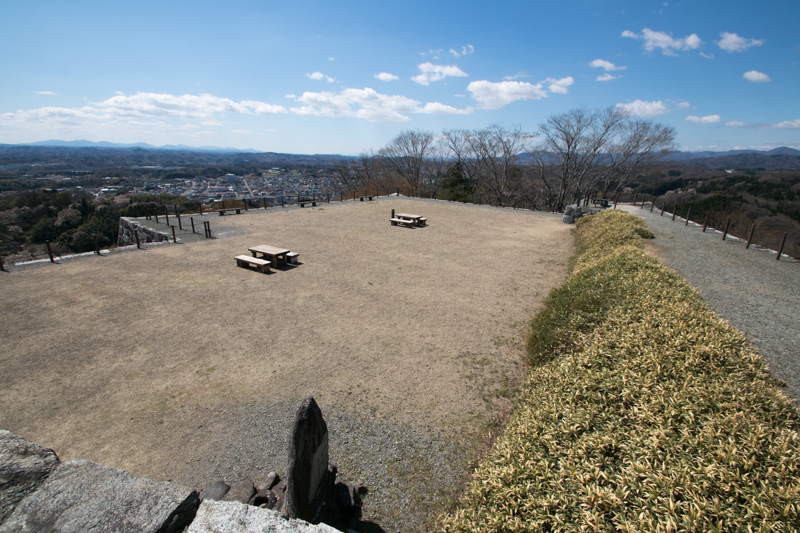 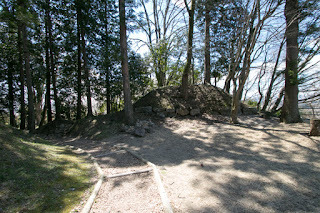 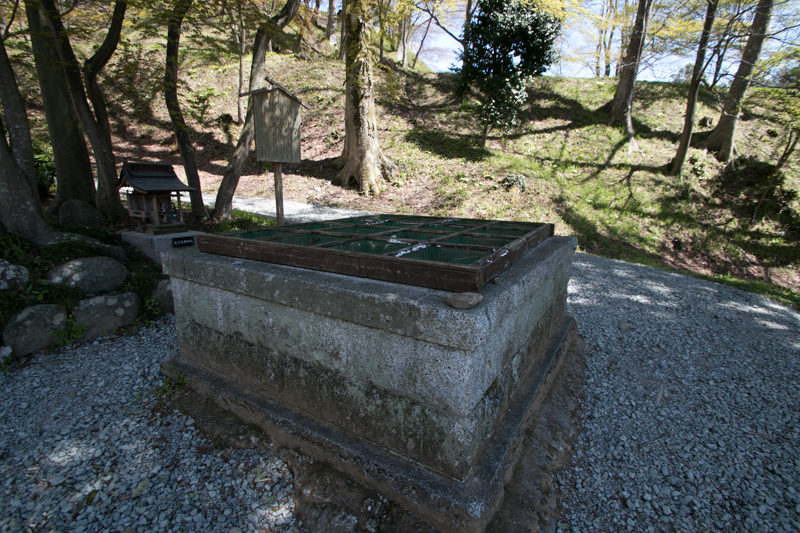 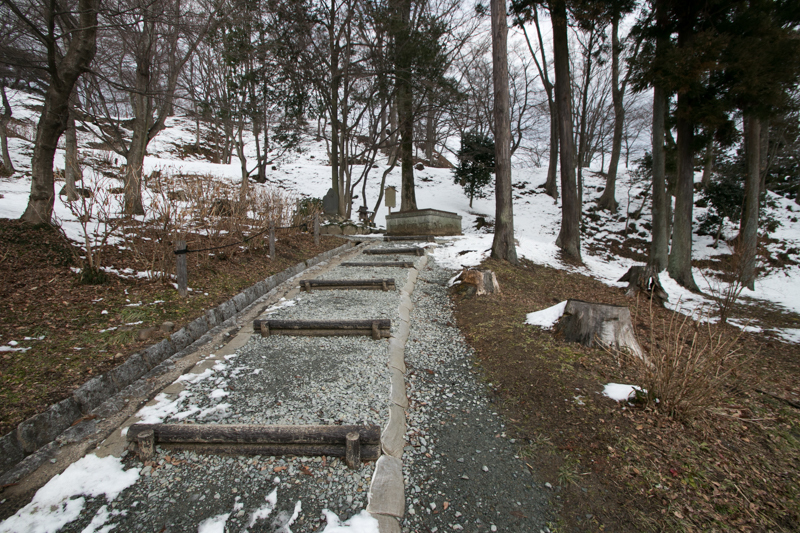 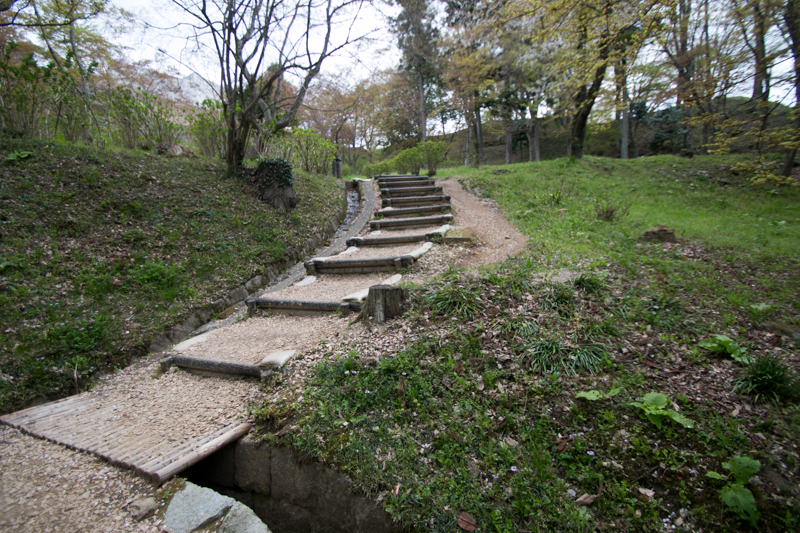 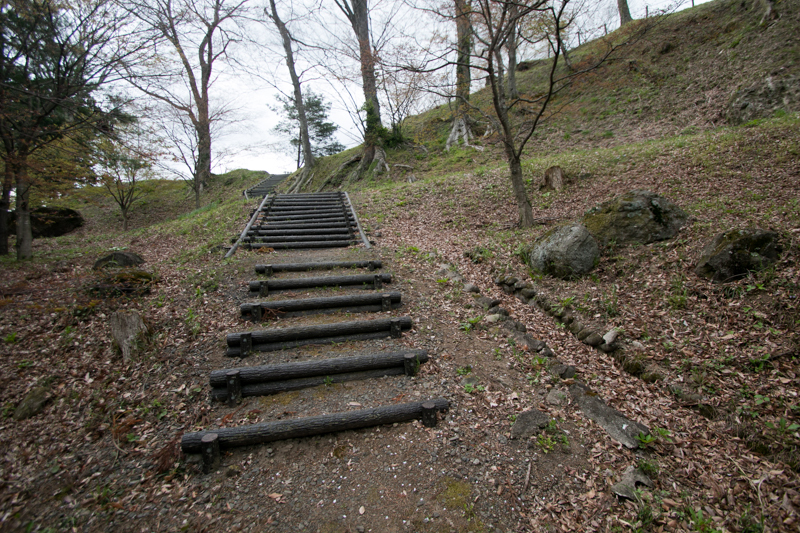 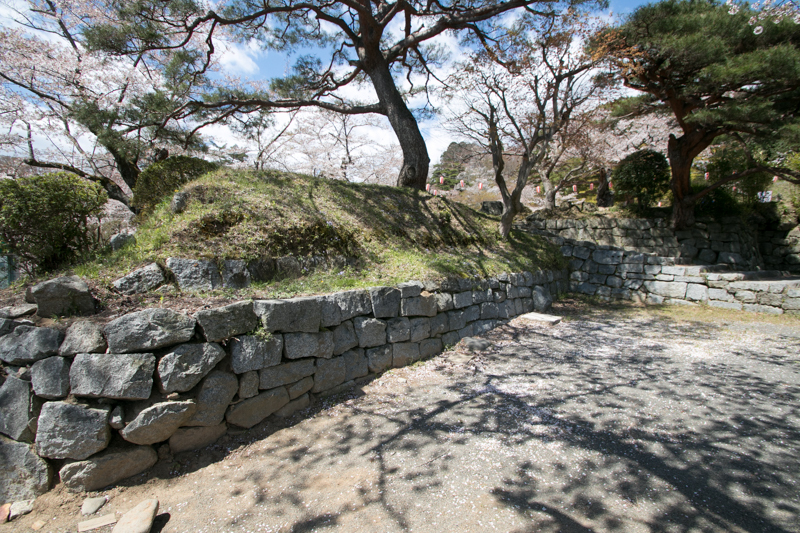 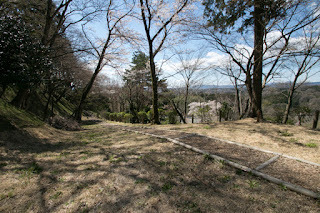 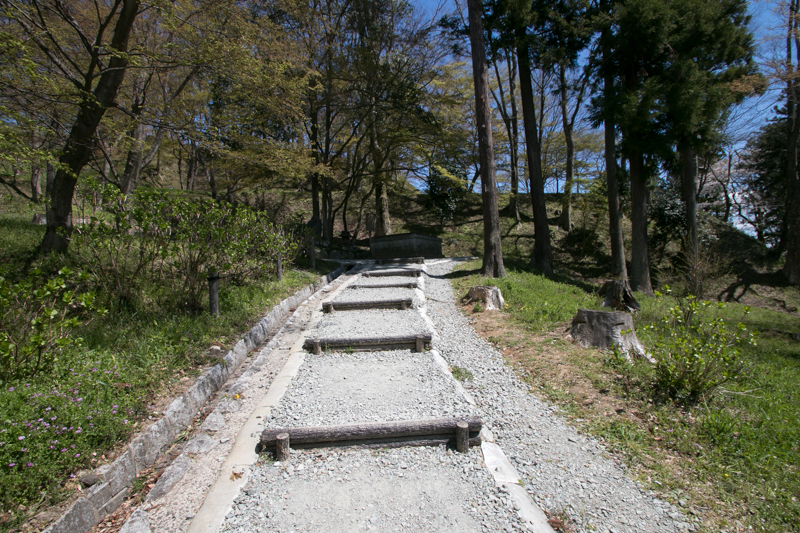 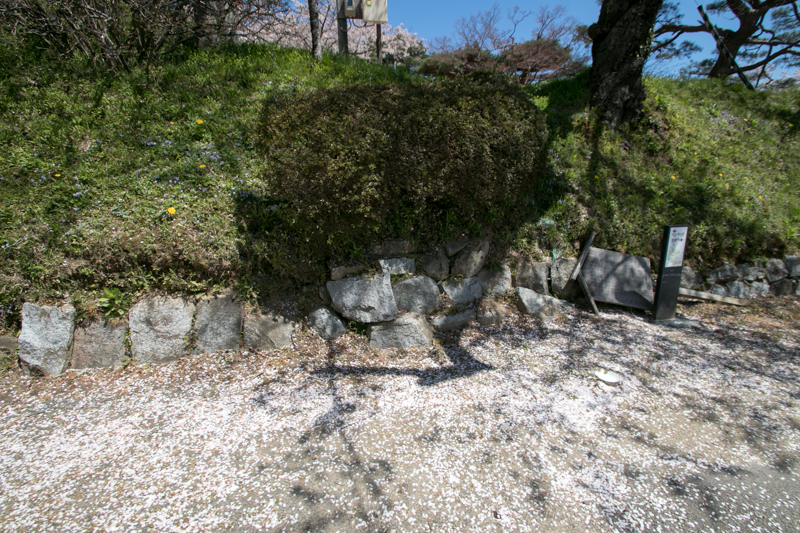 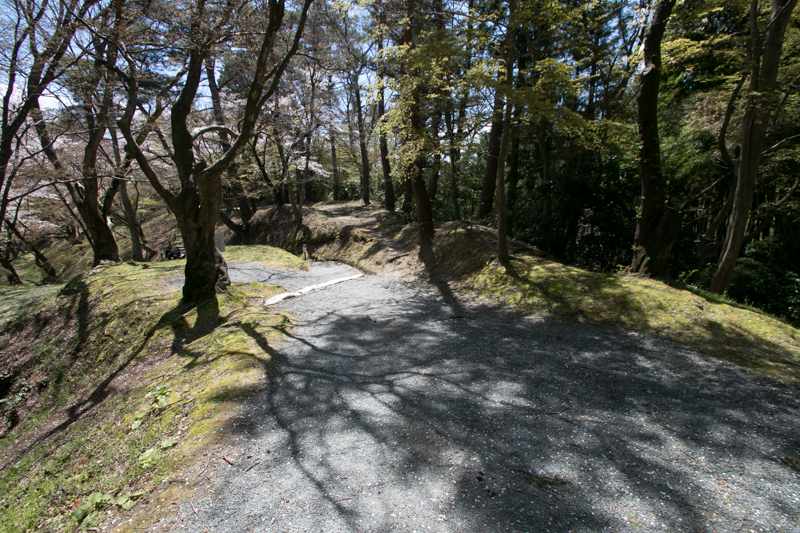 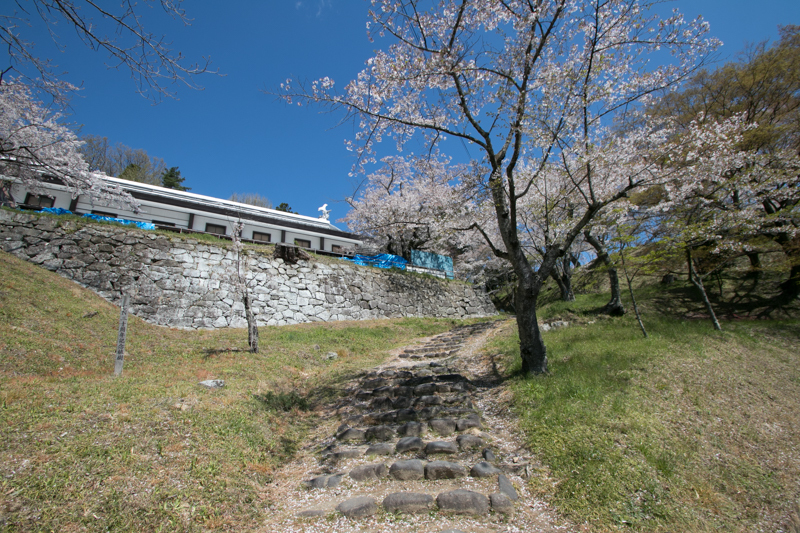 Ujisato placed Satinari Gamo (?-1614), his important retainer on Nihonmatsu Castle. 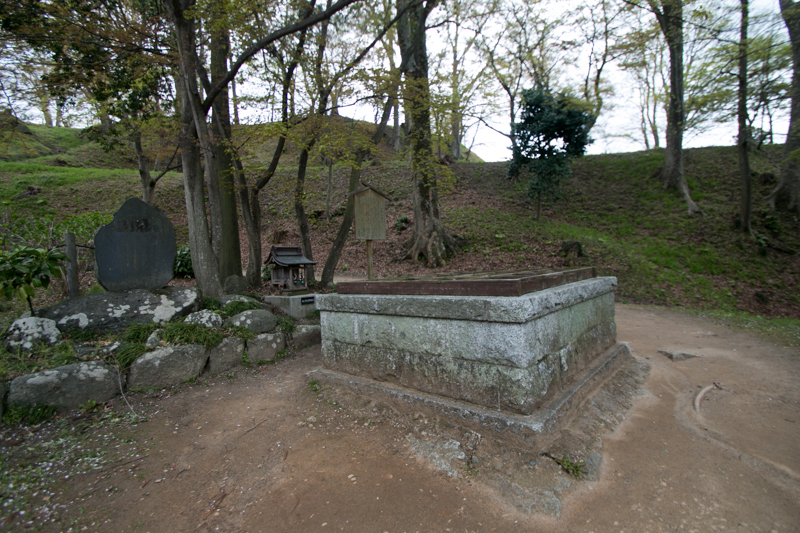 After the death of Ujisato, Kagekatsu Uesugi (1556-1623) became the lord of 1,200,000 koku at whole current Fukushima prefecture. Kagekatsu was an adopted son of famous warlord Kenshin Uesugi (1530-1578) who was praised as god of war, and one of five grand ministers of Toyotomi government. 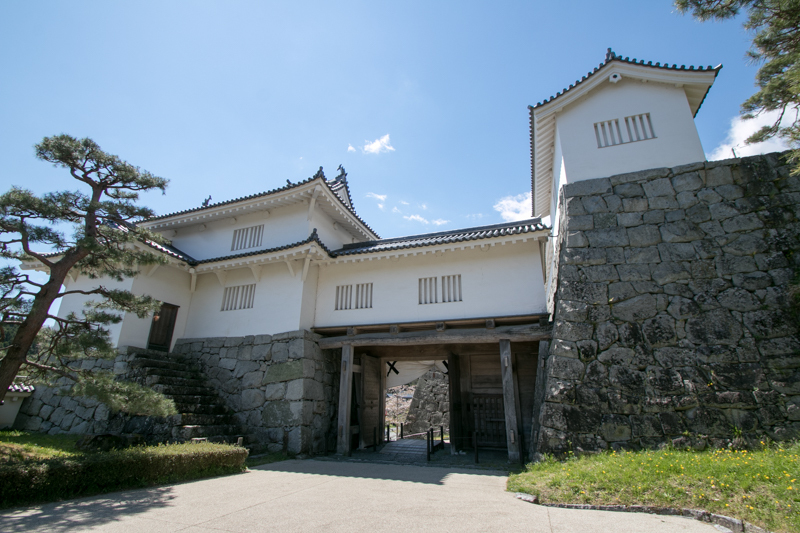 Kagekatsu was also expected to watch Masamune and Ieyasu, and Nihonmatsu castle was a backup place of Fukushima castle faced Date clan. 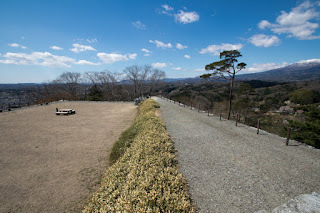 After the death of Hideyoshi, Kagekatsu hostiled to Ieyasu Tokugawa (1543-1616) in cooperation with Mitsunari Ishida (1560-1600), a chief administrative officer of Toyotomi government, but Mitsunari was defeated against Ieyasu at the battle of Sekigahara. 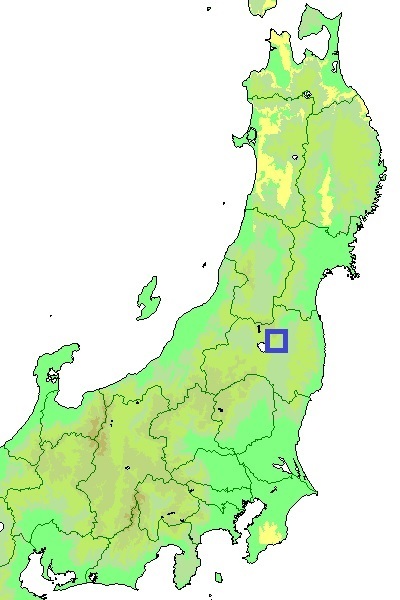 Kagekatsu was finally forgiven by Ieyasu but two third of its territories including Nihonmatsu area. 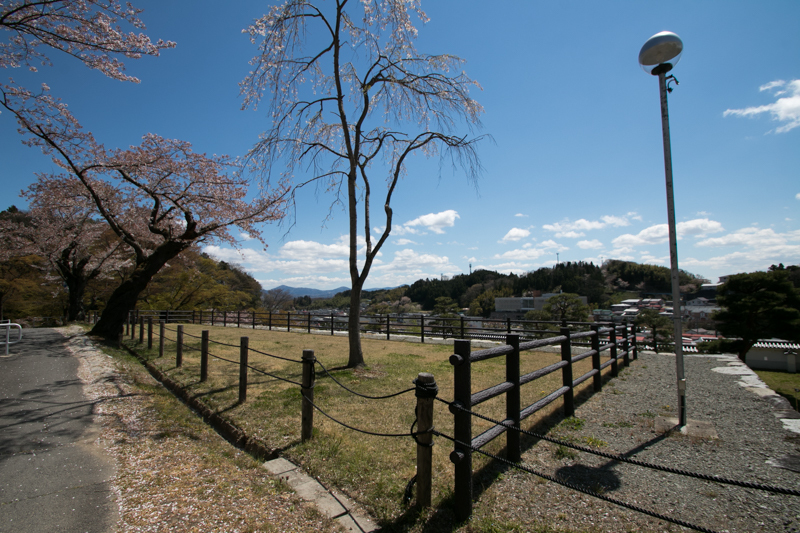 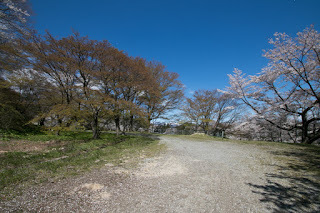 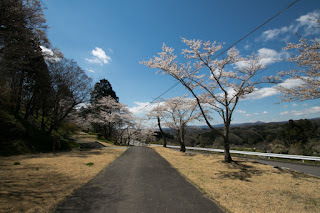 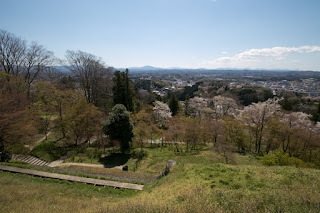 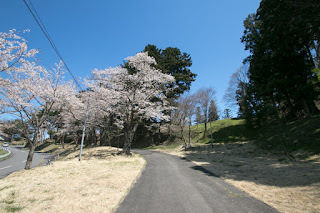 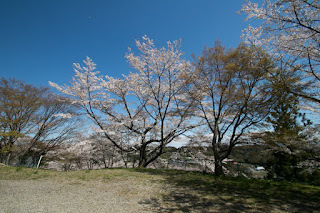 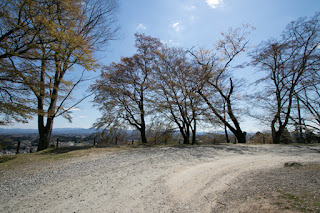 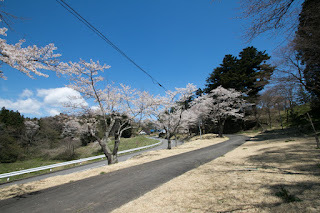 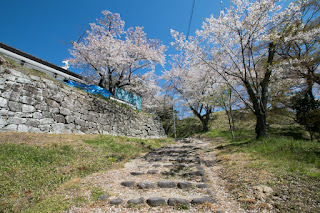 Under Edo shogunate, once Gamo clan came back to this area, but in 1627, Yoshiakira Kato (1563-1631) was transferred from Matsuyama castle of Iyo country (Ehime prefecture) to Aizu Wakamatsu castle and became the governor of this area. Yoshiakira was one of seven braves at the battle of Shizugatake and famous for building Matsuyama castle (Ehime prefecture). 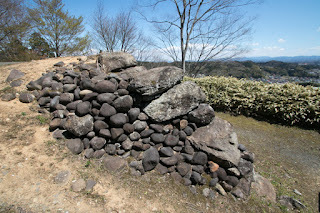 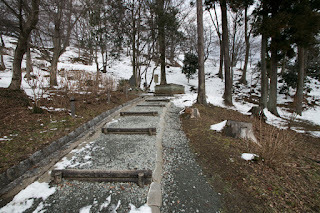 But in 1643 Gamo clan lost territory due to internal conflict. As a replacement, Niwa clan came here from Shirakawa castle. 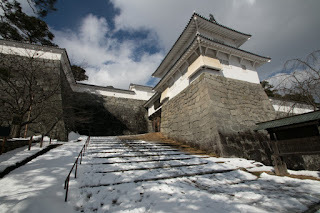 Niwa clan was a decendent of Nagahide Niwa (1535-1585), an important general of Nobunaga Oda (1534-1582) praised as Kome Goroza (quiet but indispensable like rice). 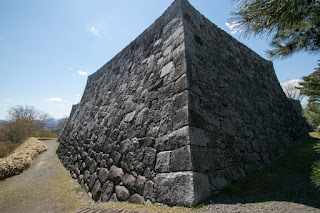 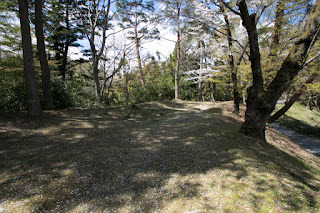 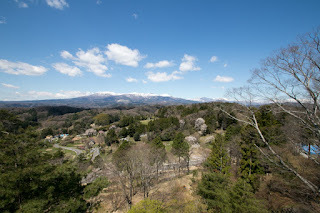 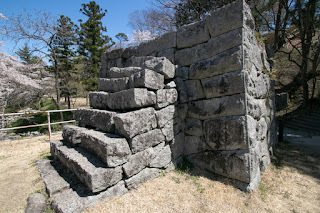 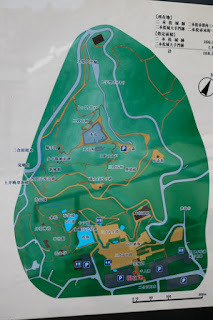 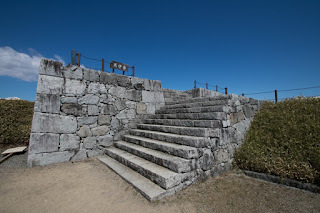 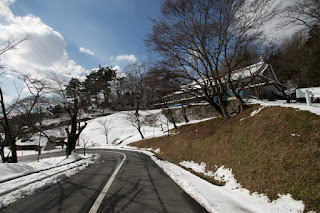 Niwa clan was also an excellent castle builders constructed Azuchi castle, Tanagura castle or Shirakawa castle, and they renovated Nihonmatsu castle as a residence of large lord. 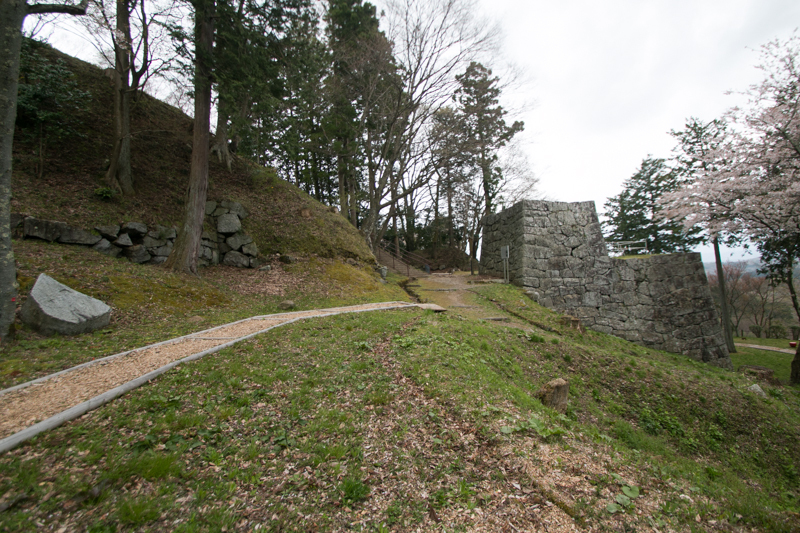 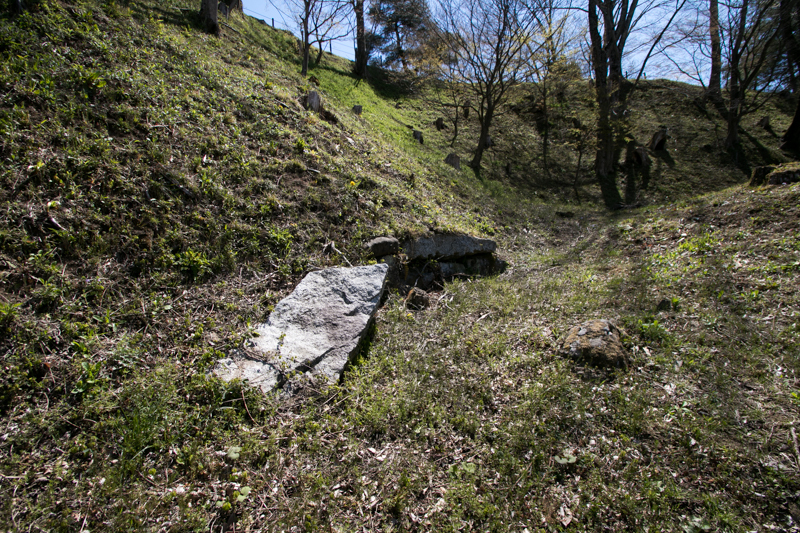 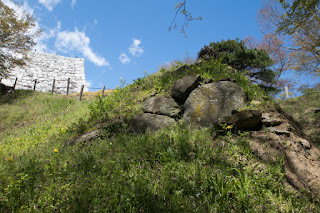 They expanded hillside area surrounded by stone walls, and also built a three-story turret and stone walls at the top of mountain. 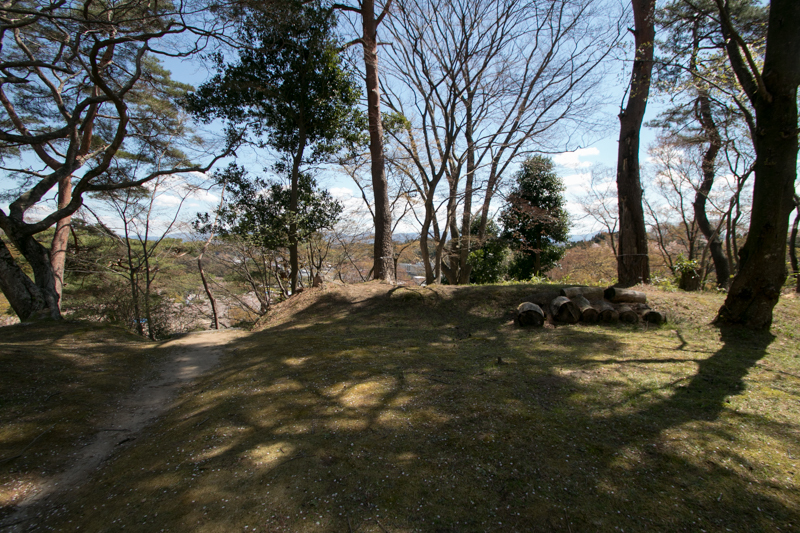 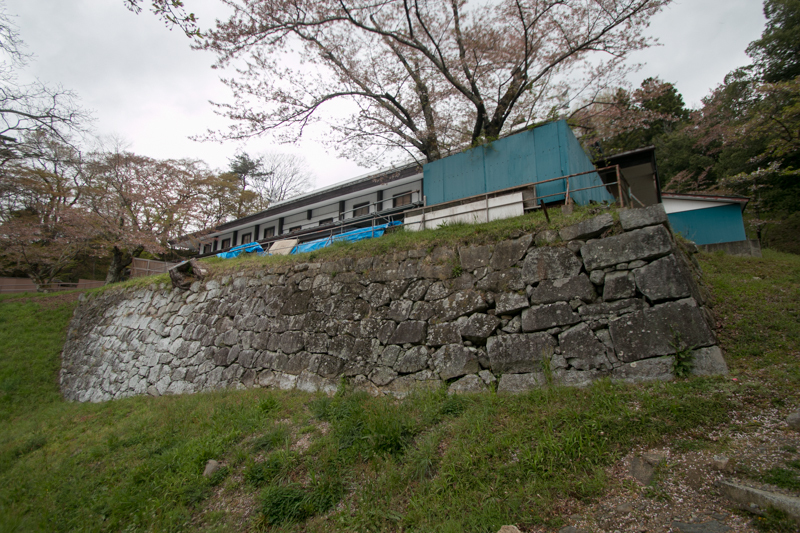 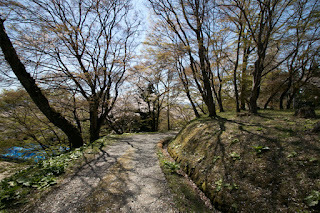 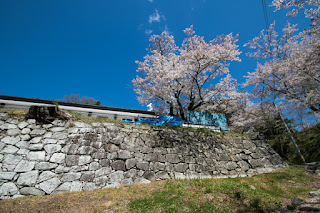 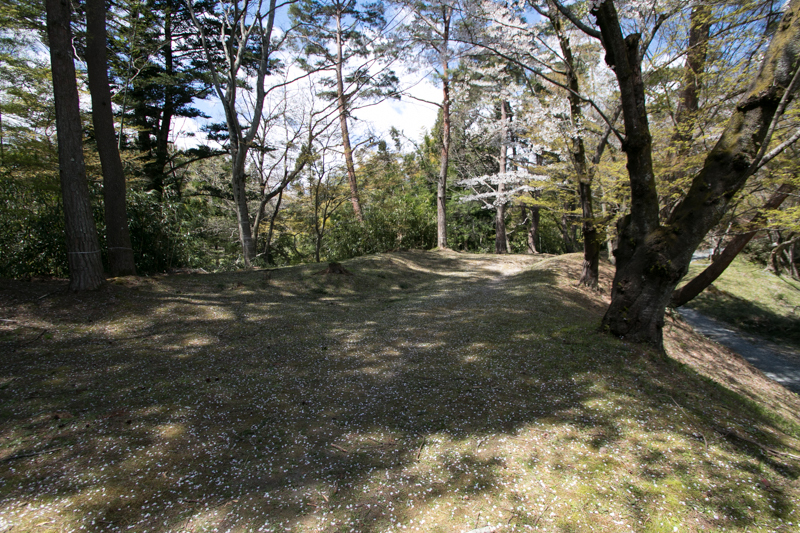 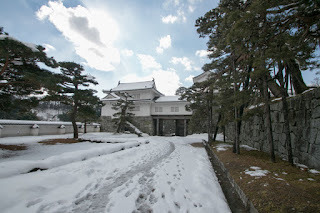 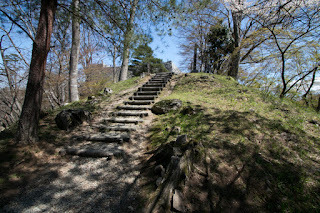 Niwa clan had kept this castle by the end of Edo era. 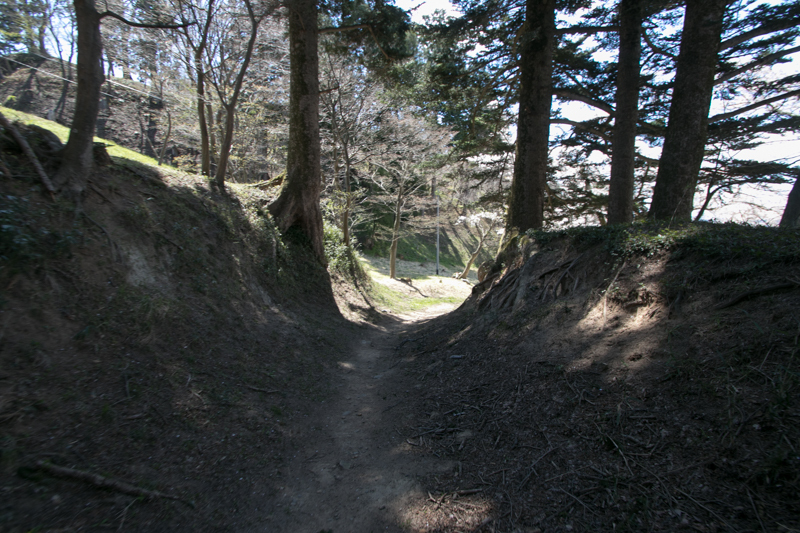 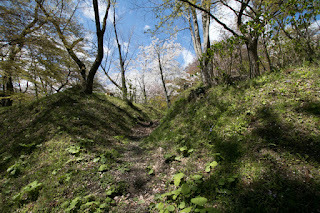 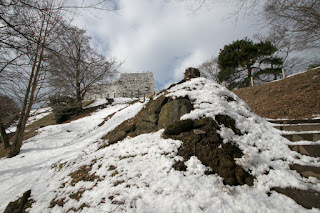 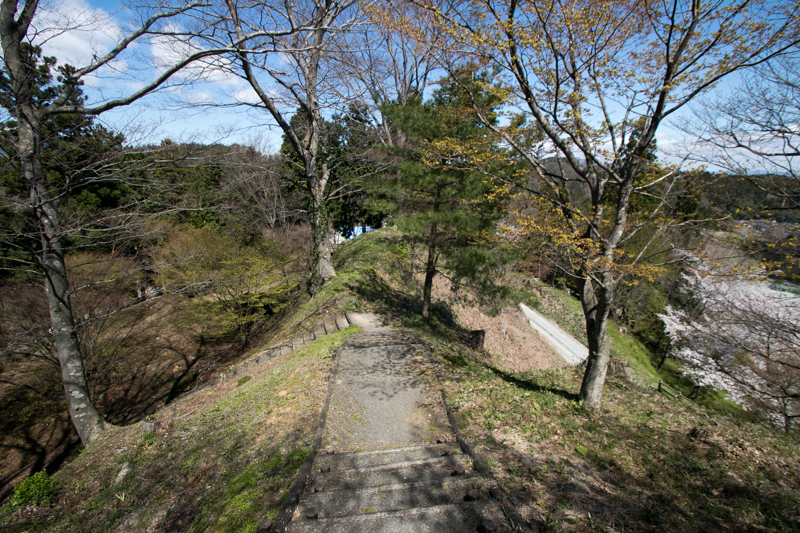 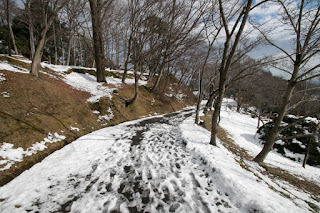 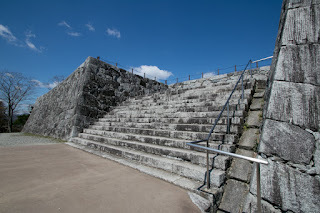 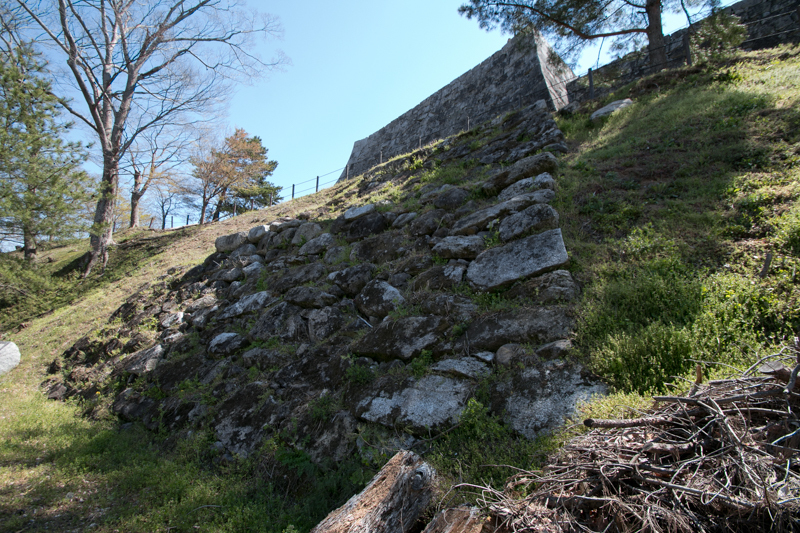 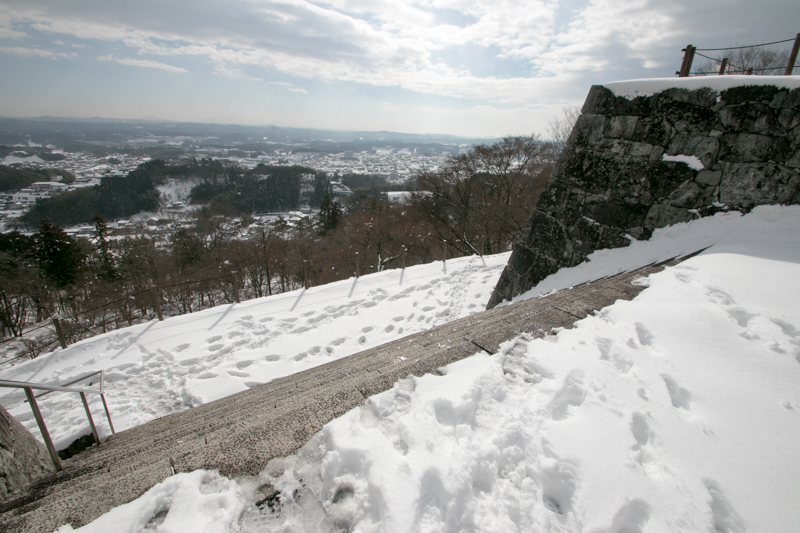 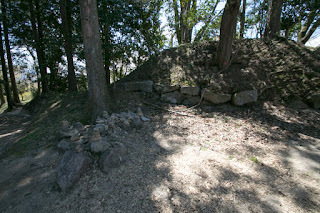 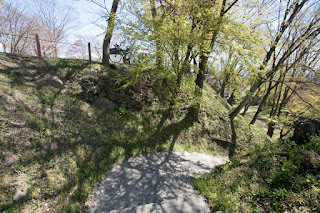 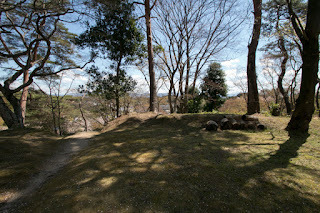 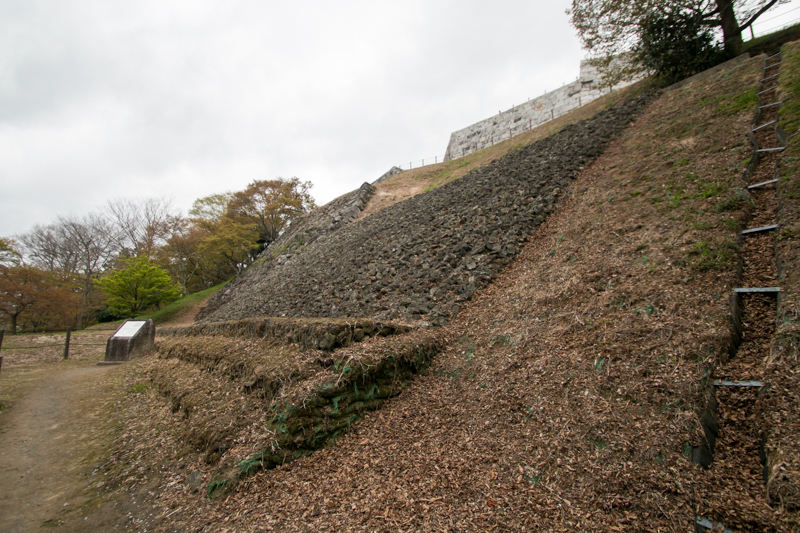 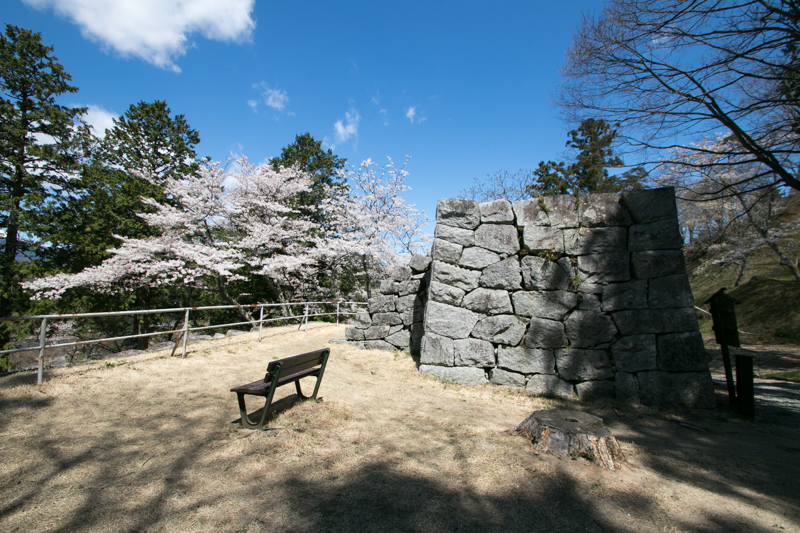 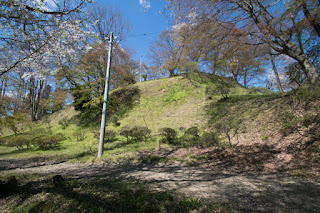 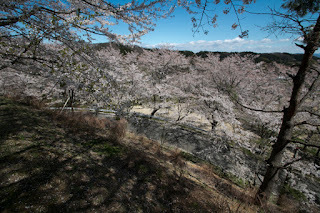 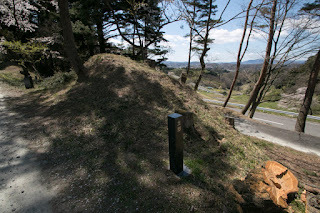 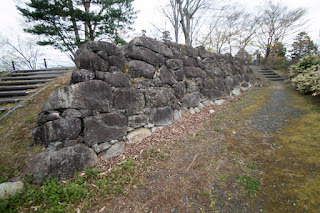 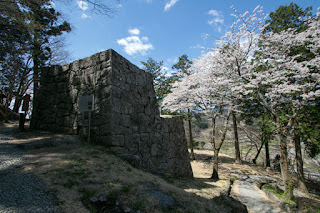 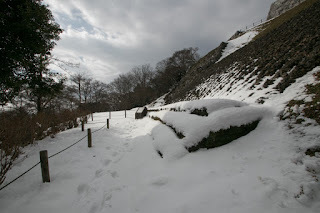 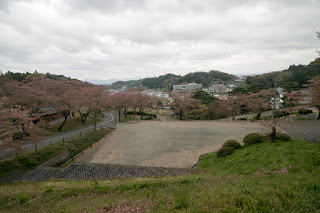 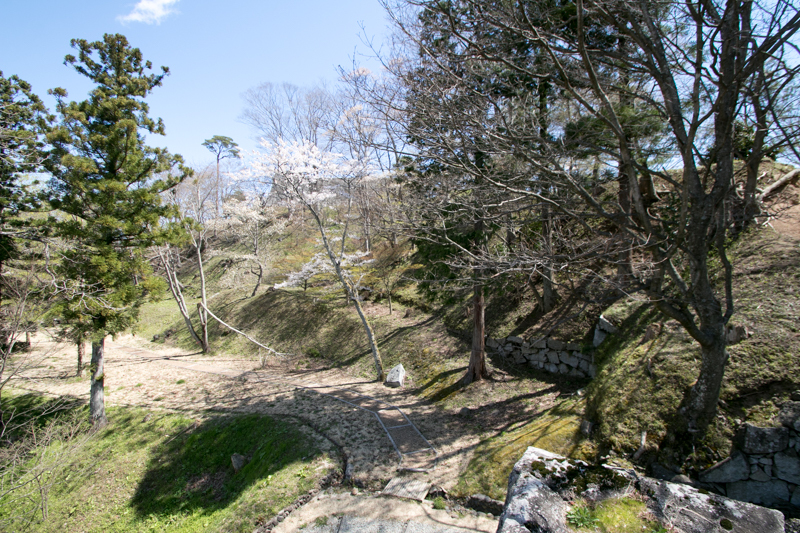 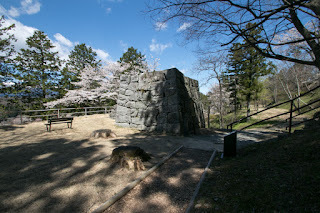 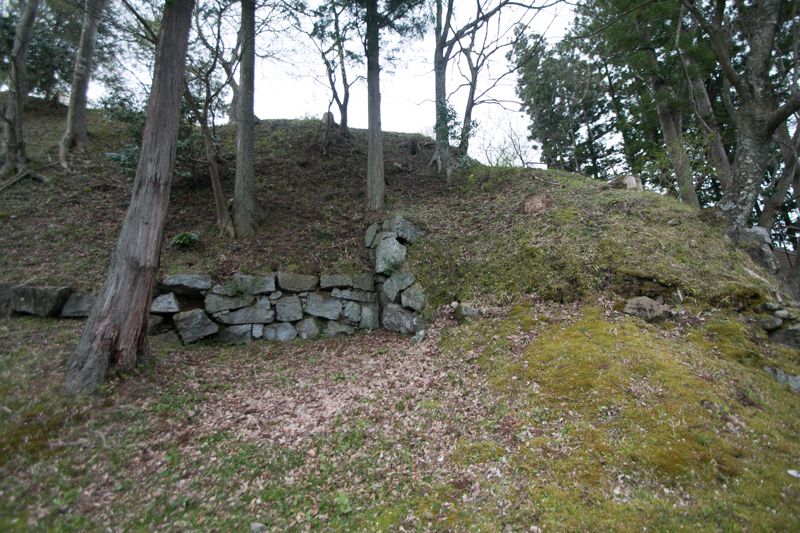 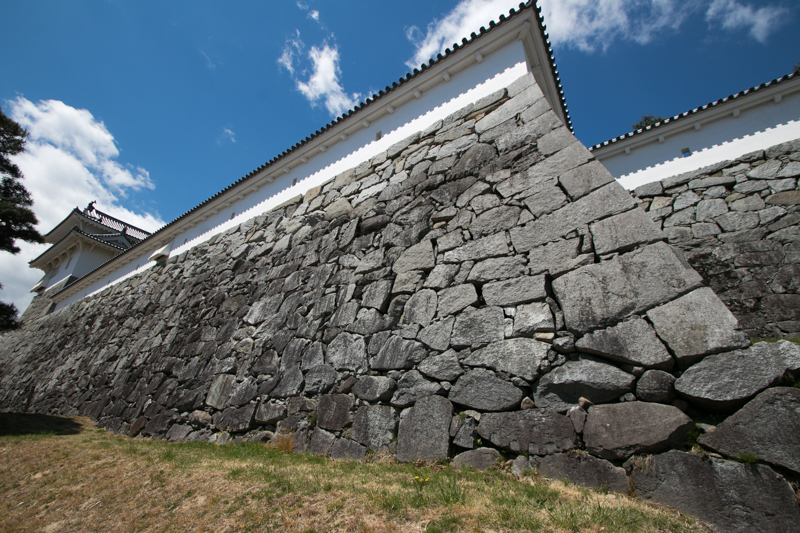 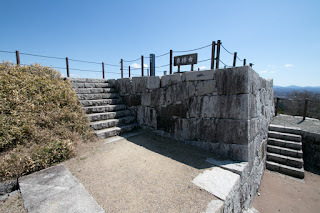 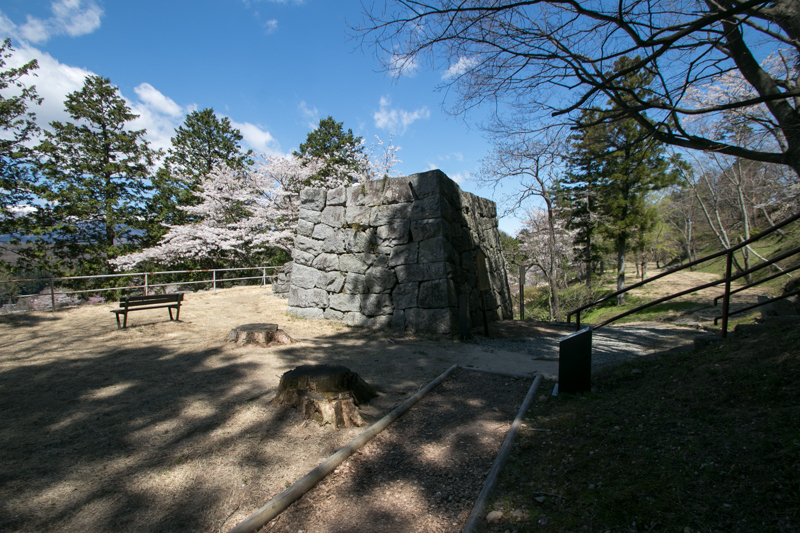 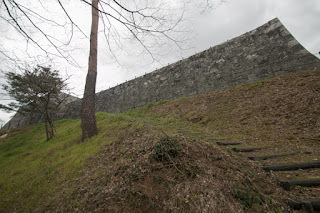 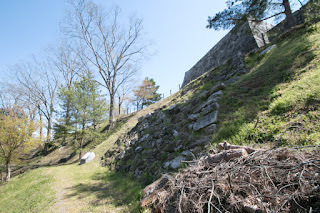 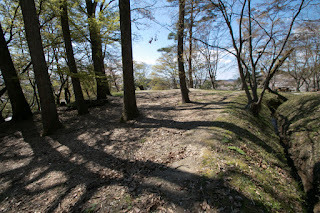 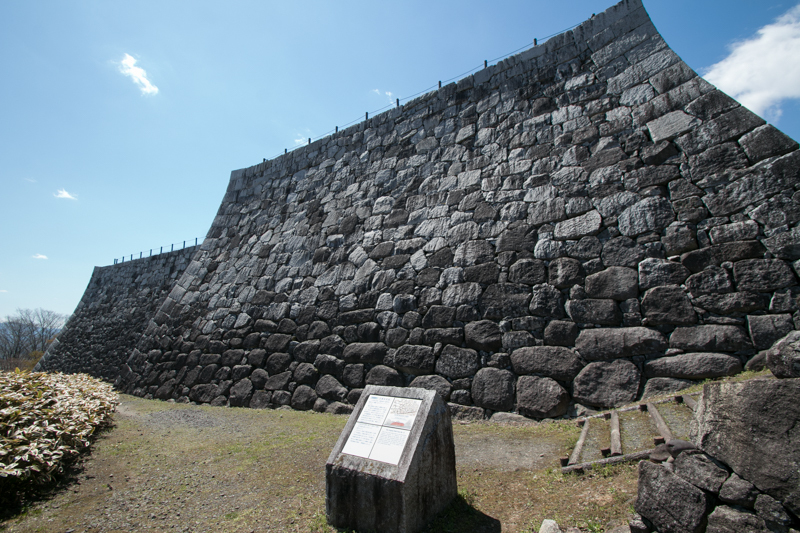 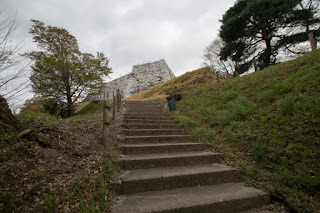 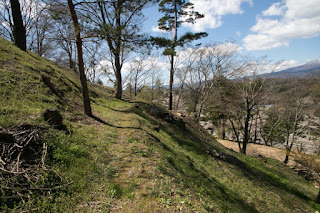 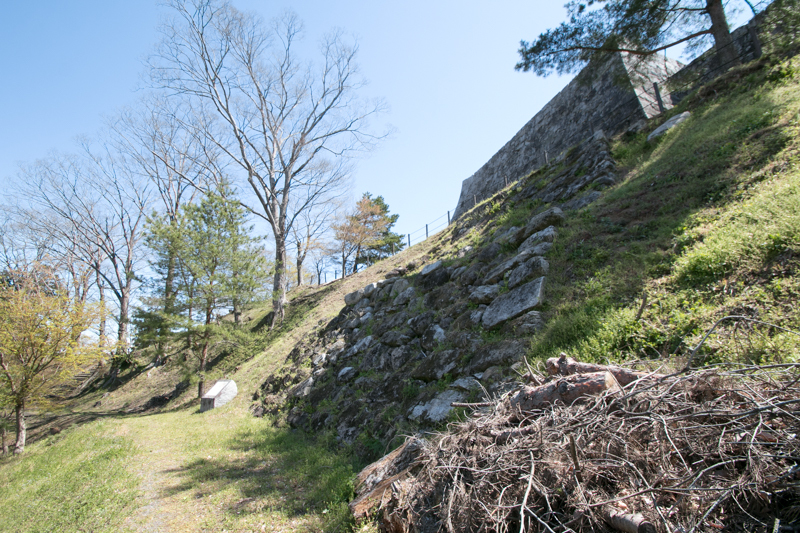 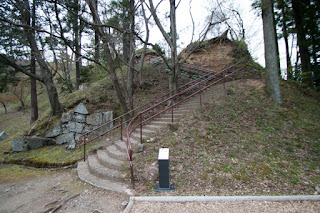 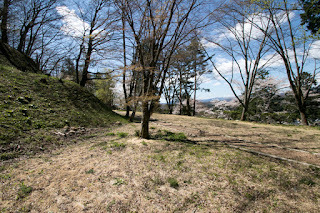 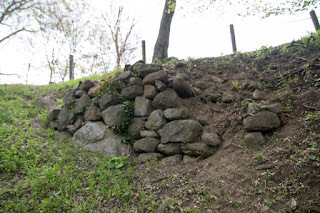 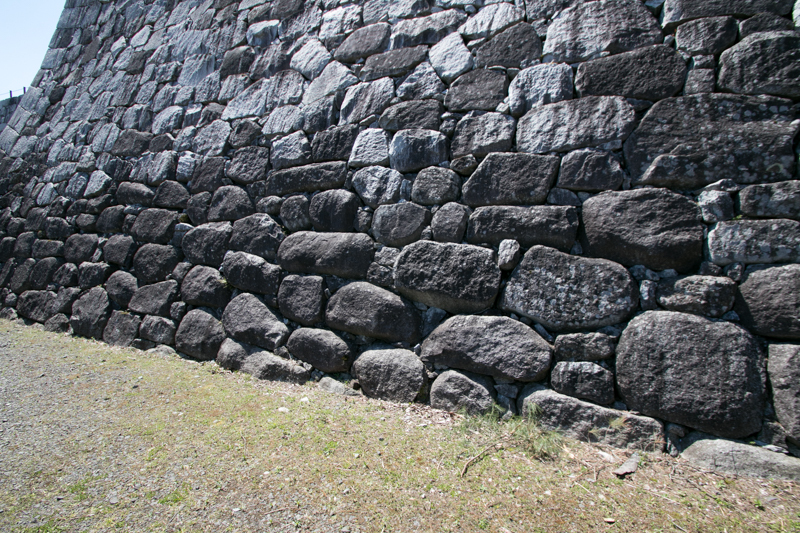 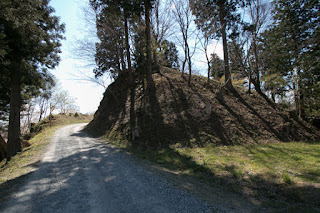 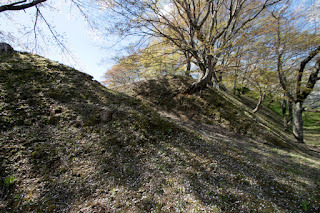 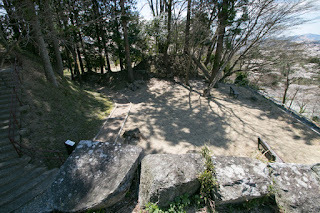 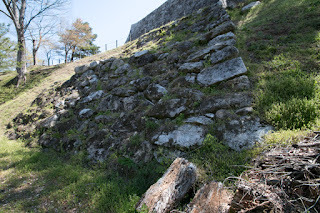 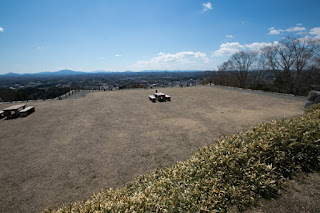 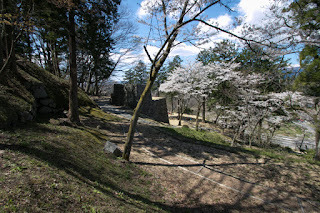 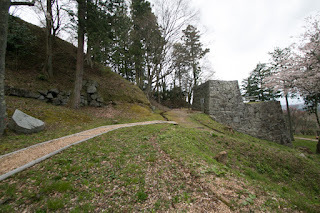 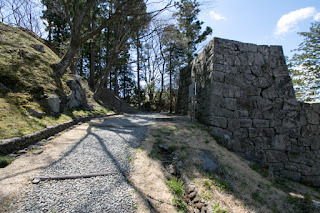 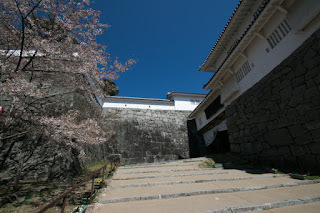 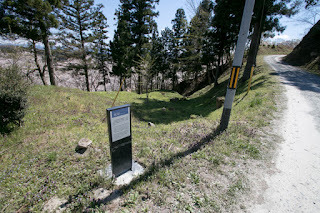 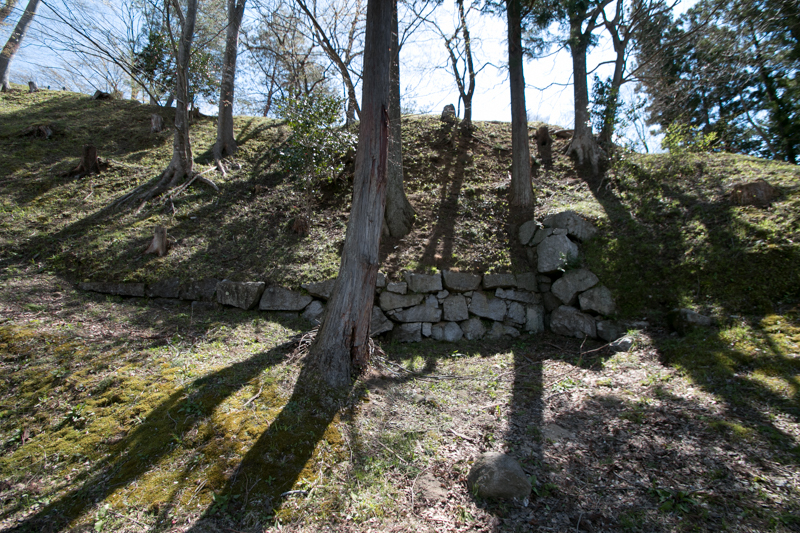 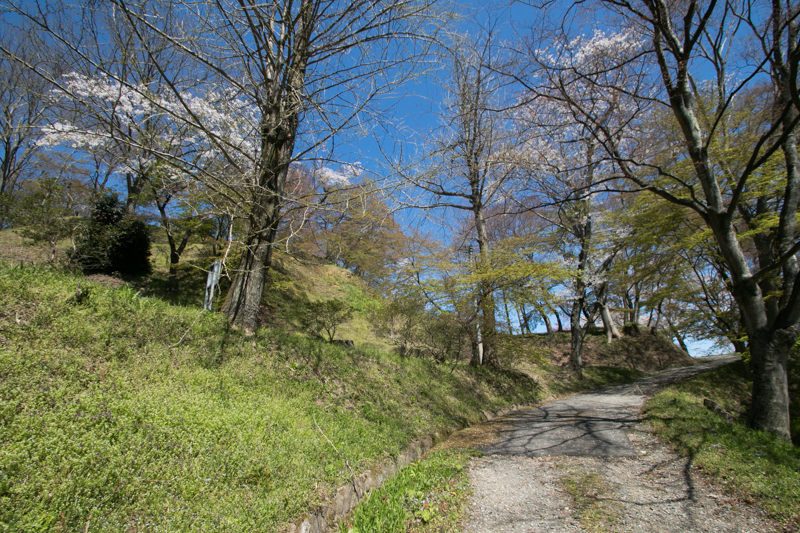 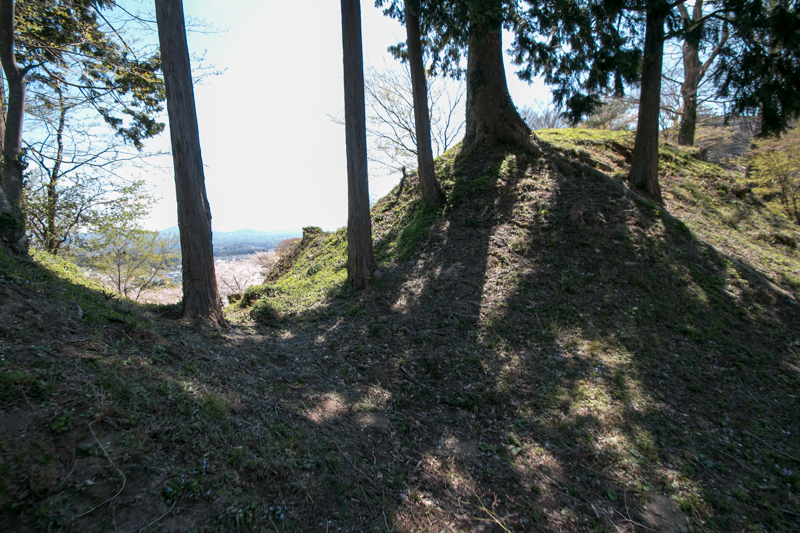 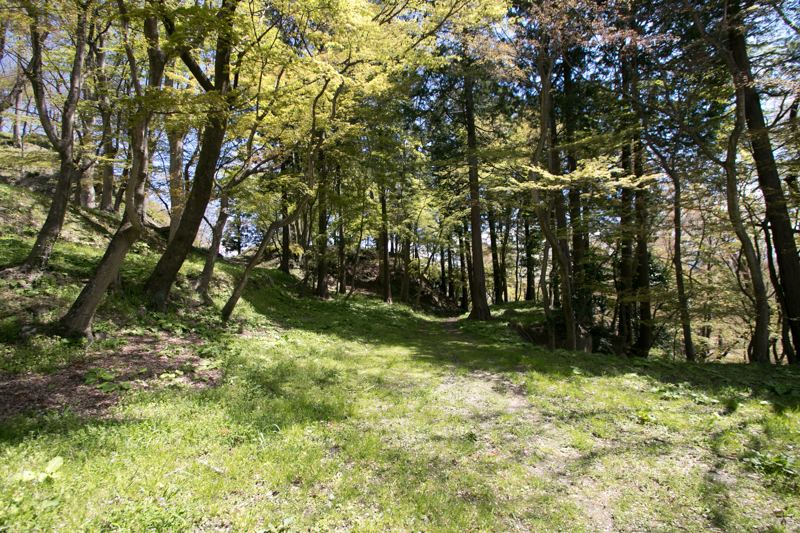 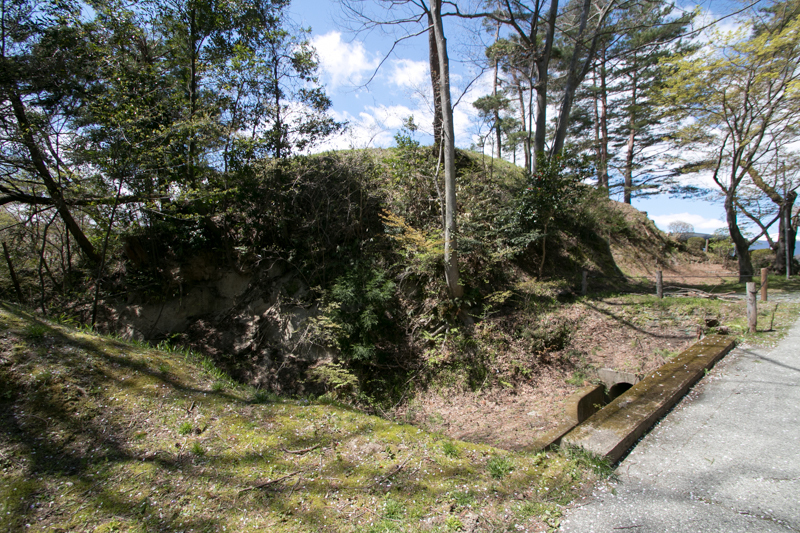 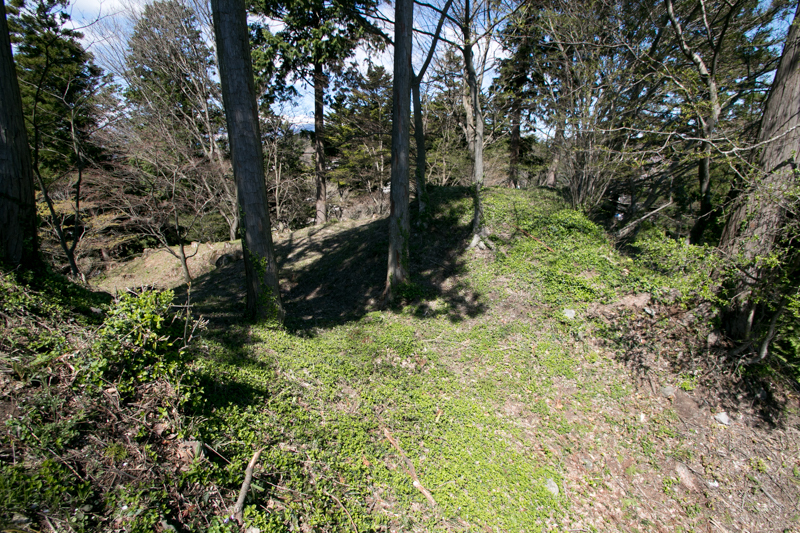 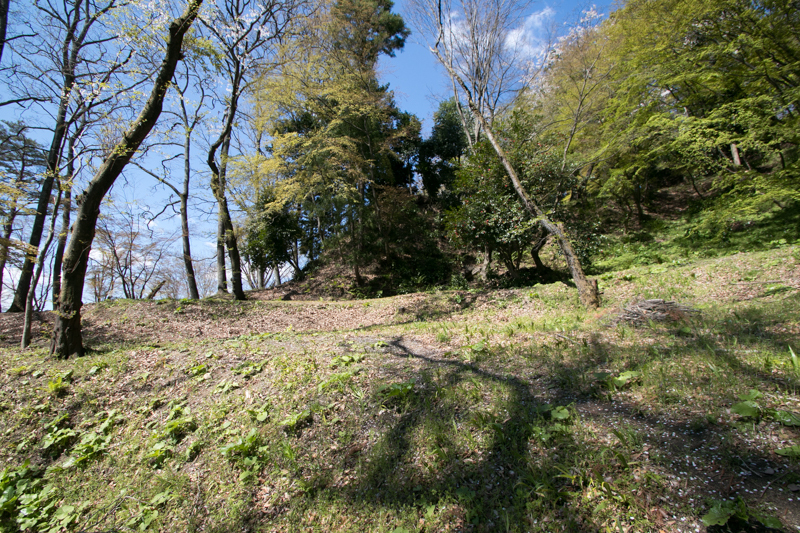 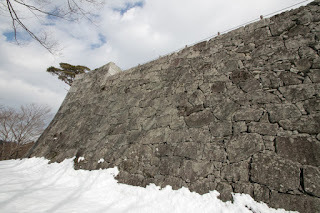 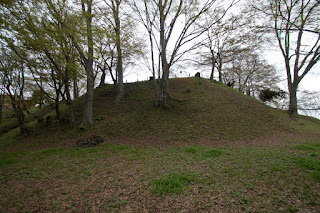 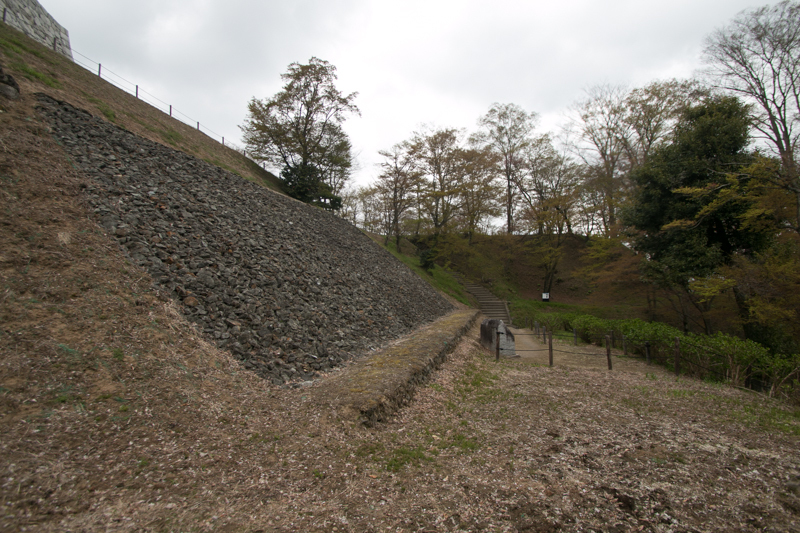 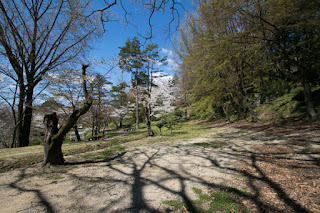 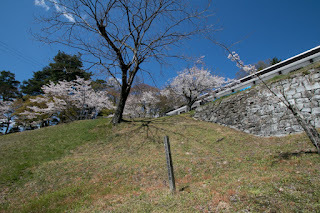 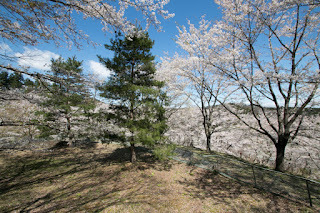 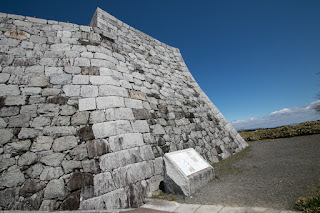 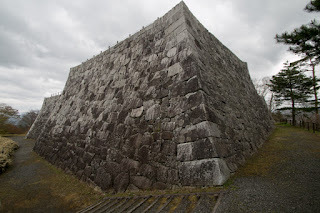 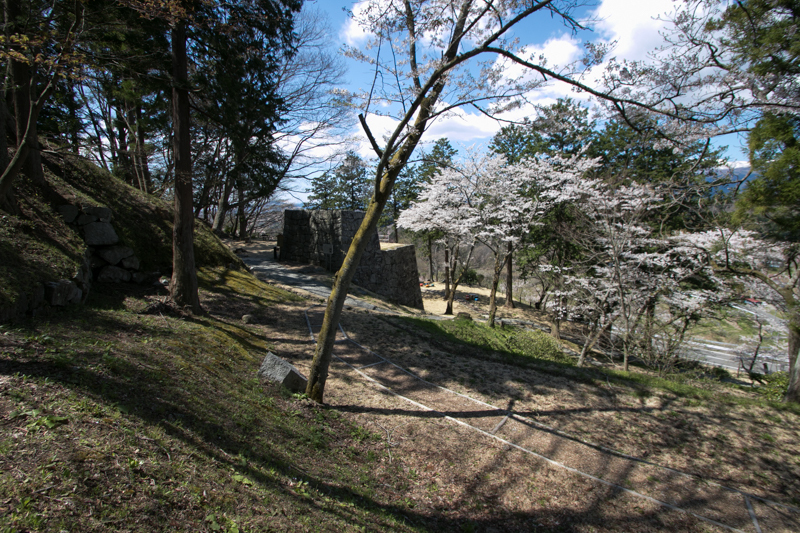 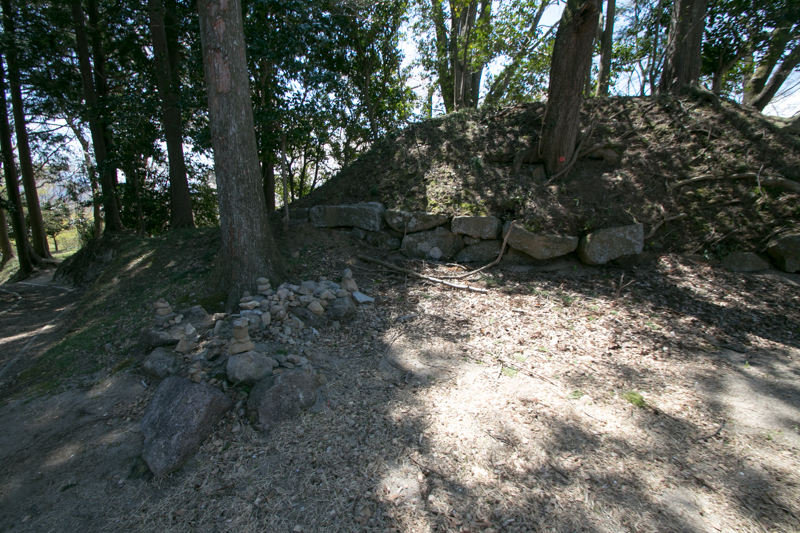 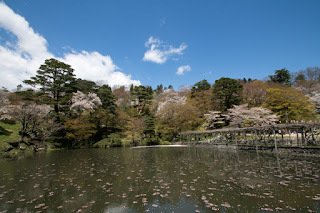 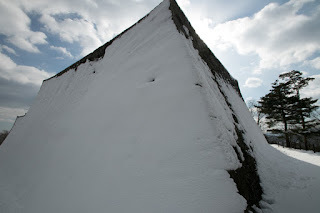 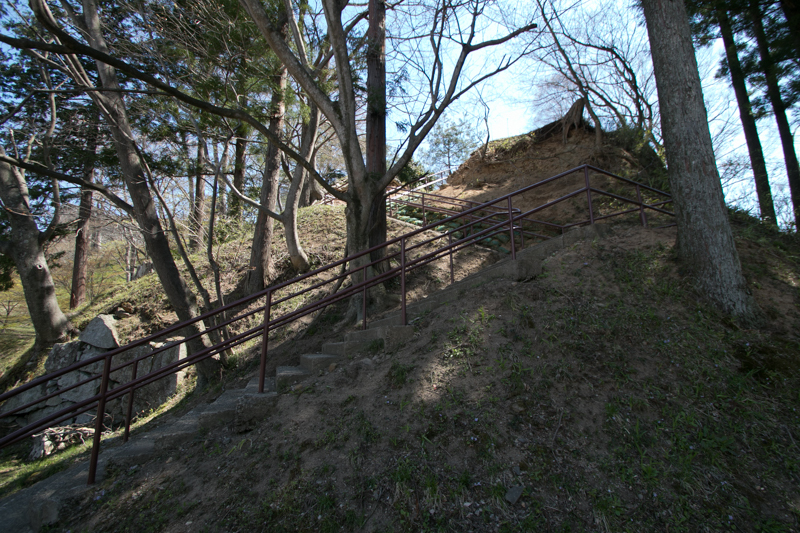 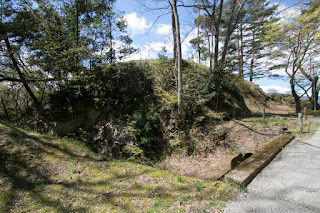 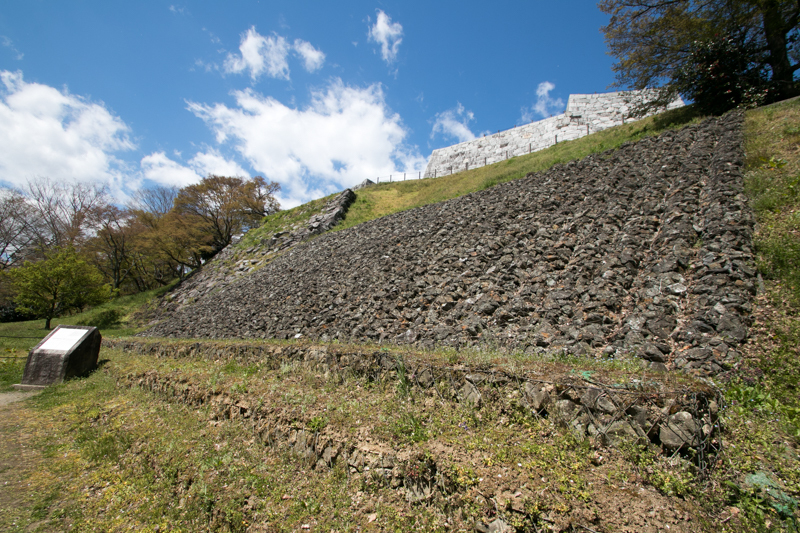 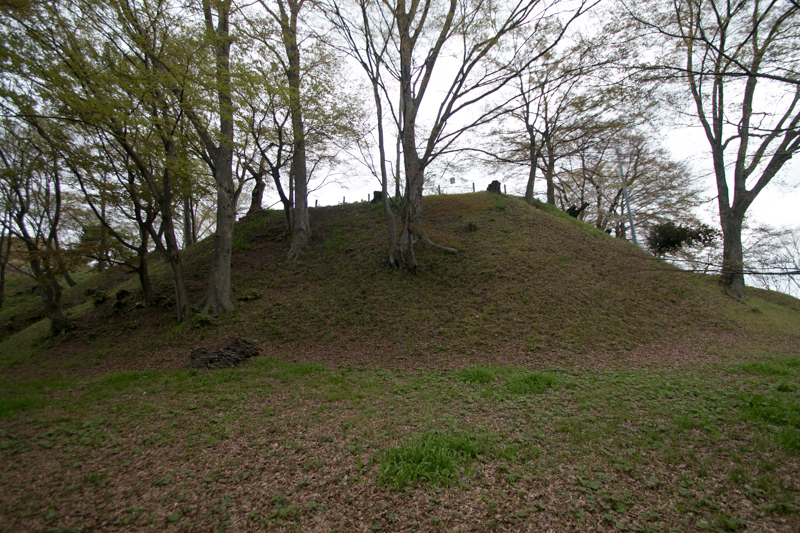 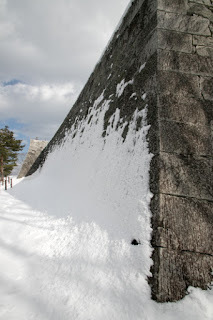 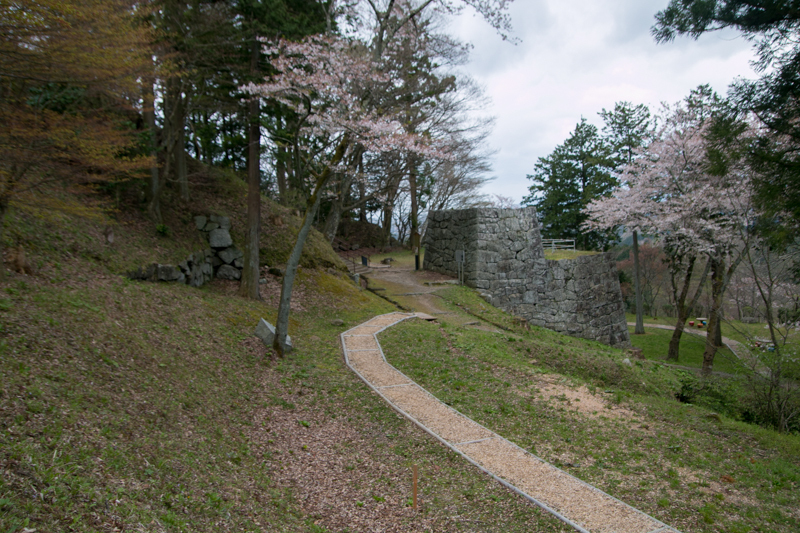 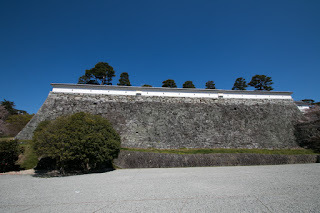 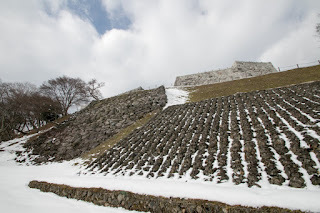 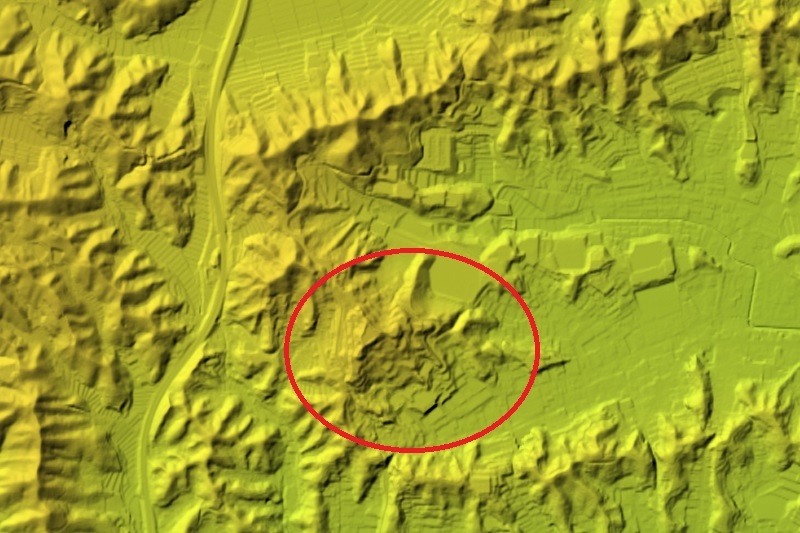 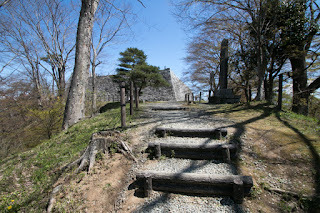 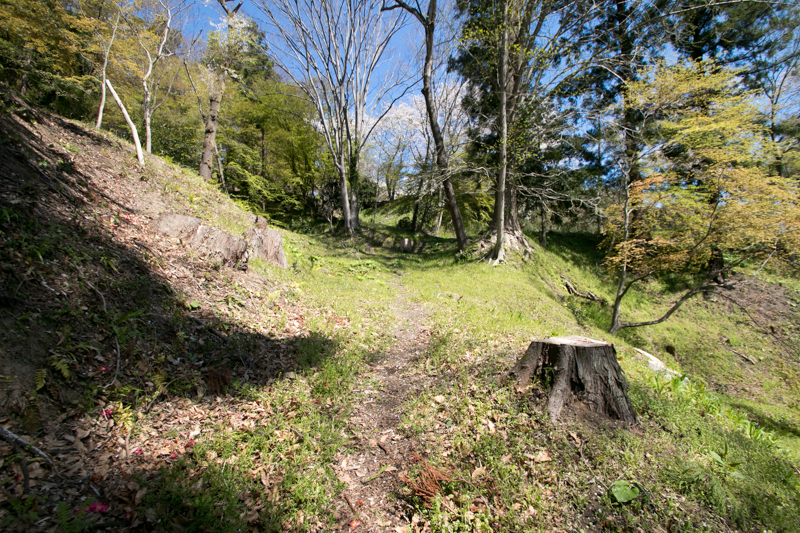 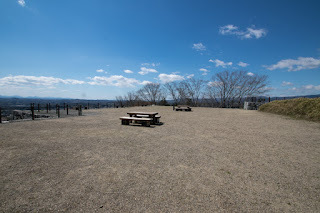 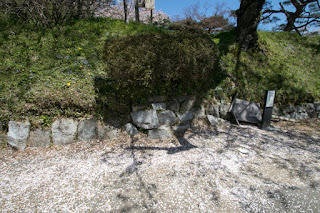 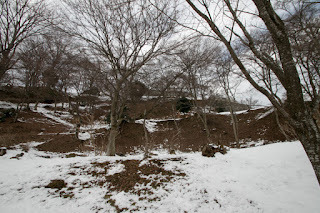 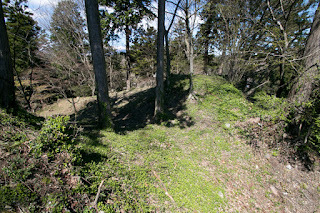 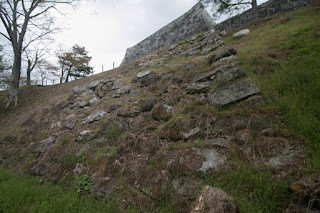 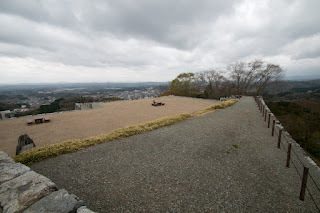 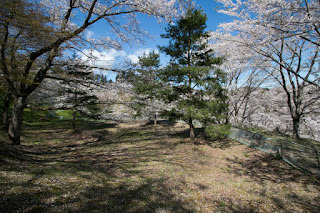 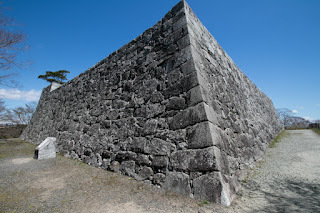 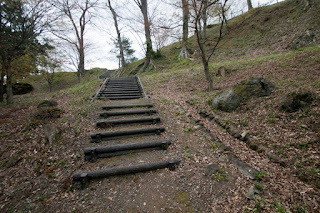 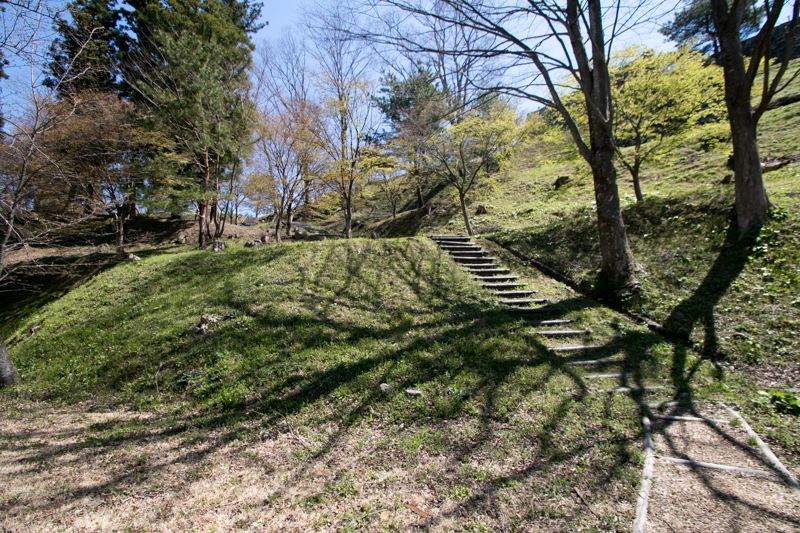 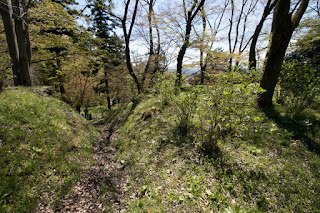 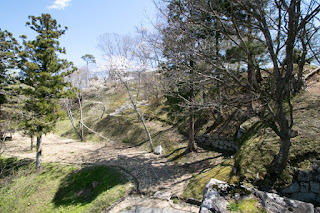 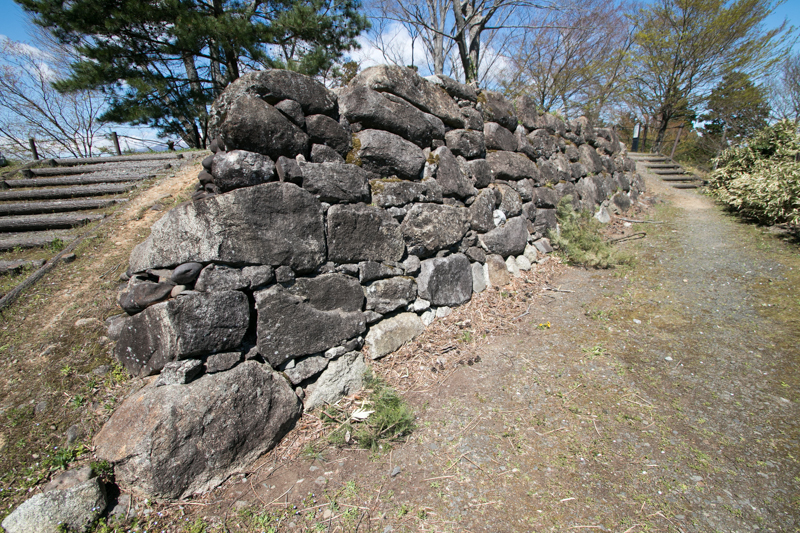 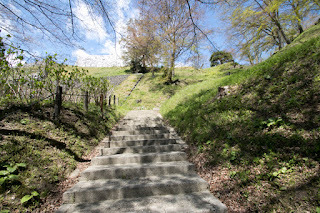 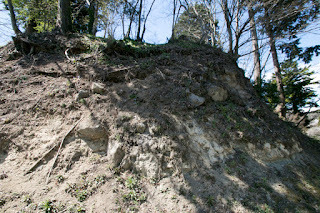 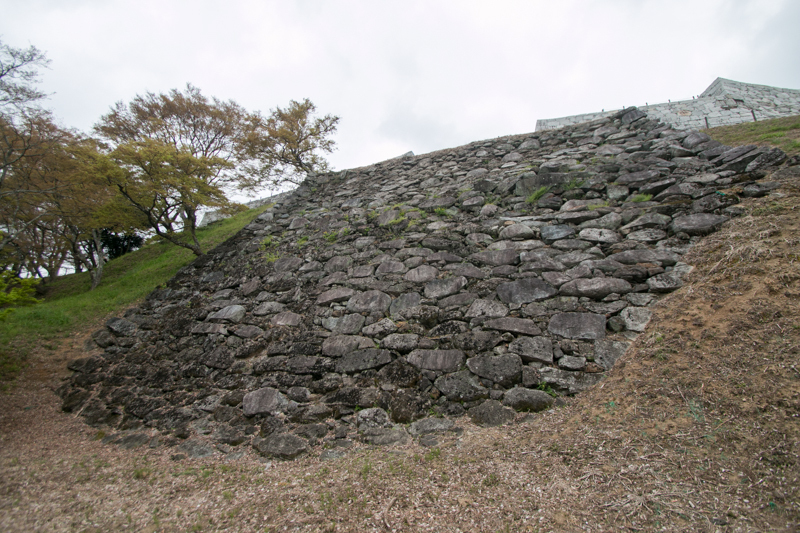 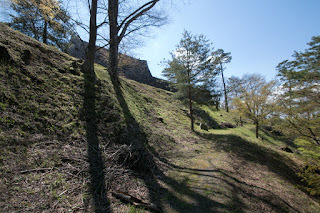 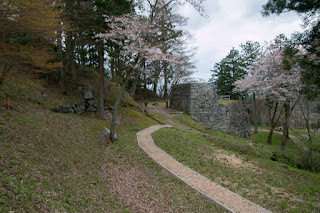 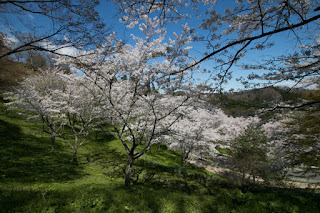 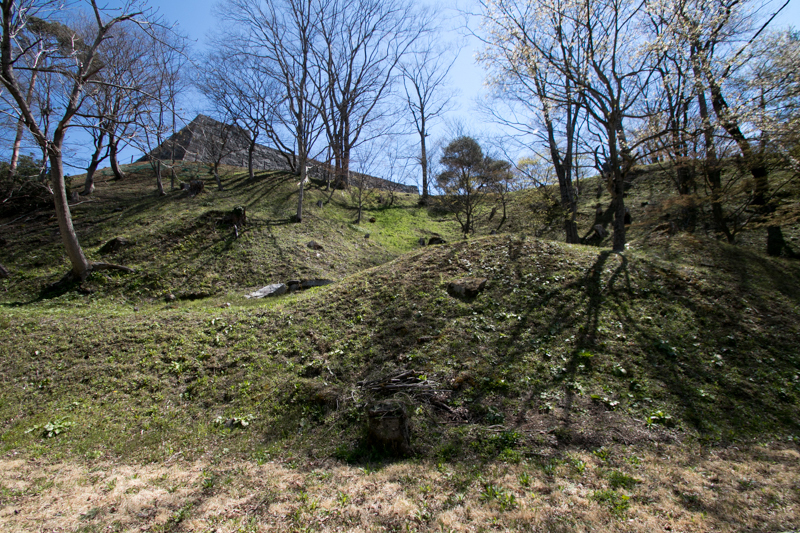 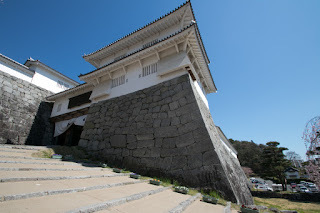 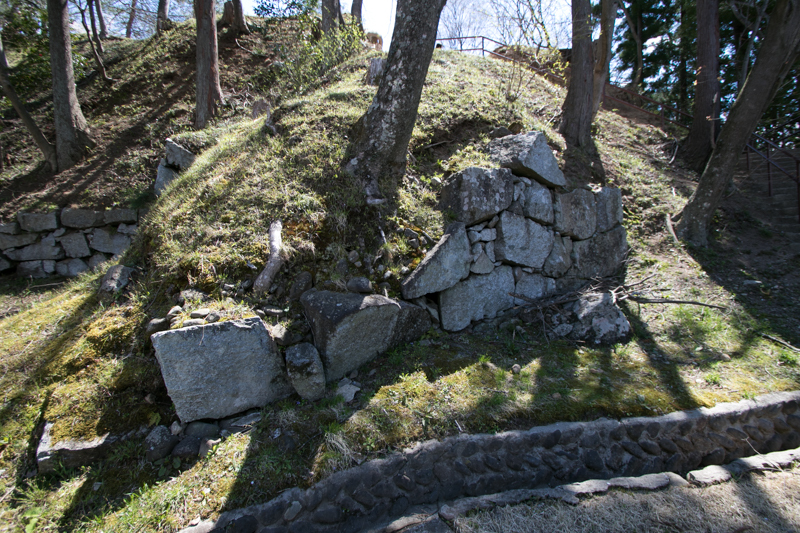 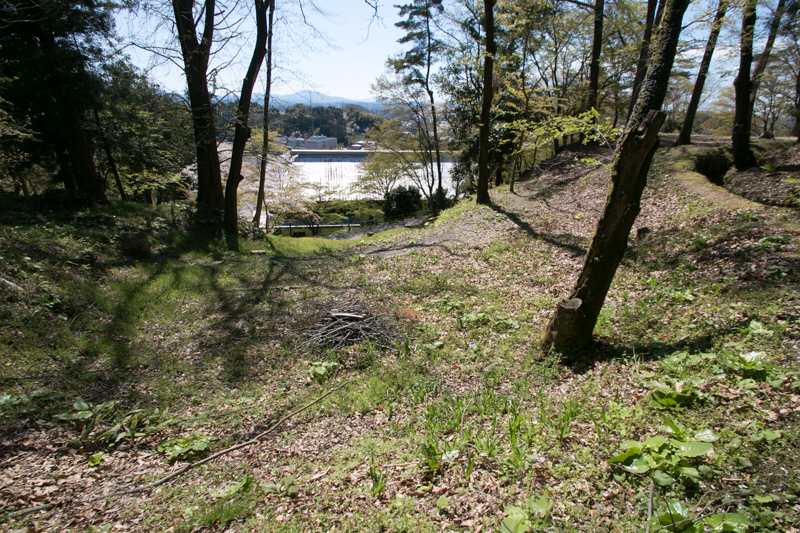 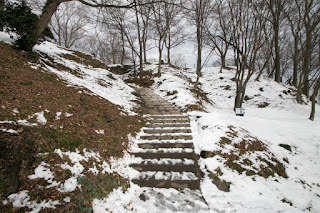 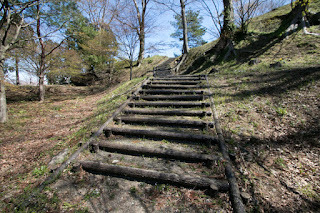 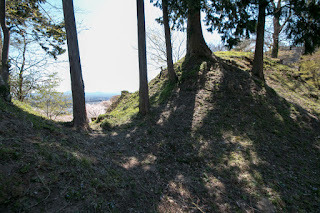 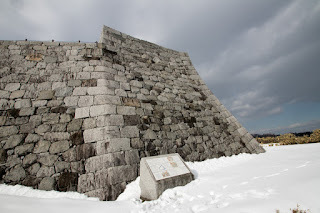 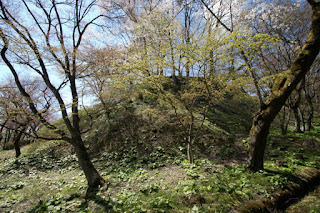 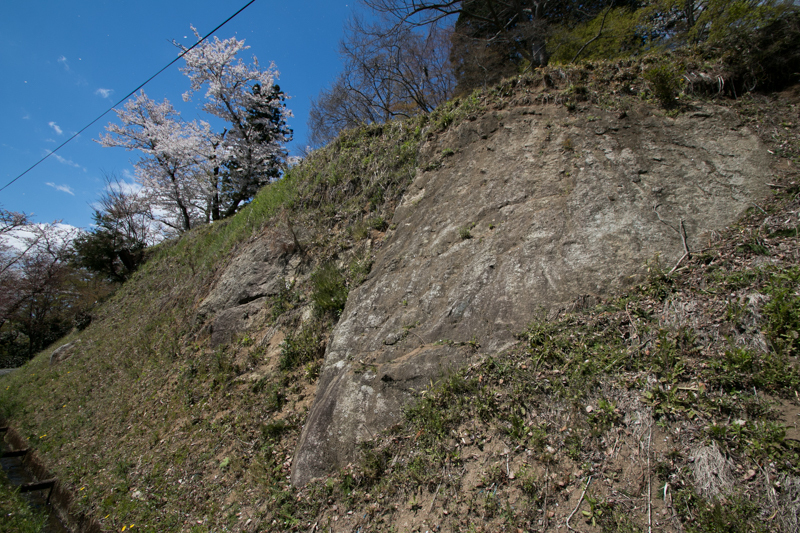 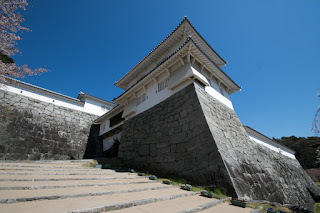 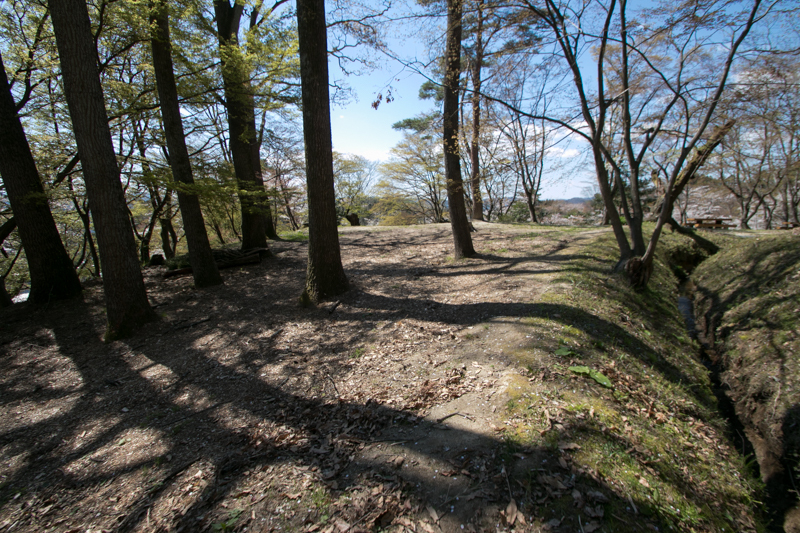 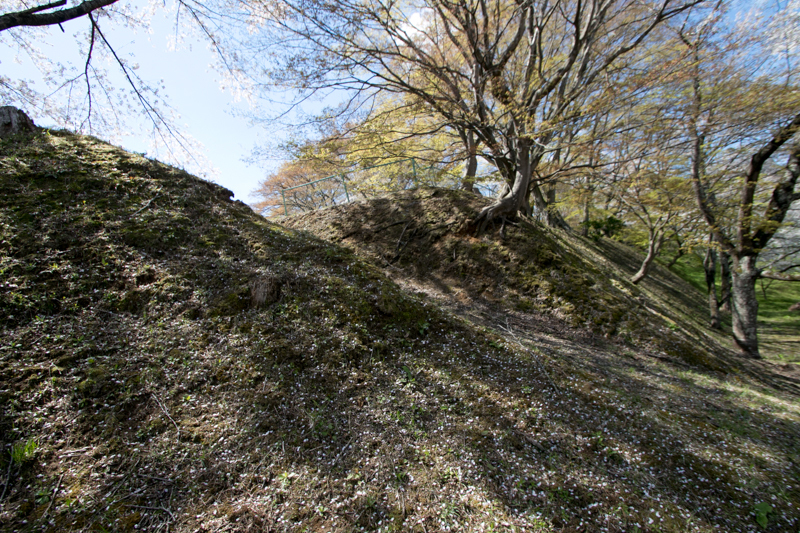 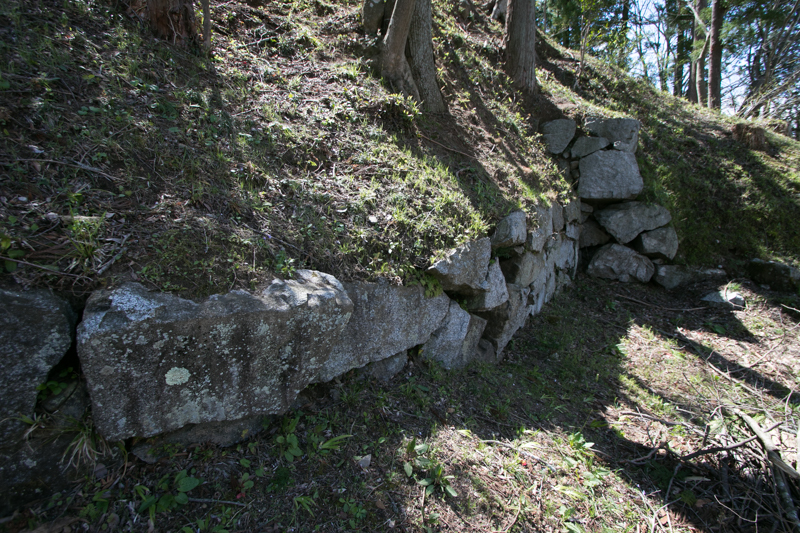 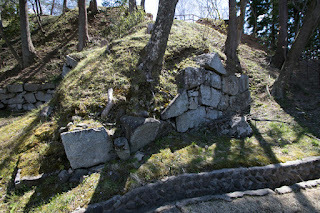 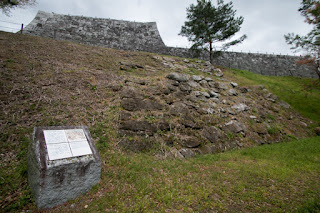 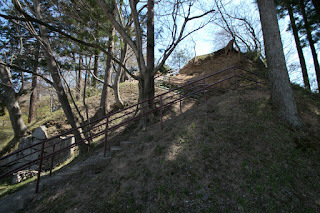 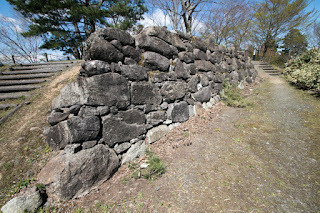 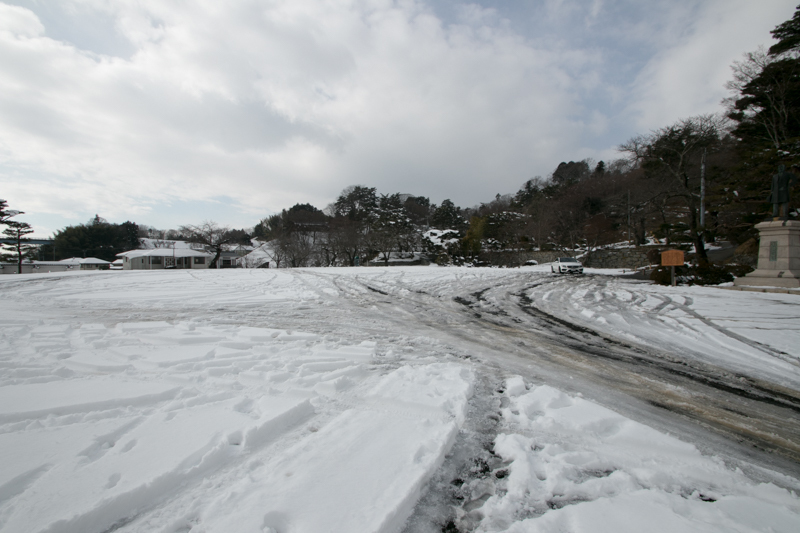 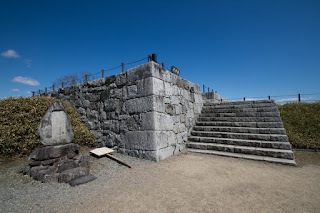 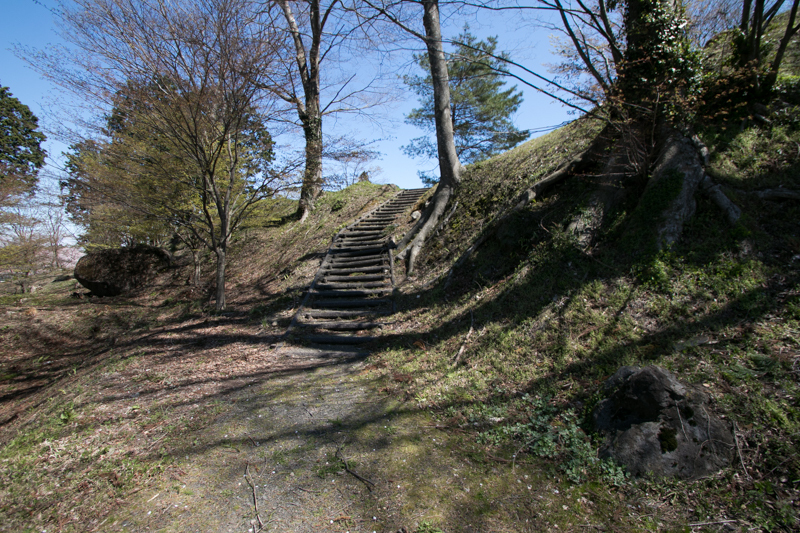 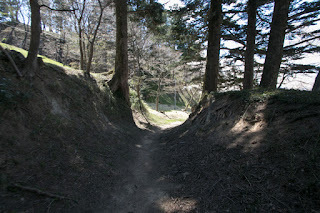 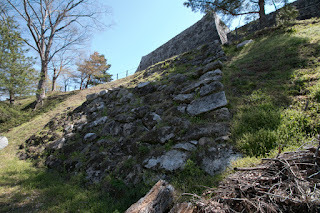 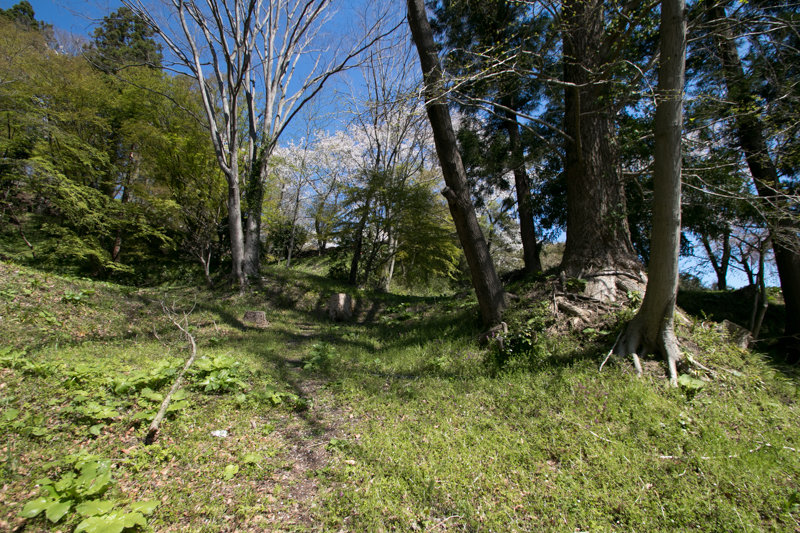 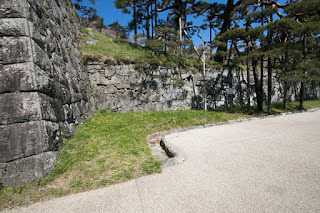 At the time of Meiji revolution, Nihonmatsu domain participated in anti-new government alliance, thus Nihonmatsu castle was attacked by new government army same as Aizu Wakamatsu castle or Shirakawa castle. 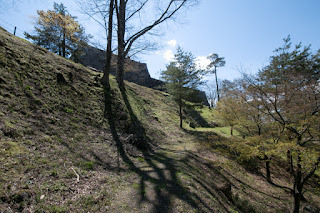 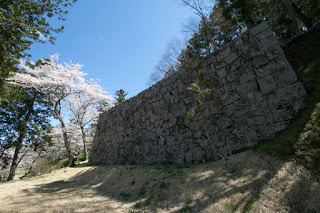 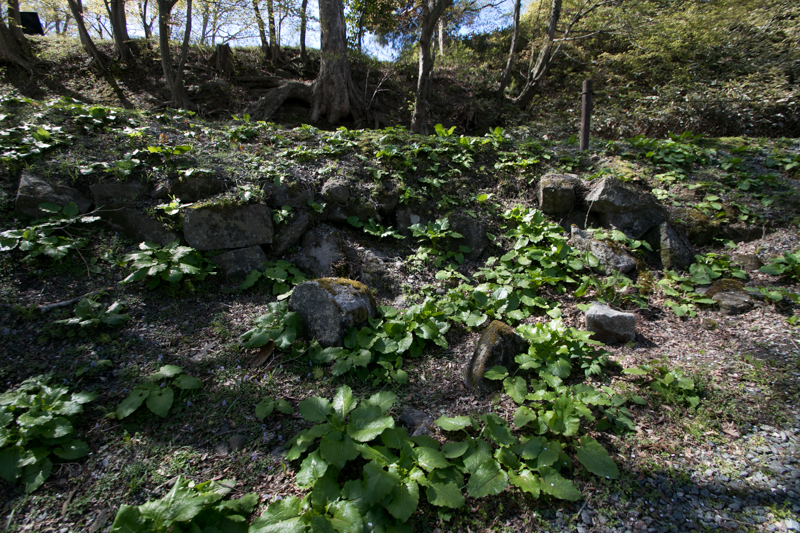 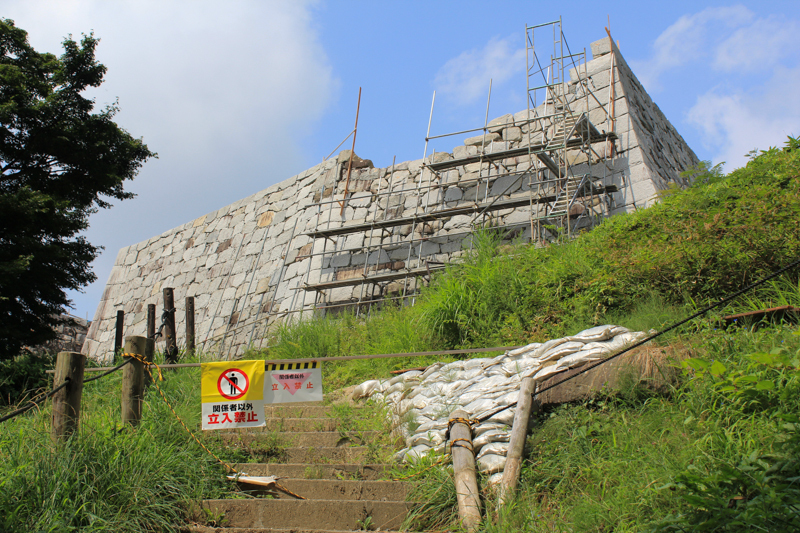 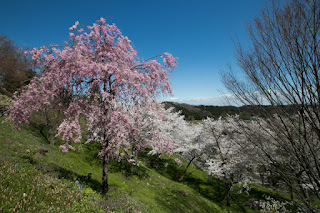 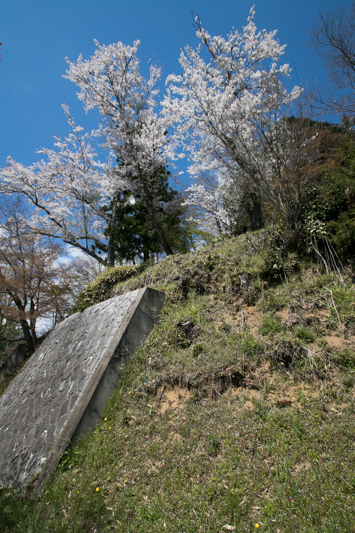 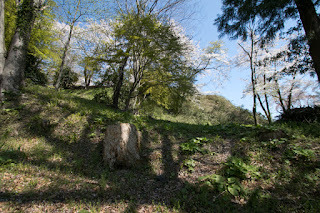 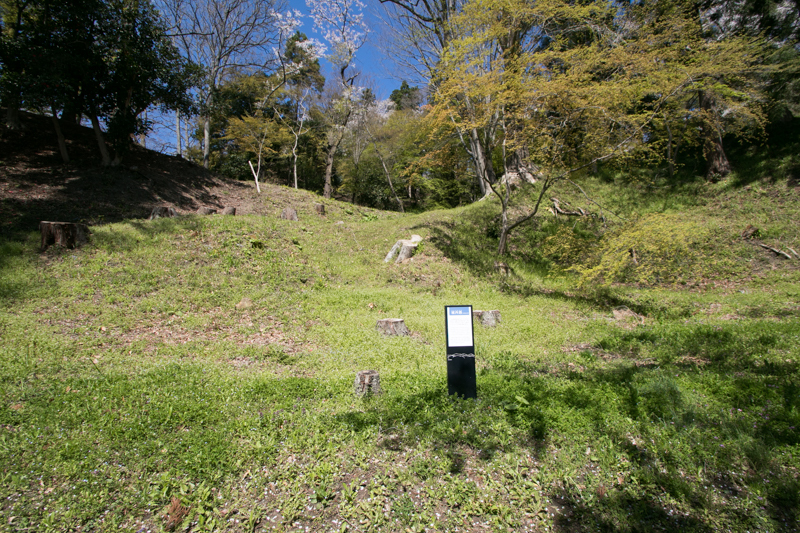 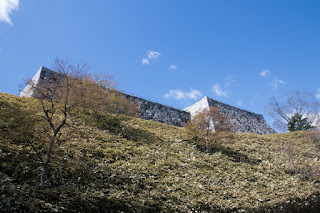 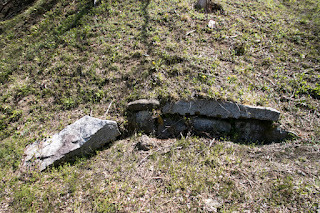 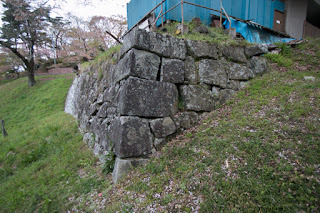 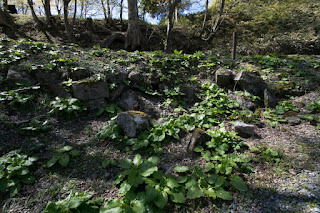 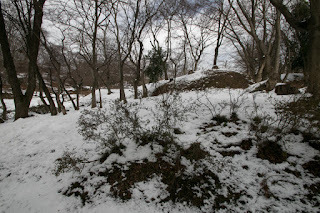 The castle was fallen in only one day, with many loss of soldiers including mobilized young soldiers named NIhonmatsu Shonen Tai (Nihonmatsu boys). 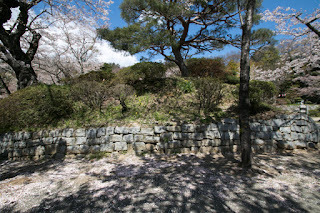 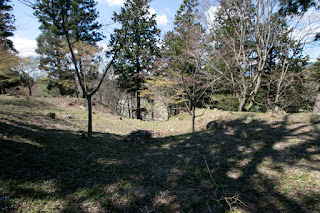 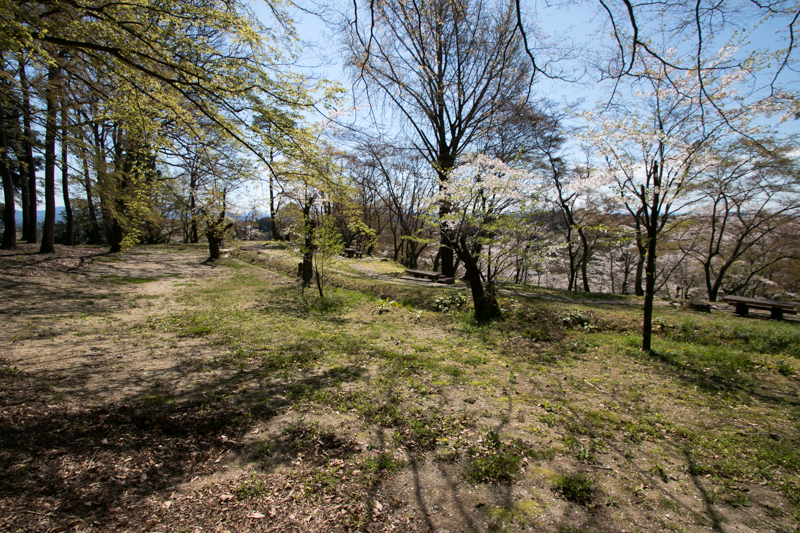 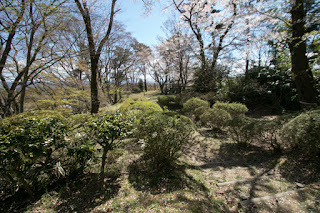 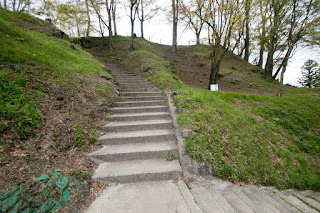 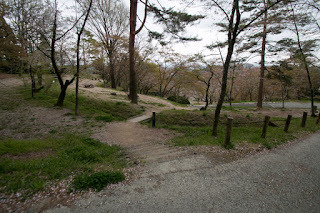 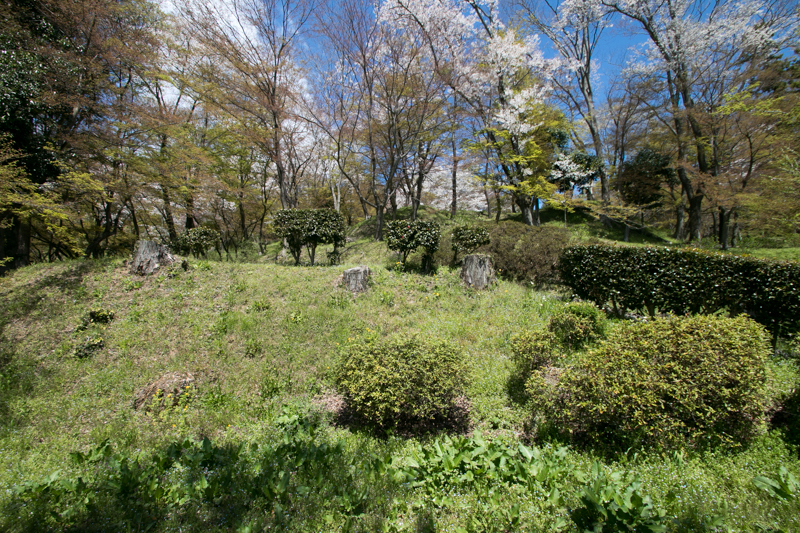 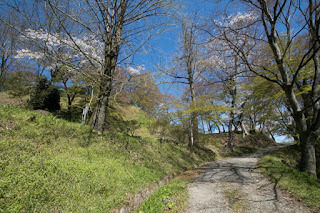 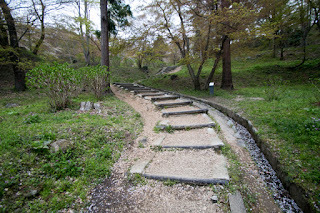 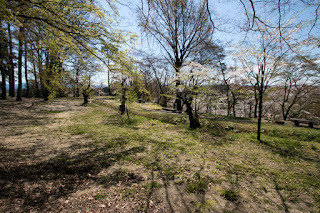 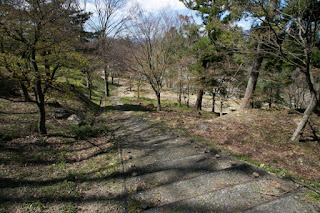 Subsequent to Meiji revolution all buildings were lost, and the site of the castle is used as a park. 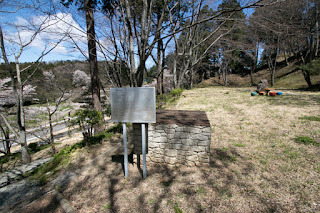 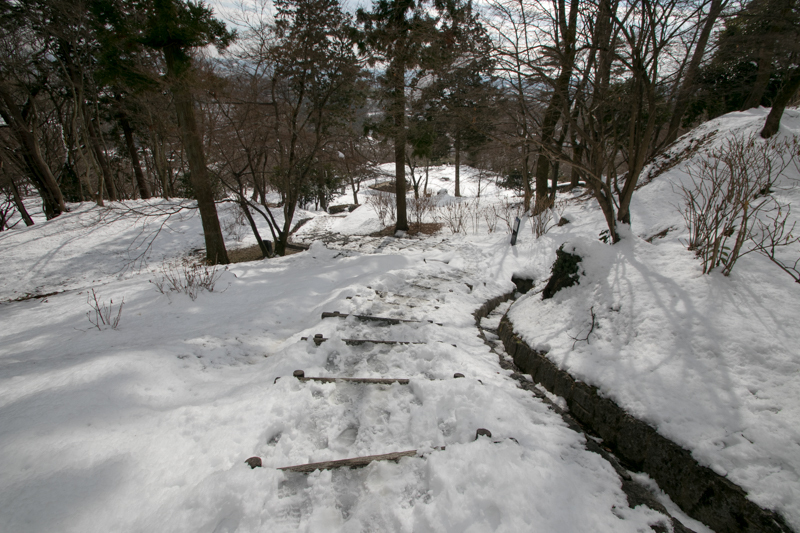 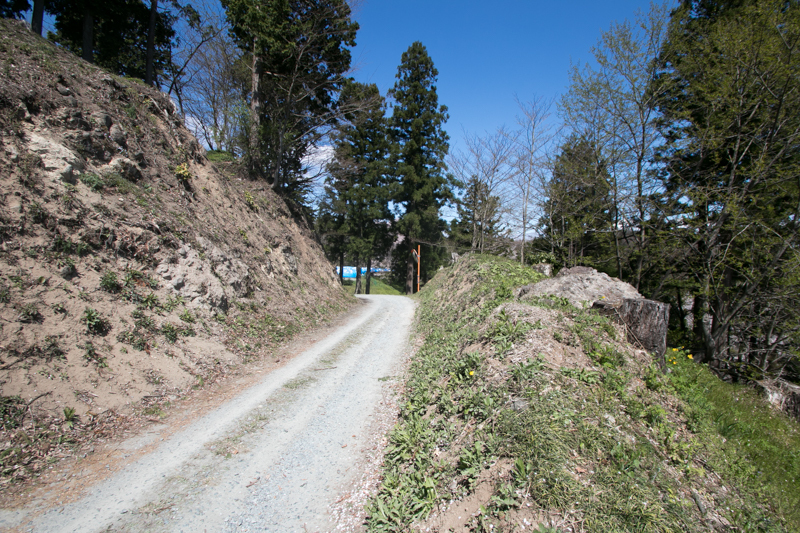 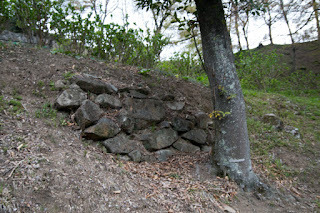 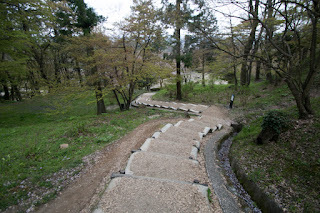 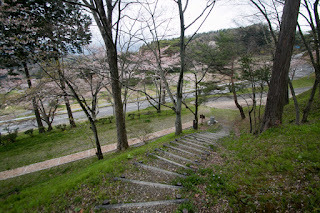 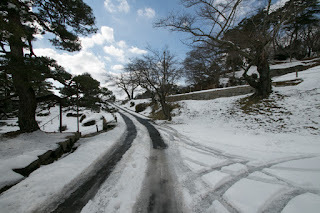 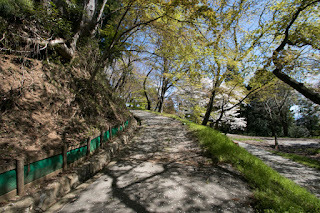 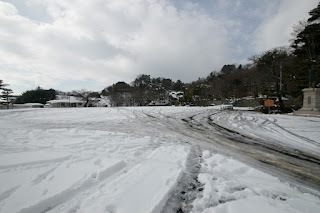 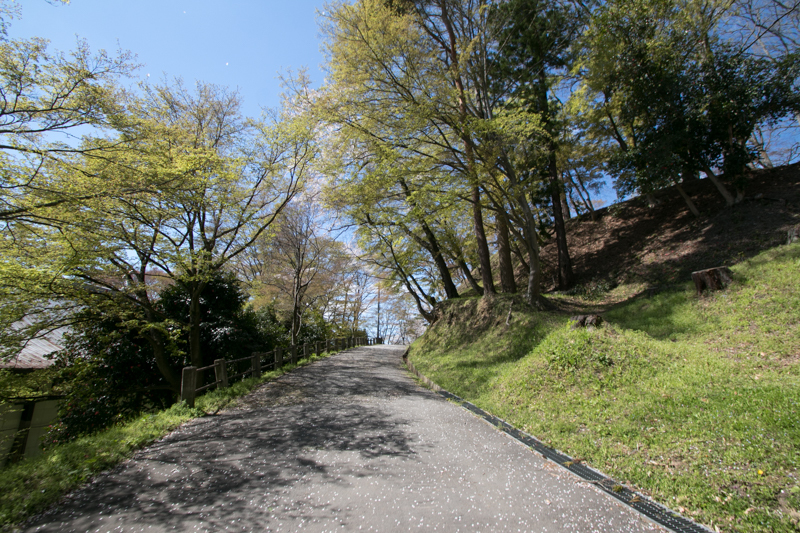 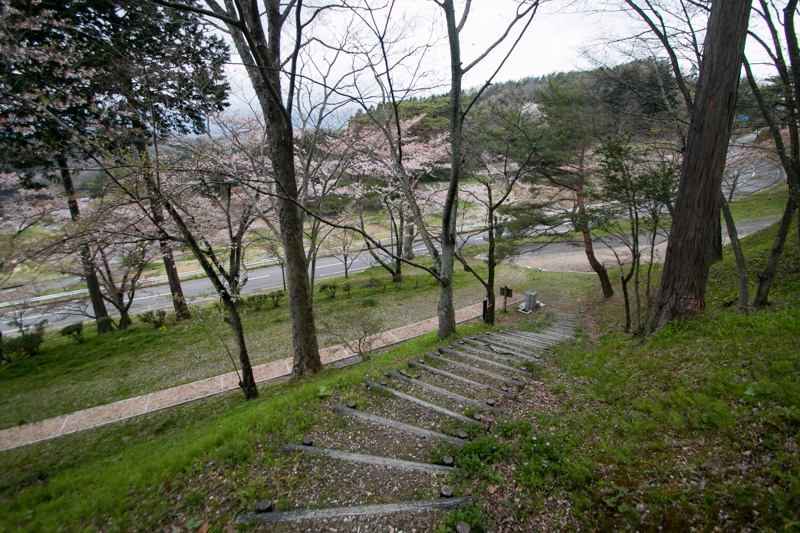 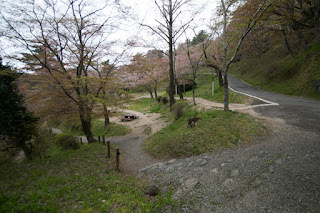 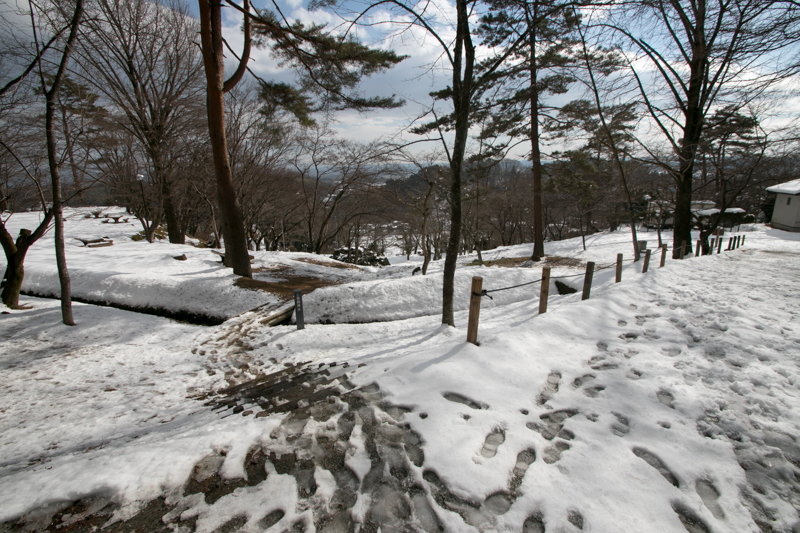 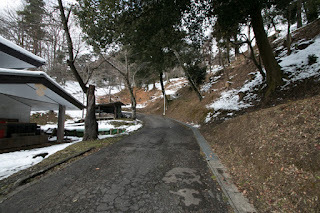 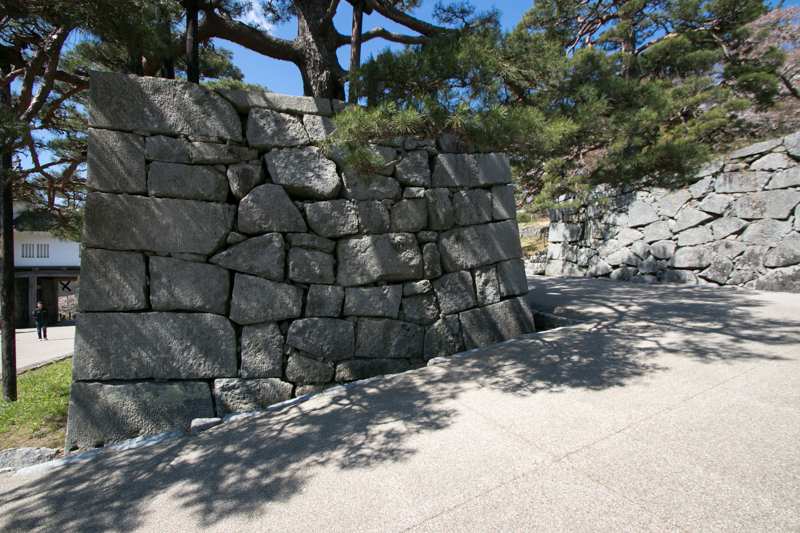 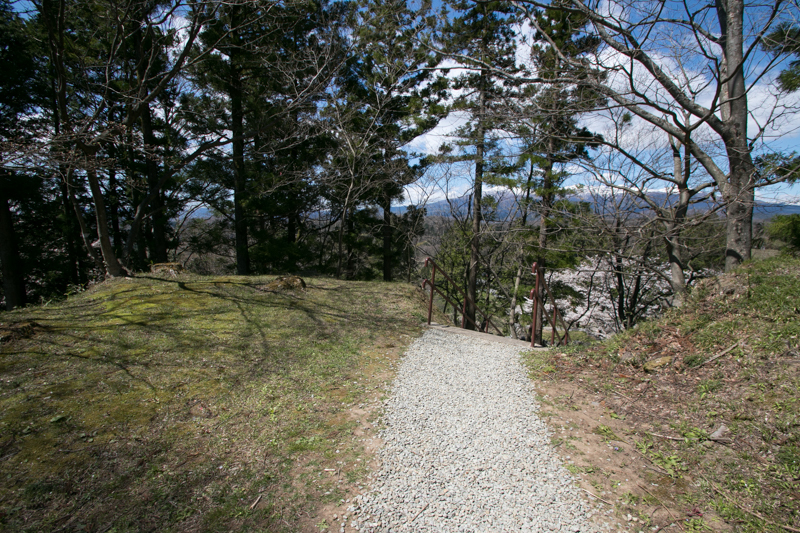 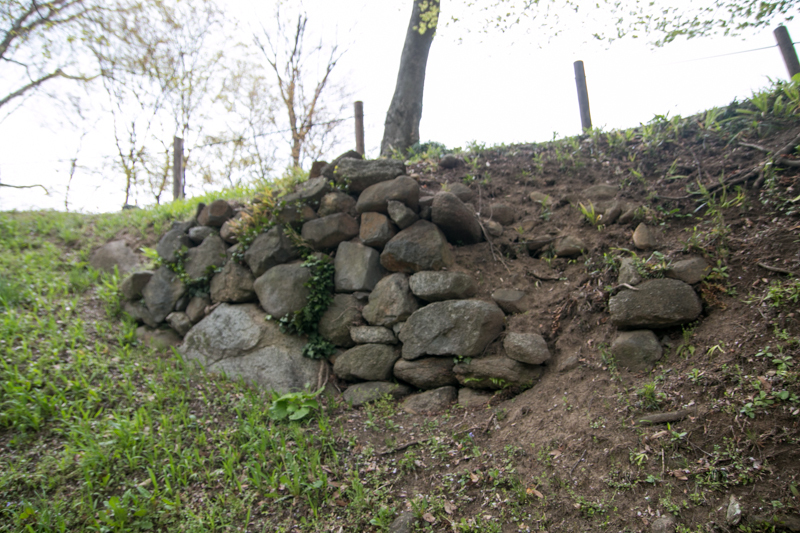 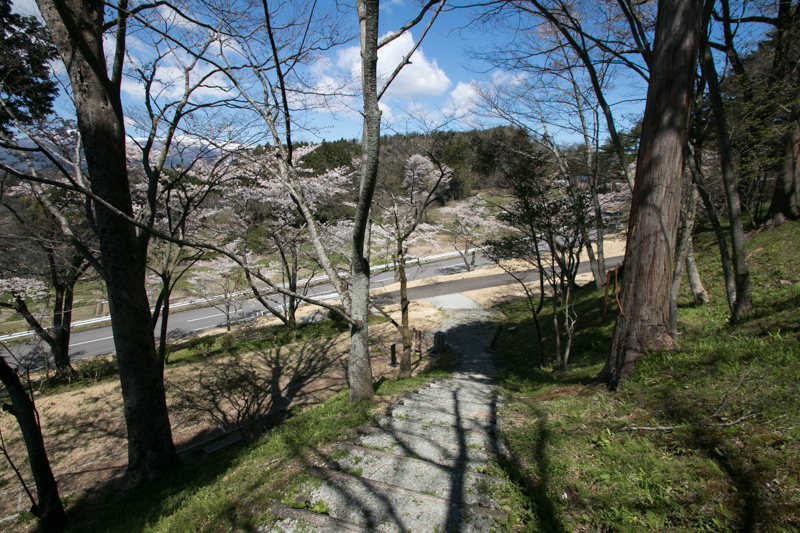 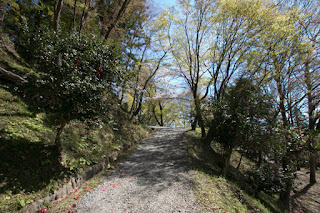 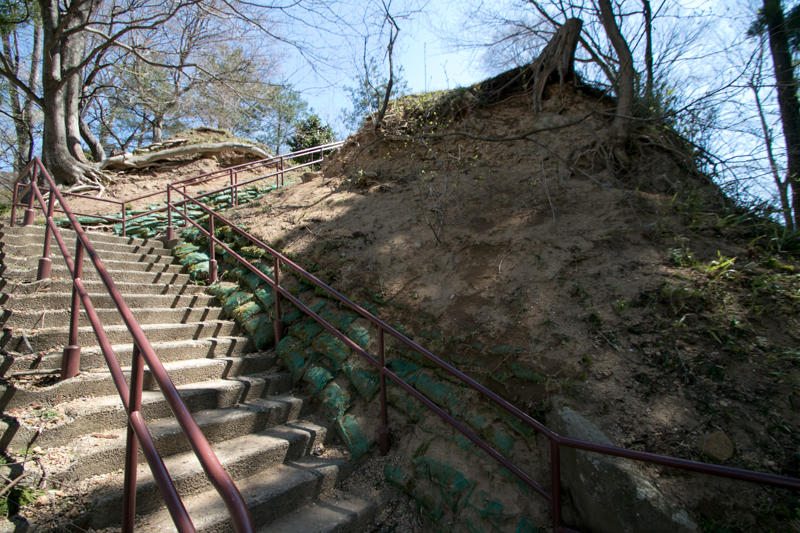 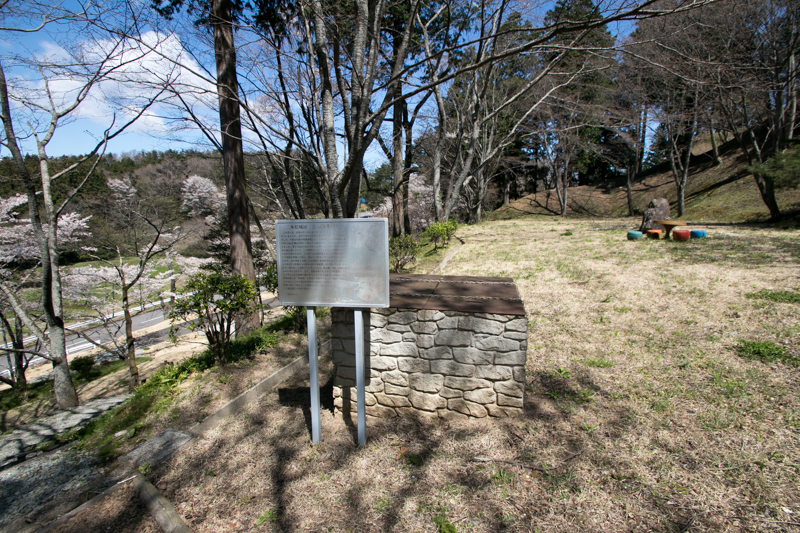 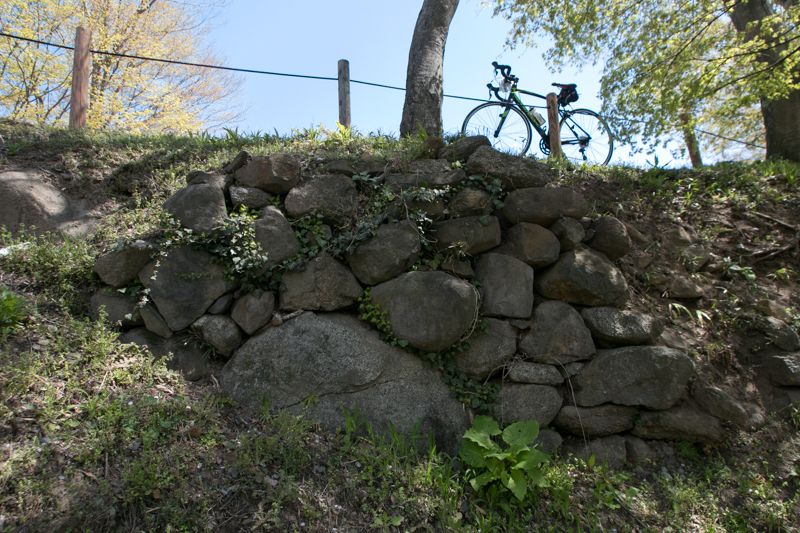 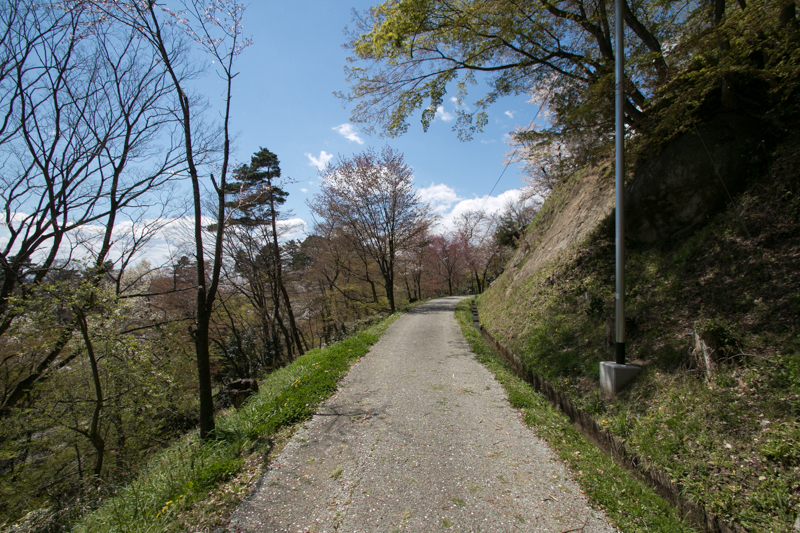 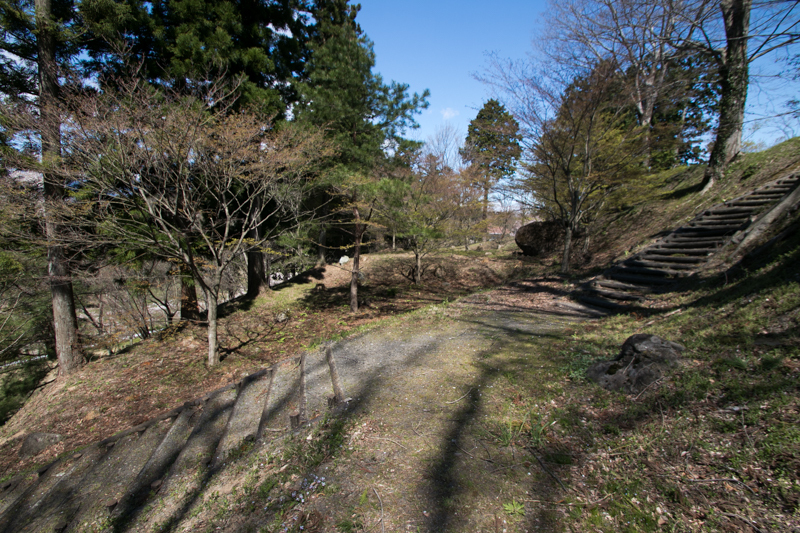 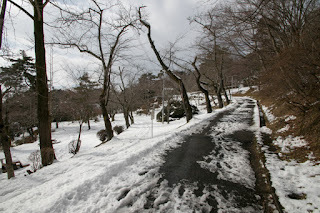 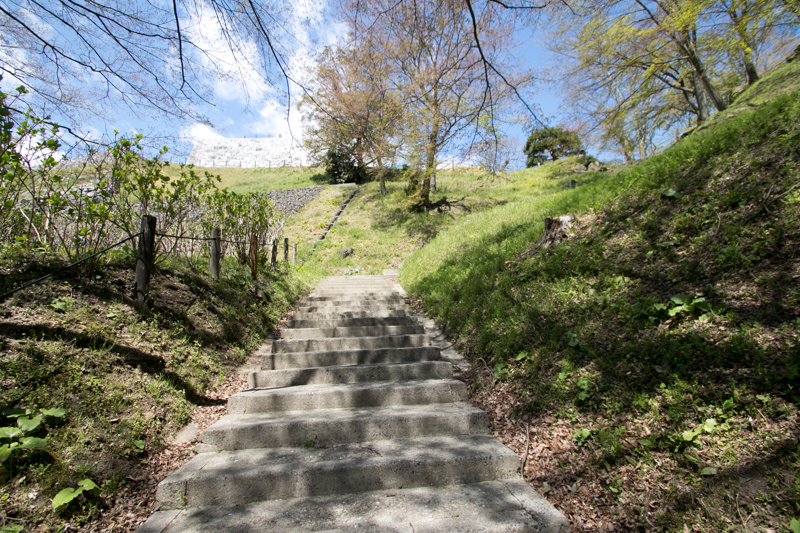 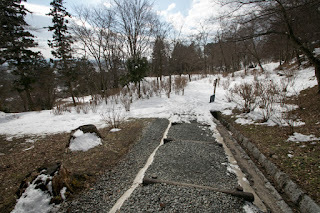 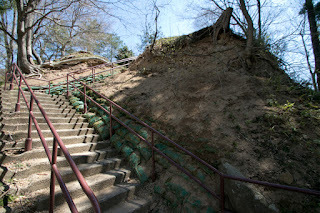 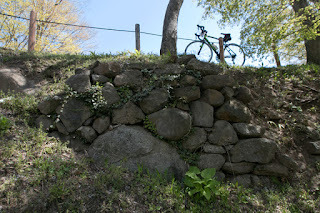 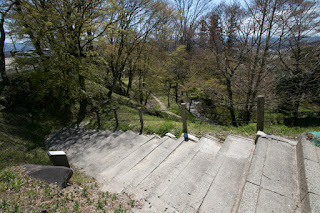 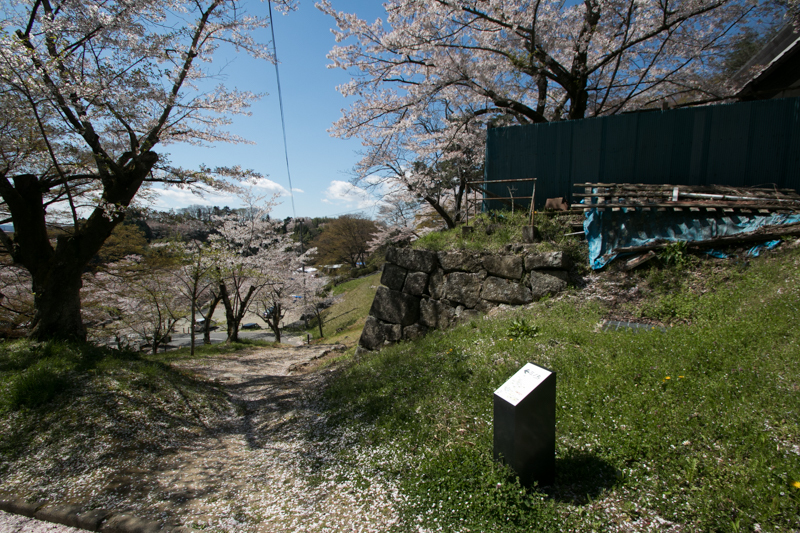 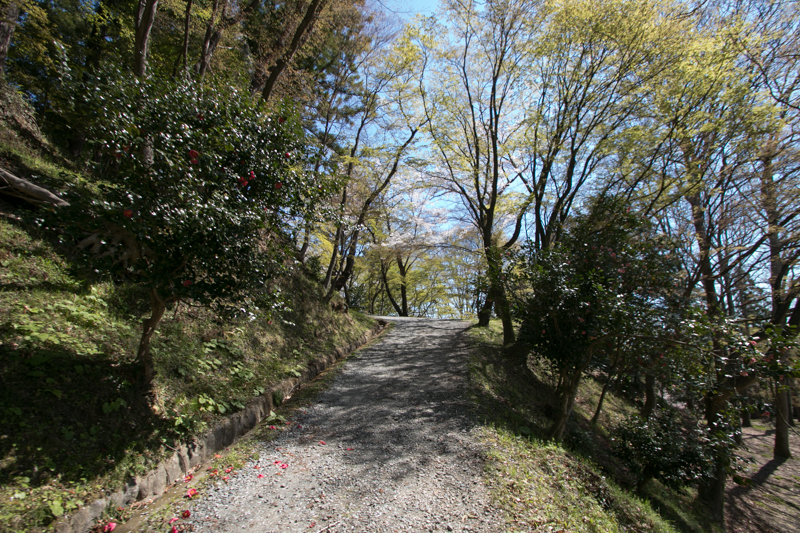 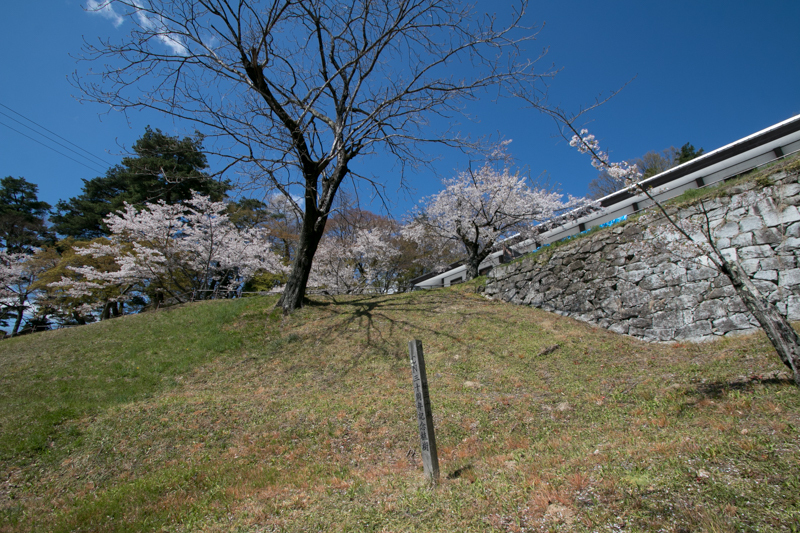 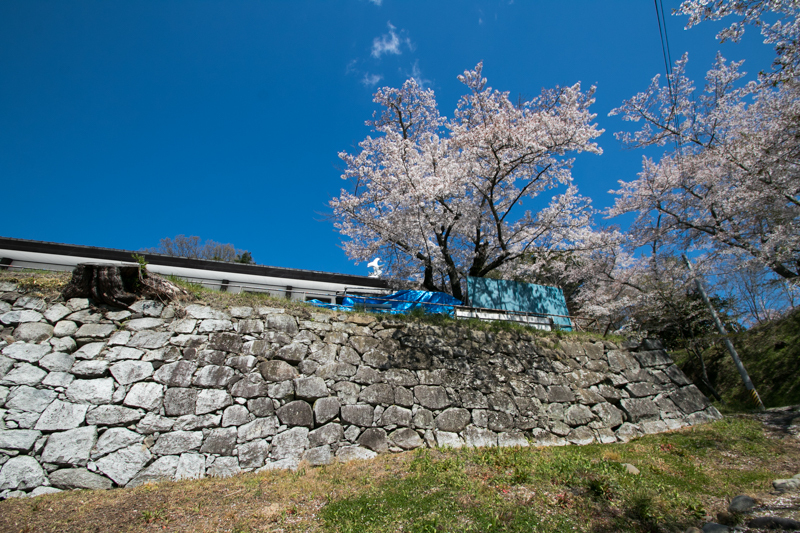 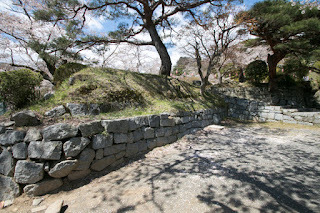 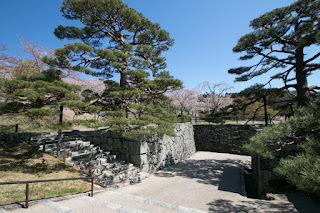 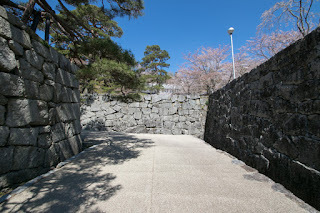 In 1982 main gate of hillside area was reconstructed, and stone walls of hill top area was also repaired. 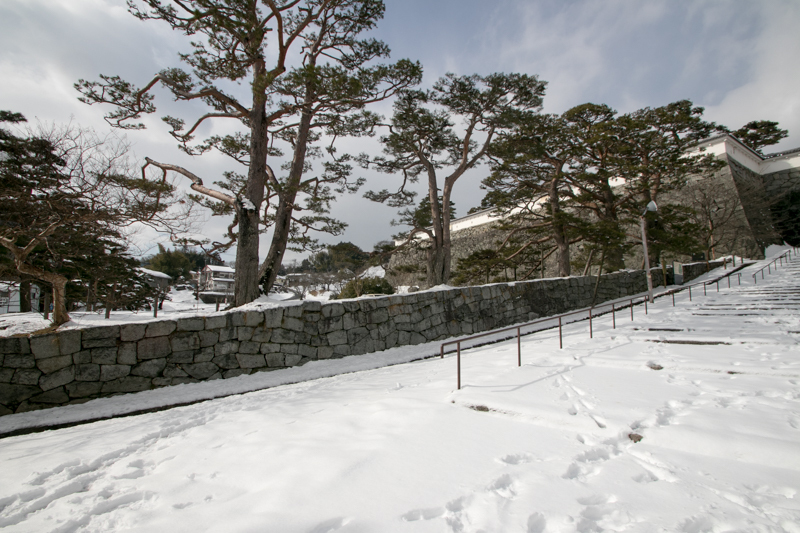 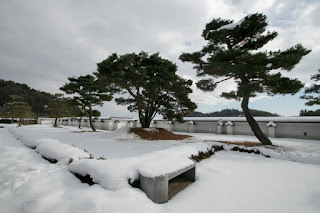 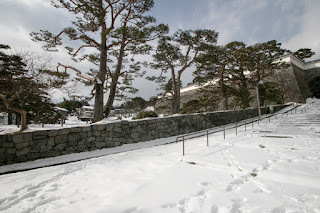 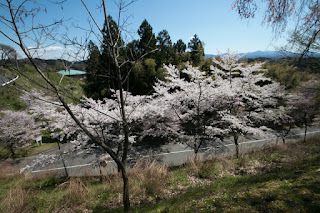 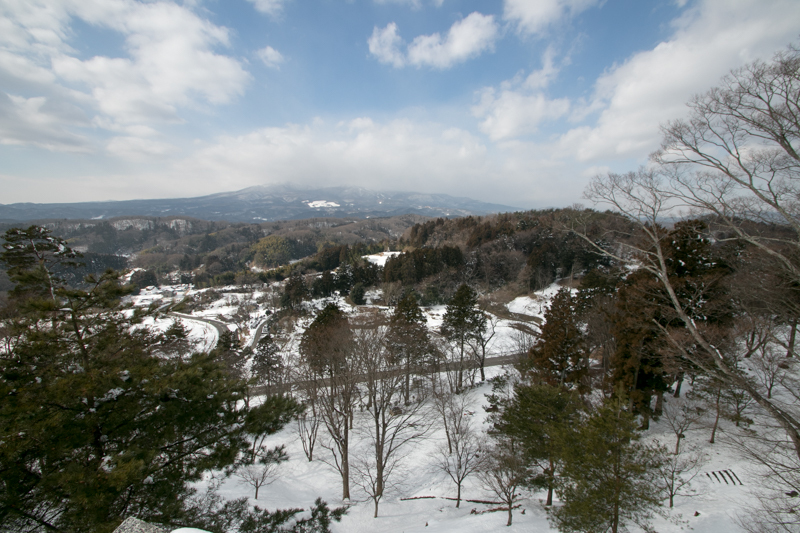 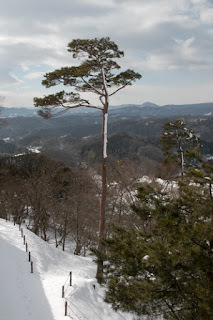 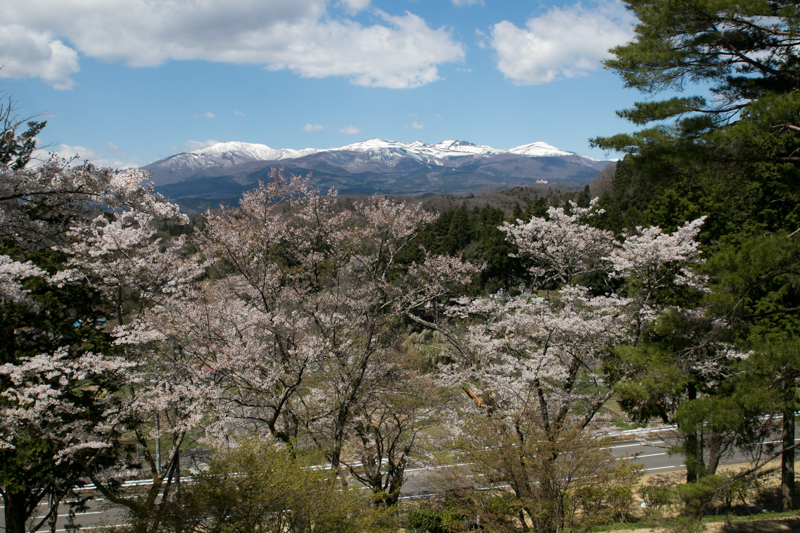 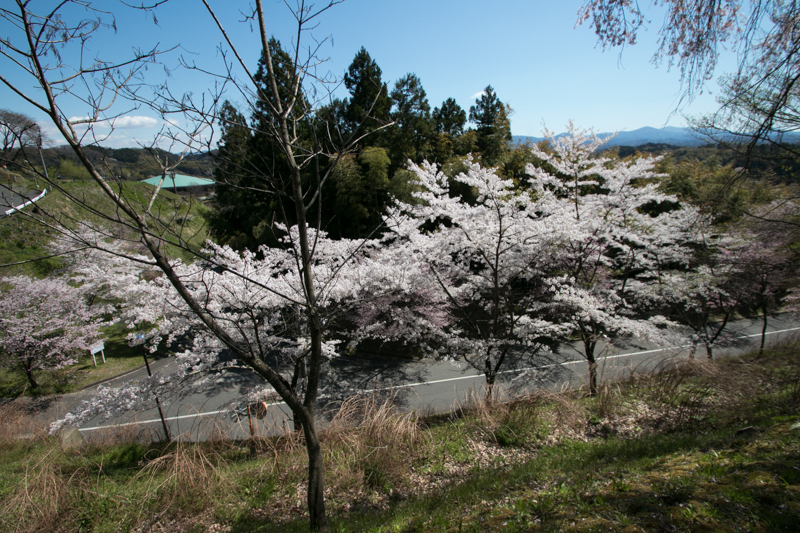 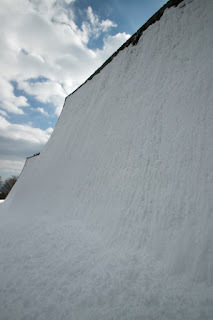 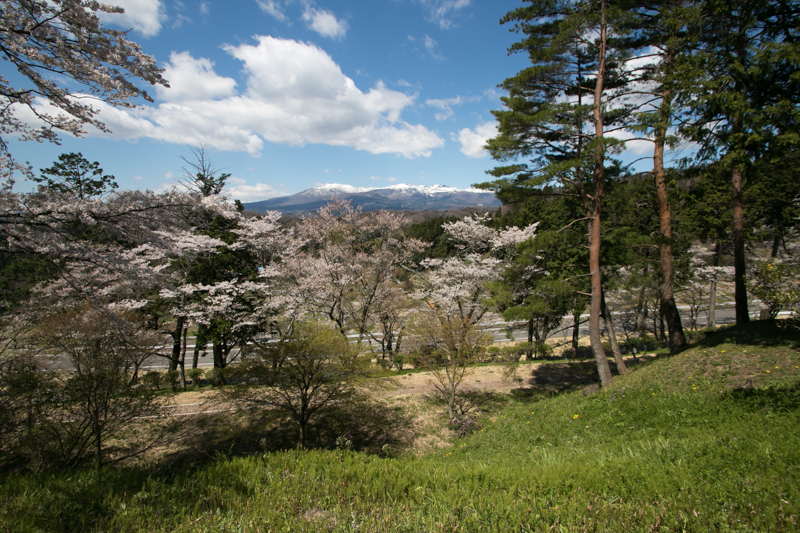 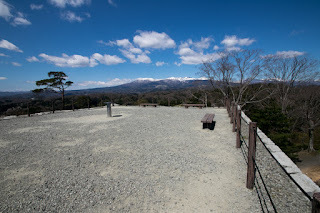 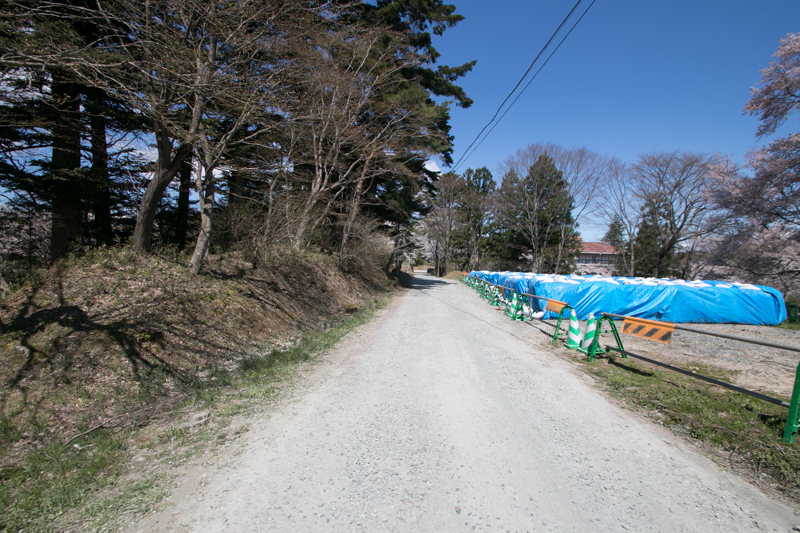 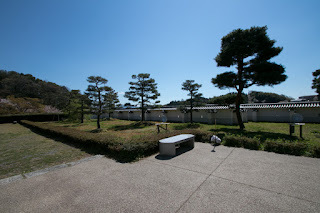 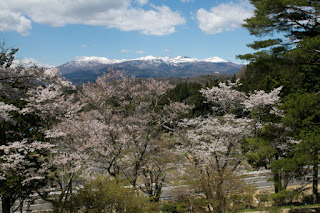 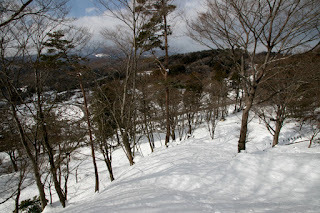 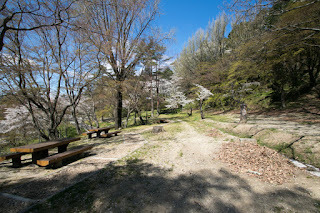 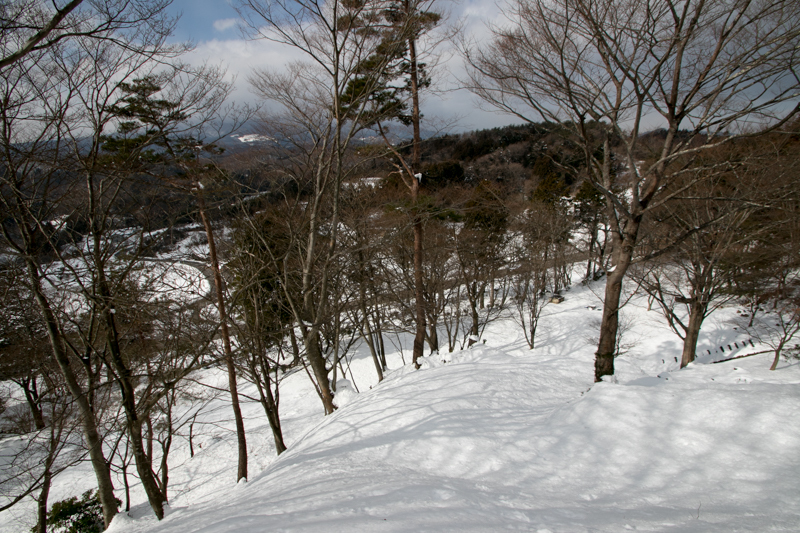 Now combination of white fences with pine trees in front of the mountain is a beautiful scenery. 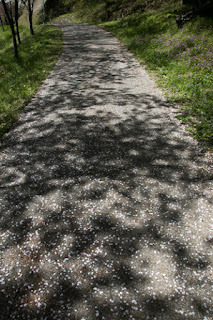 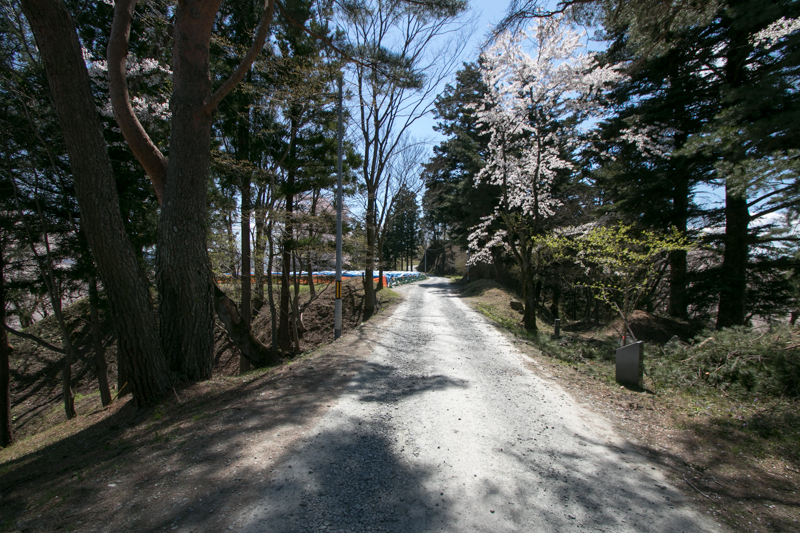 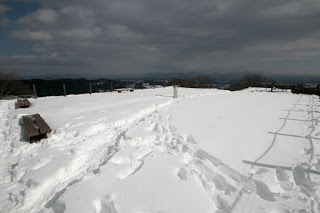 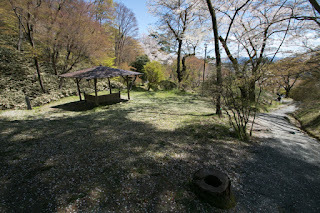 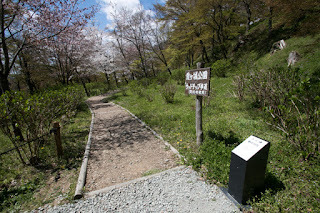 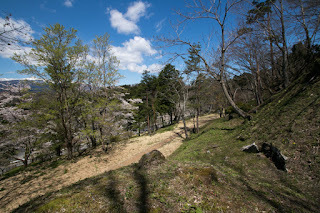 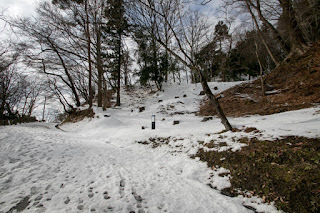 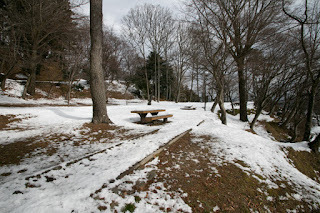 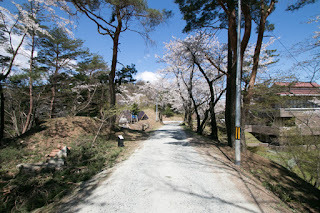 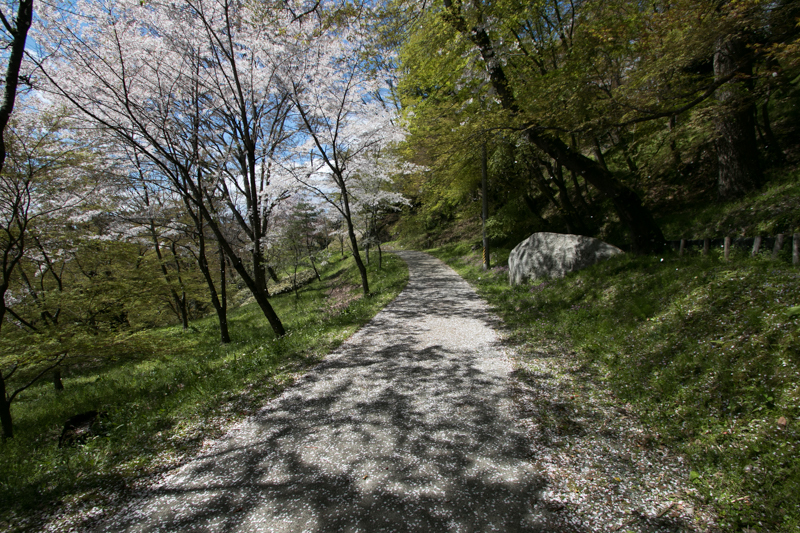 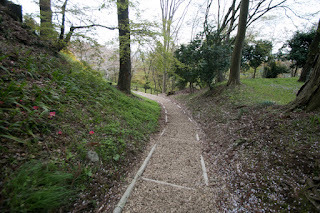 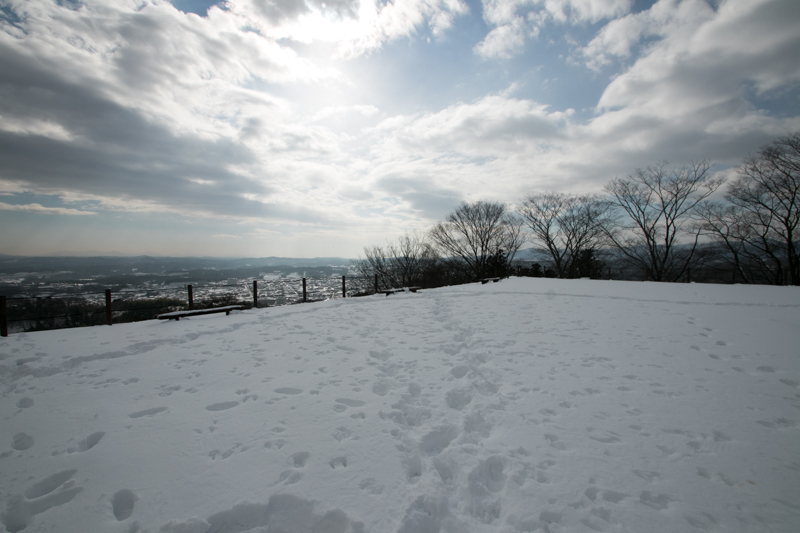 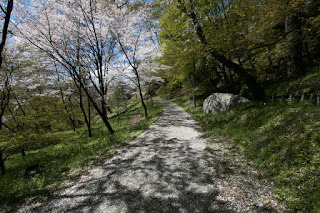 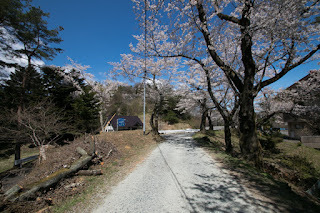 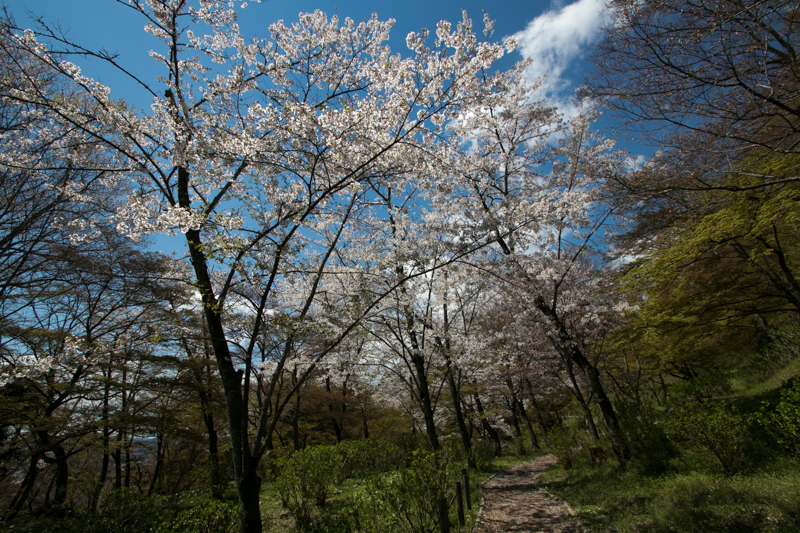 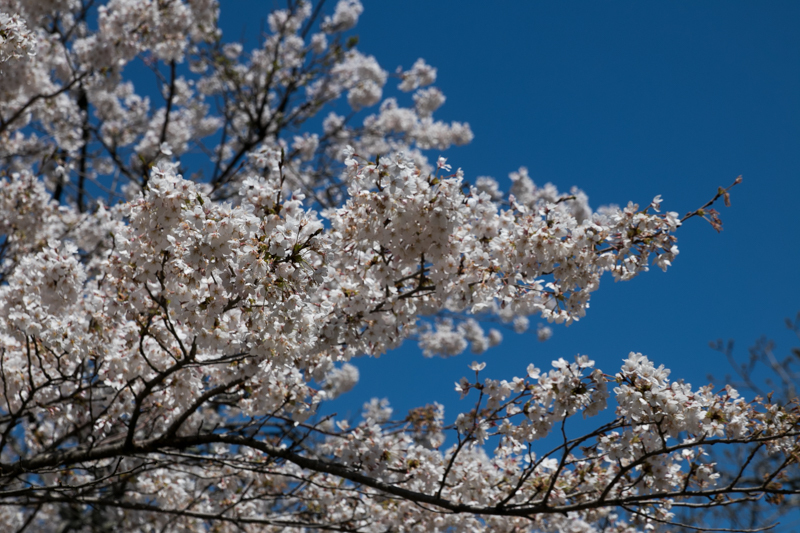 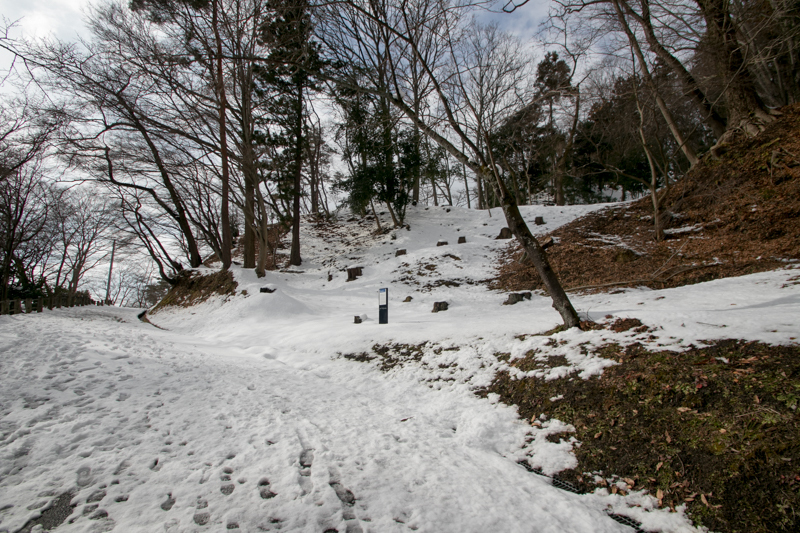 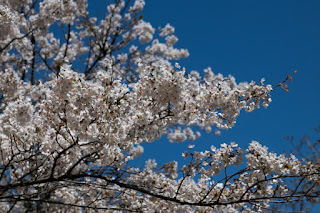 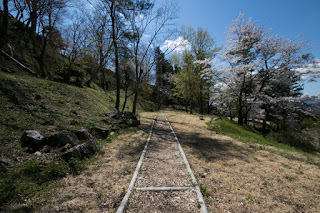 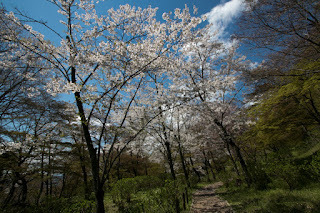 30 minutes walk from JR East Tohoku-Honsen line Nihonmatsu station. 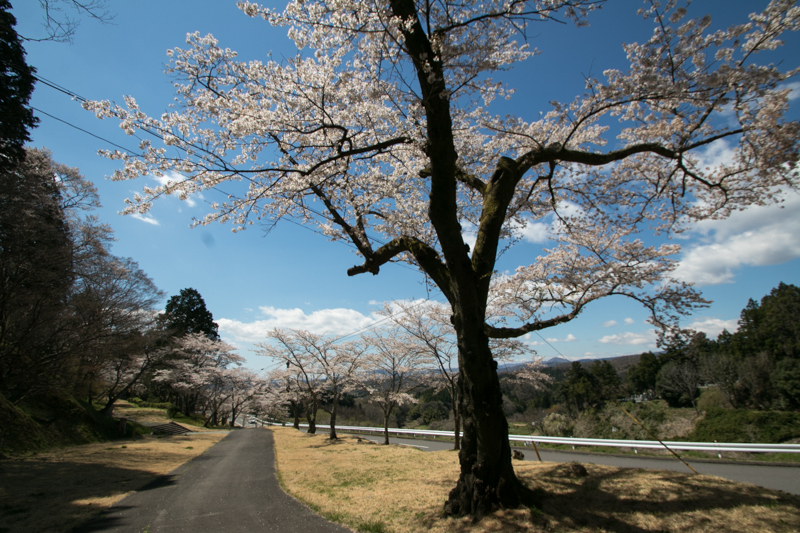 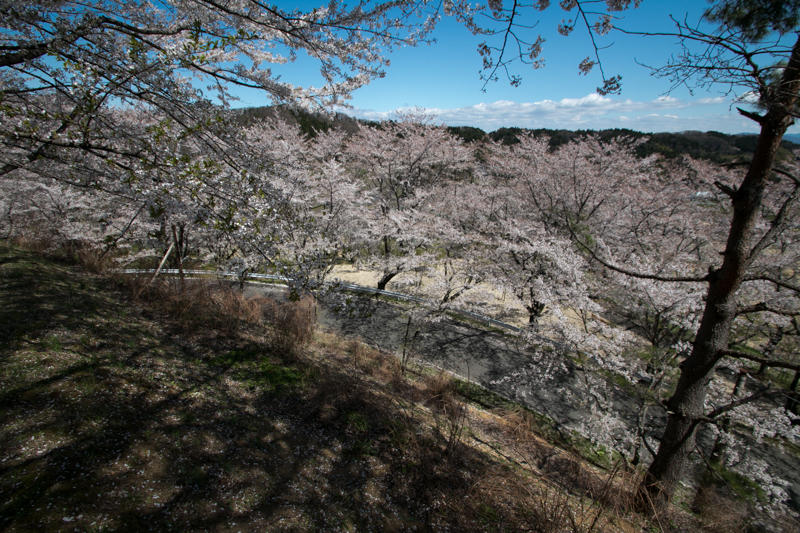 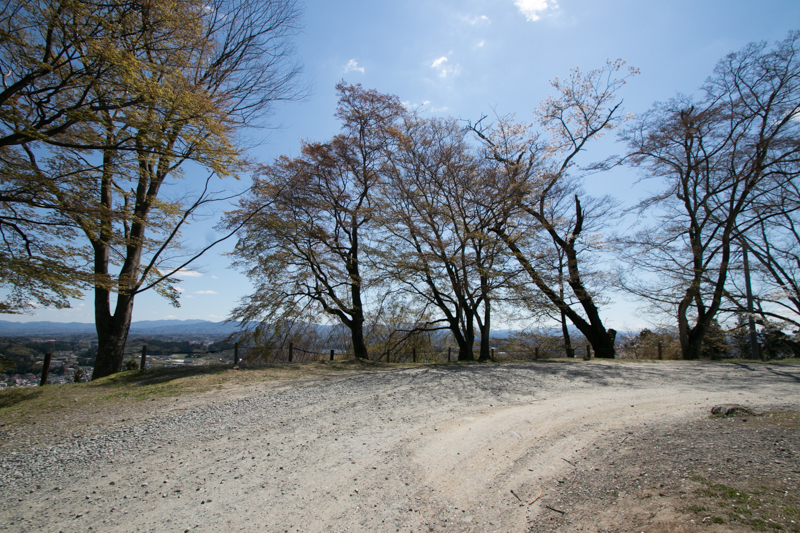 10 minutes drive from Tohoku Jidoshado Expressway Nihonmatsu interchange.